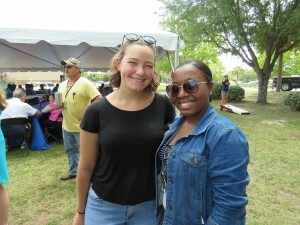 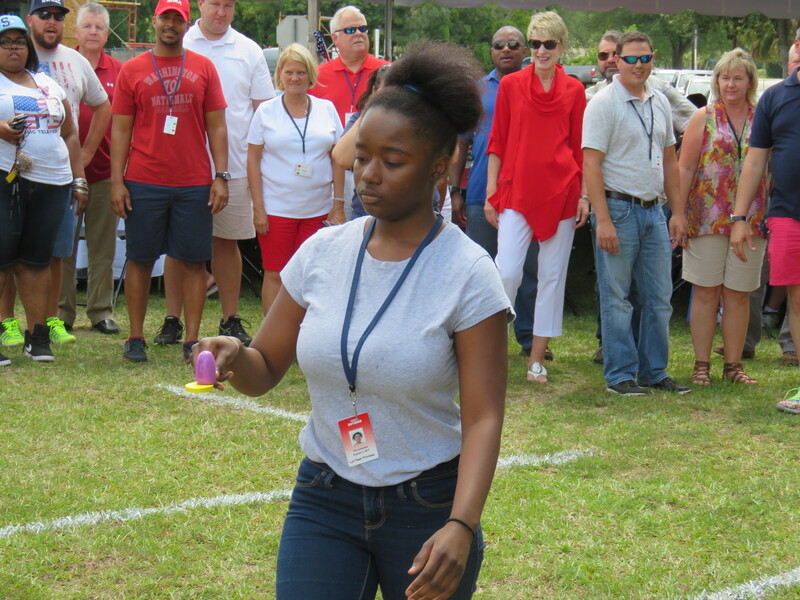 Garrett Academy CTE student Tamara Pendarvis earned honorable mention in the contest. 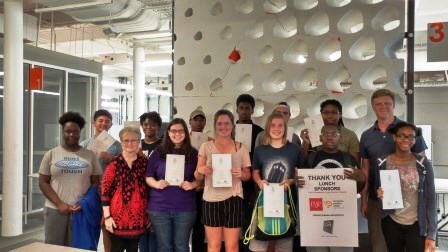 The following 13 students, many pictured above, earned their Adobe Illustrator ACA Certification this year. 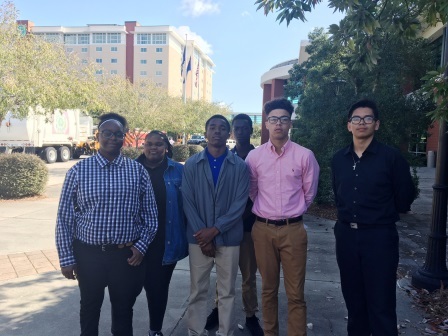 Thank you Ms. Anita Hepburn for sharing this good news about Garrett Academy of Technology students’ success! 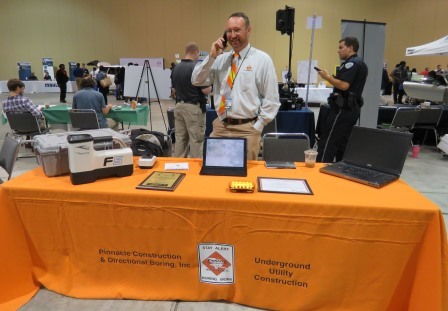 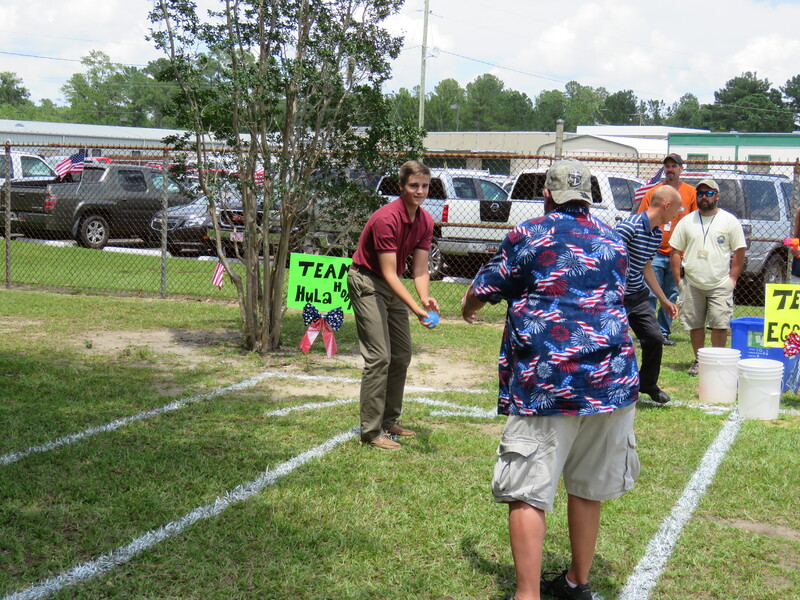 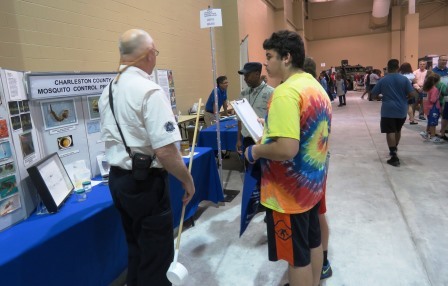 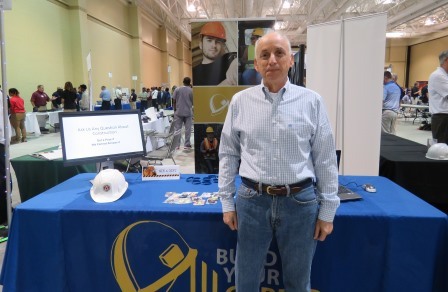 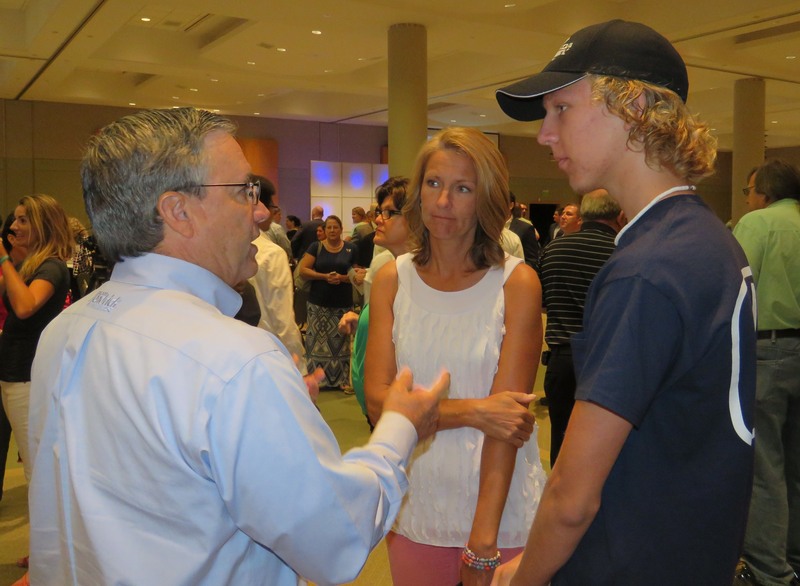 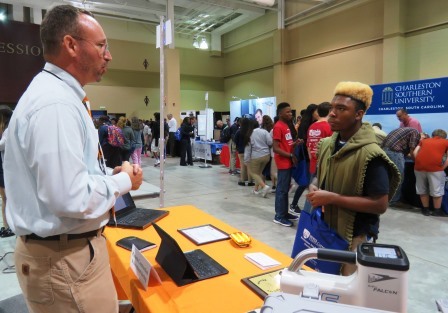 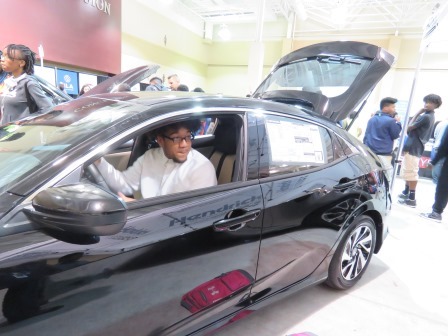 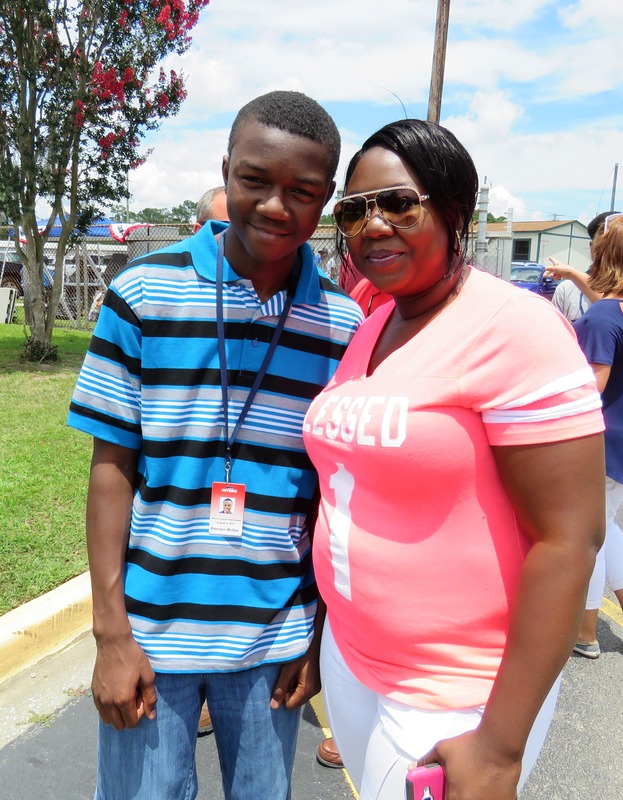 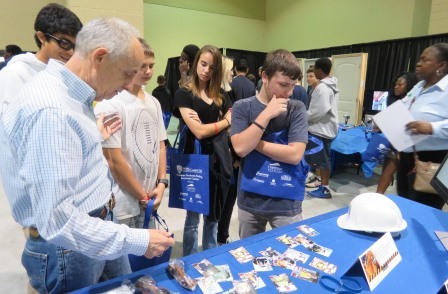 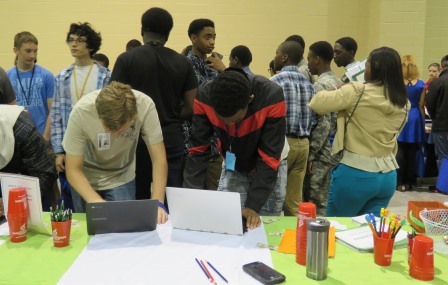 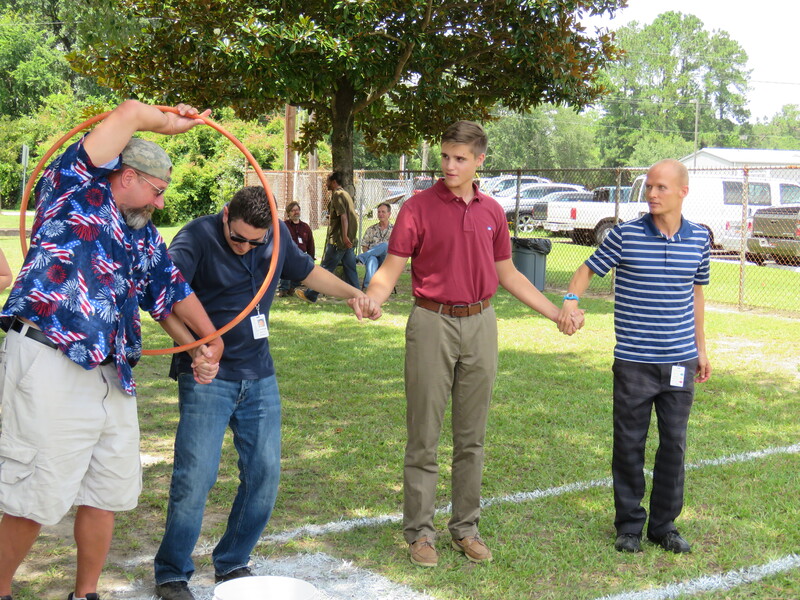 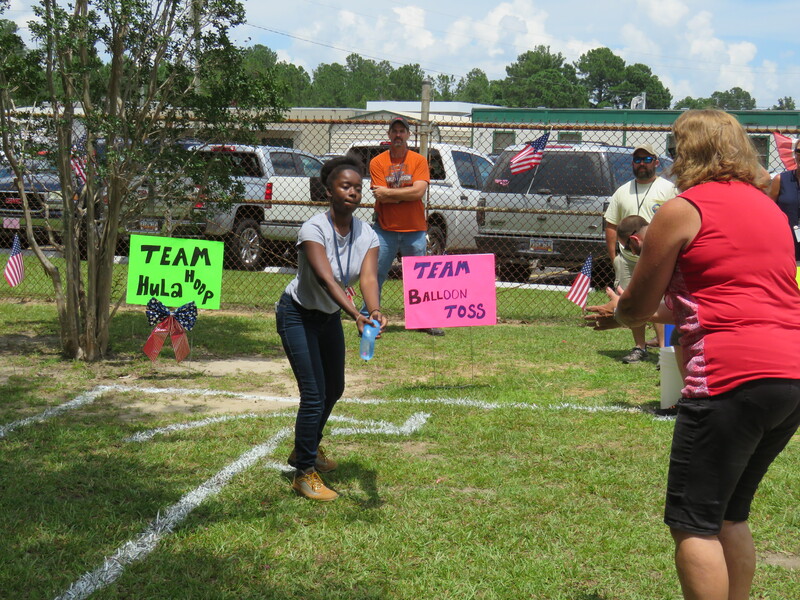 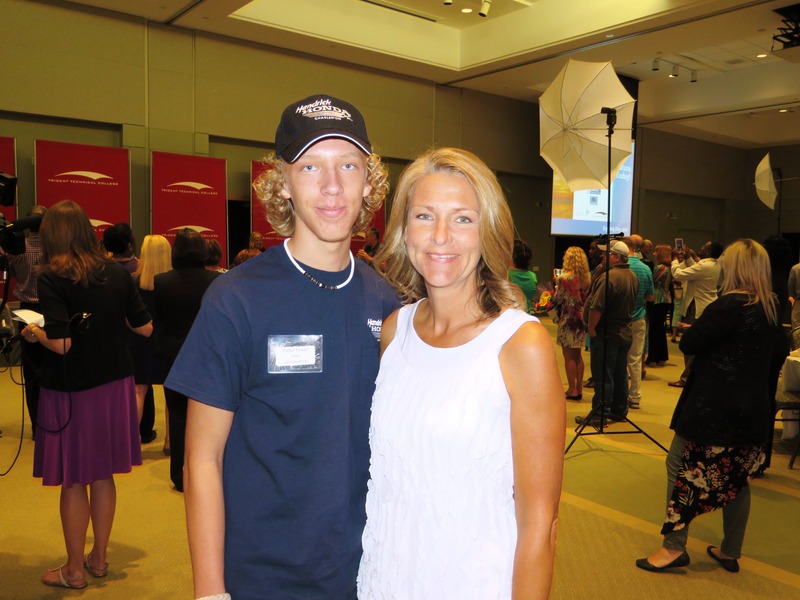 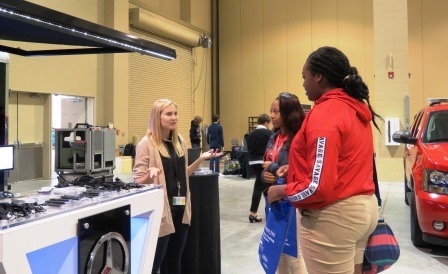 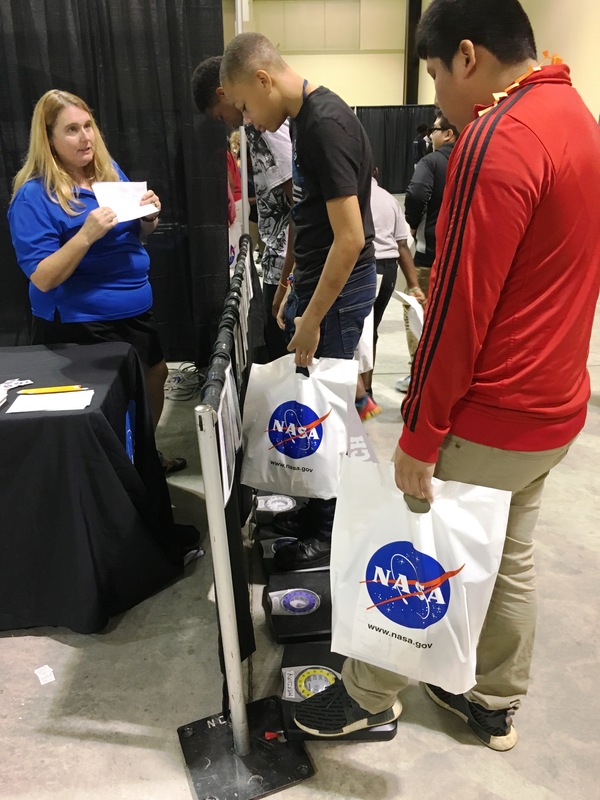 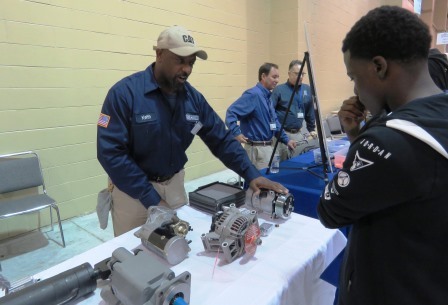 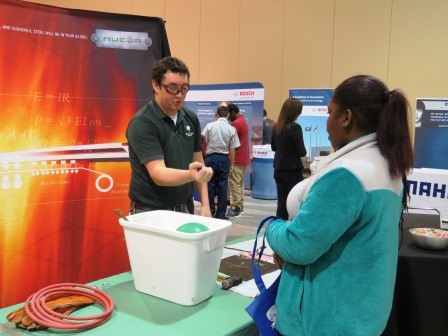 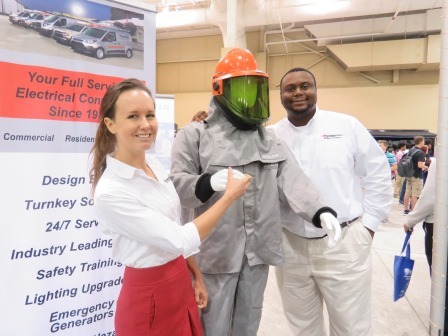 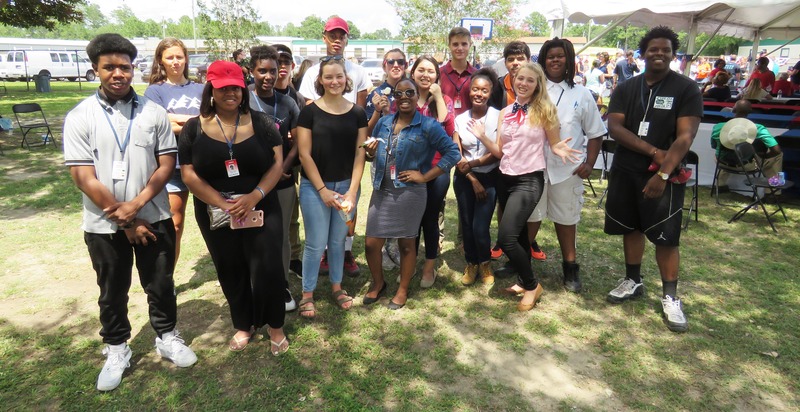 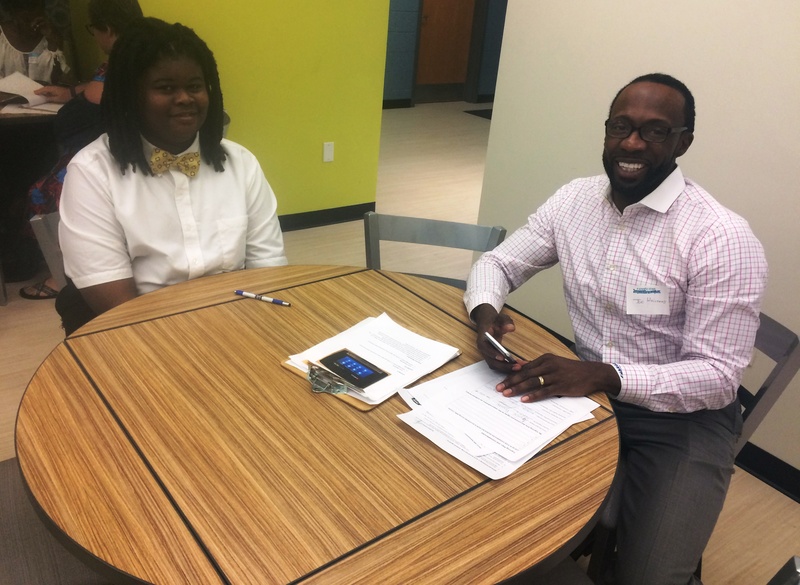 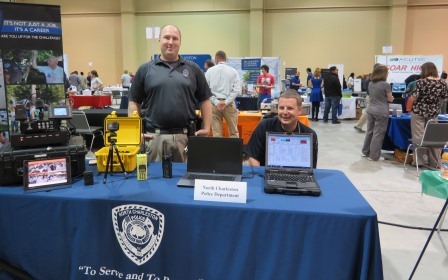 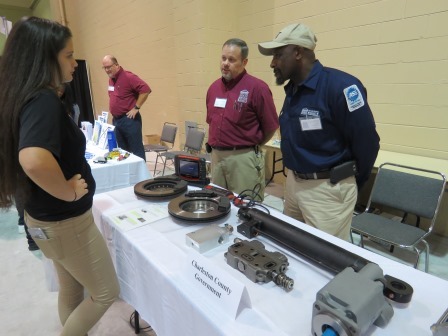 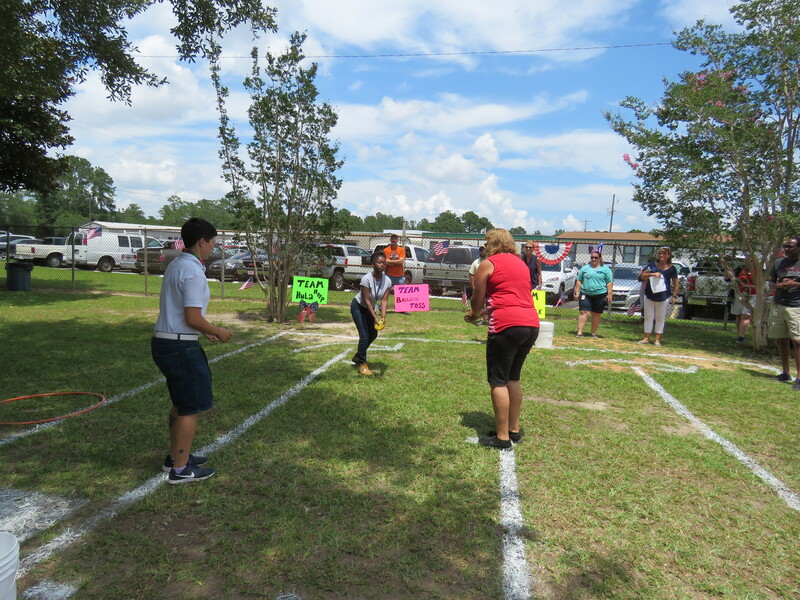 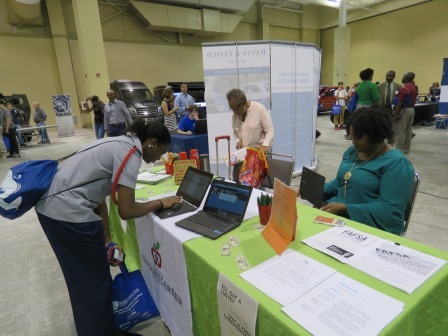 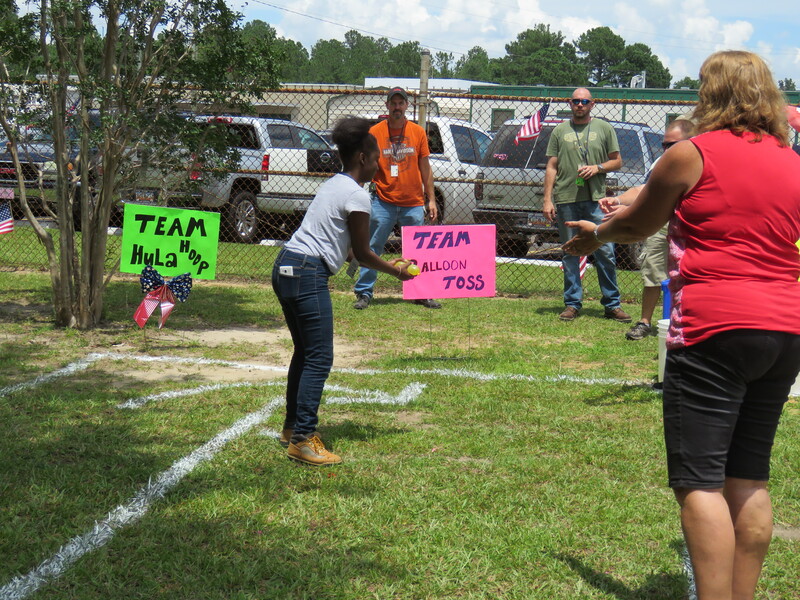 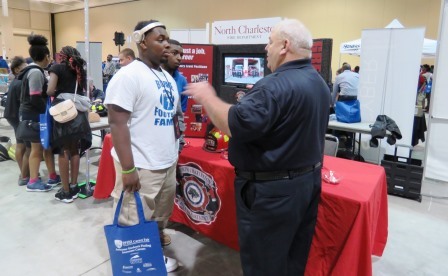 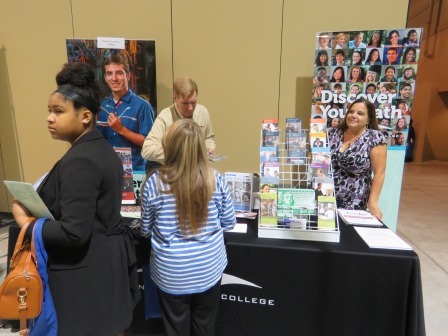 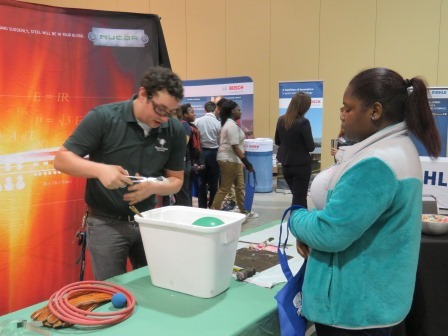 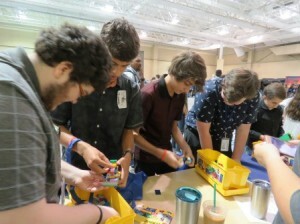 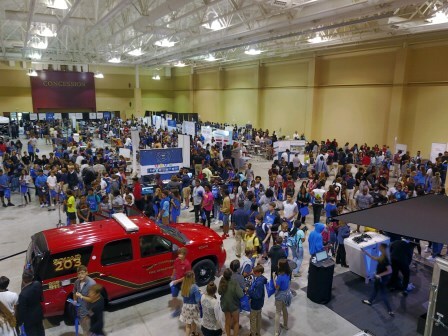 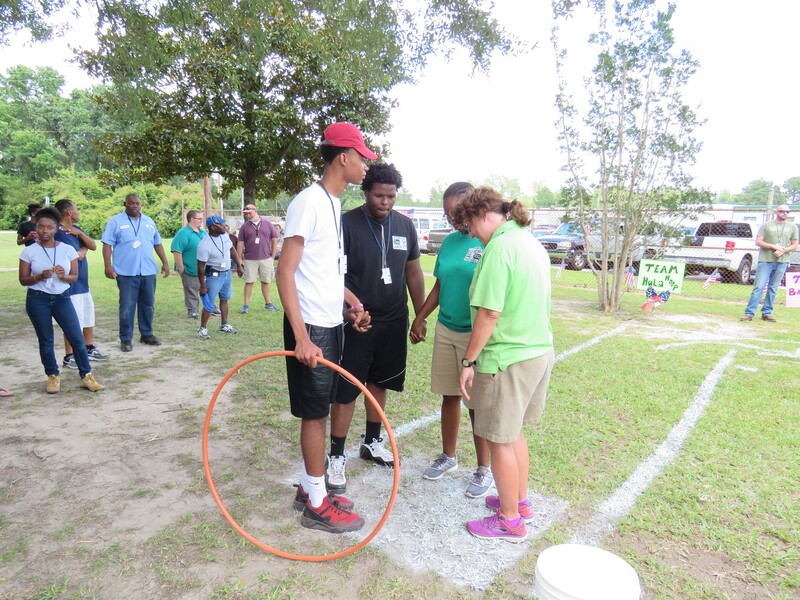 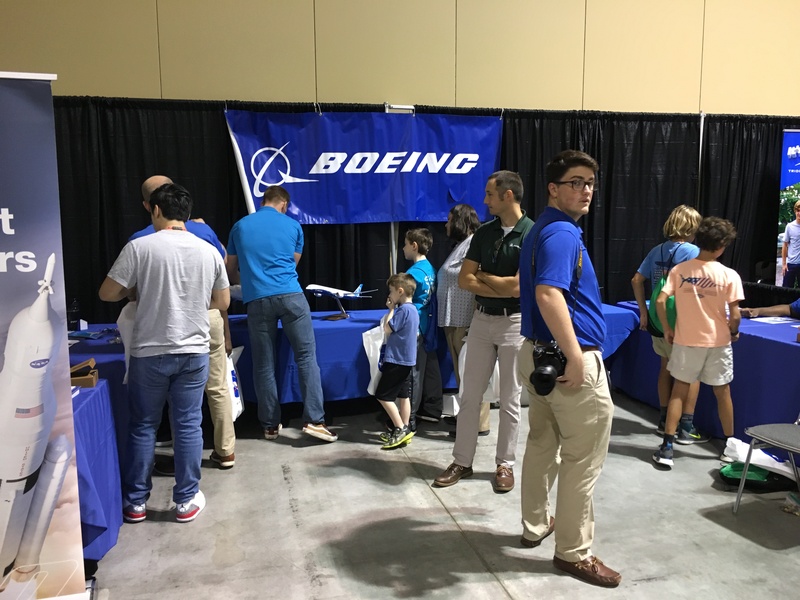 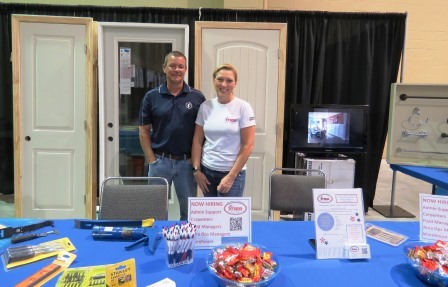 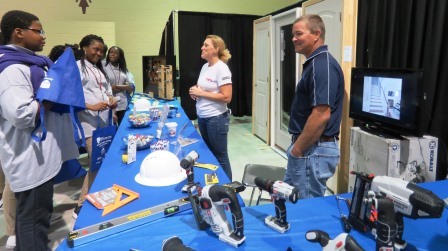 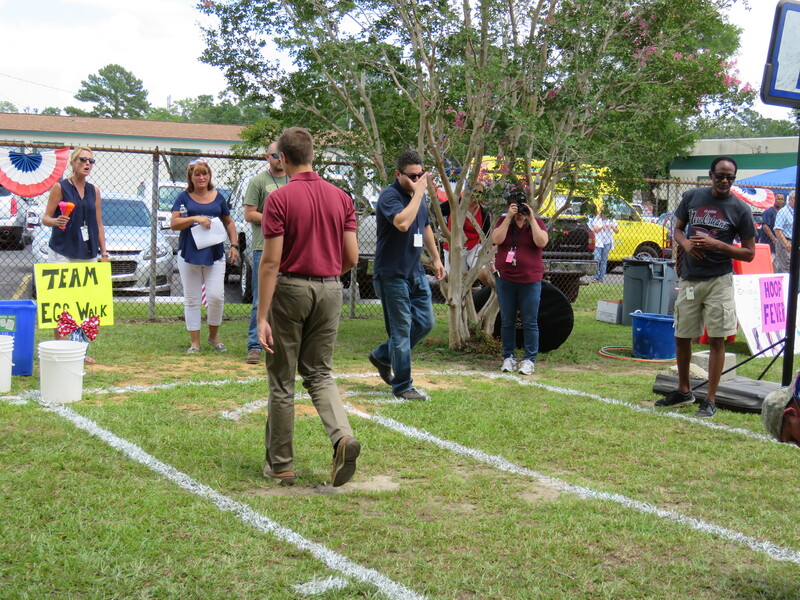 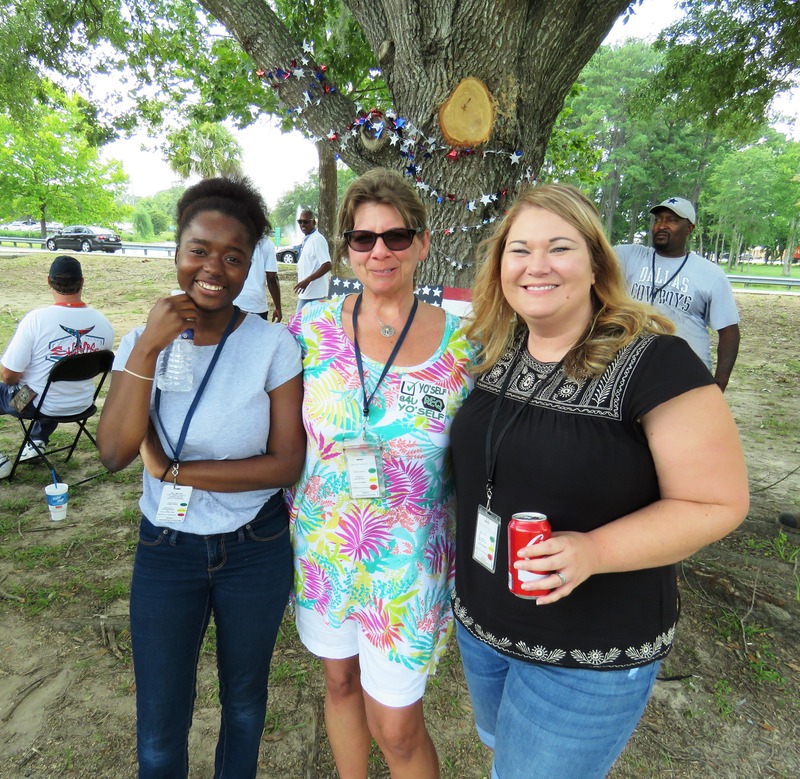 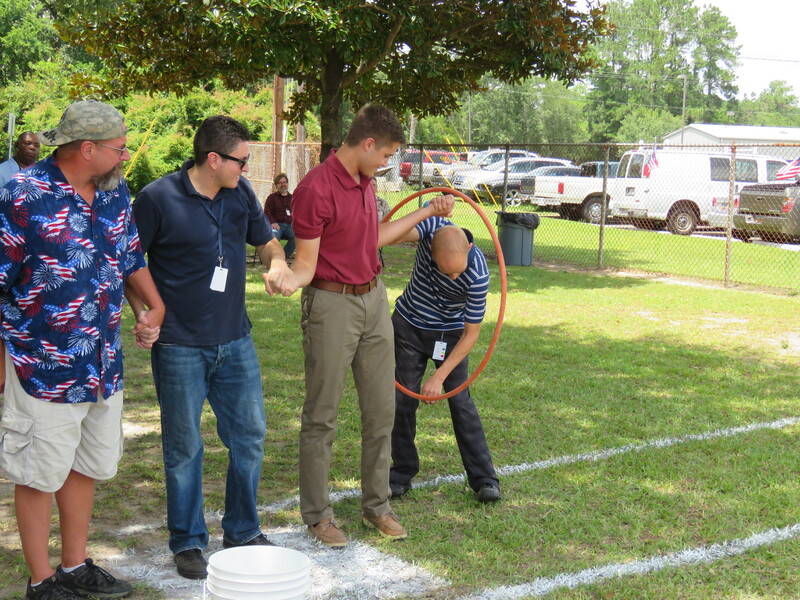 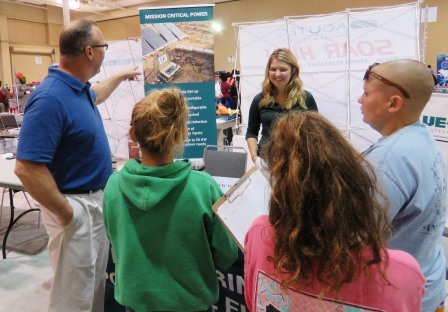 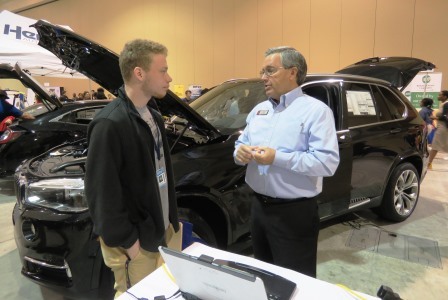 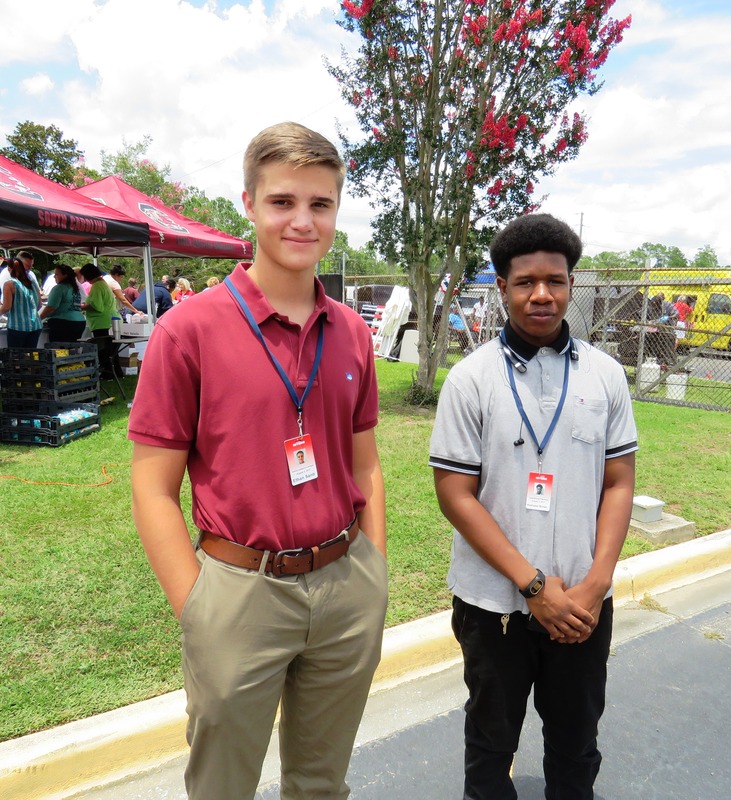 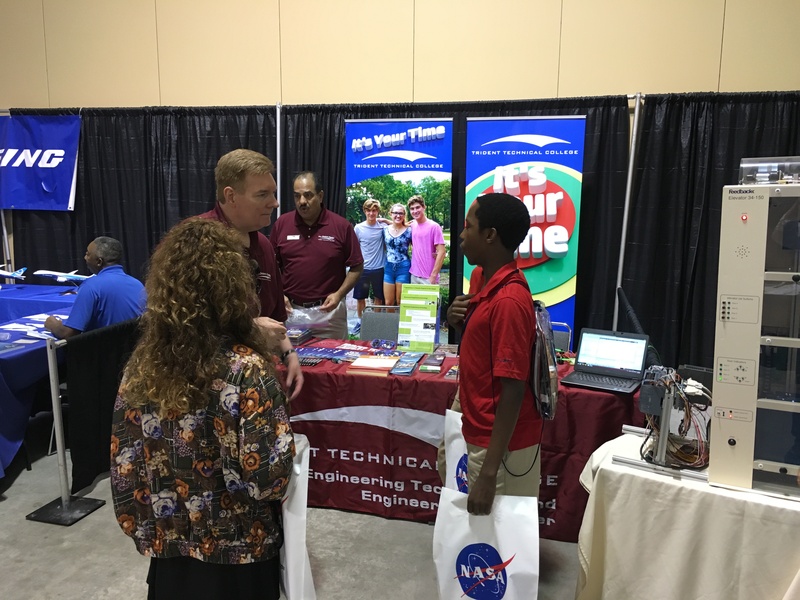 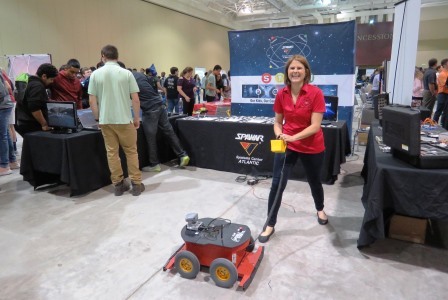 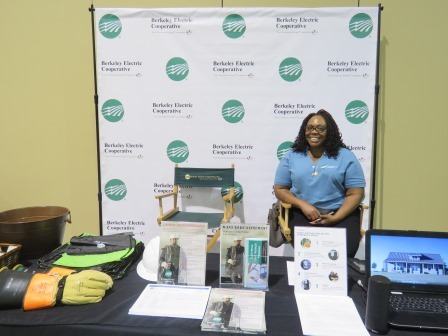 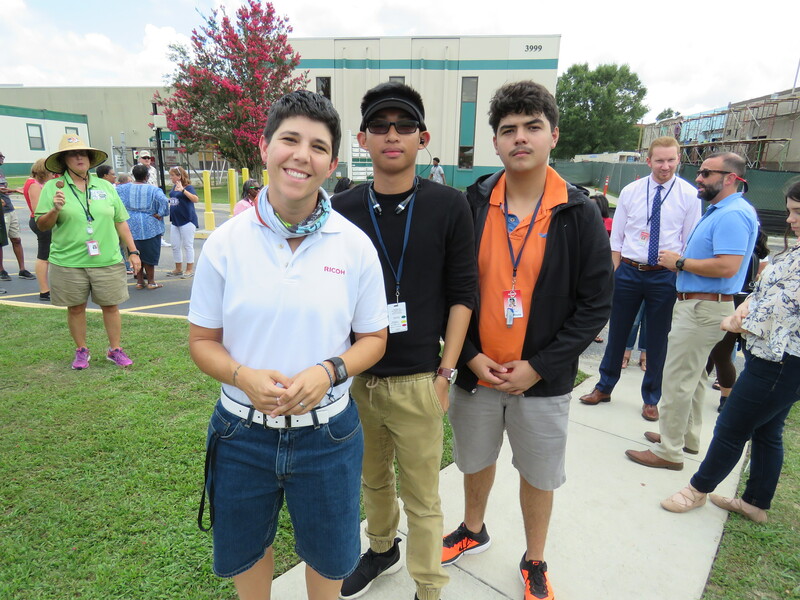 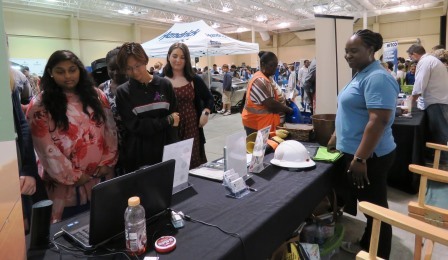 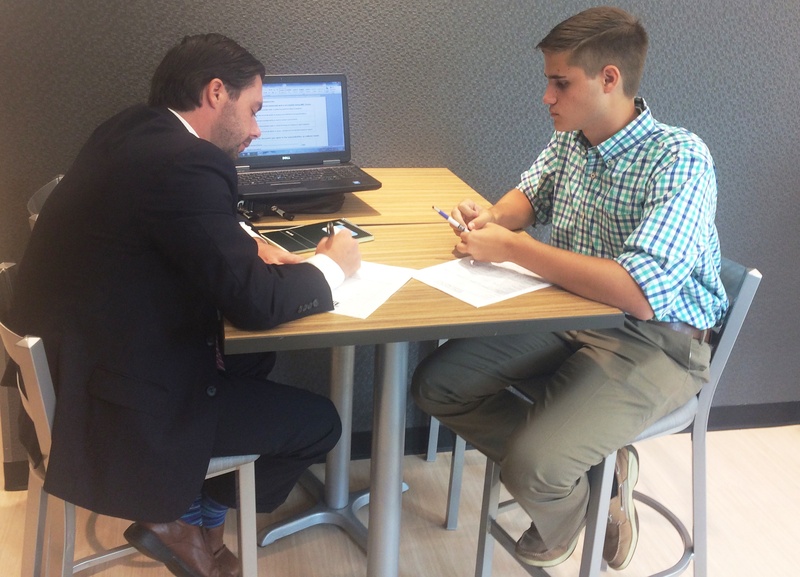 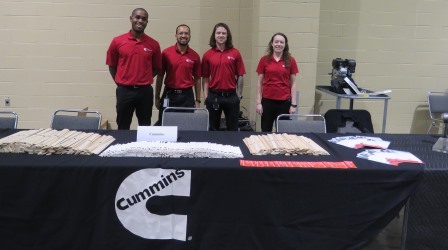 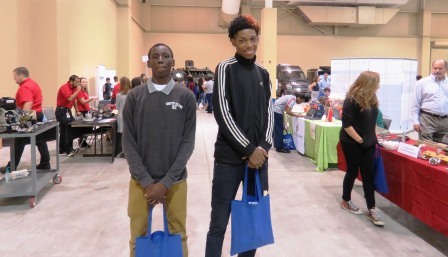 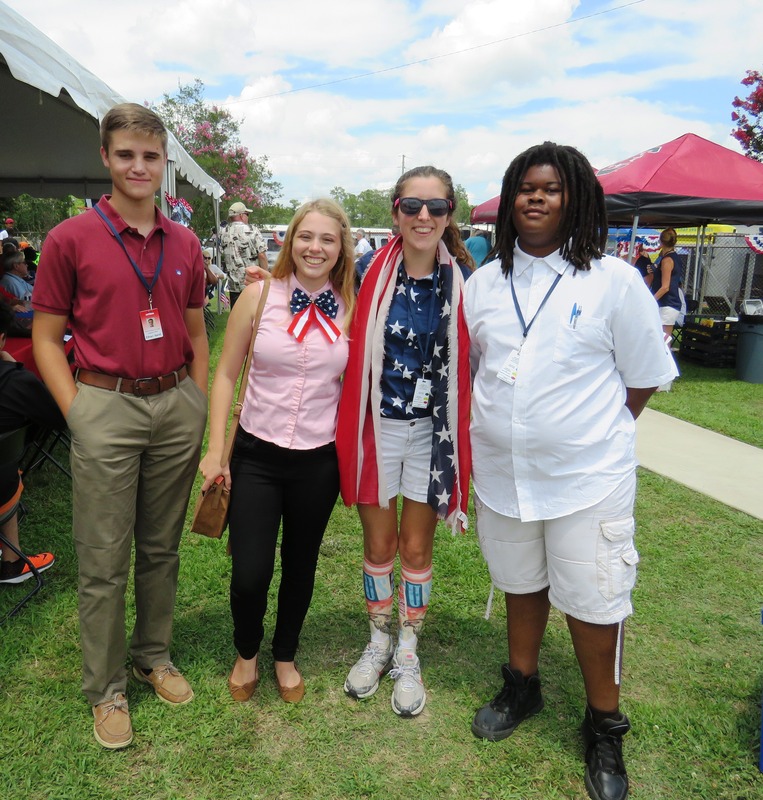 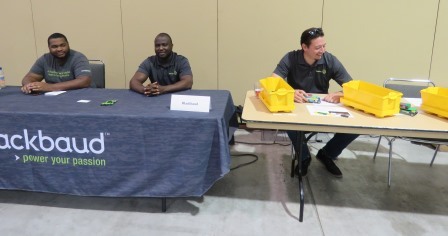 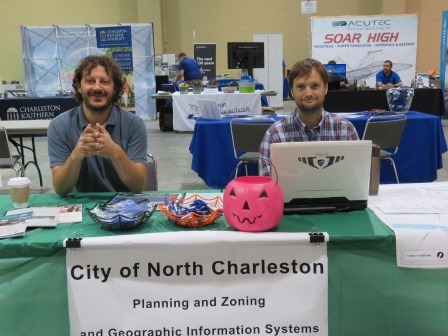 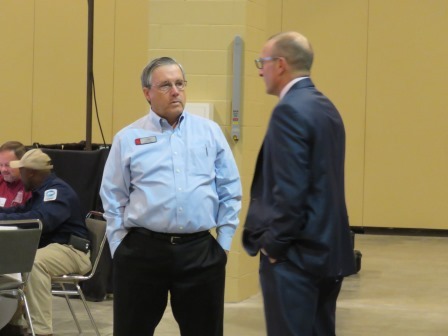 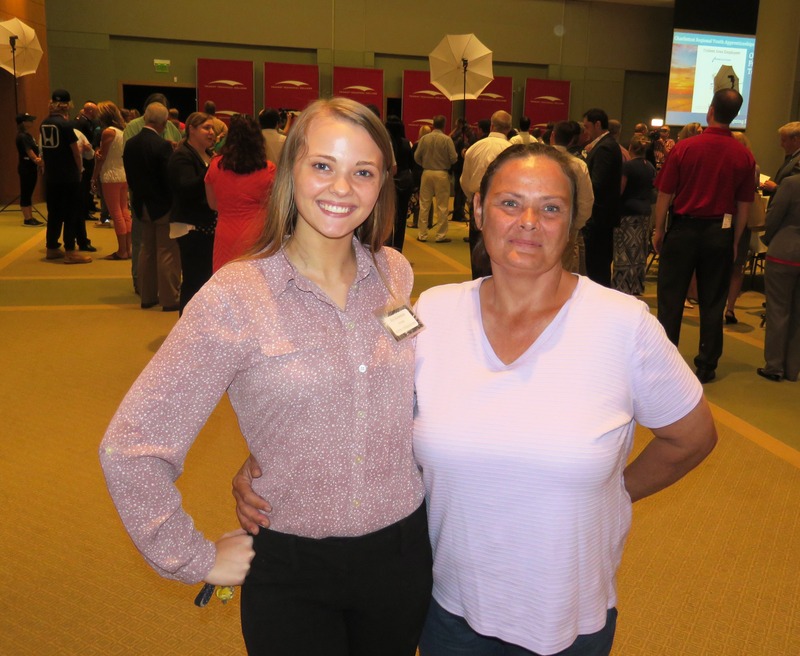 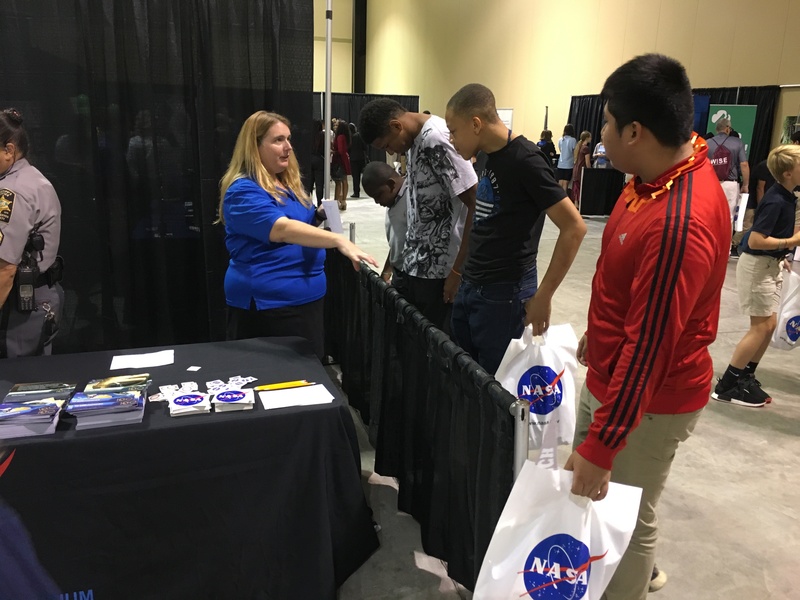 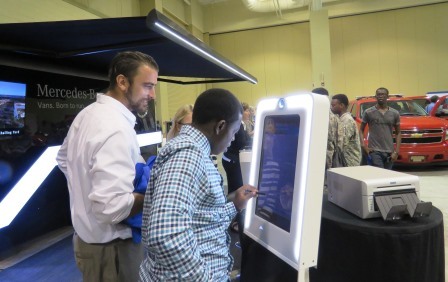 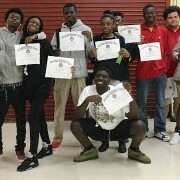 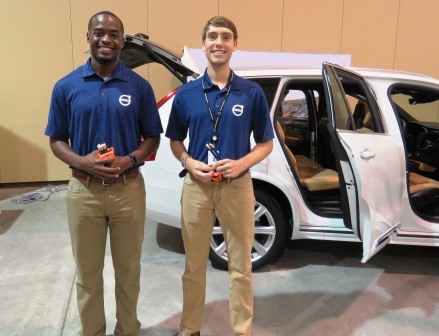 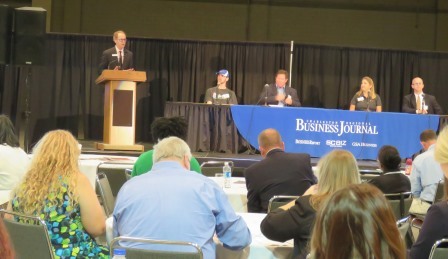 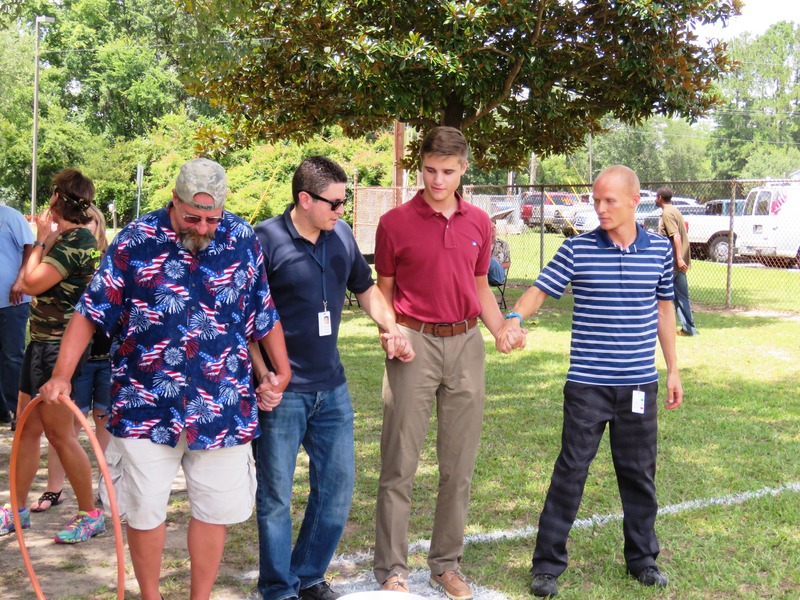 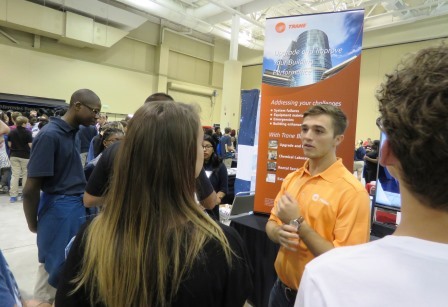 North Charleston, SC – Youth Apprenticeship Signing Day might not have the same national notoriety as National Signing Day. 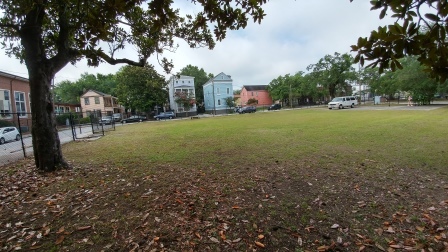 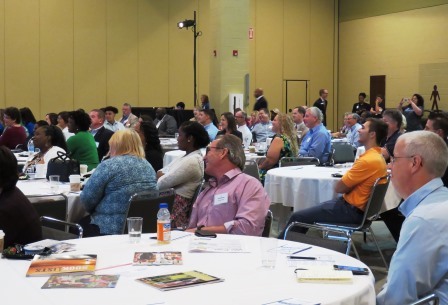 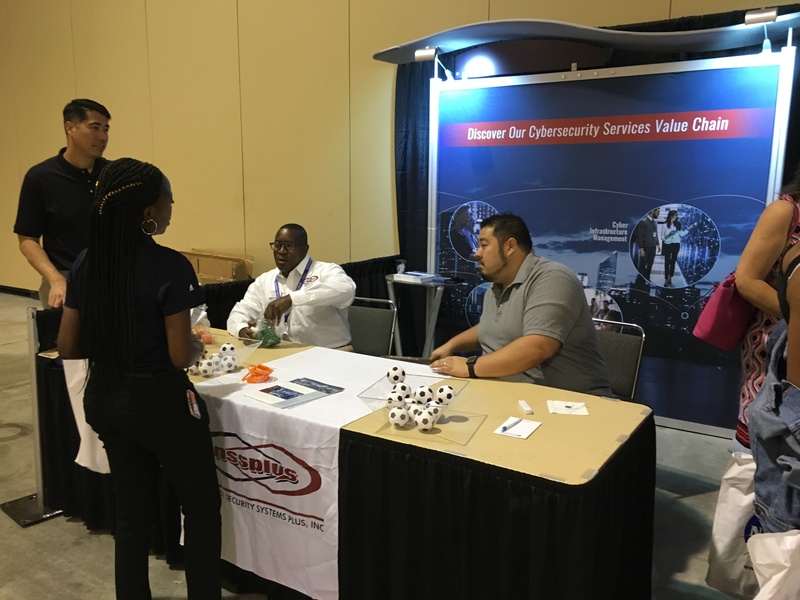 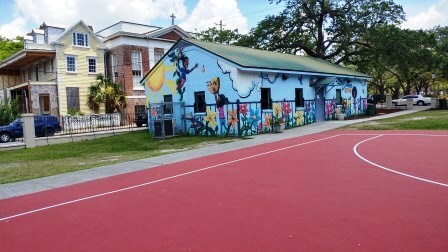 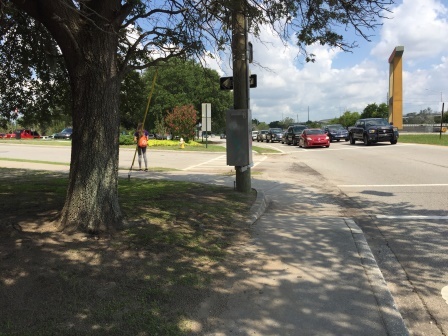 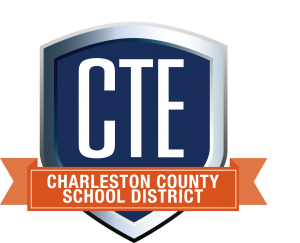 However, in the Lowcountry, this regional collaborative effort with school districts, businesses, and organizations is picking up steam. 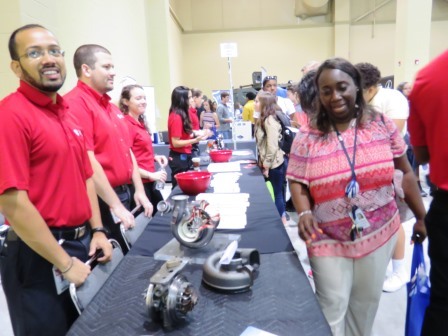 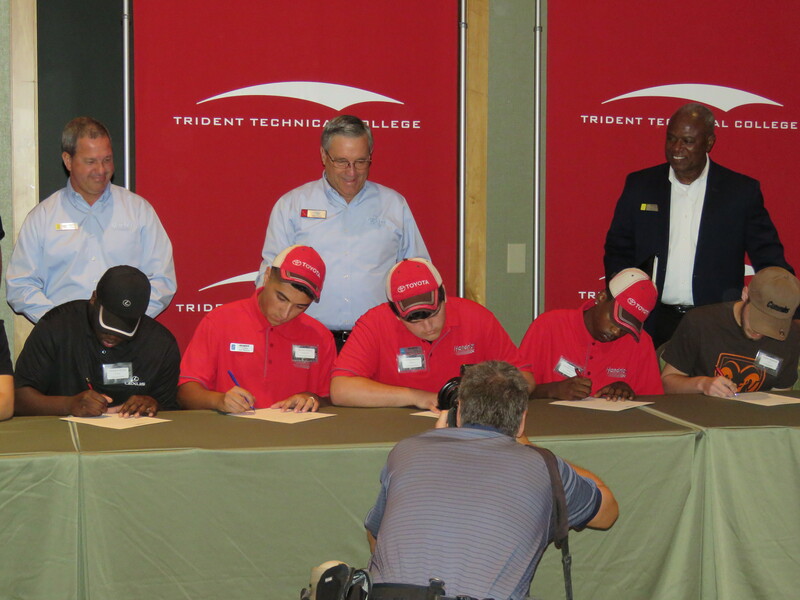 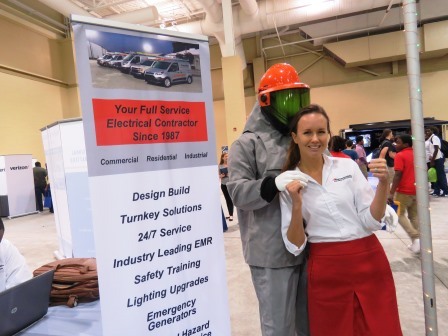 The 4th Annual Youth Apprenticeship Signing Day was held at Trident Technical College (TTC) August 8, 2017. 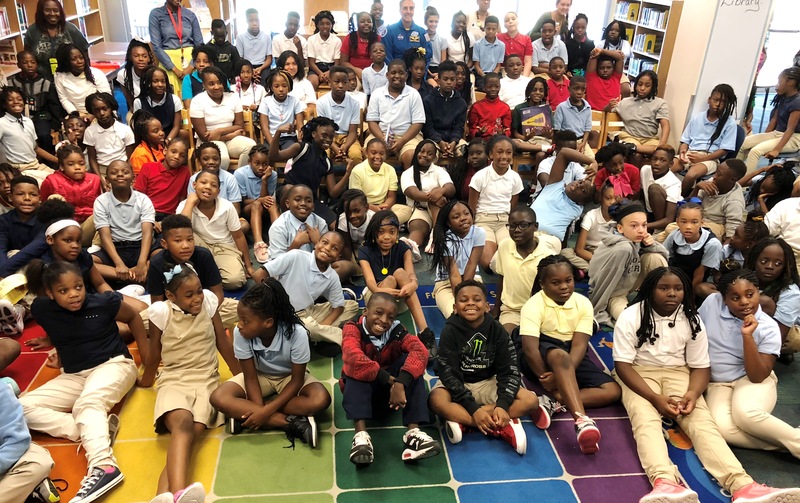 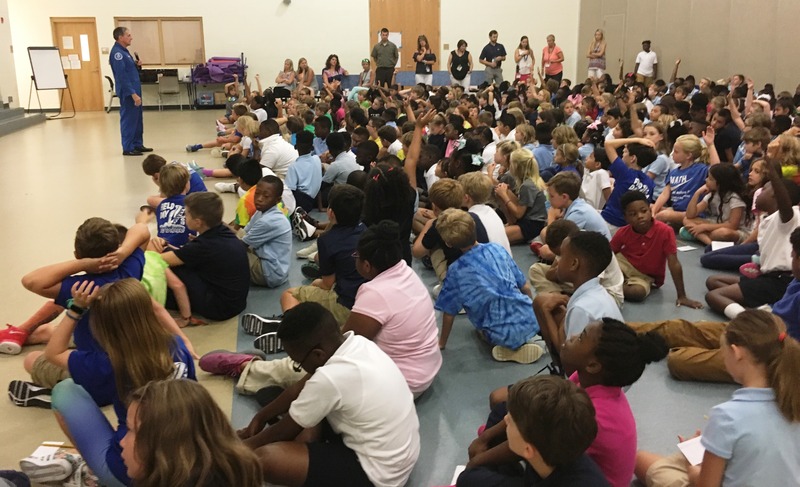 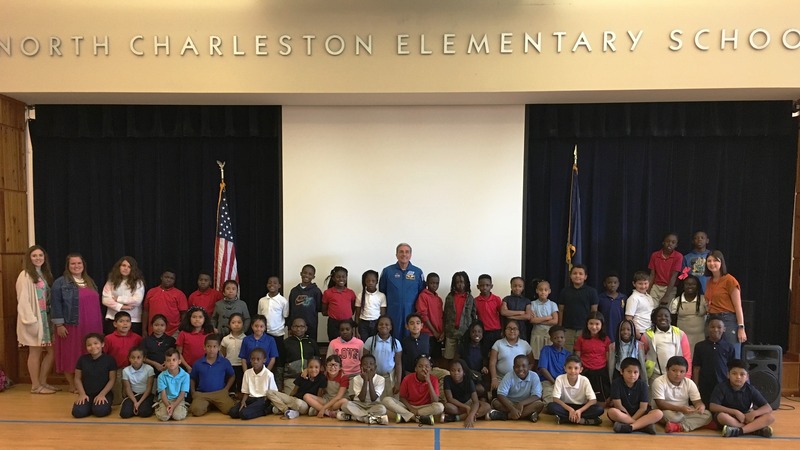 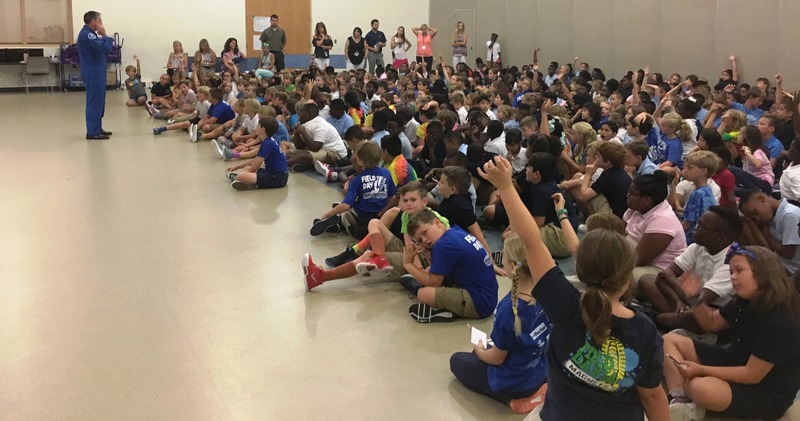 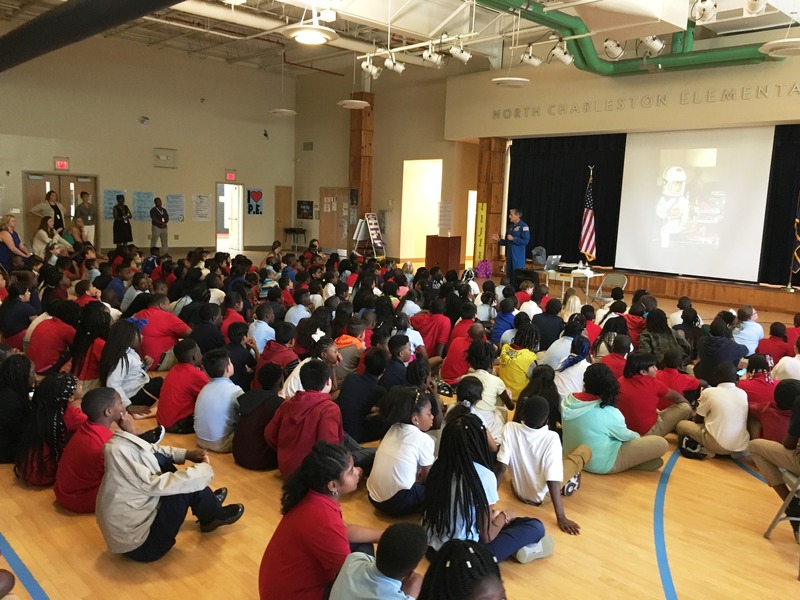 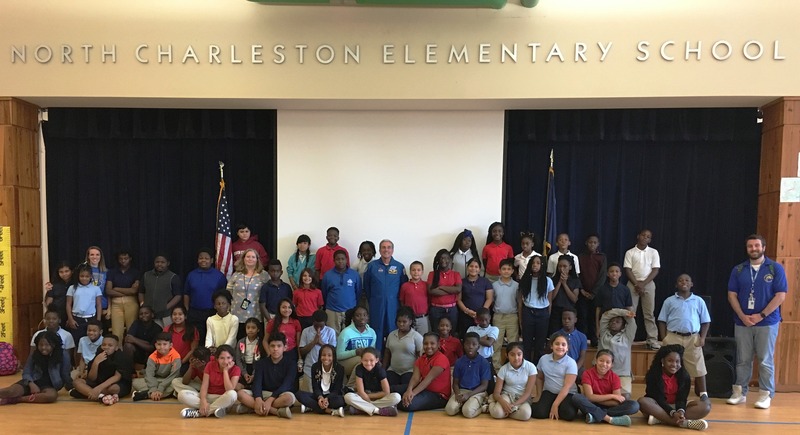 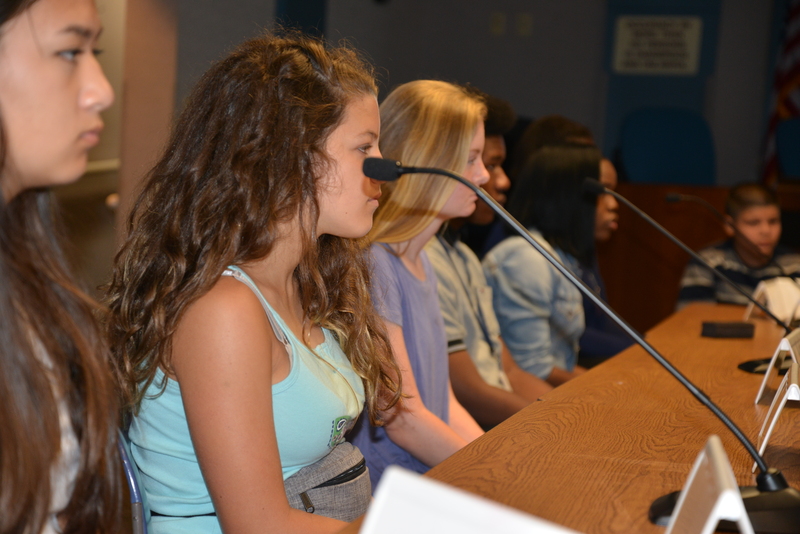 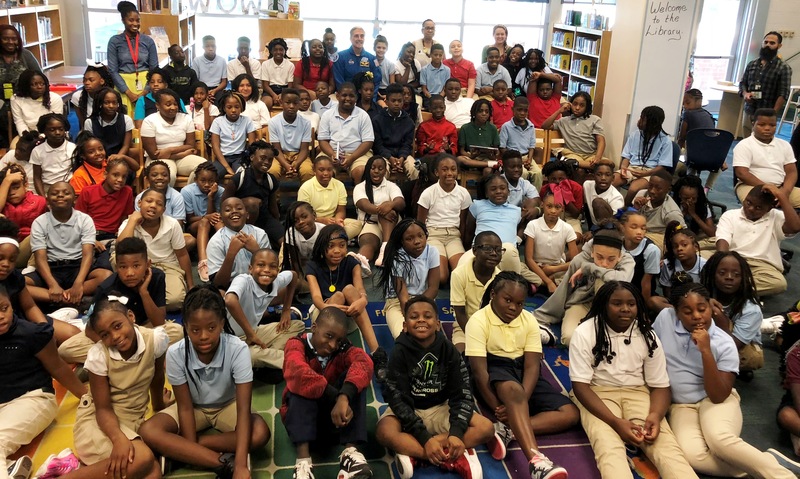 Sixty-one students, including 27 from Charleston County School District (CCSD), made their commitment to local businesses “official” by signing a document. 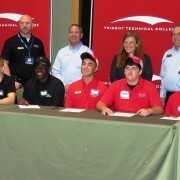 Modeled after National Signing Day, where high school student-athletes sign National Letters of Intent to colleges or universities where they will play a sport, Youth Apprenticeship Signing Day gives students who are going into the workforce at a young age a similar experience when it comes to excitement and importance. 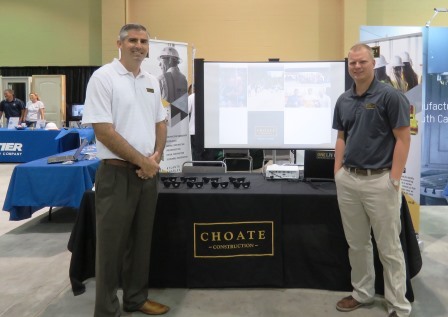 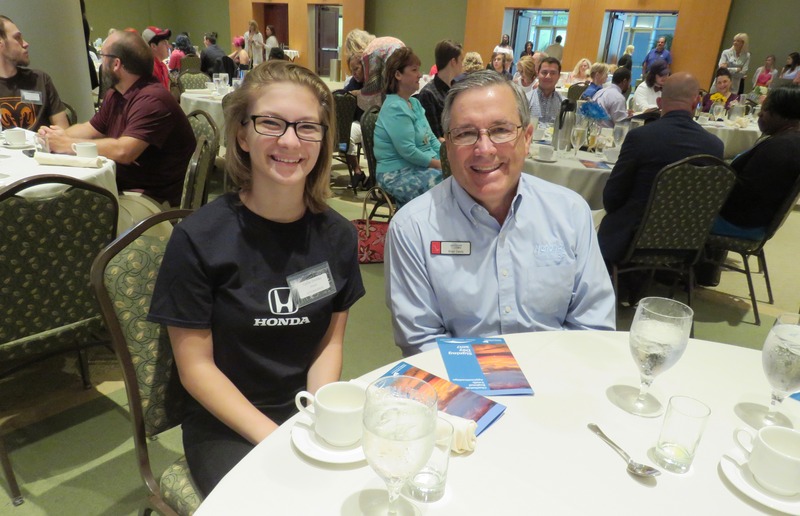 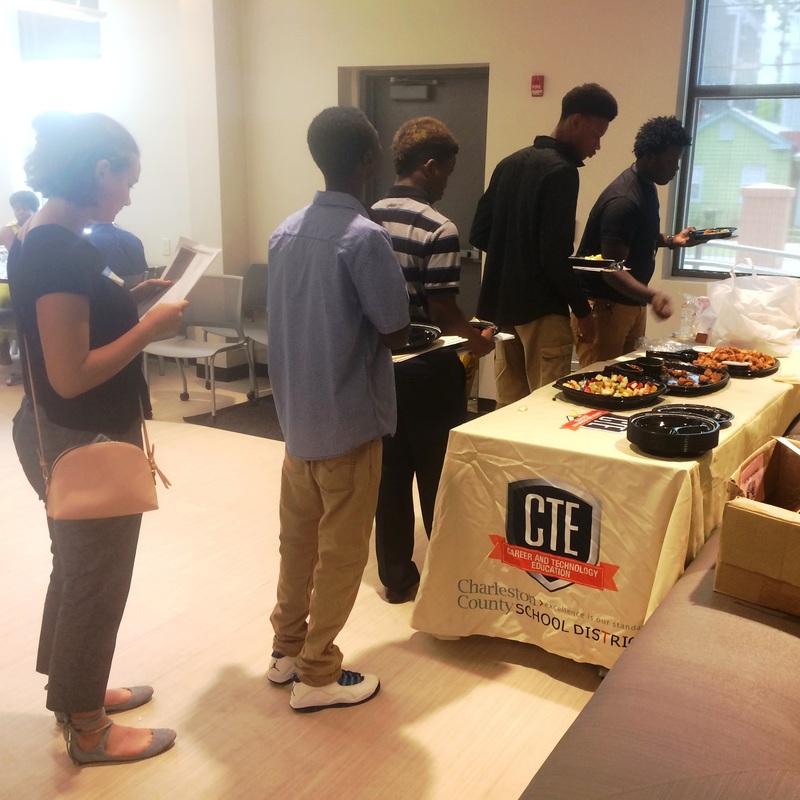 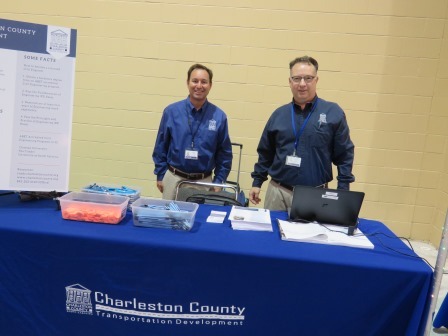 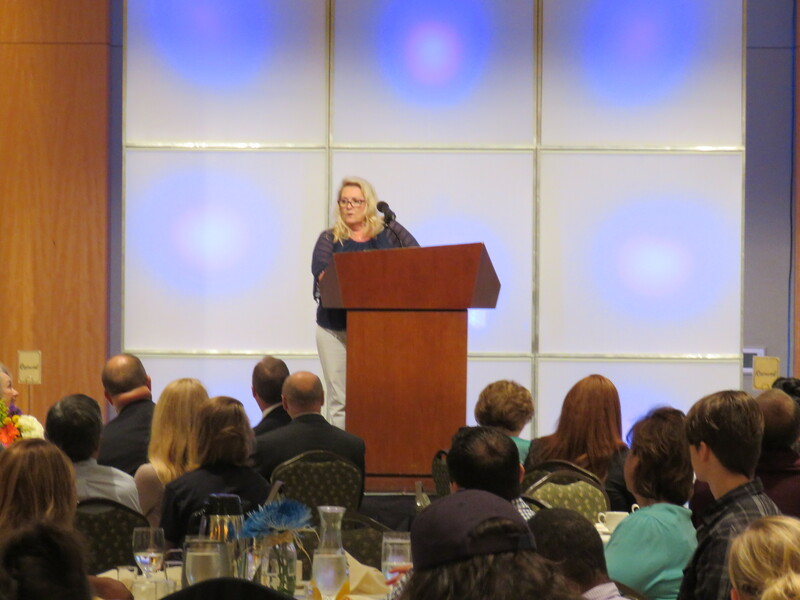 Thanks to the Charleston Metro Chamber of Commerce, and their Accelerate Greater Charleston initiative, the participating students’ college tuition and fees were taken care of for the inaugural cohort, and this wonderful support for the Charleston’s Youth Apprenticeship program continues today! 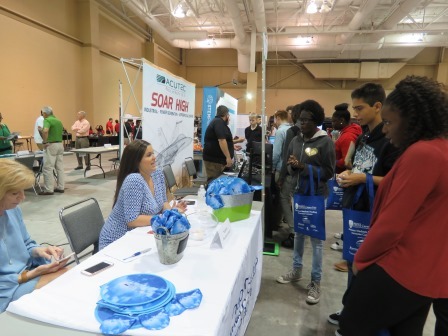 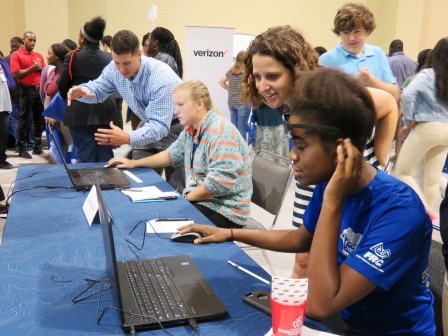 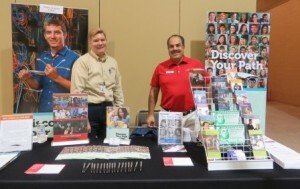 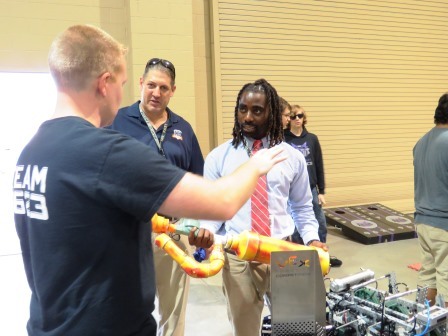 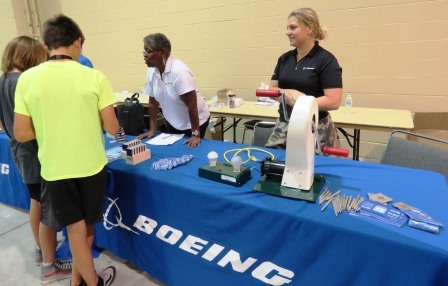 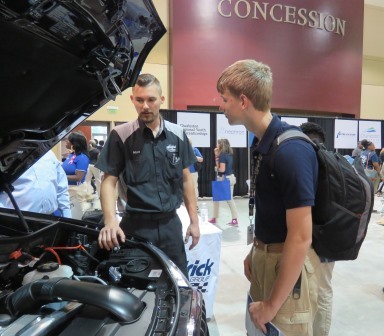 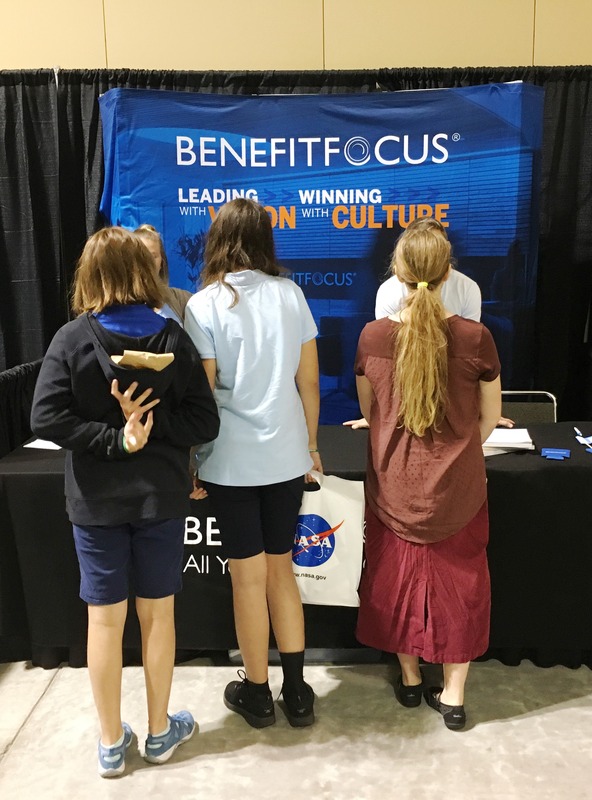 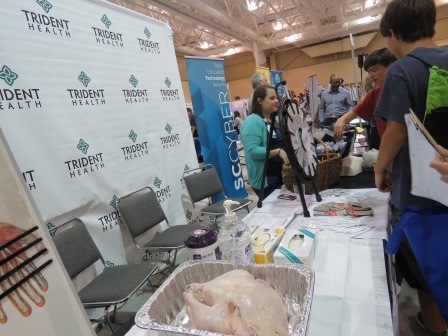 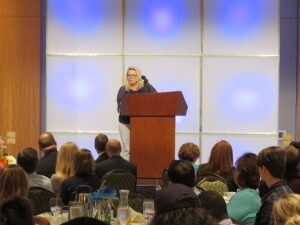 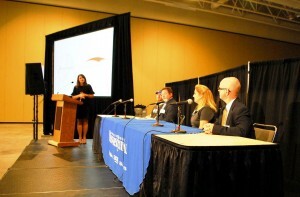 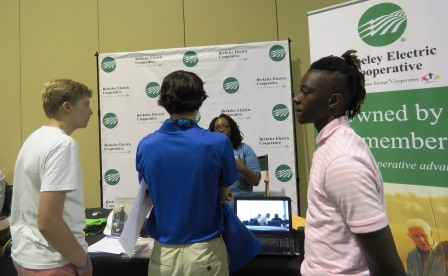 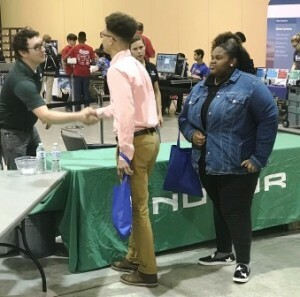 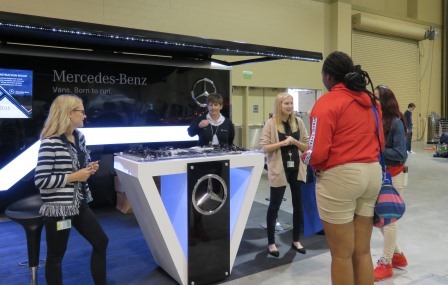 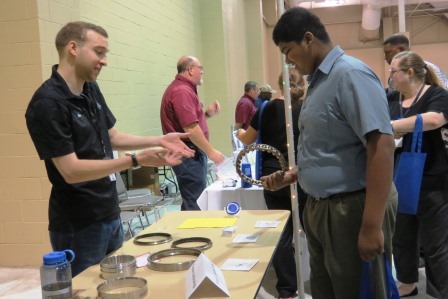 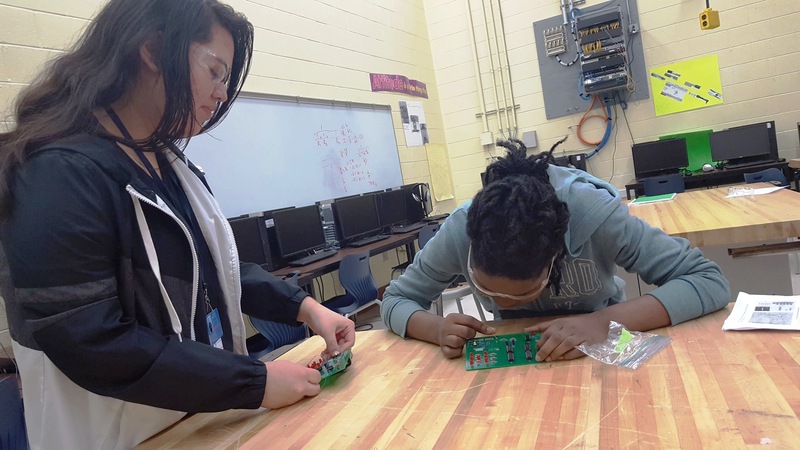 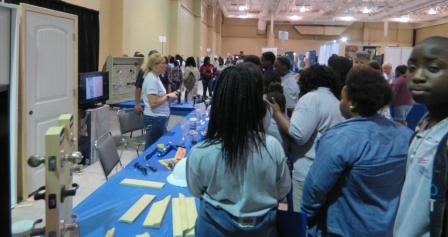 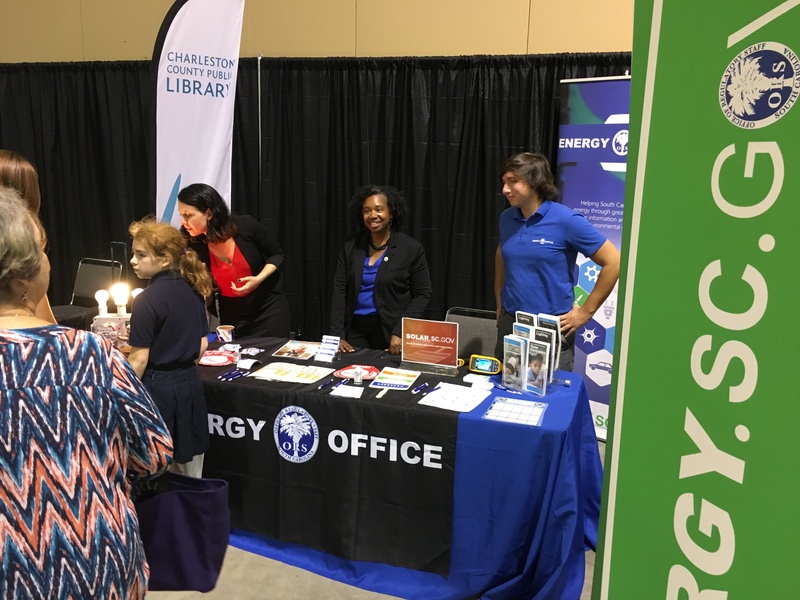 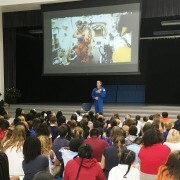 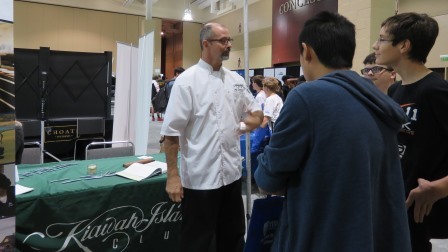 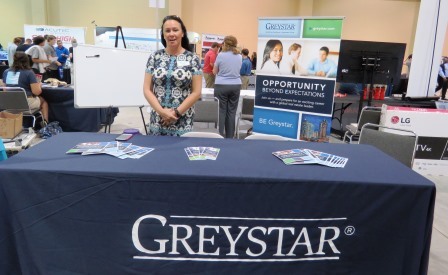 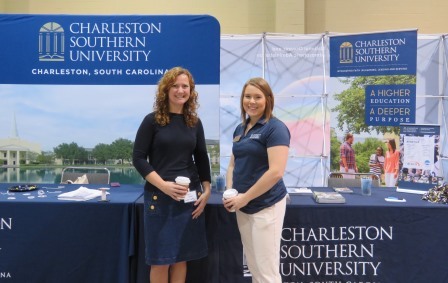 Special thanks to all the amazing partners that ensure this opportunity is available for students in the Charleston region, including: the host companies in 16 career pathways, Trident Technical College, Apprenticeship Carolina, Charleston Metro Chamber of Commerce, the US Department of Labor, and educators in schools throughout the community. 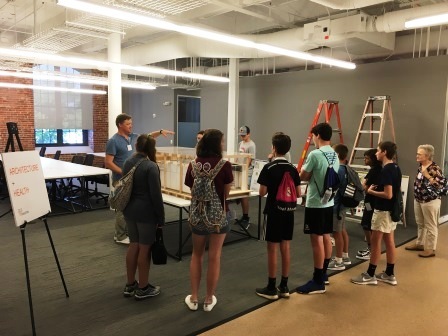 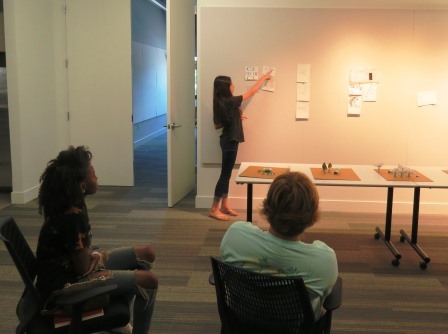 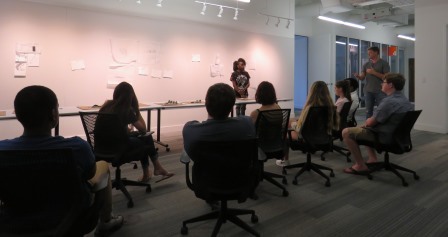 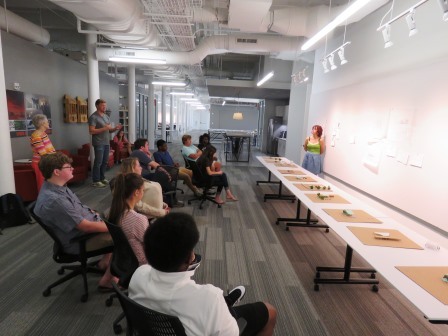 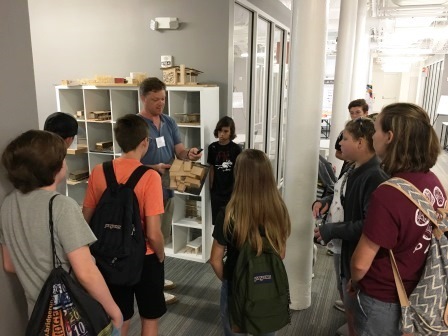 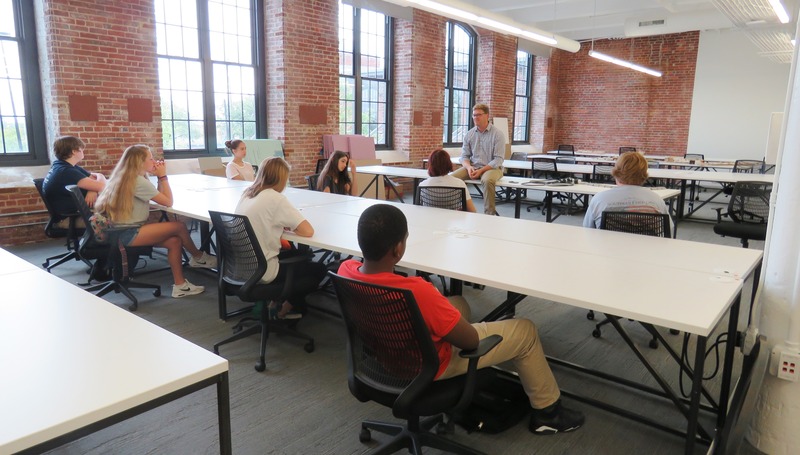 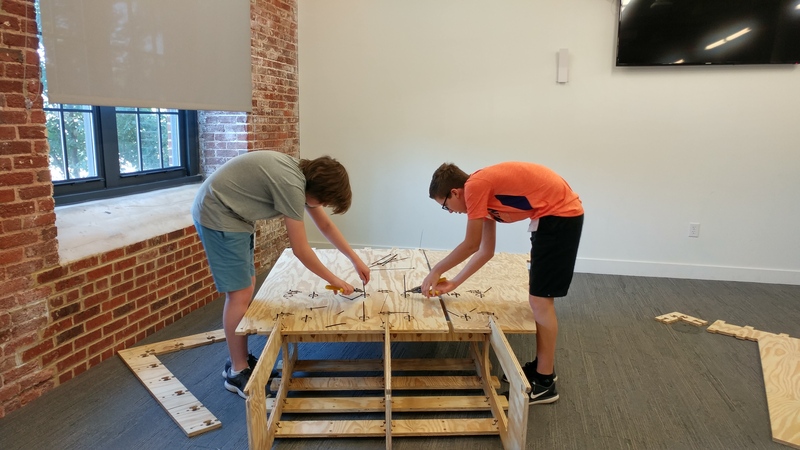 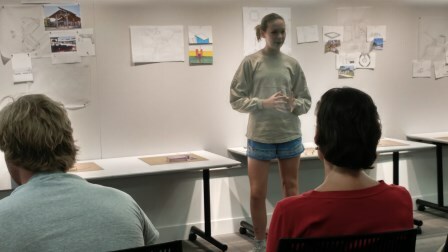 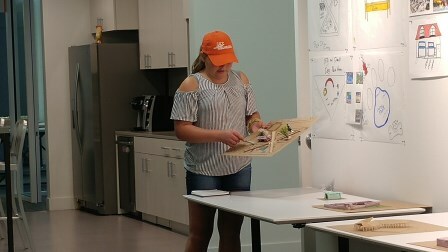 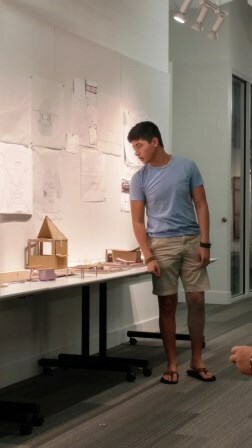 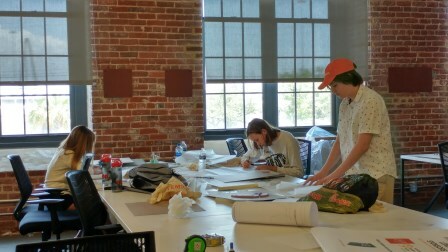 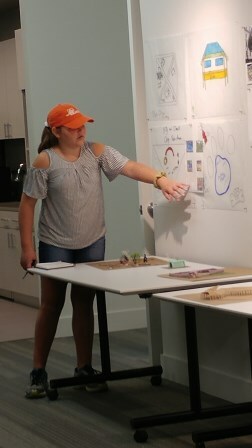 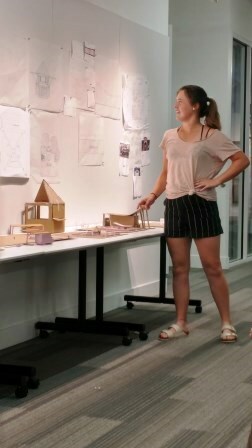 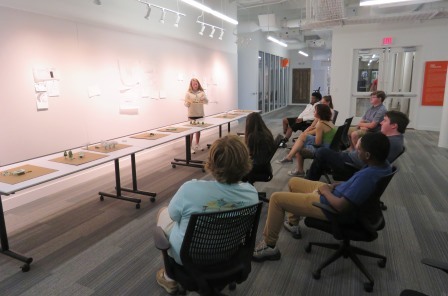 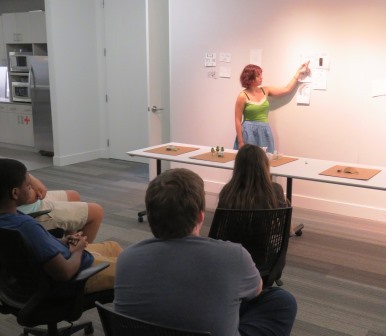 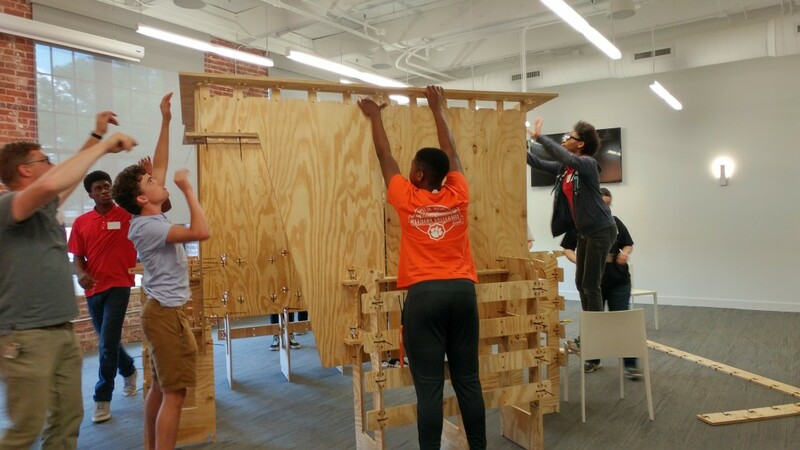 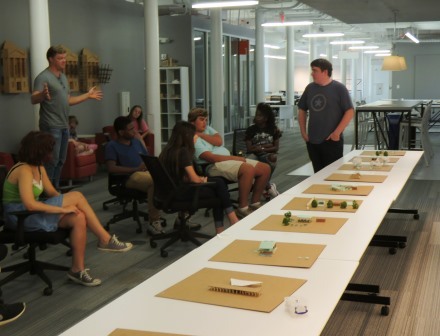 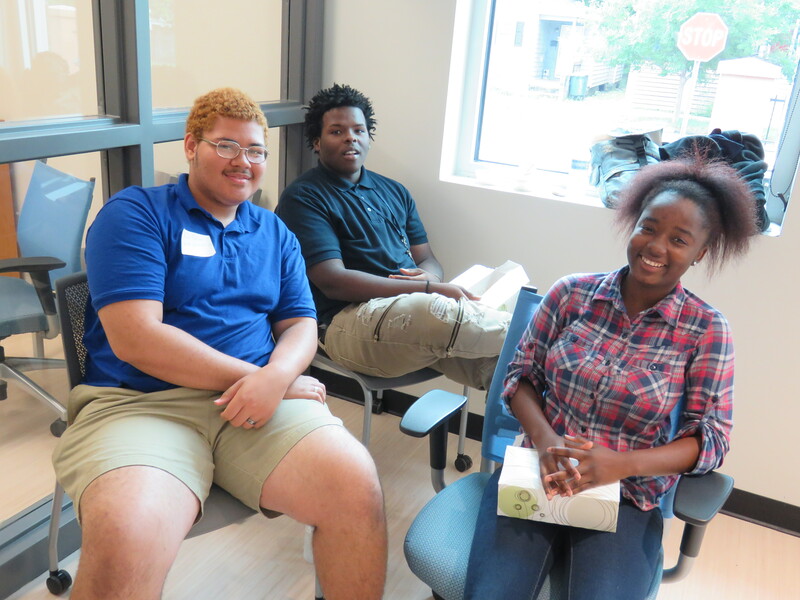 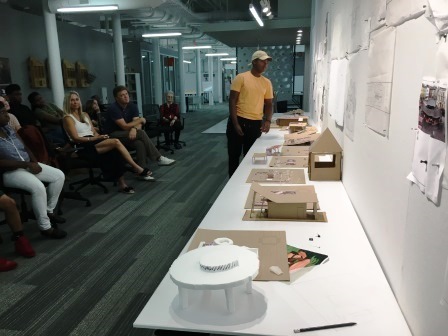 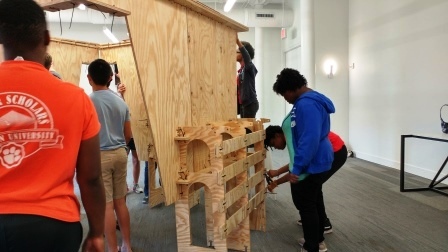 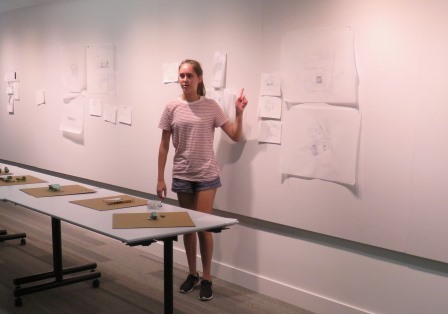 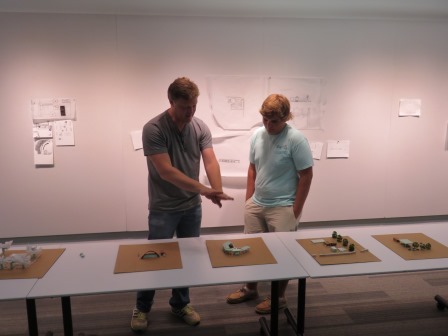 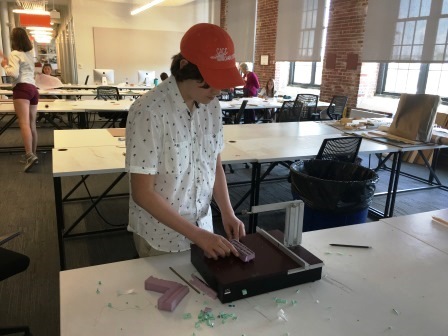 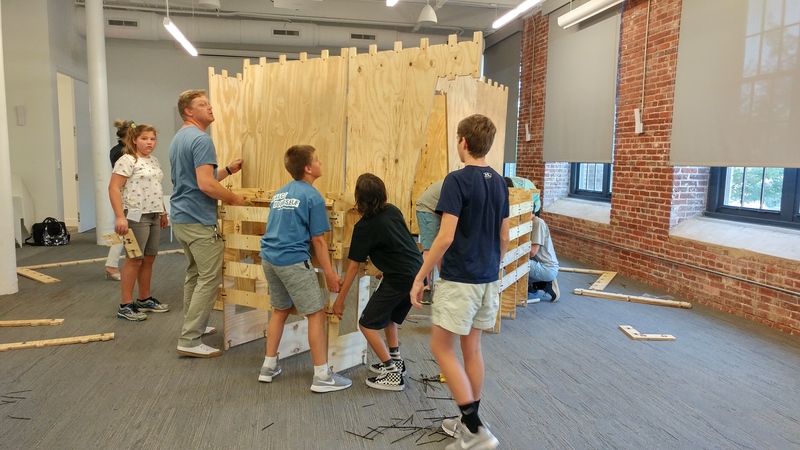 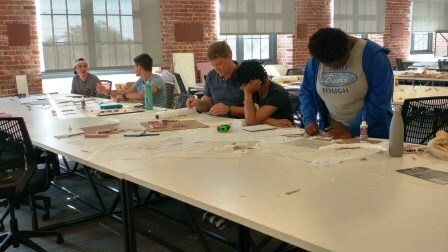 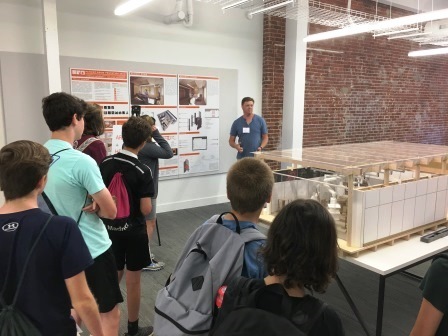 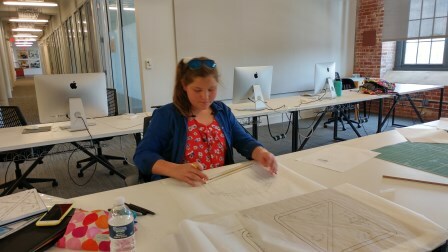 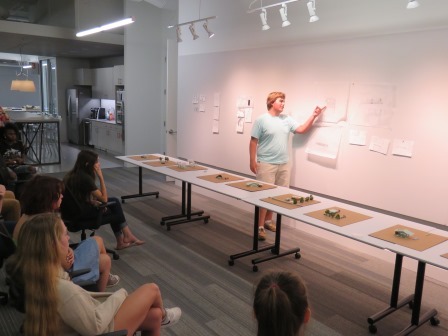 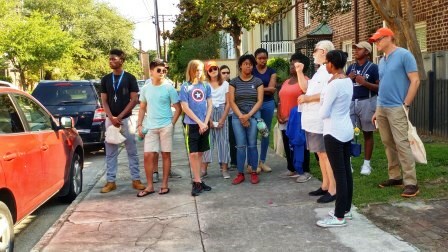 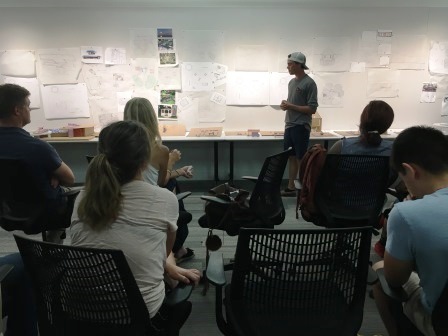 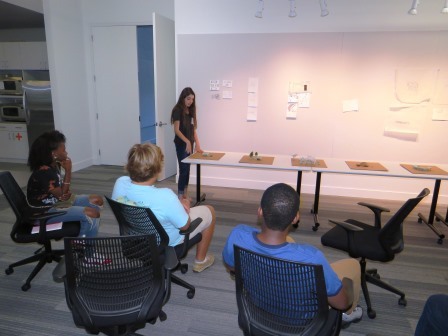 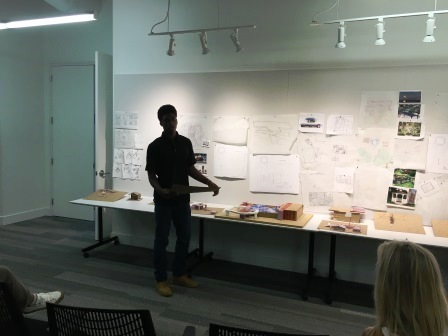 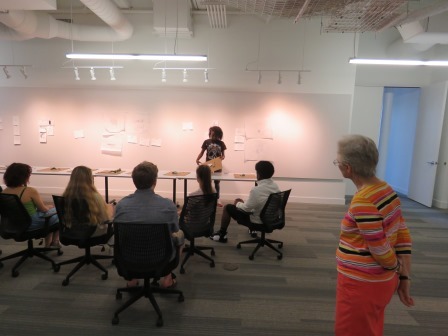 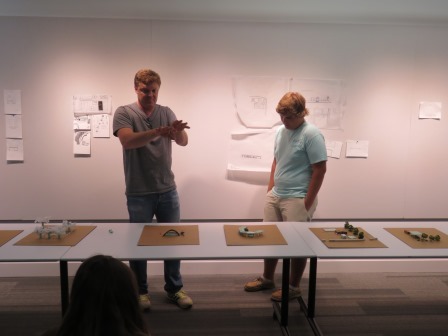 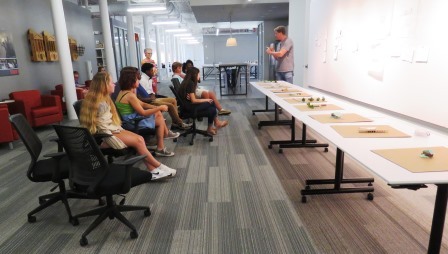 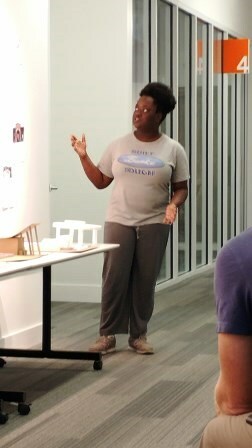 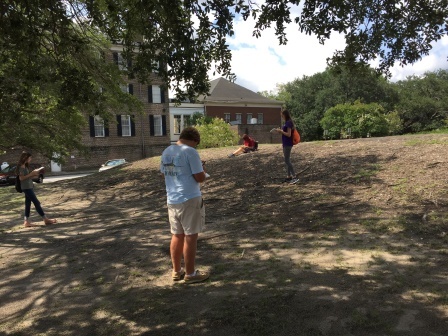 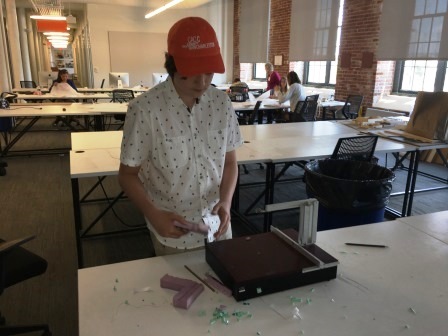 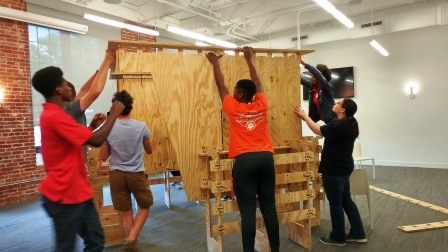 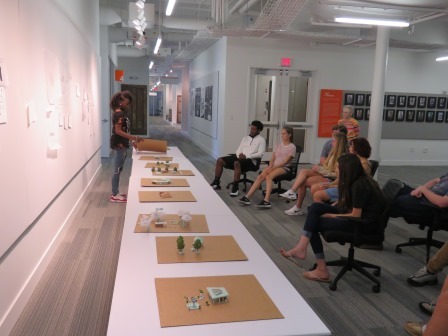 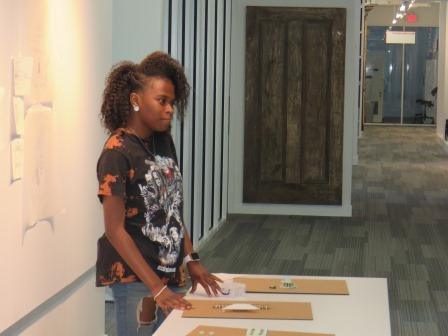 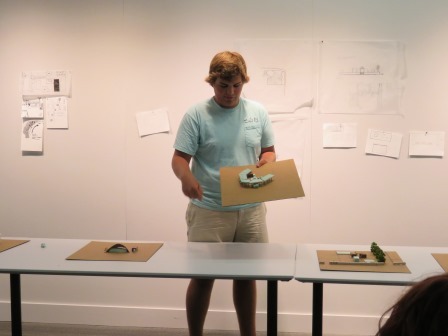 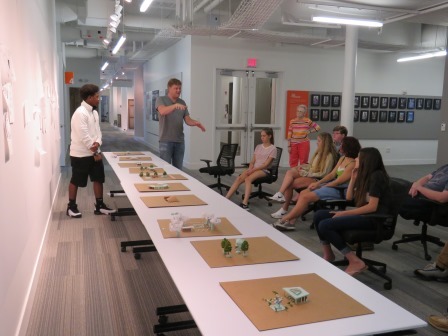 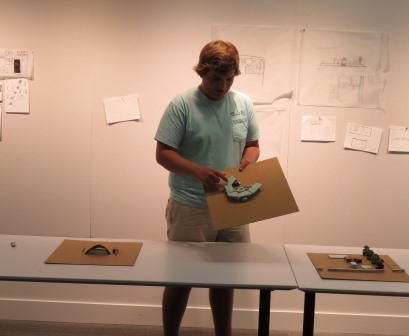 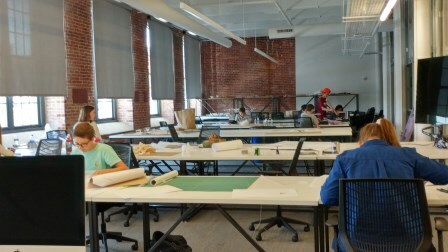 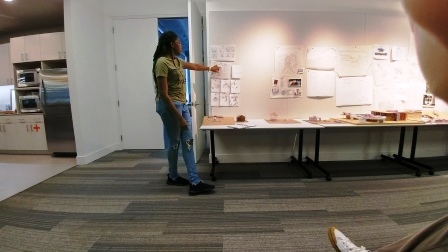 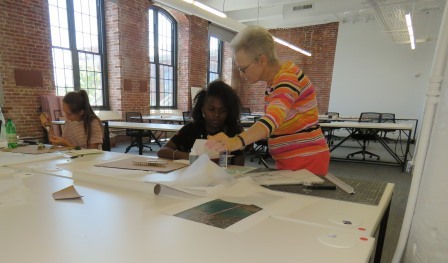 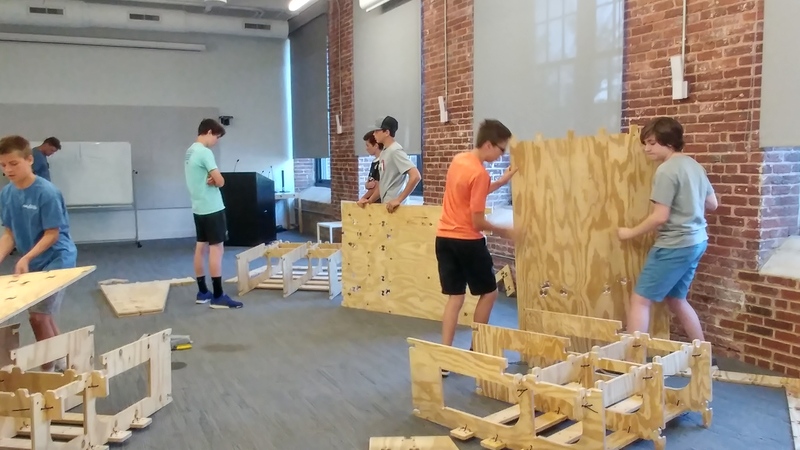 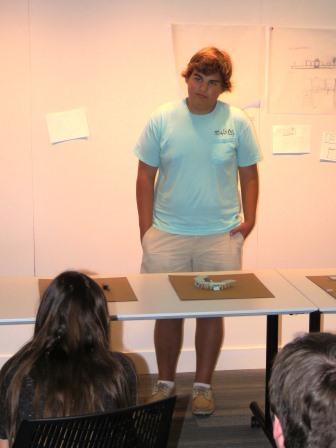 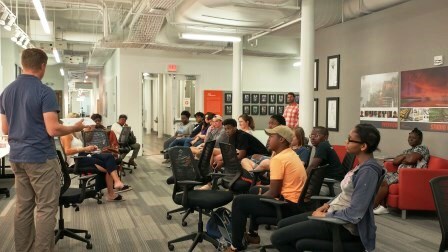 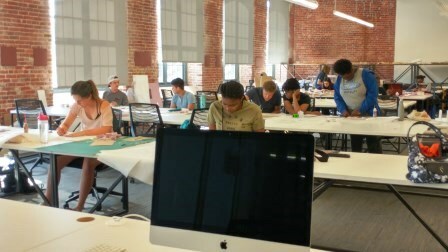 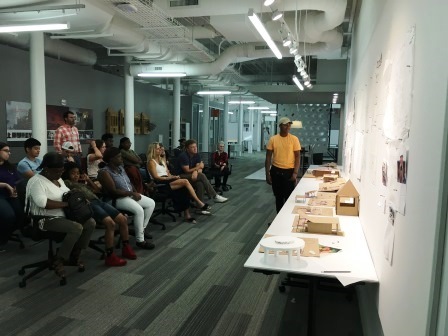 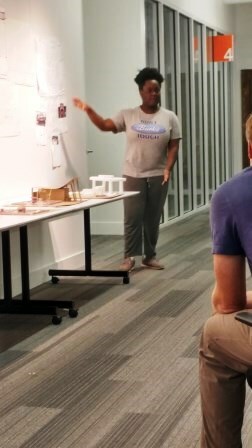 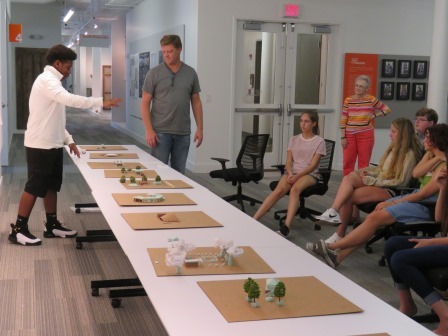 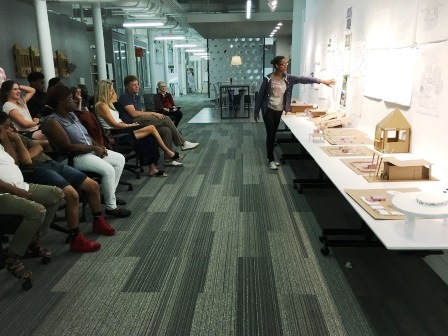 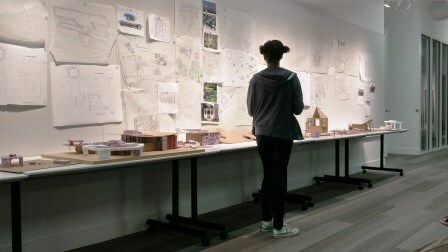 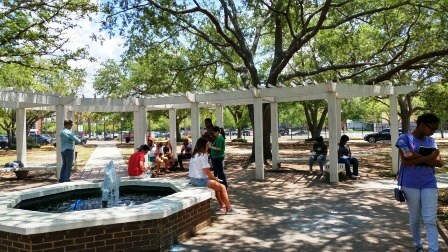 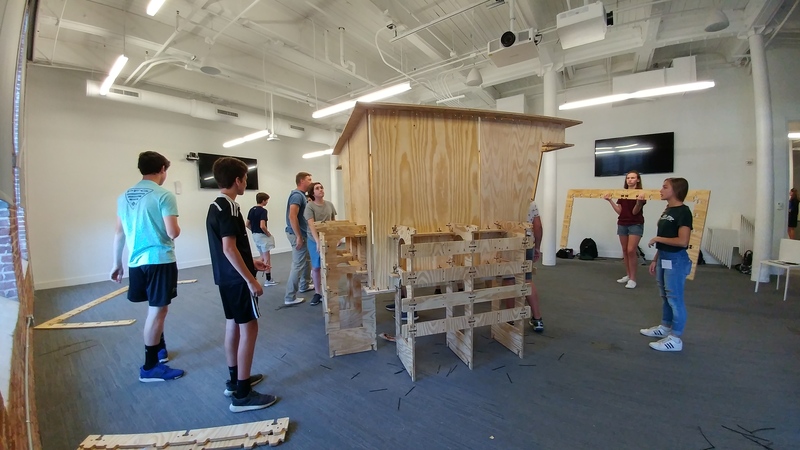 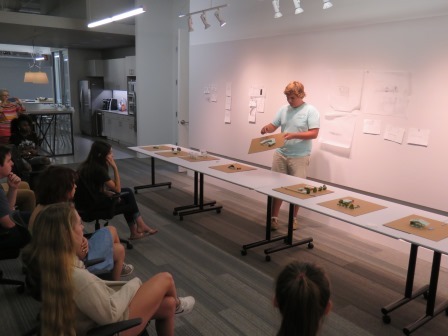 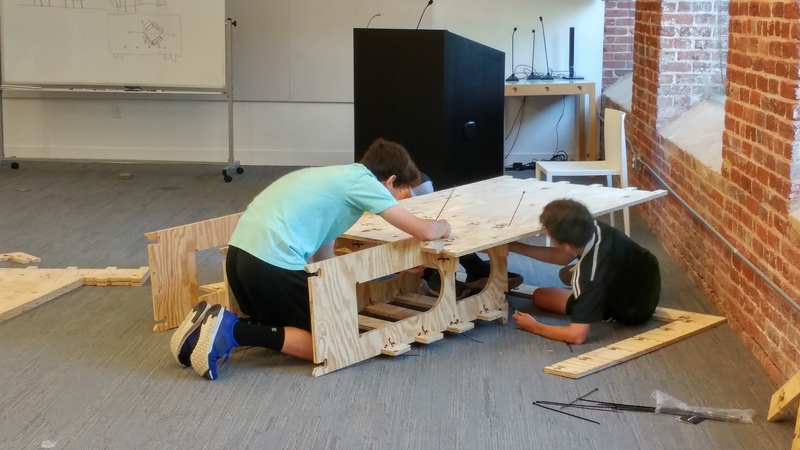 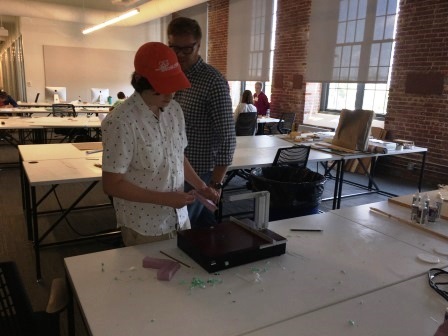 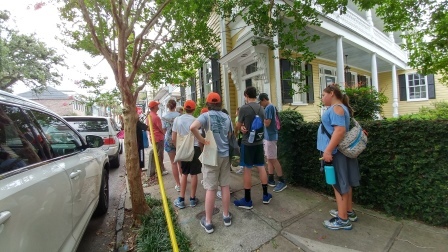 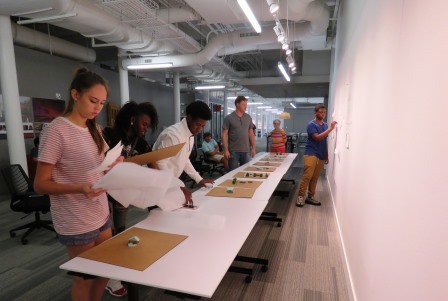 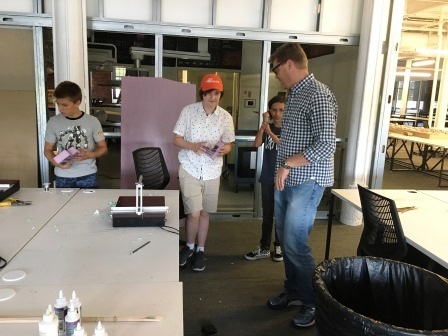 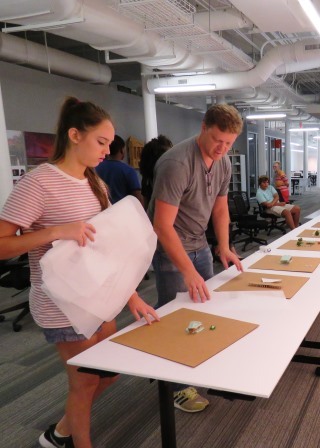 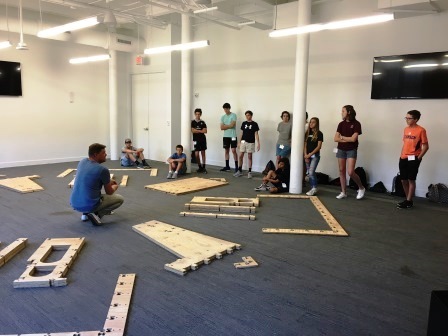 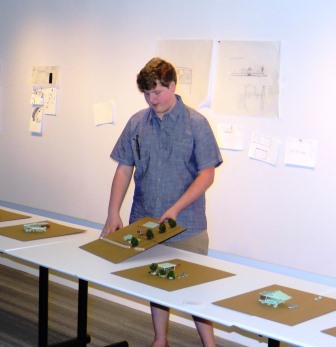 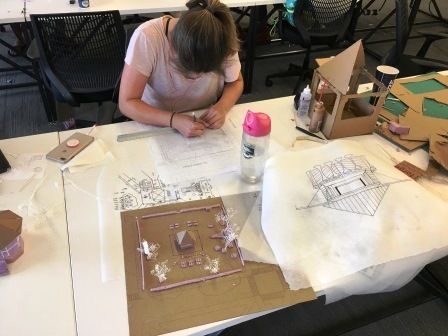 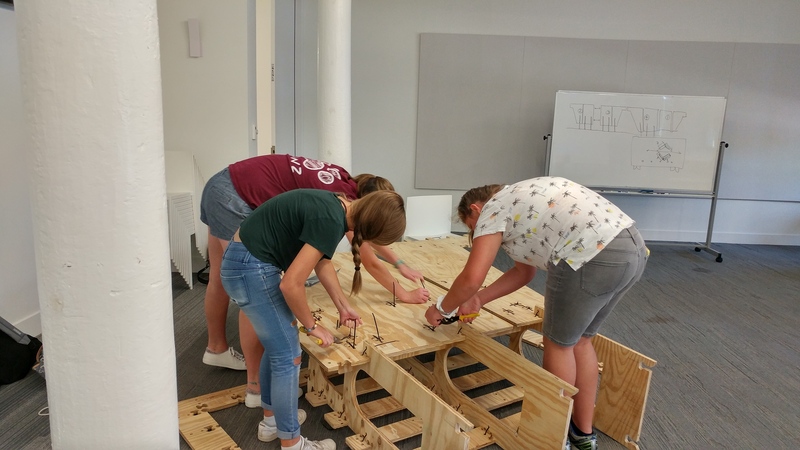 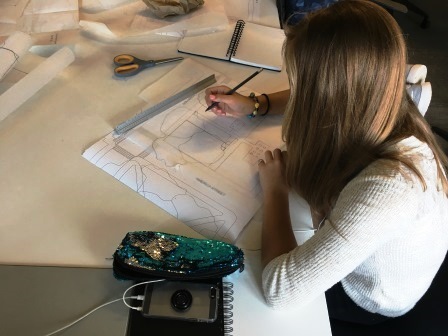 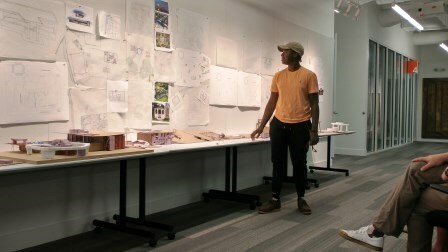 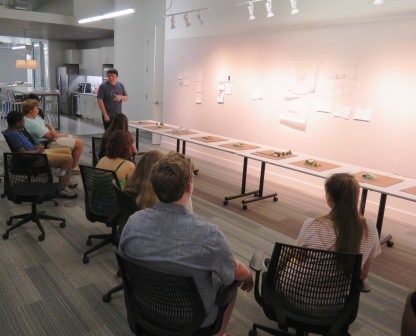 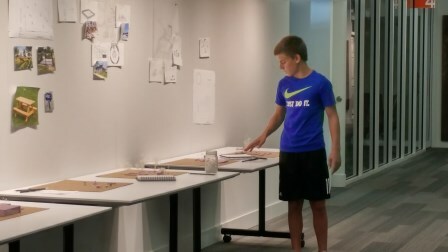 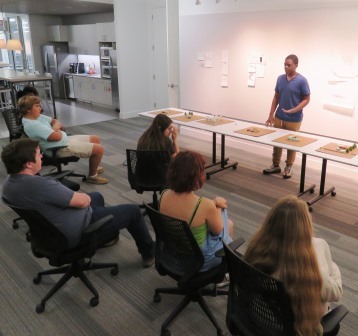 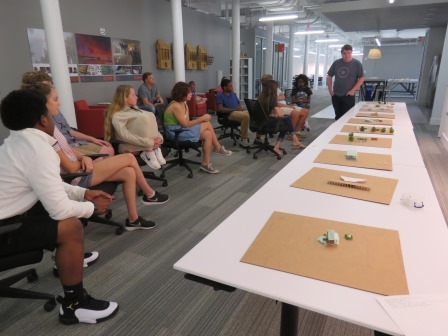 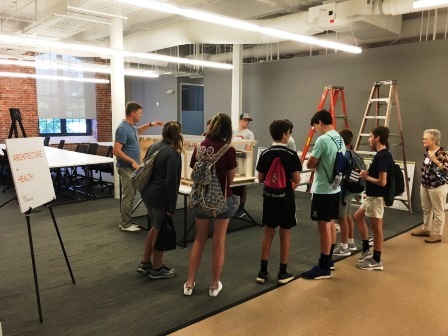 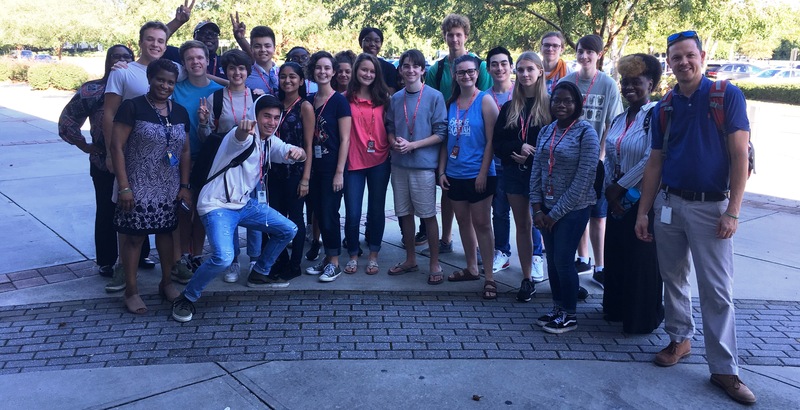 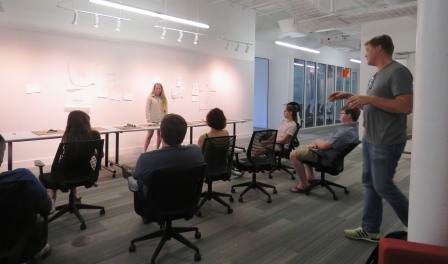 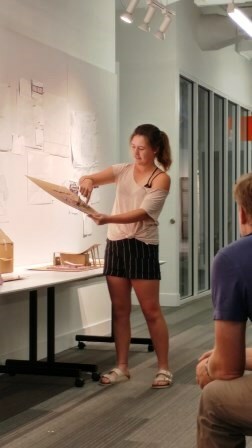 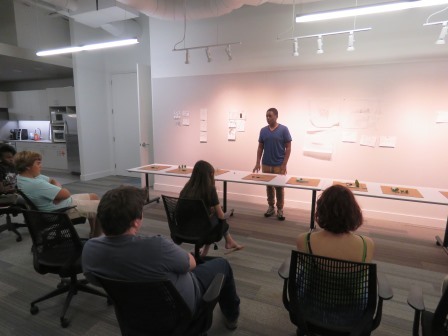 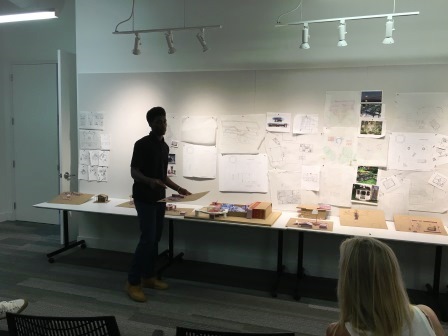 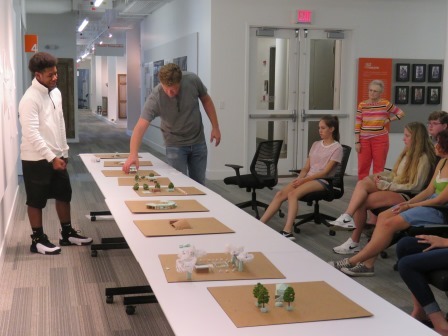 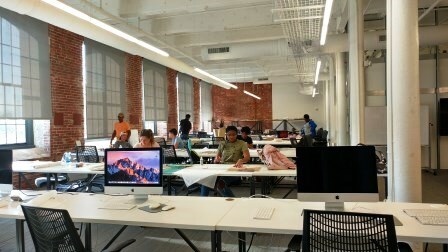 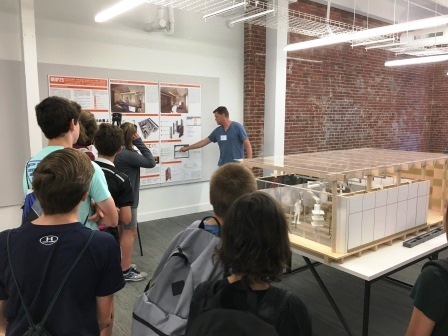 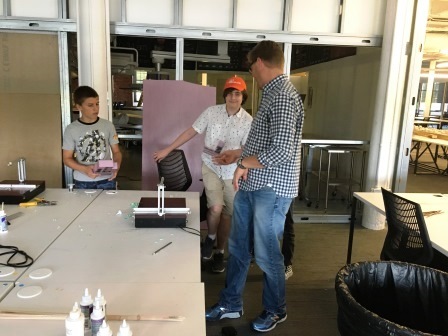 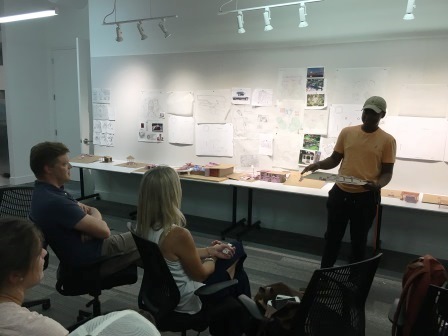 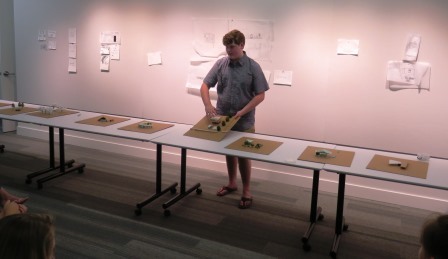 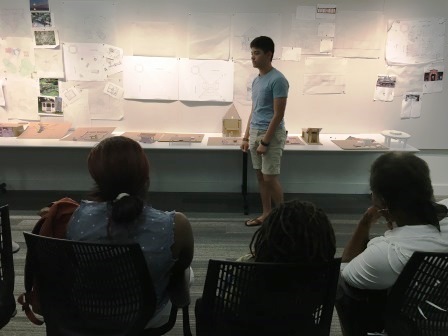 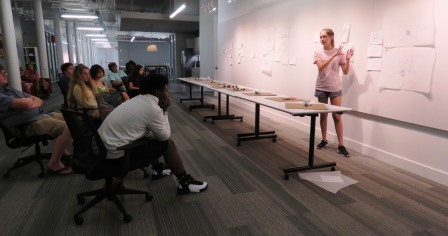 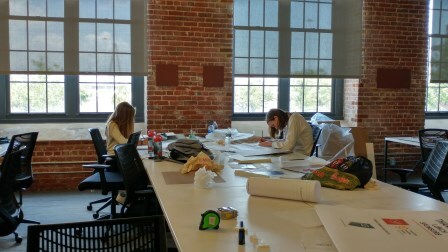 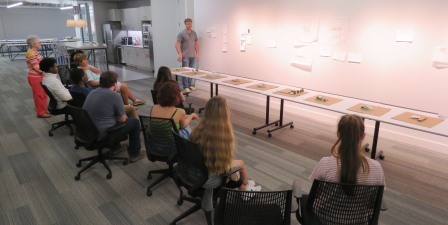 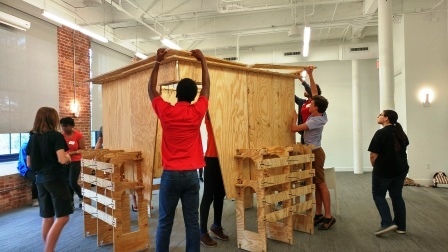 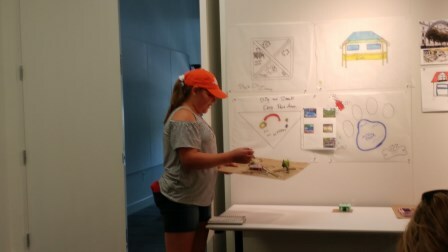 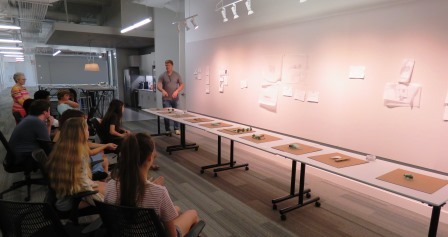 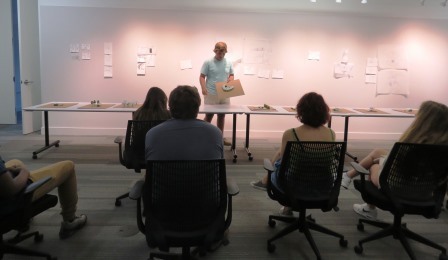 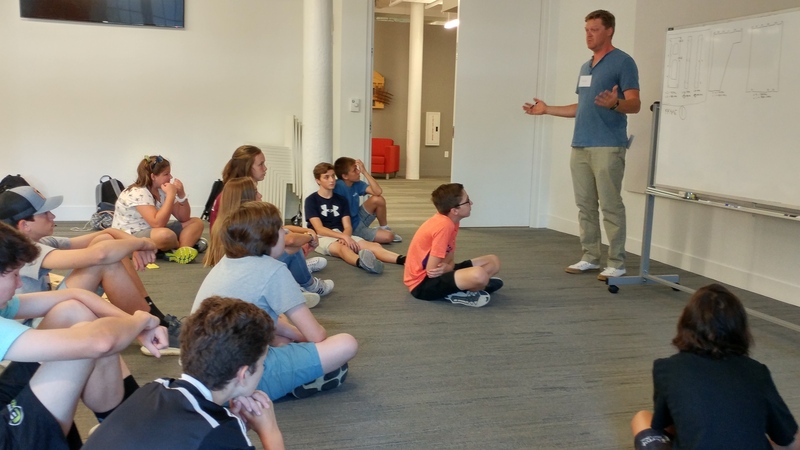 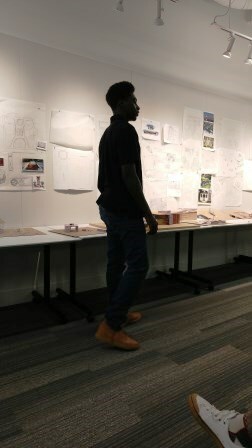 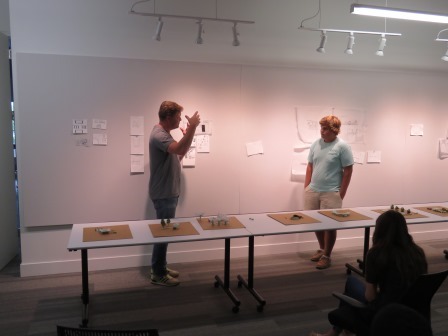 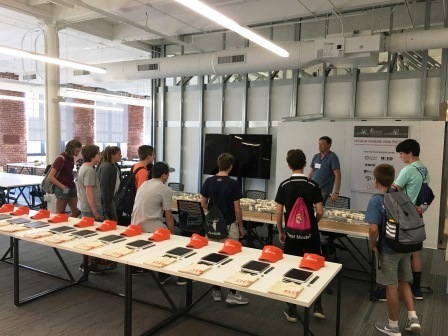 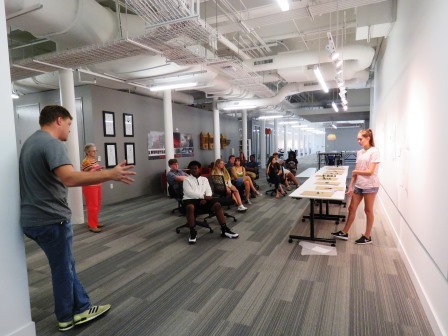 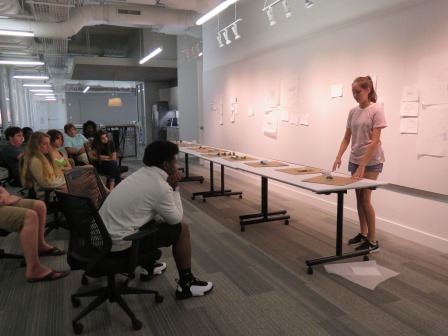 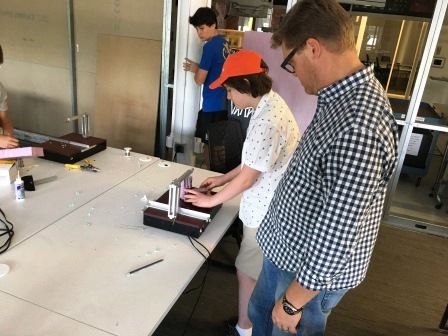 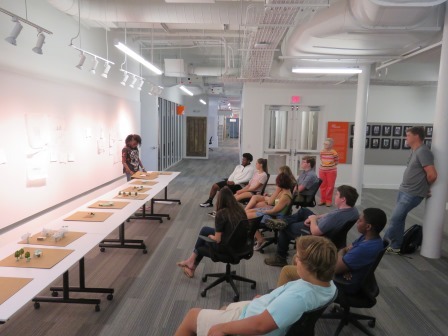 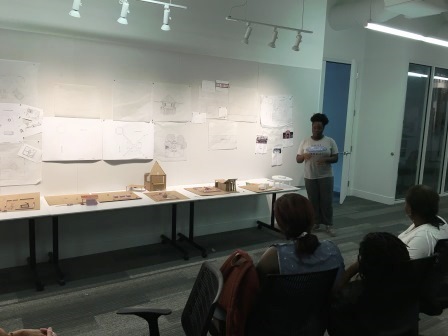 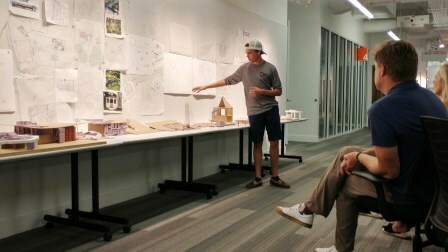 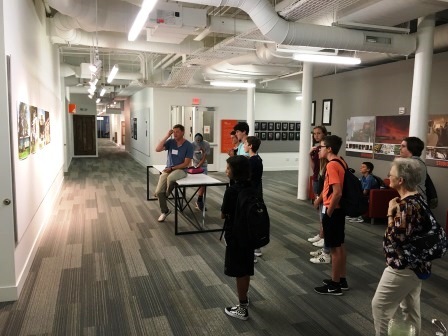 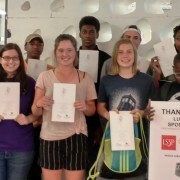 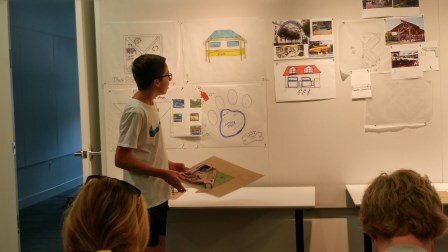 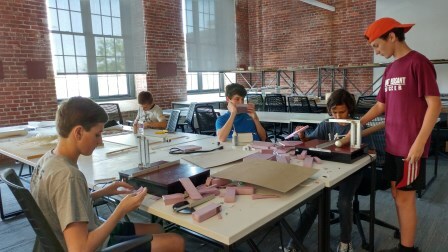 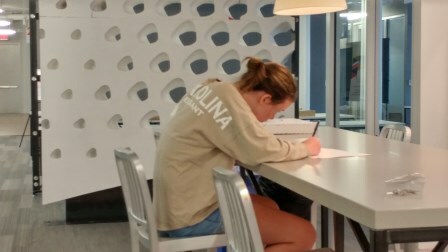 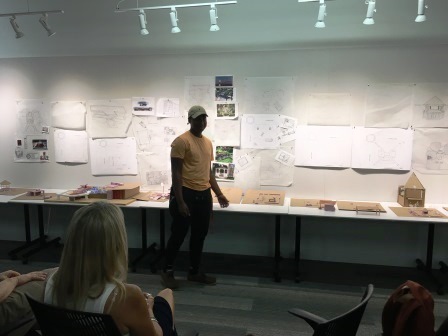 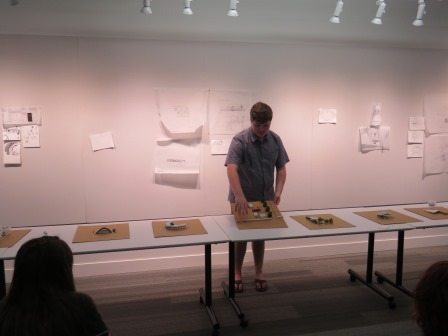 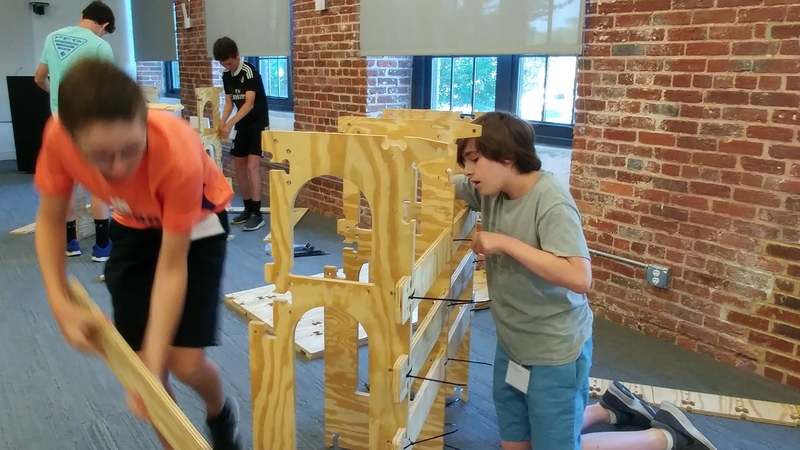 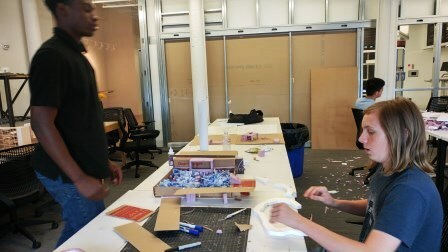 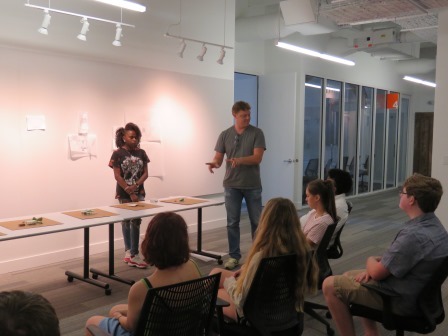 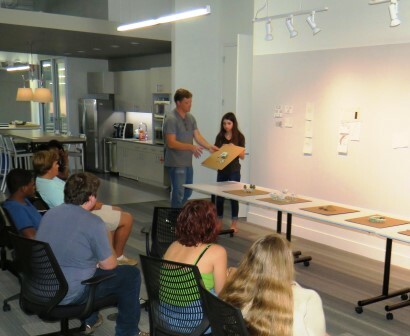 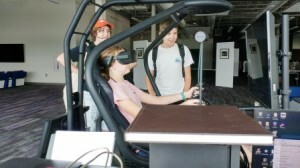 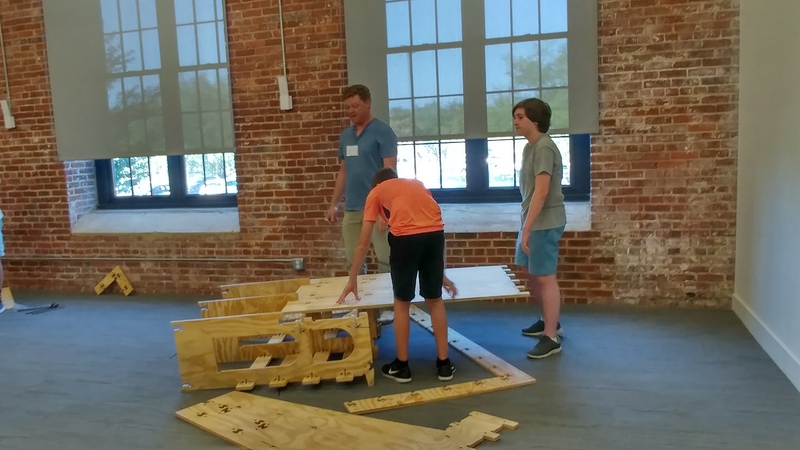 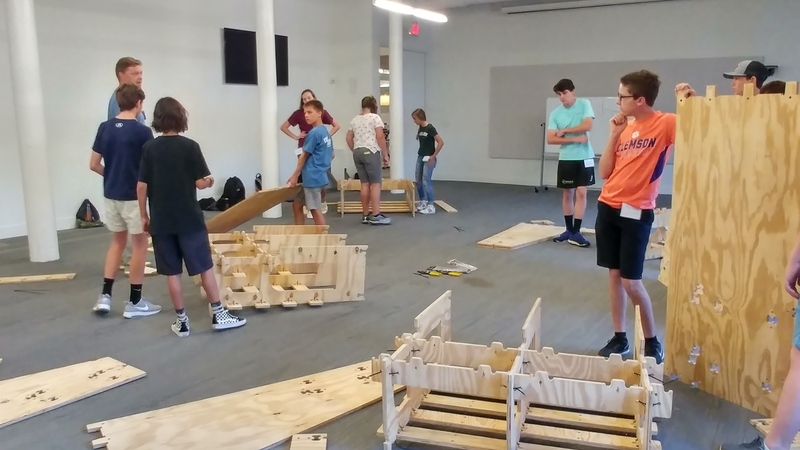 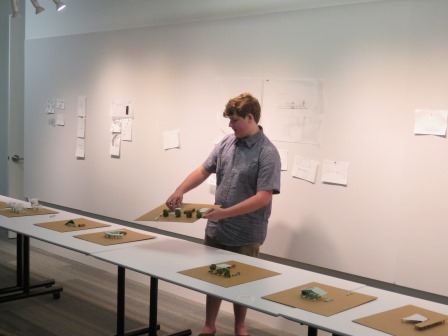 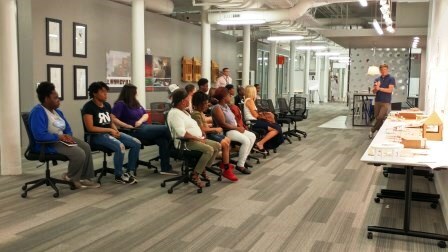 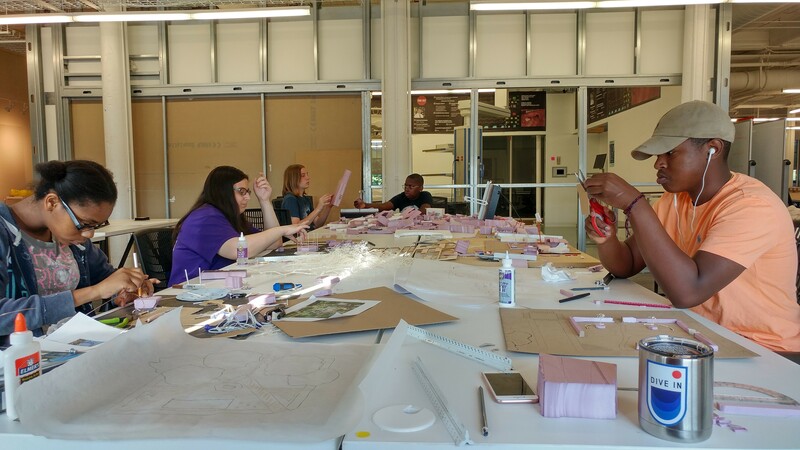 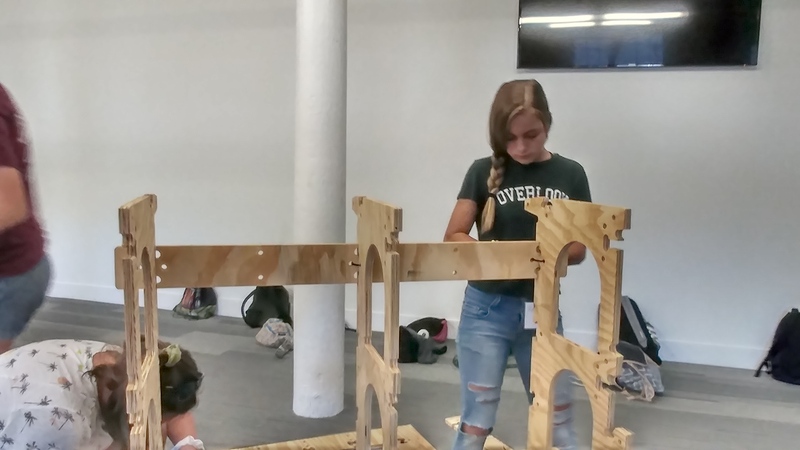 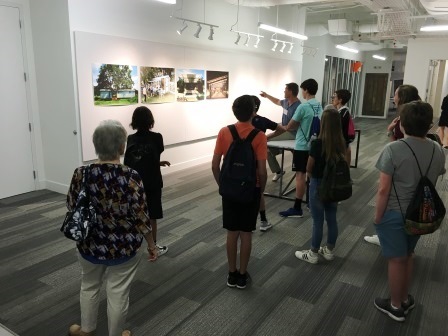 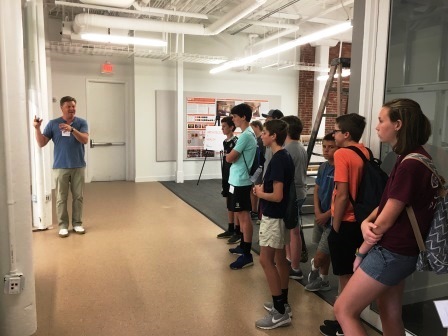 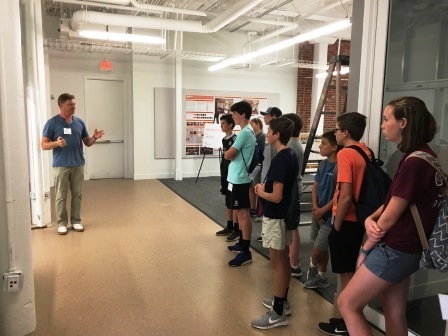 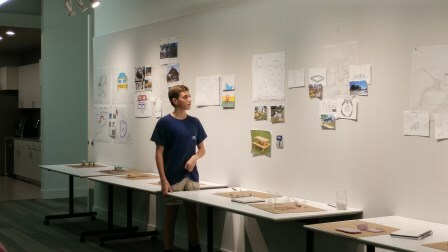 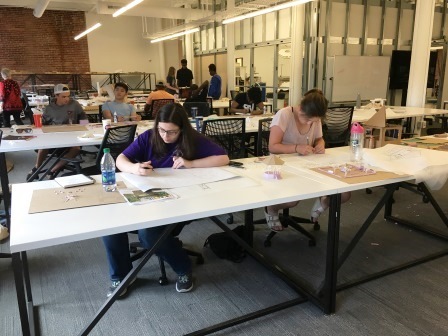 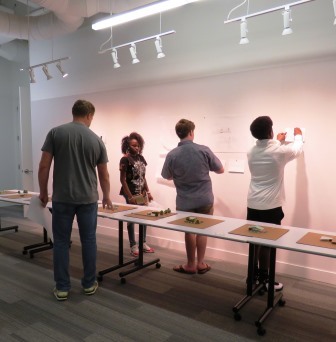 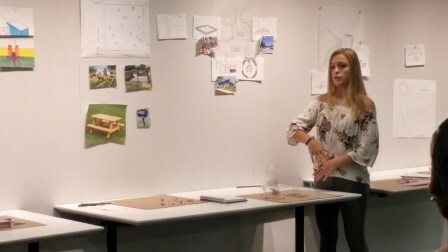 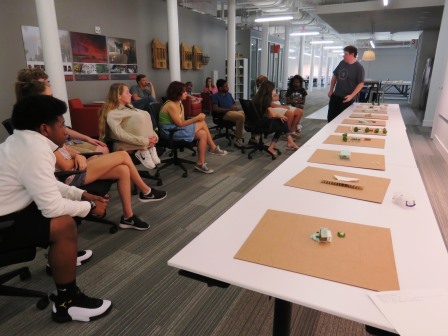 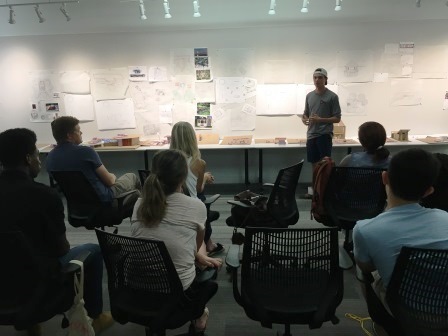 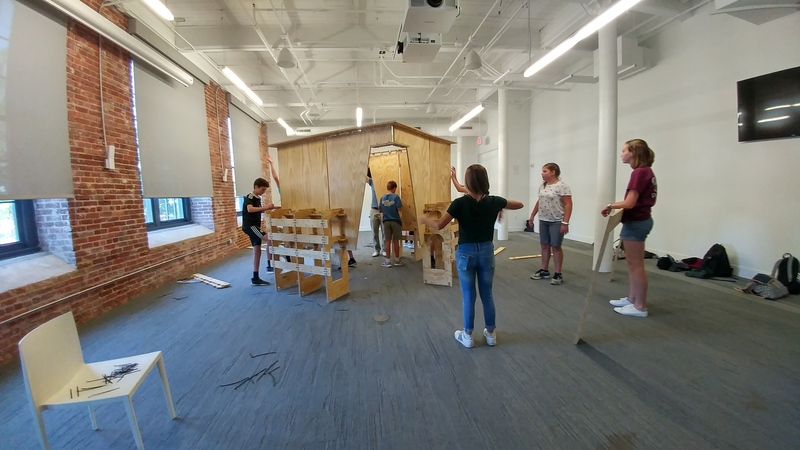 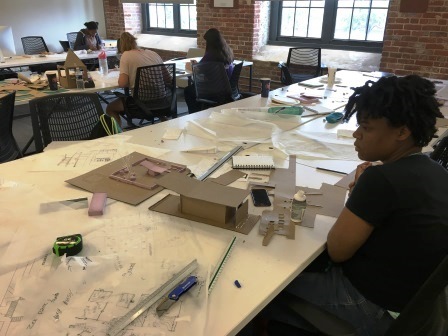 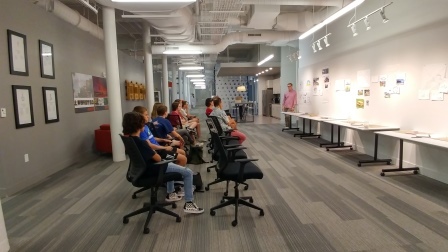 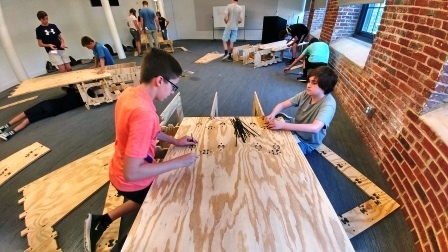 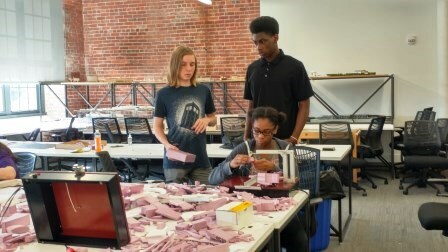 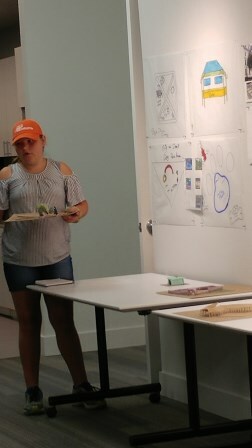 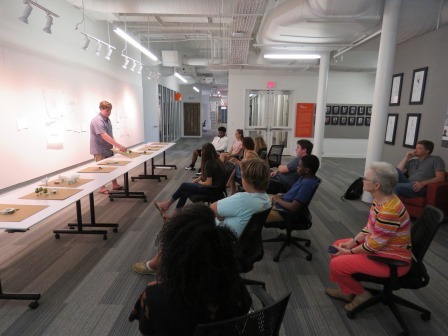 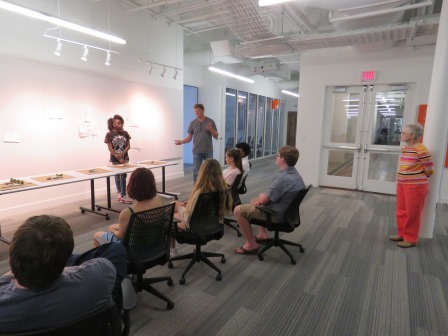 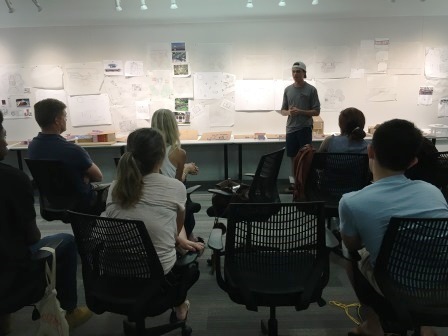 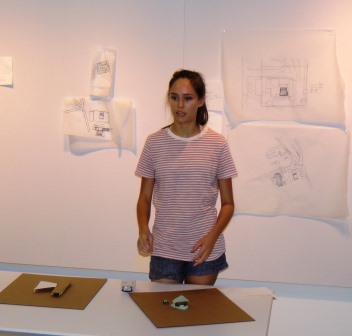 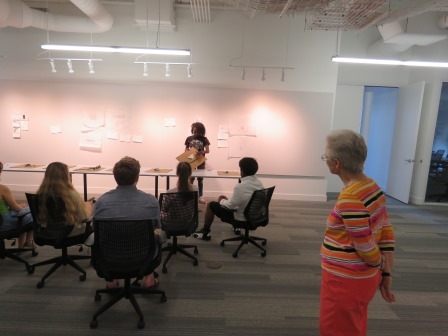 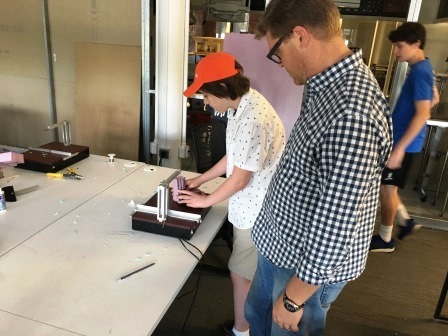 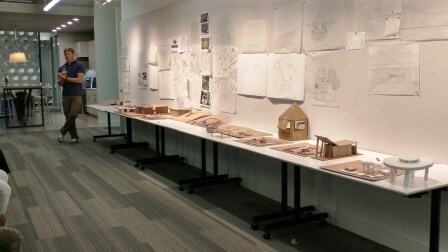 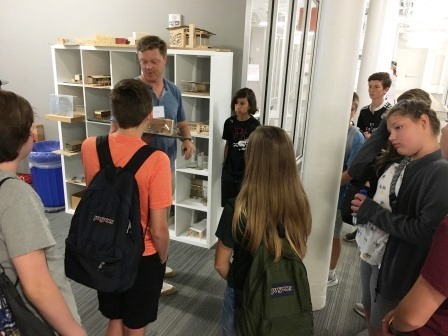 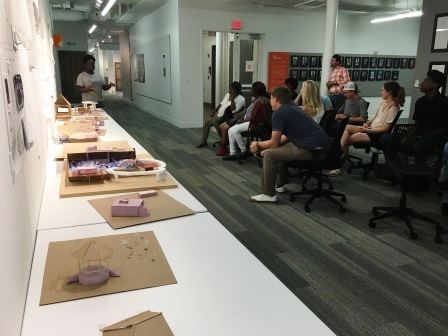 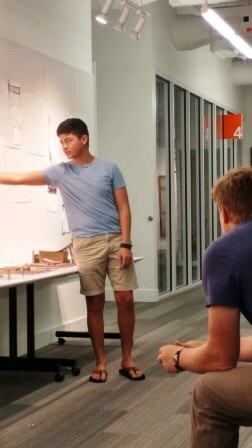 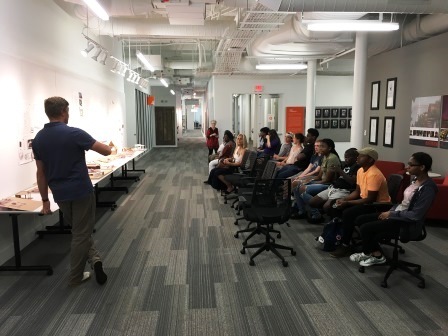 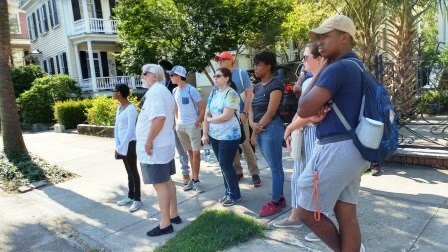 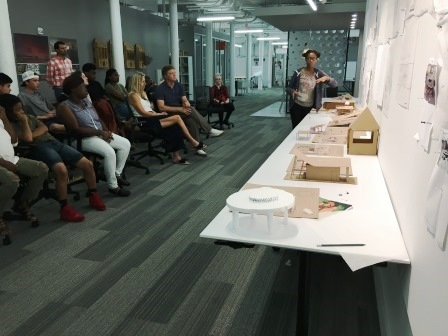 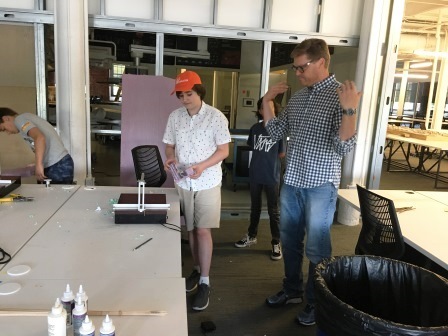 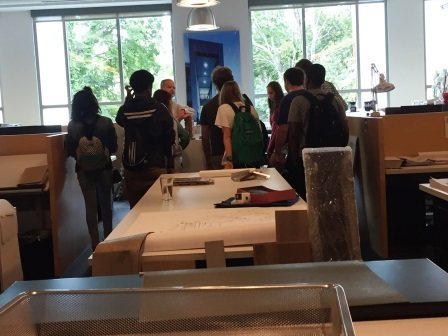 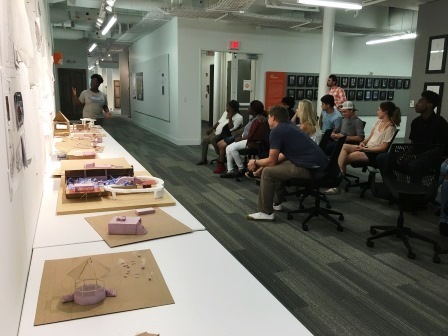 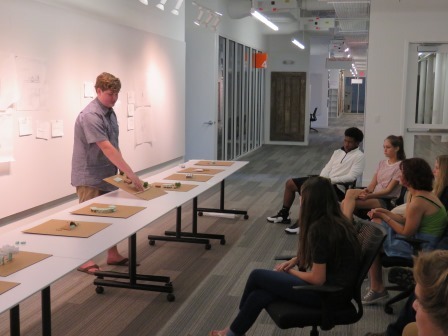 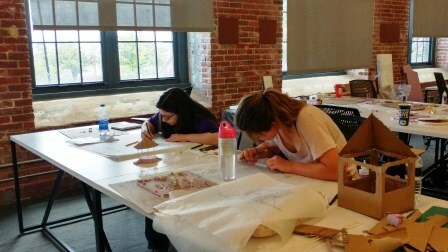 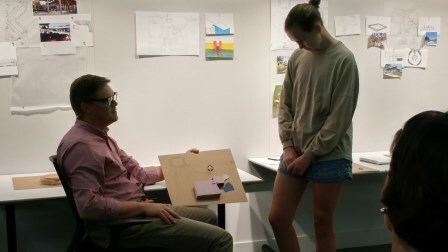 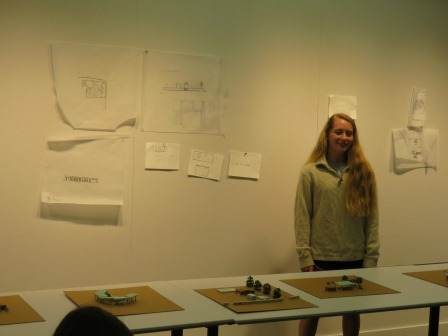 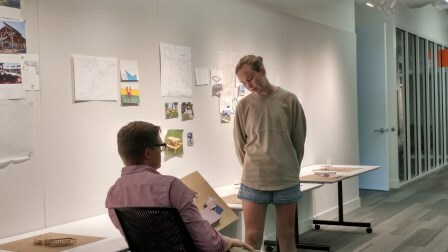 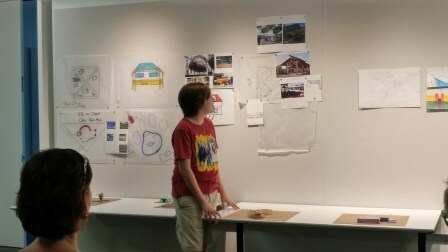 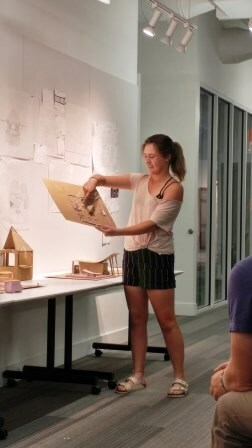 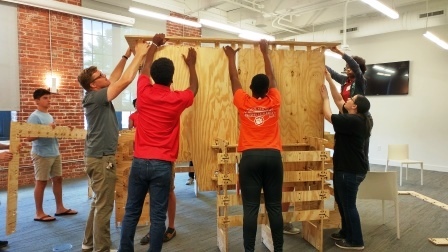 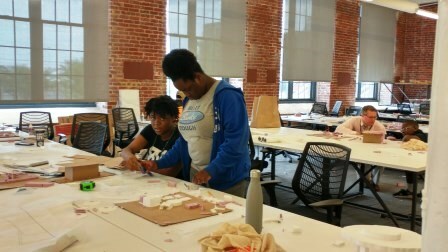 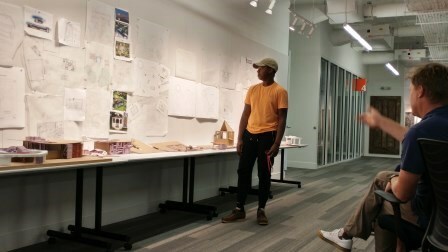 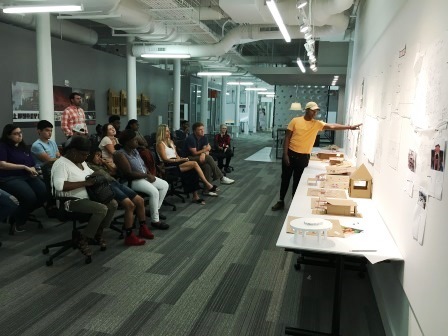 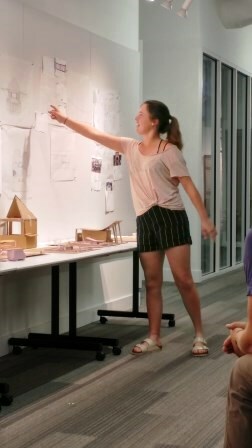 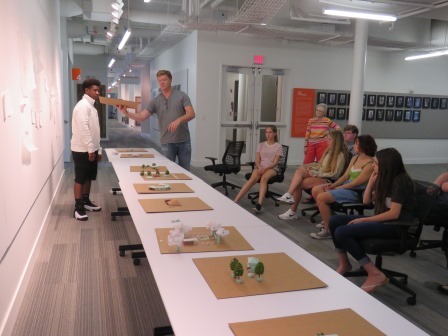 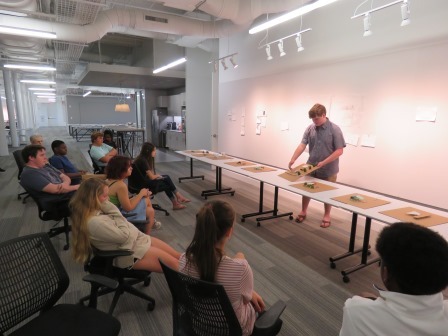 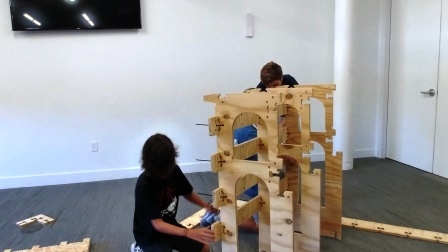 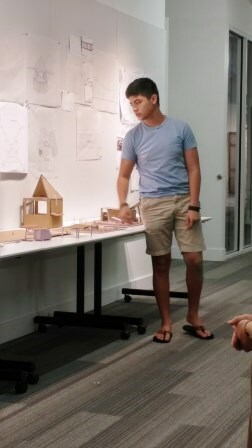 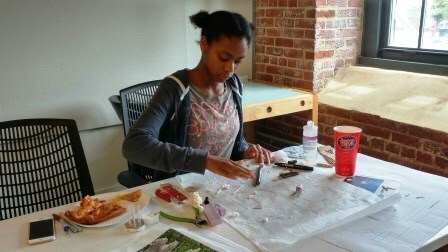 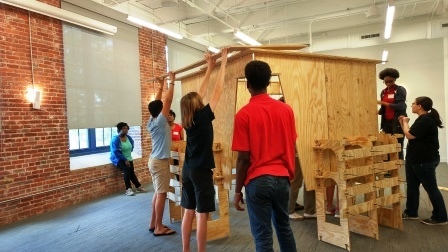 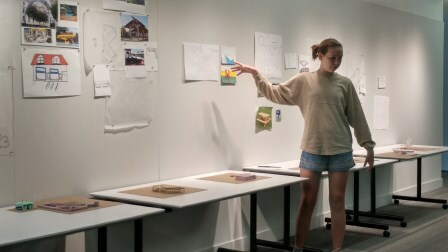 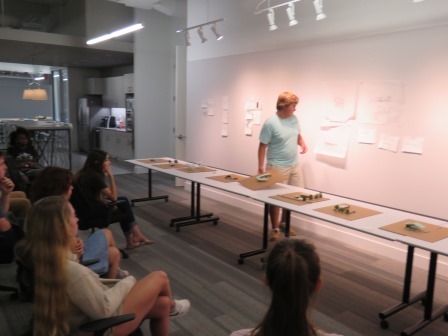 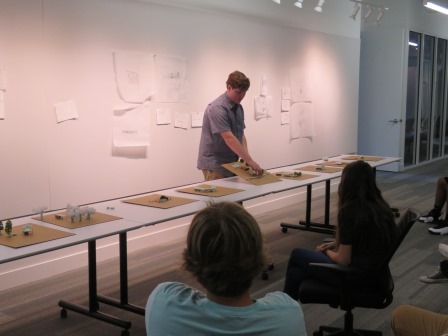 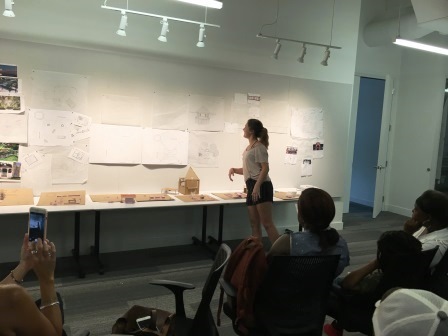 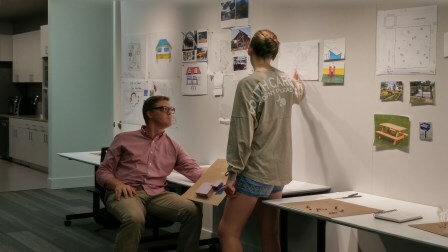 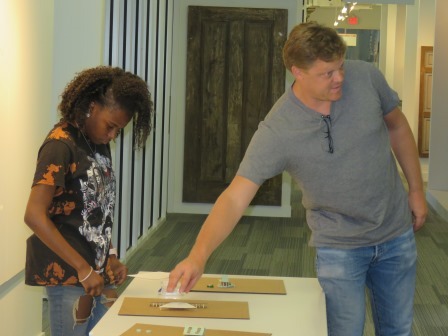 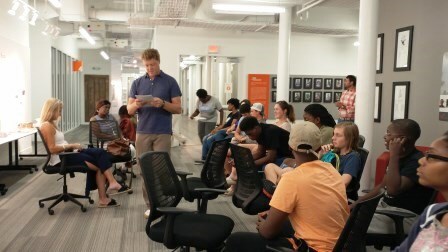 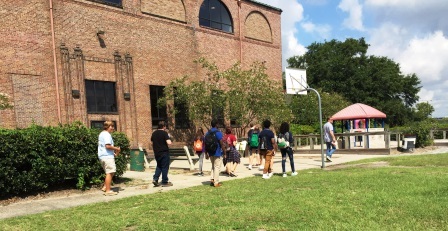 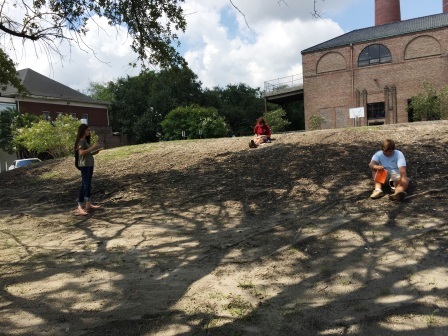 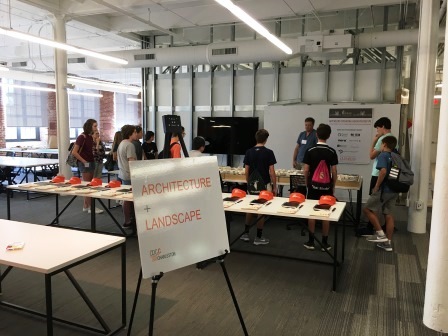 Clemson Architecture Center in Charleston (CAC.C) hosted an Architecture Career Camp from July 17 – 21, 2017 for high school students from Charleston County School District interested in architecture as a career path. 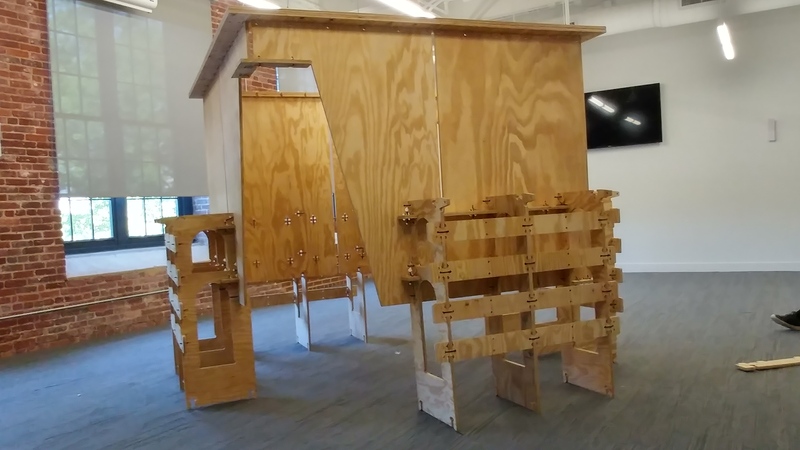 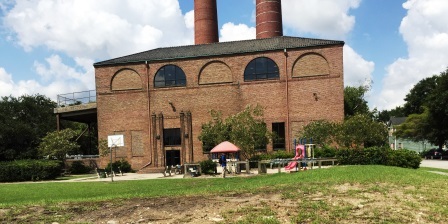 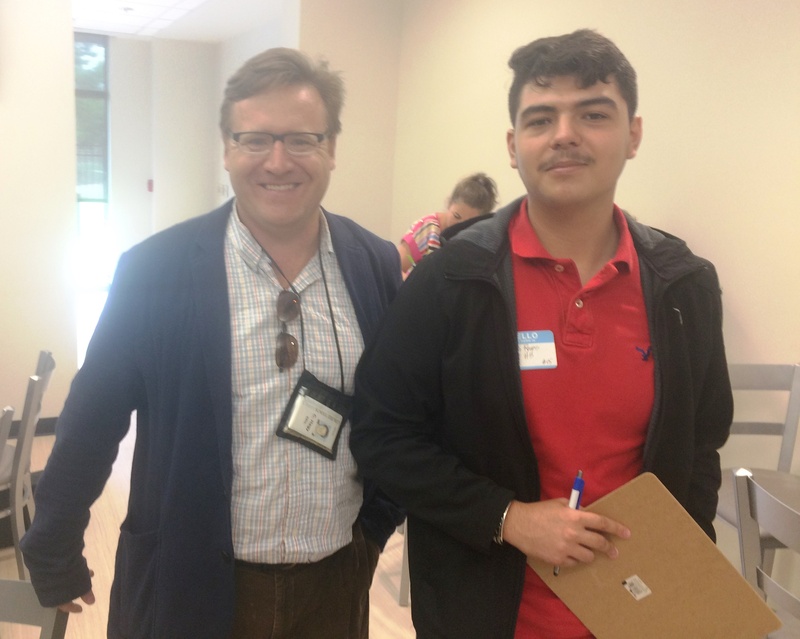 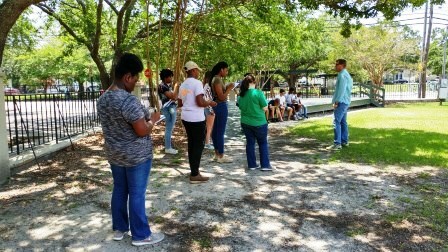 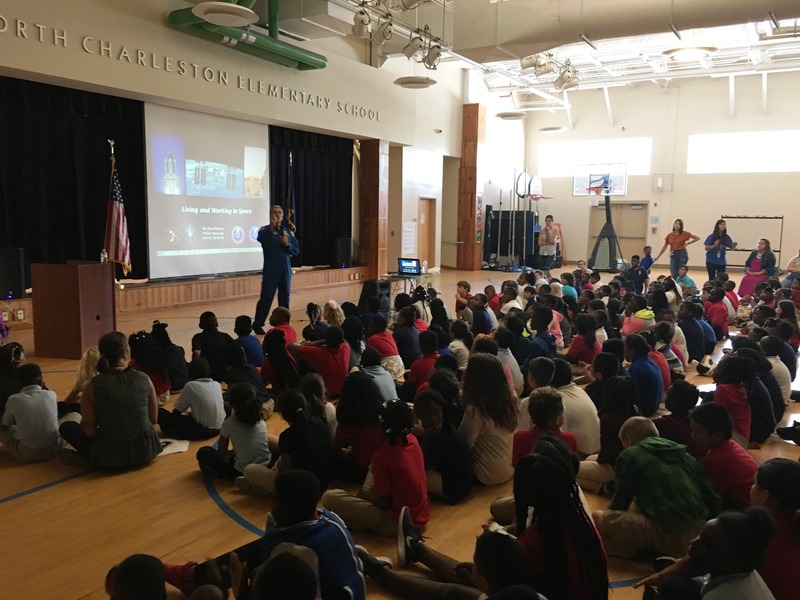 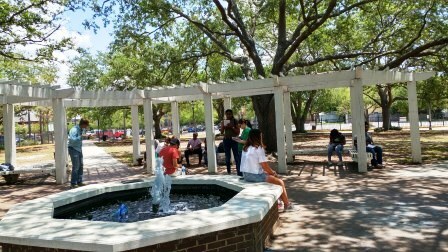 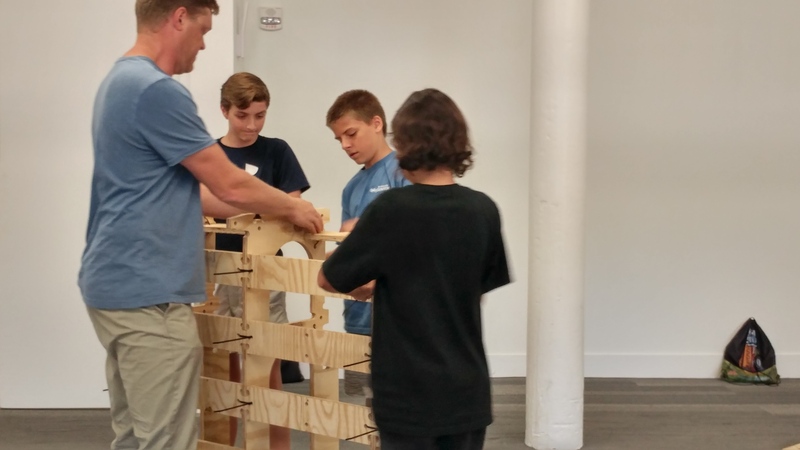 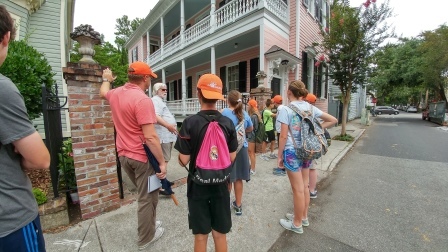 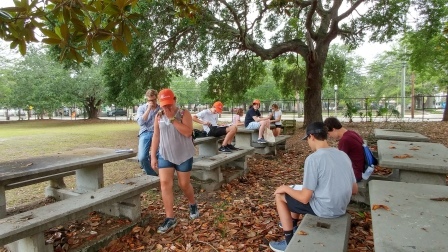 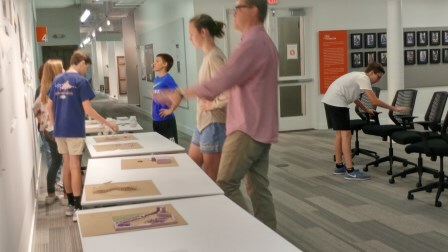 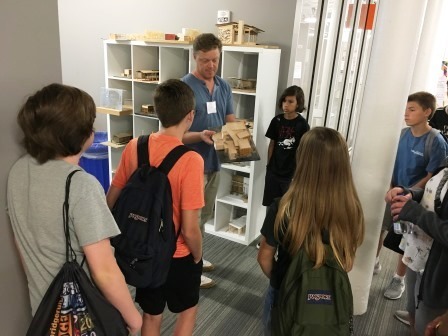 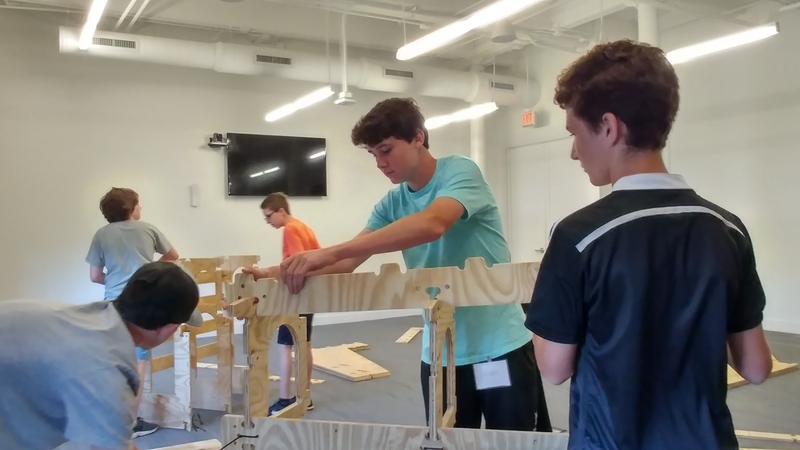 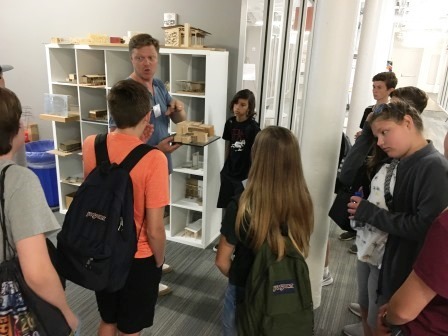 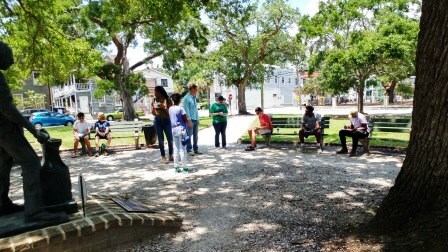 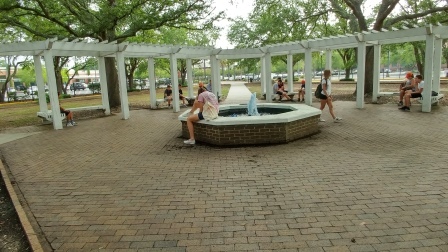 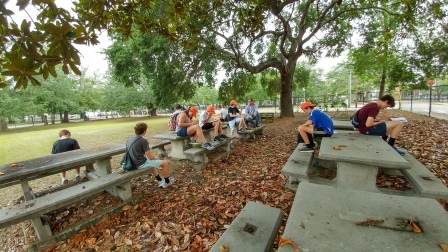 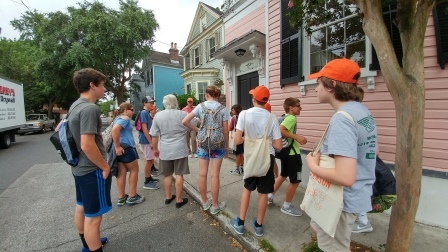 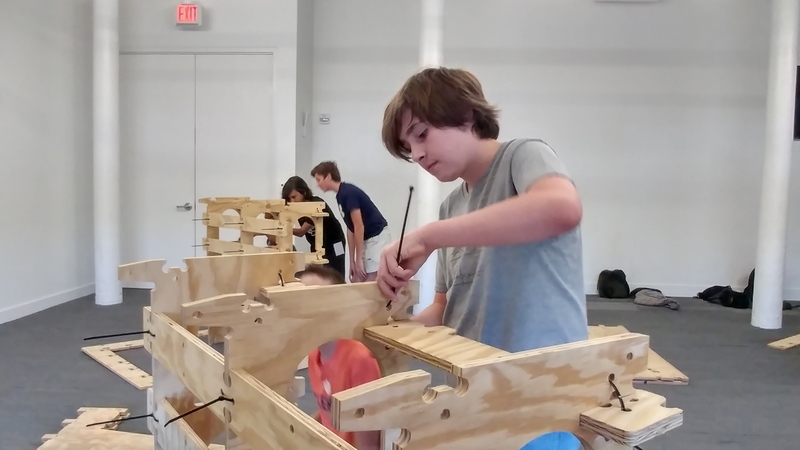 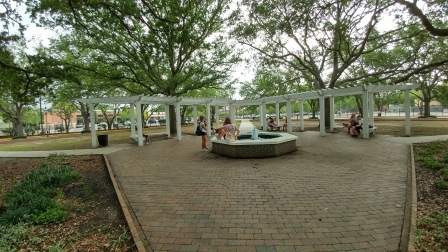 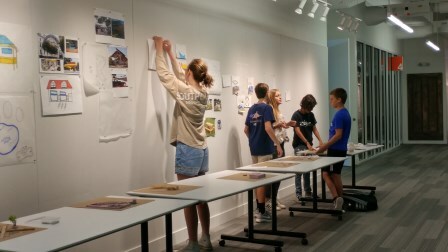 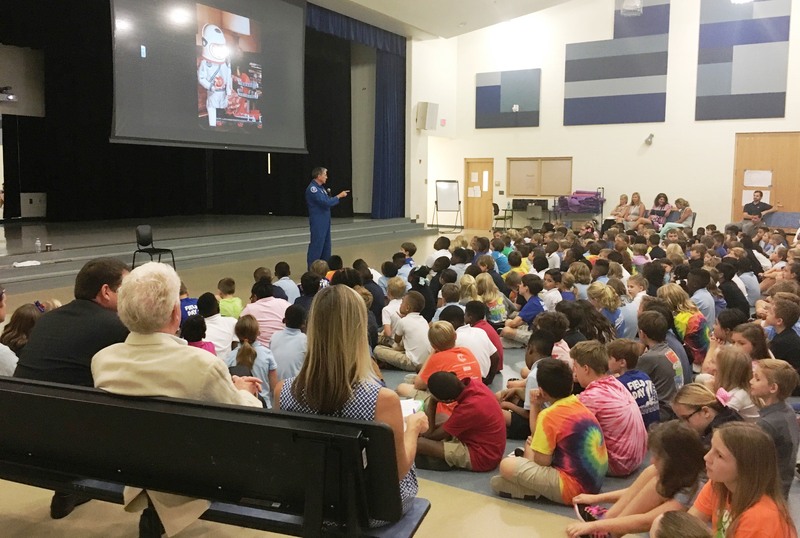 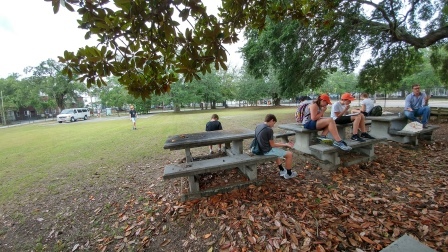 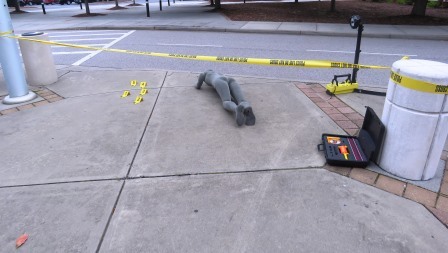 The camp was led by Clemson faculty member David Pastre, a licensed architect intimately familiar with architectural design in the Charleston region. 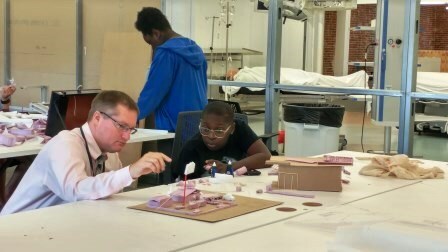 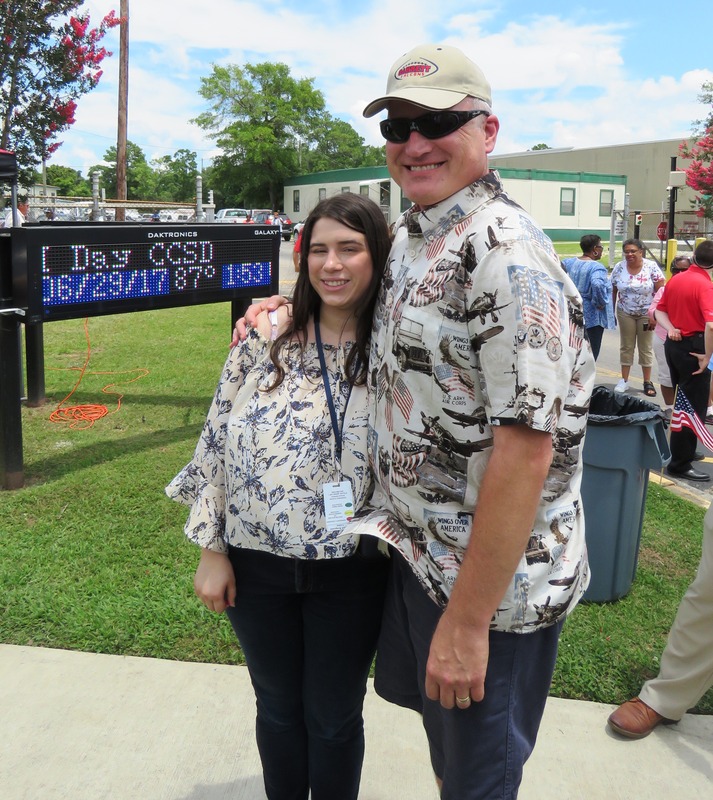 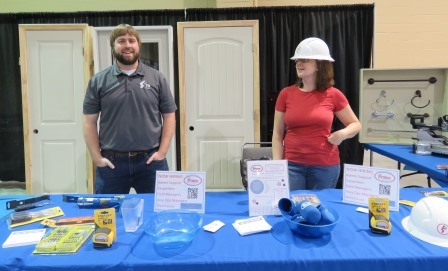 Ms. Roxann Phillips, the architecture instructor and CTE department chair at Garrett Academy of Technology also helped lead the week long camp. 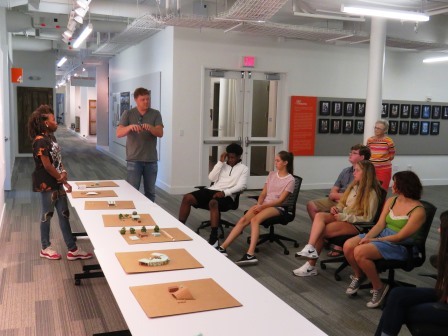 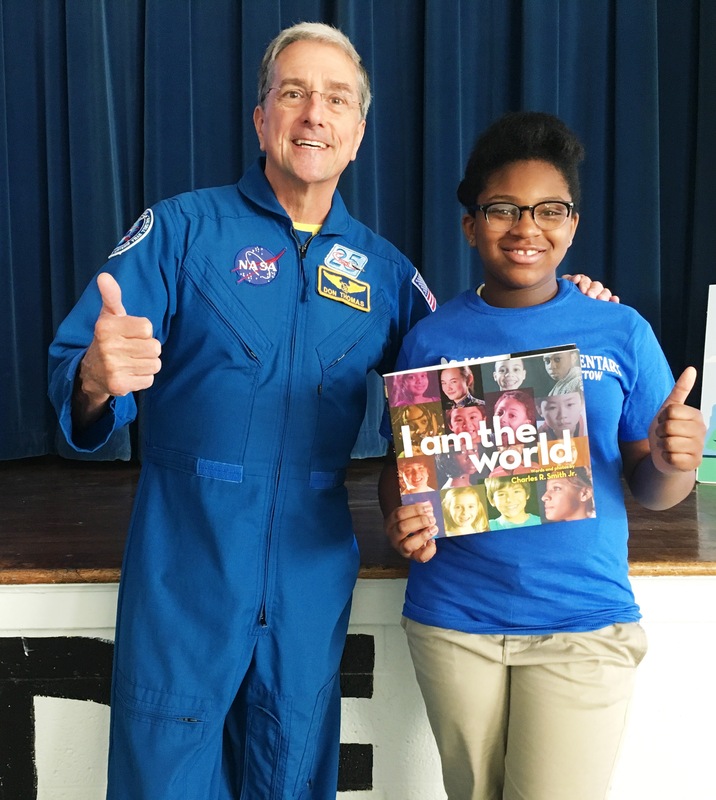 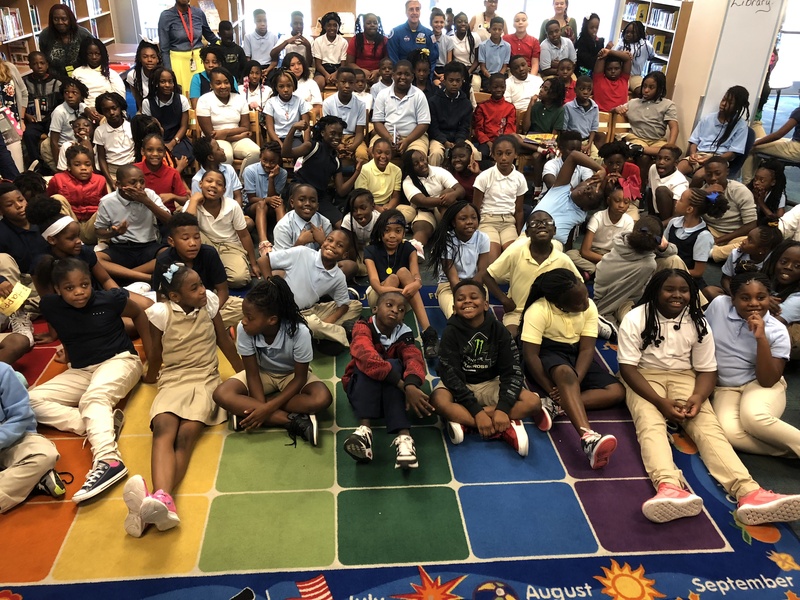 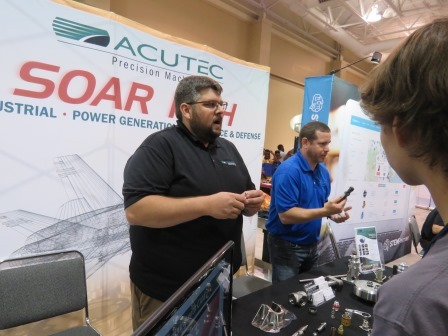 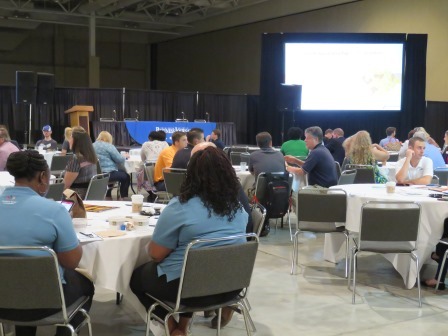 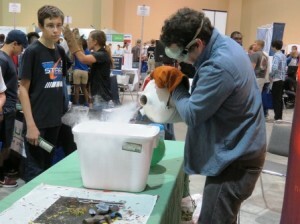 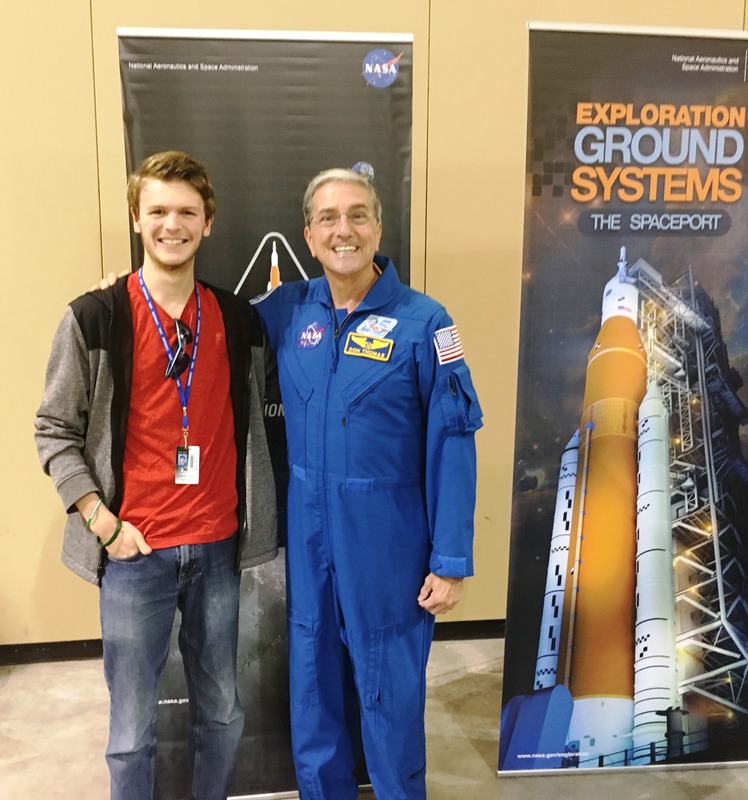 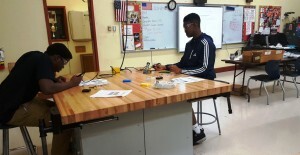 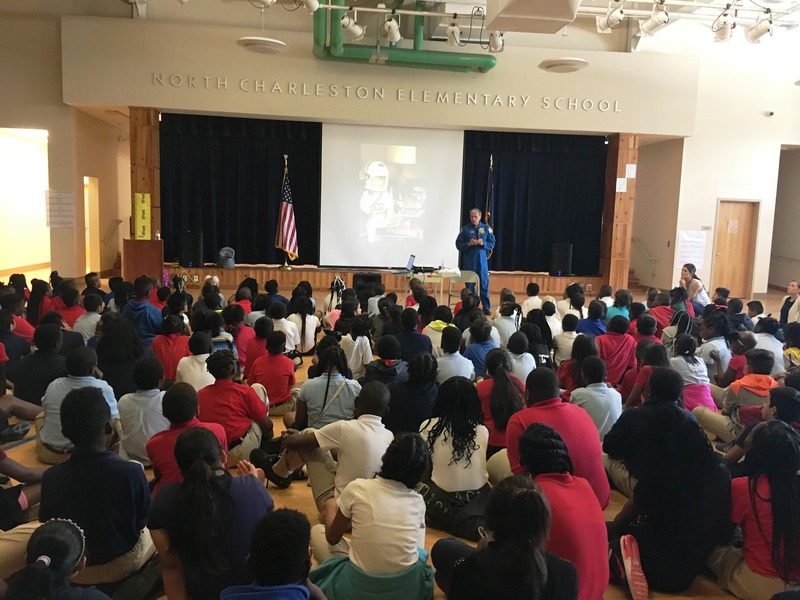 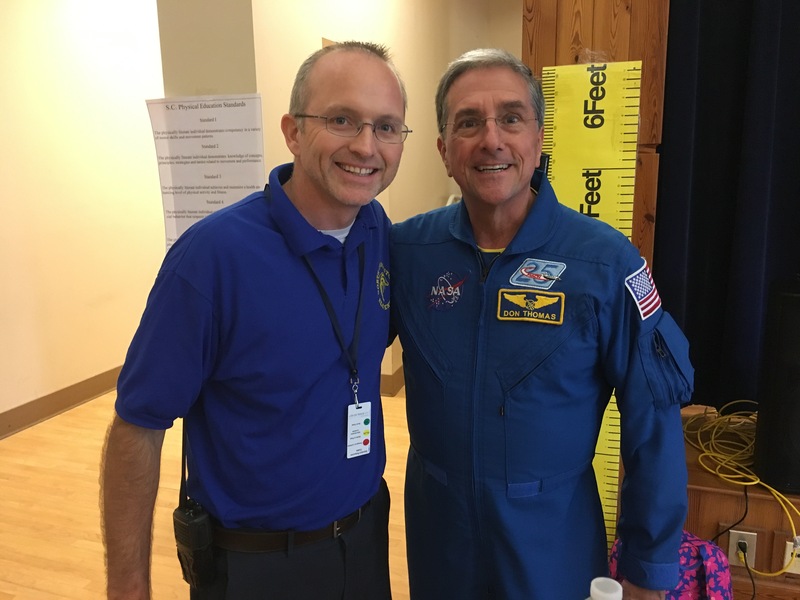 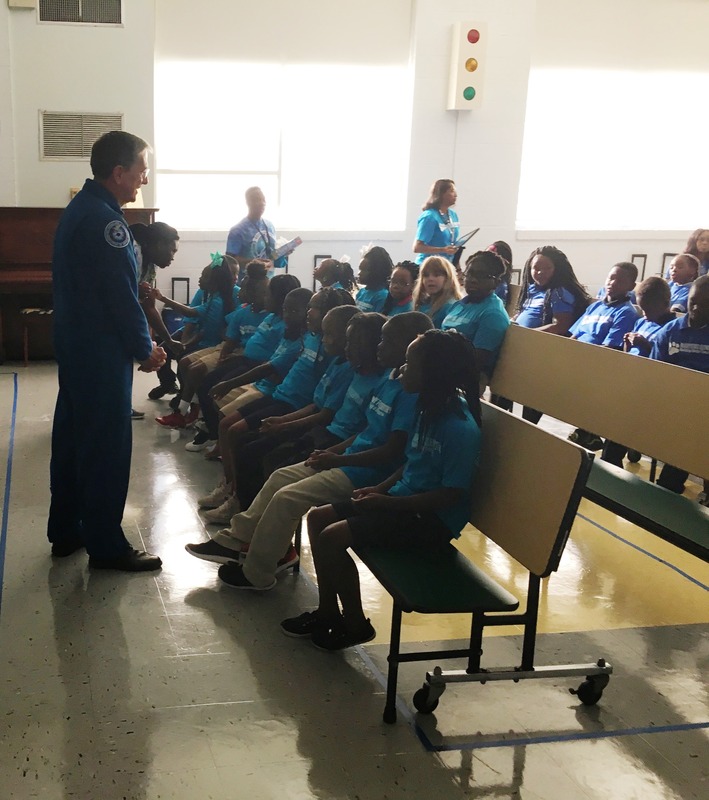 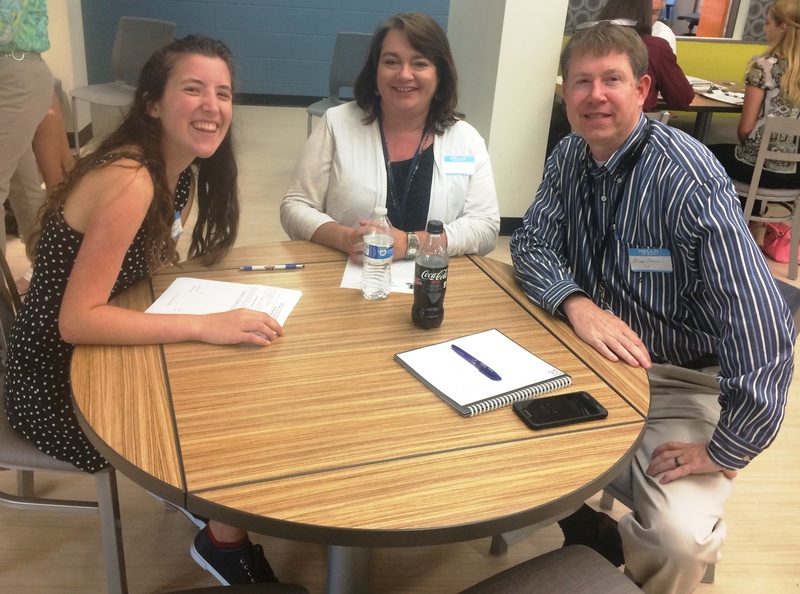 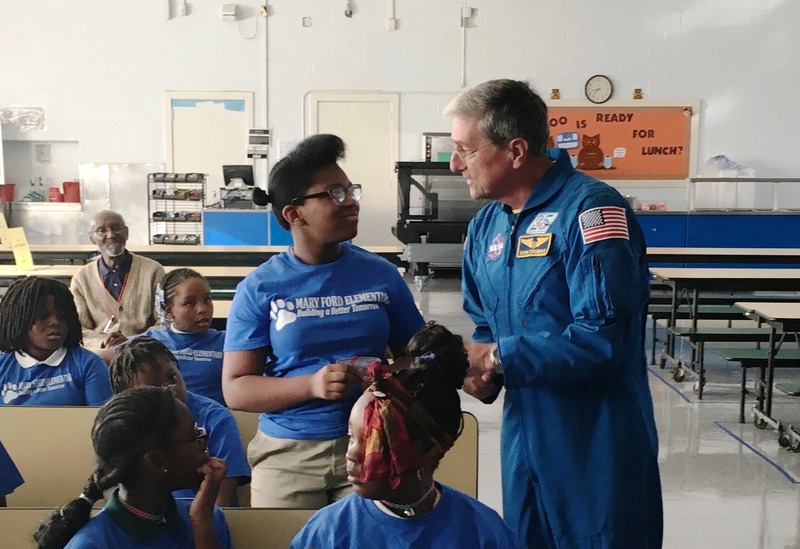 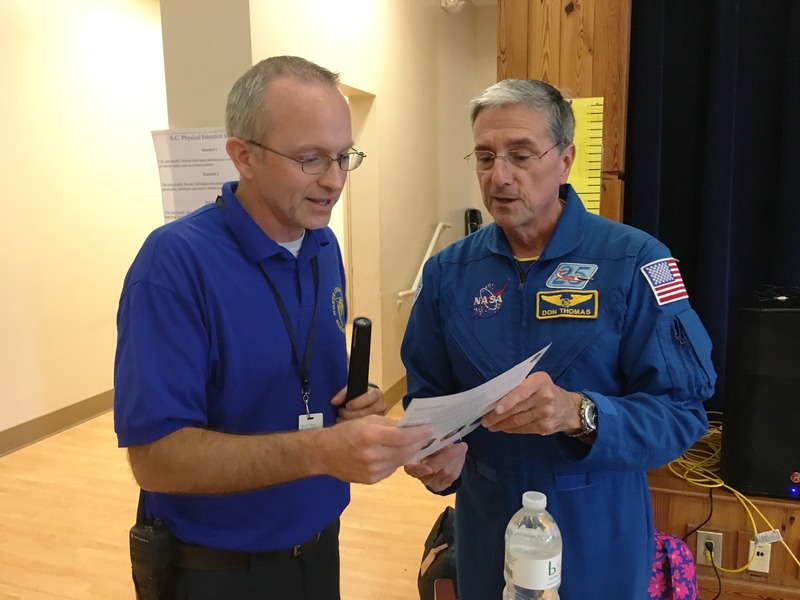 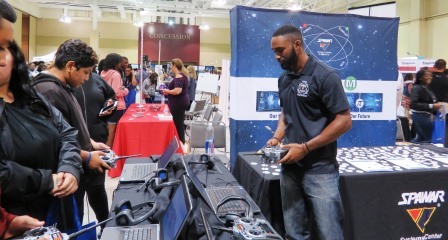 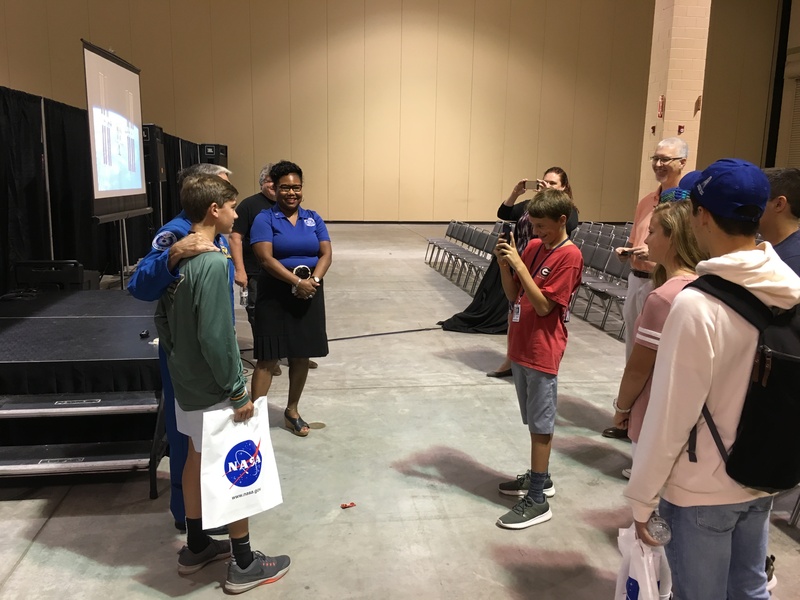 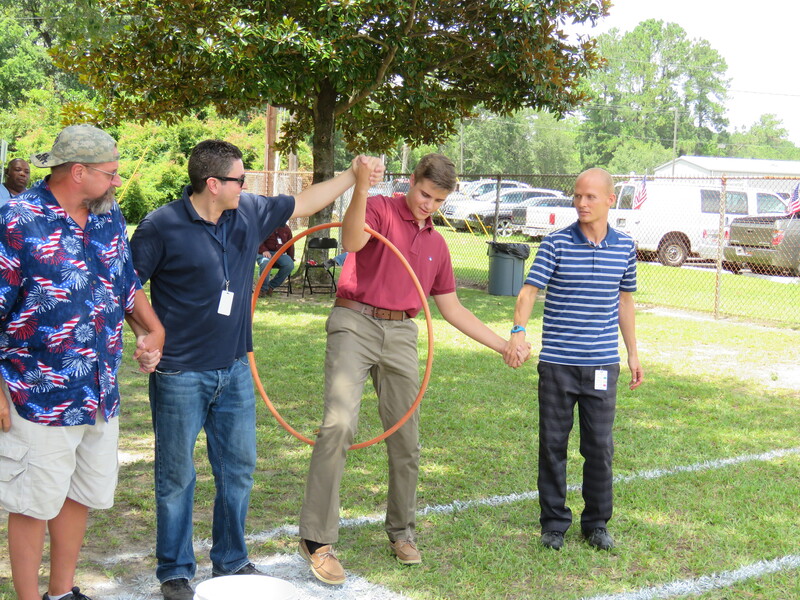 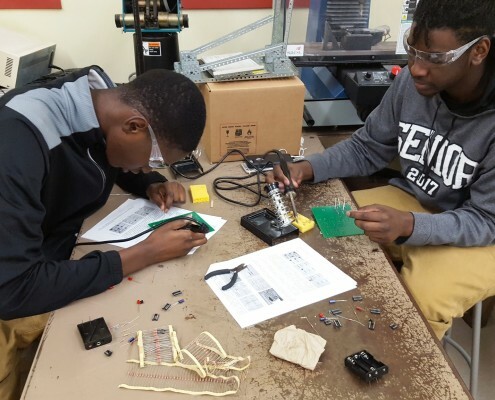 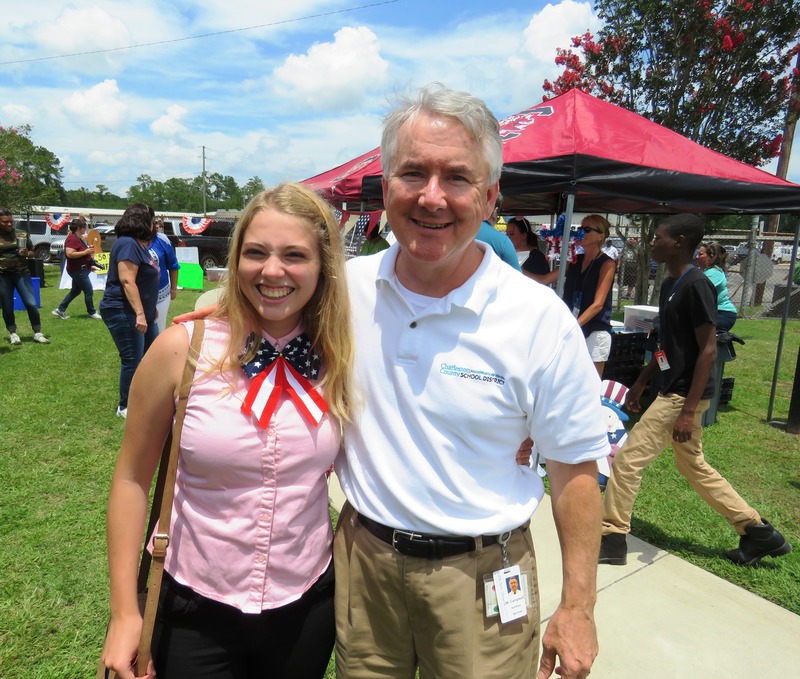 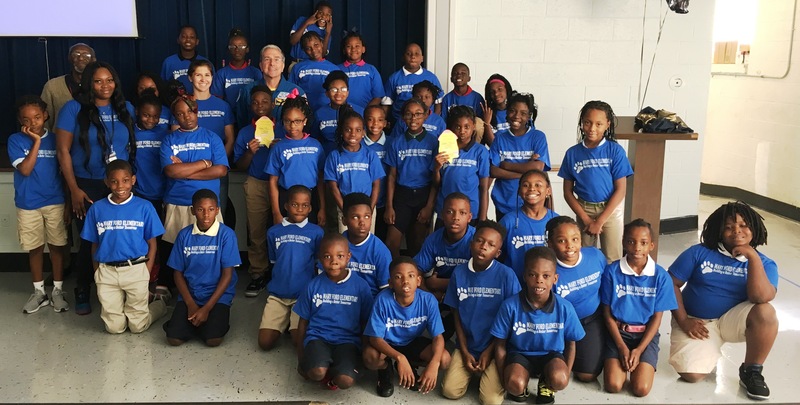 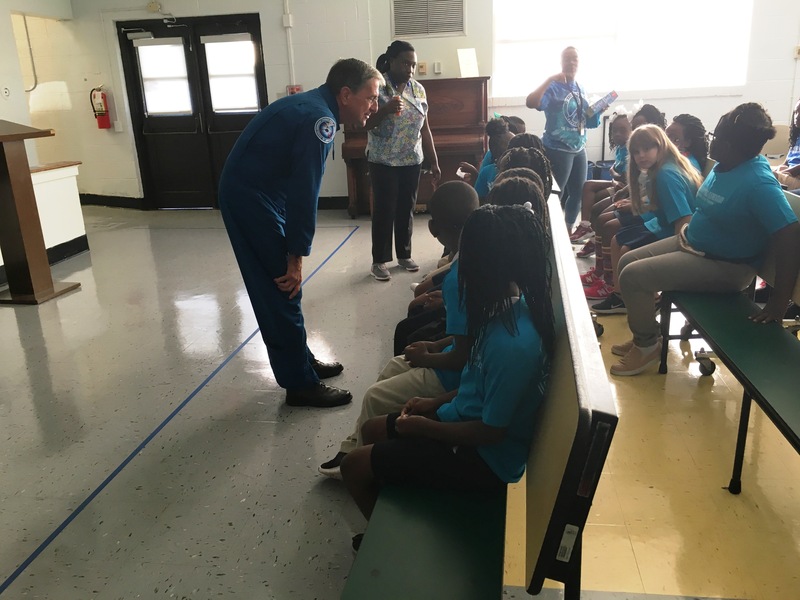 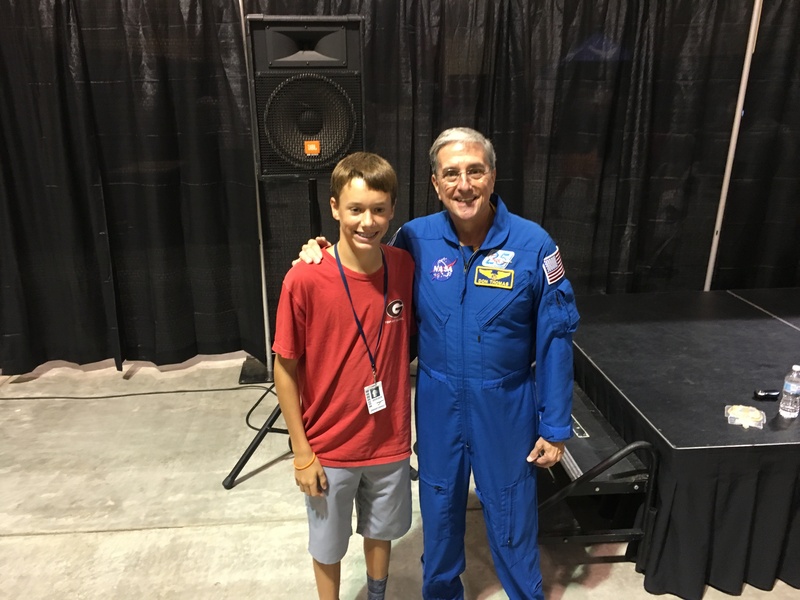 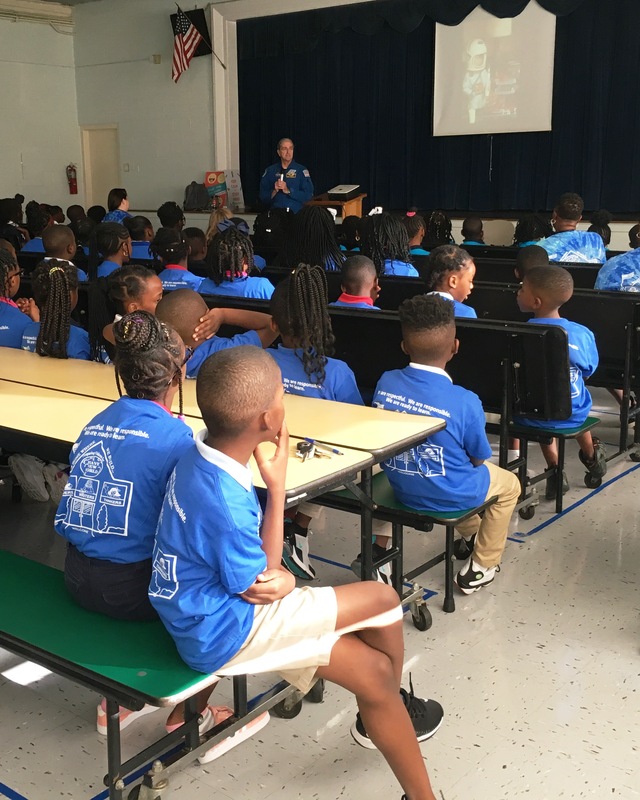 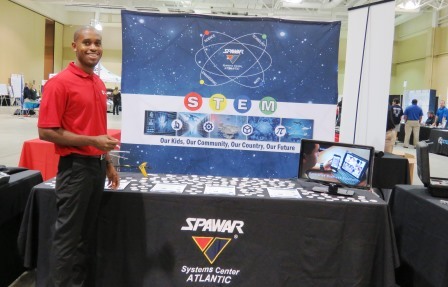 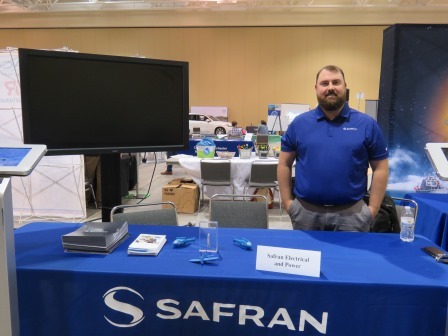 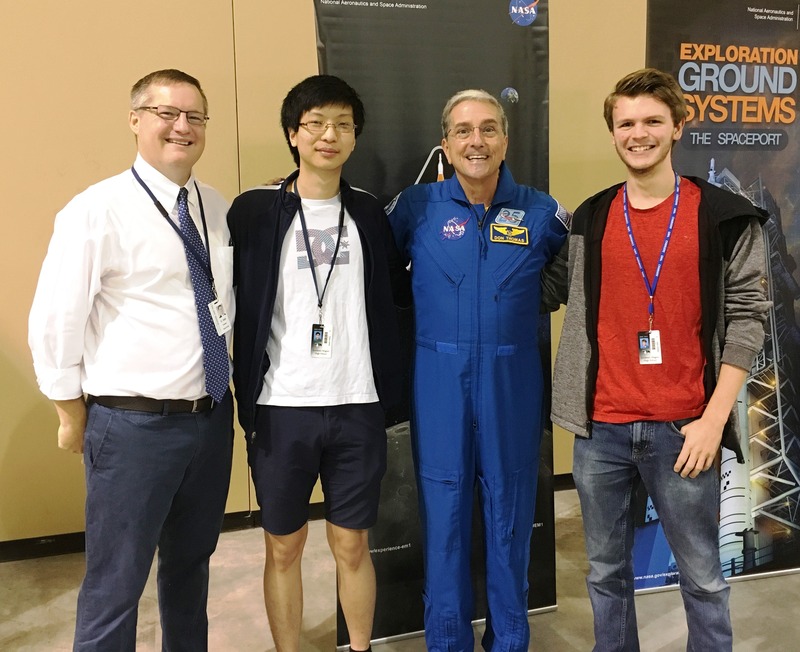 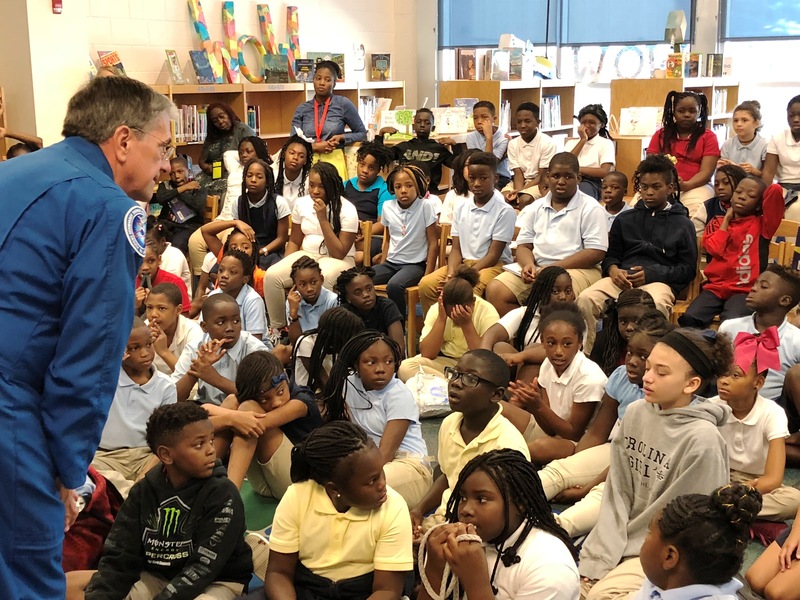 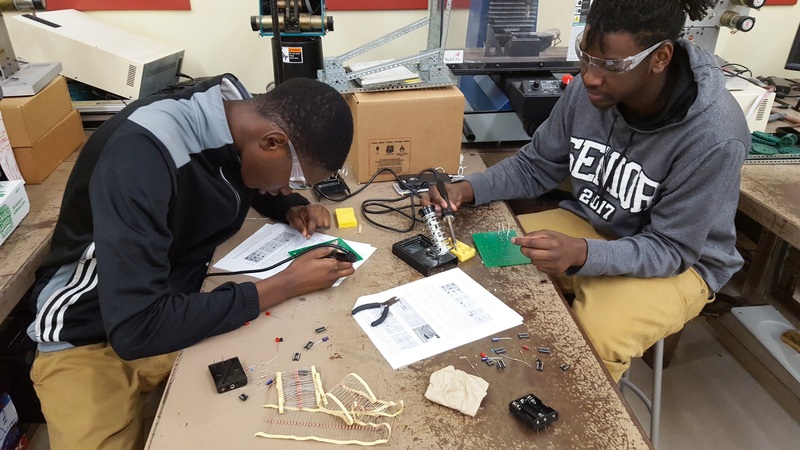 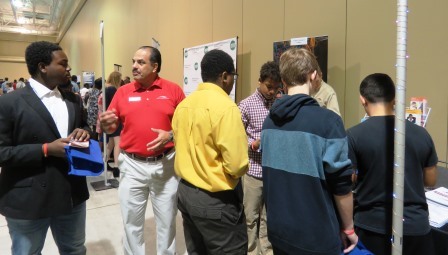 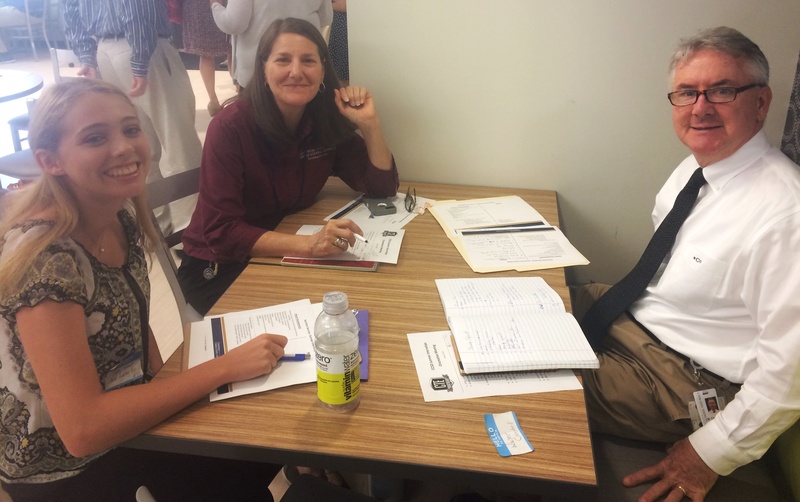 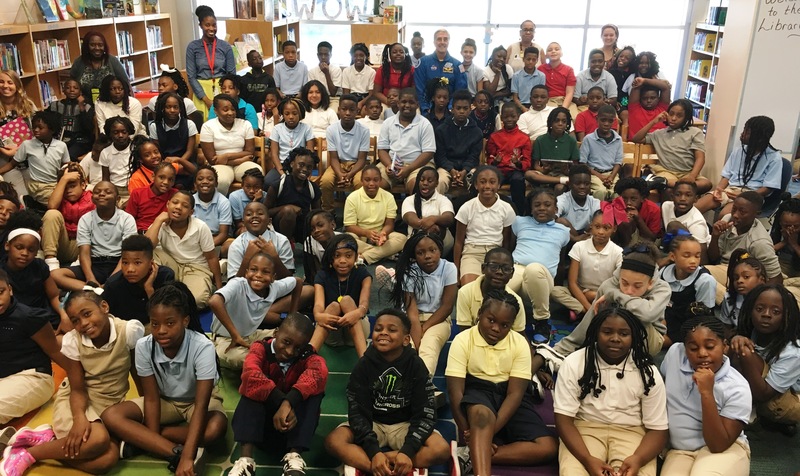 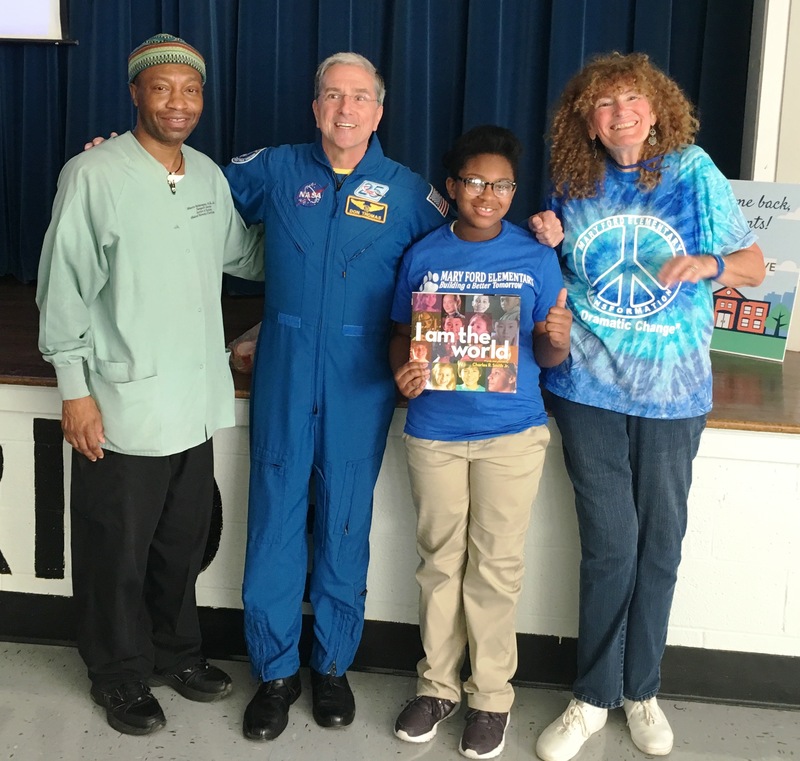 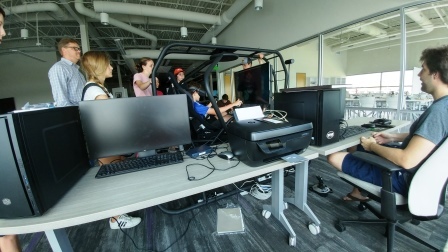 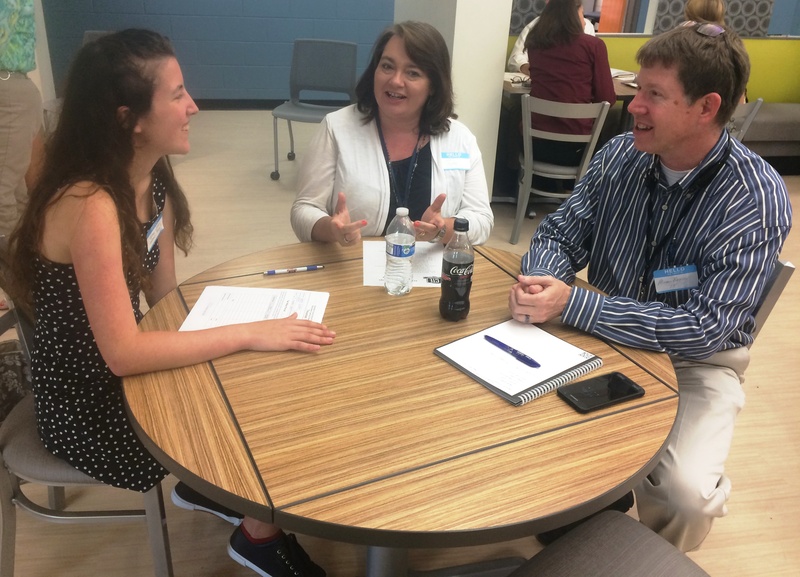 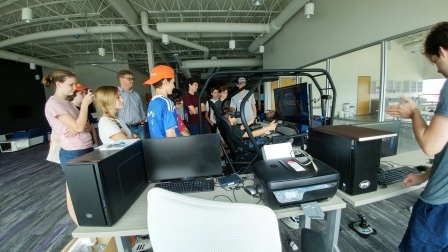 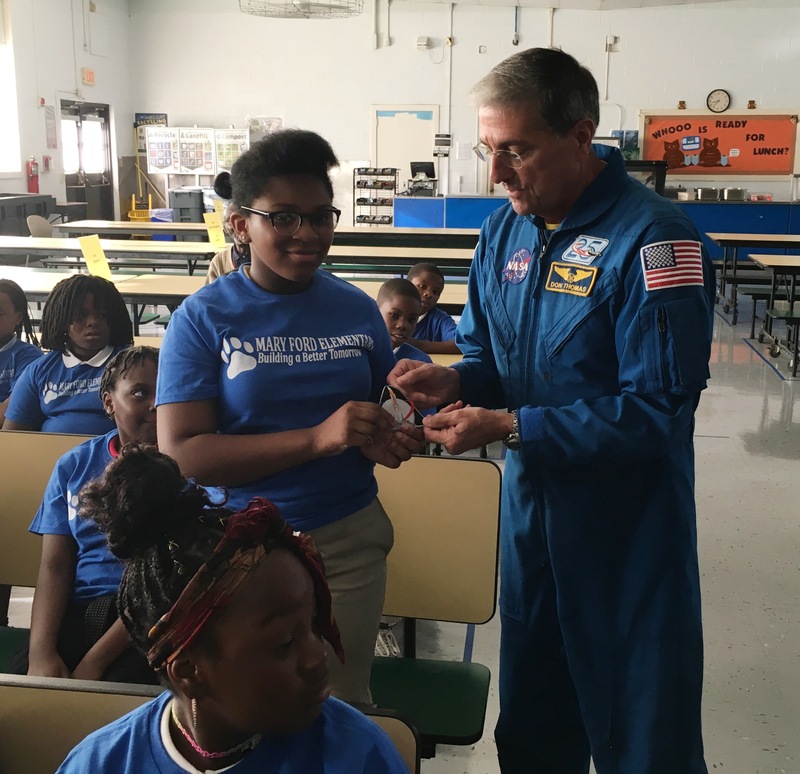 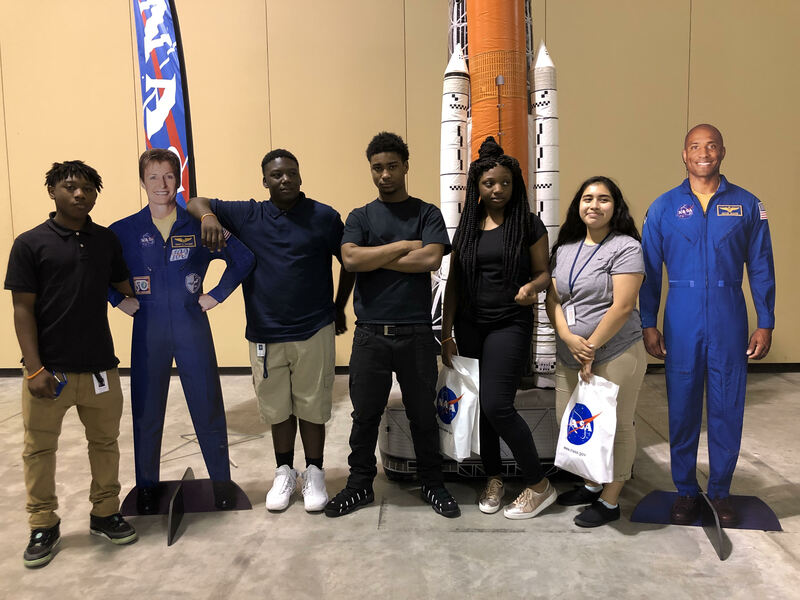 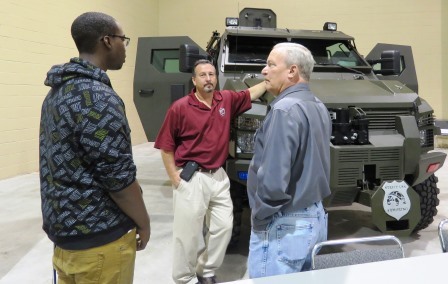 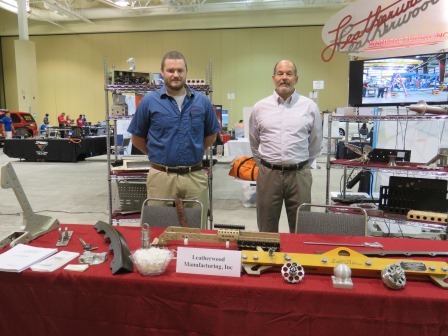 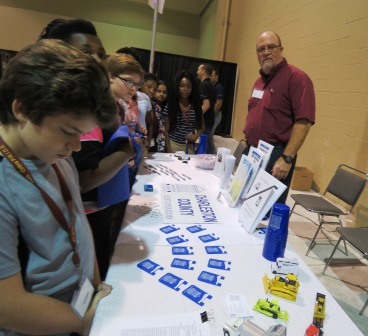 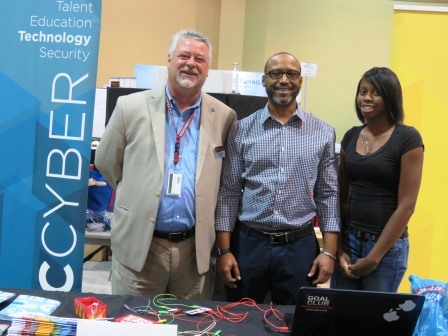 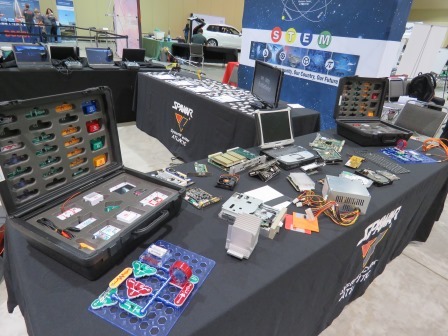 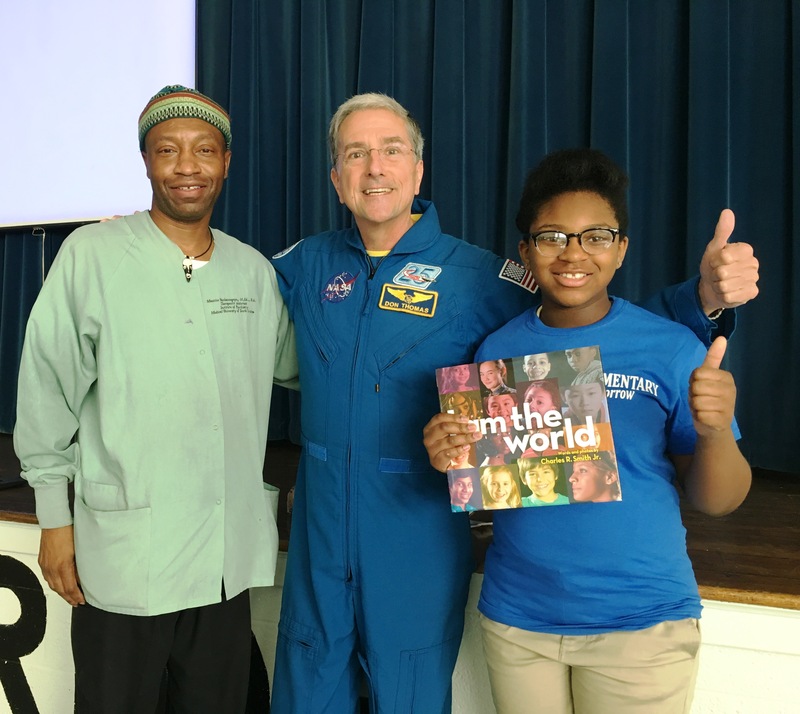 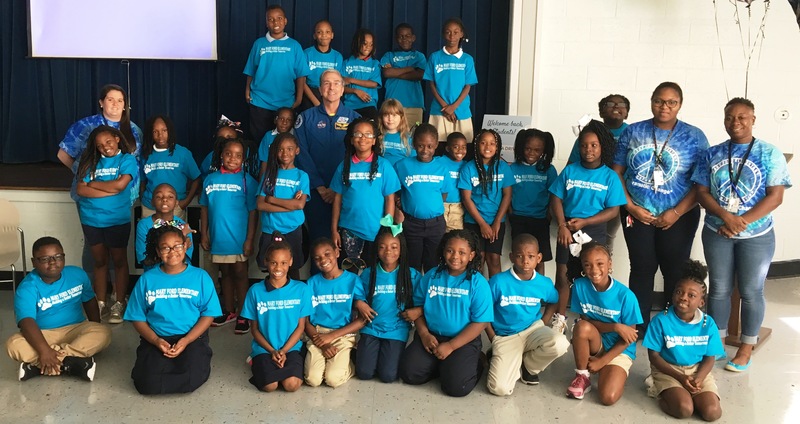 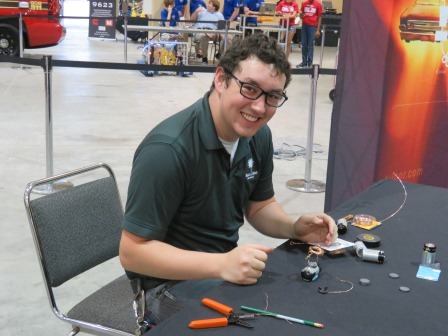 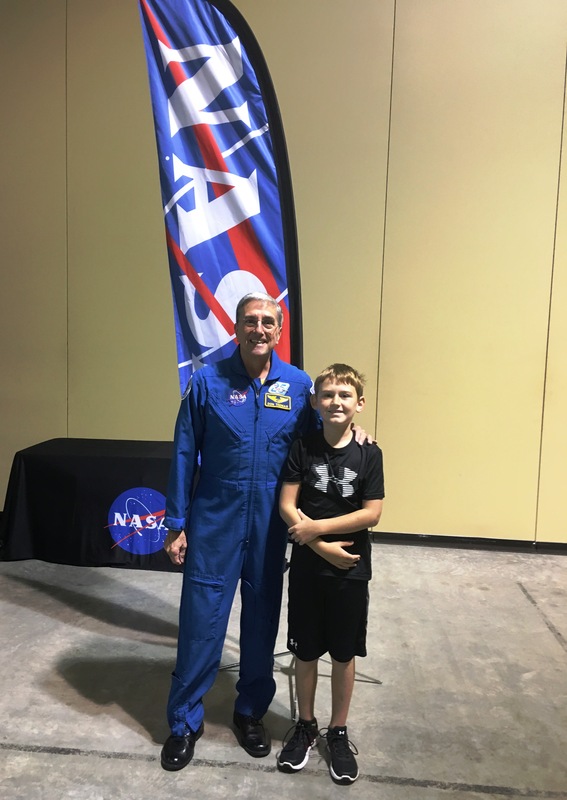 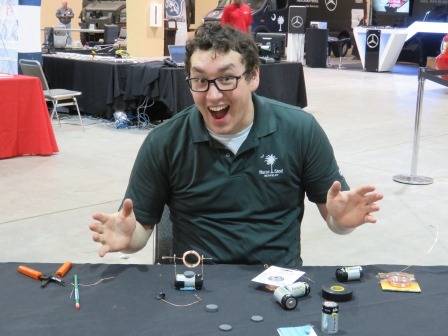 CAC.C director Ray Huff led the creation of this work-based learning career camp for students to learn and explore, and hopes to expand the opportunity next summer. 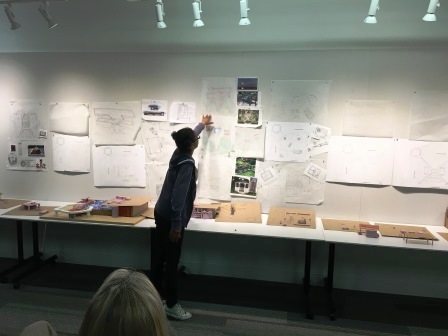 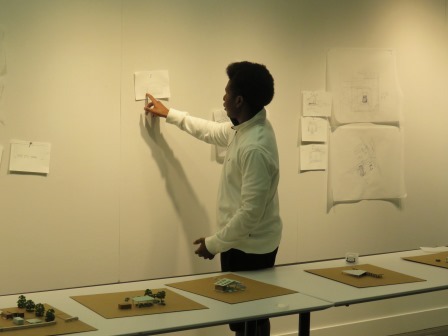 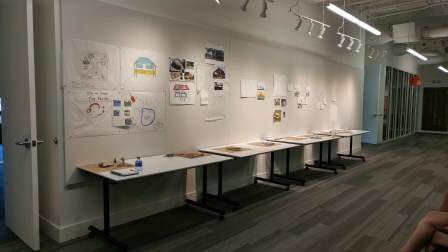 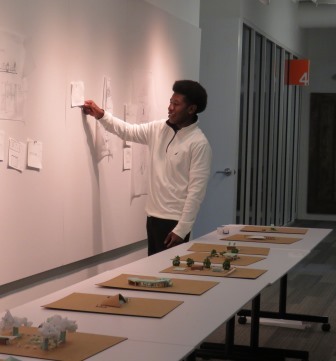 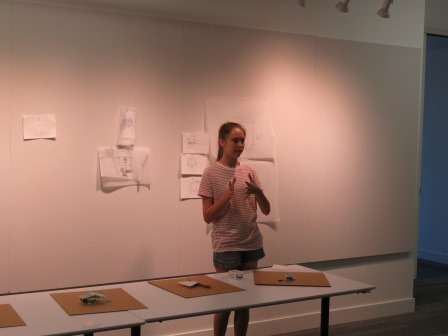 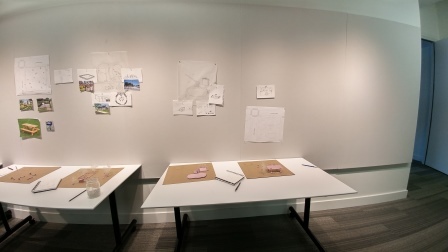 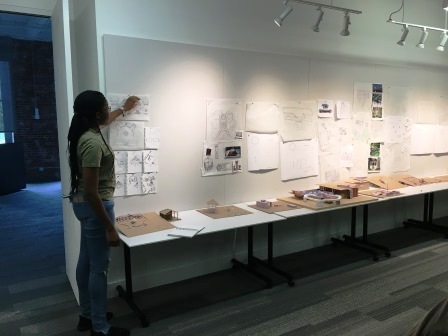 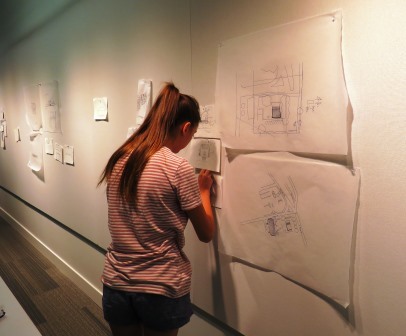 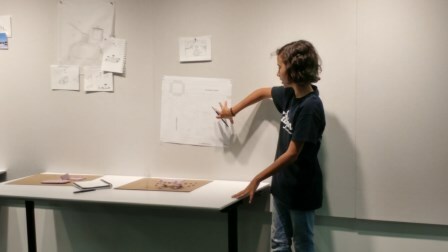 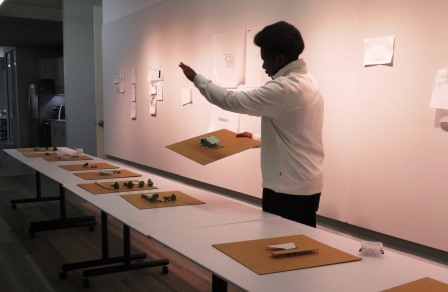 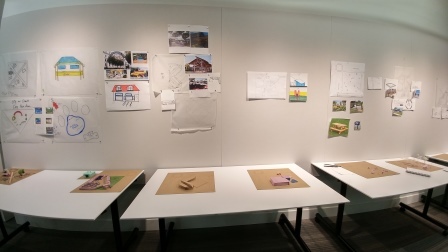 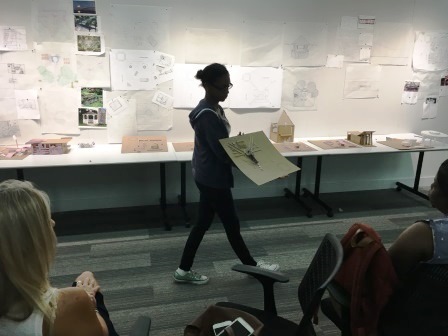 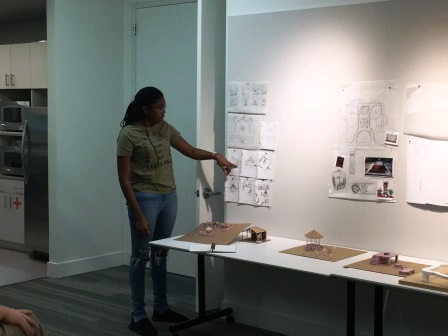 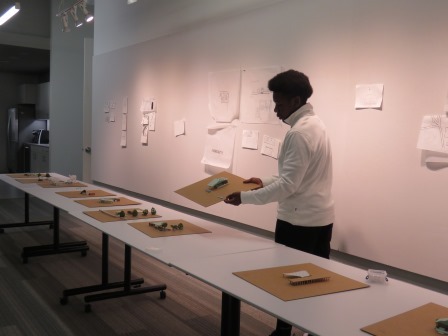 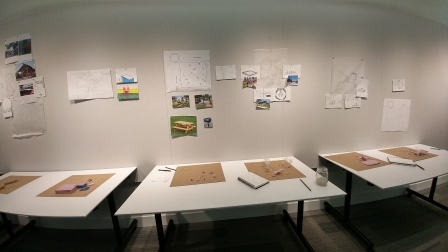 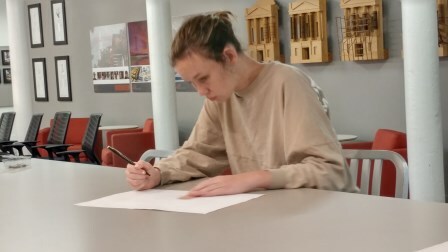 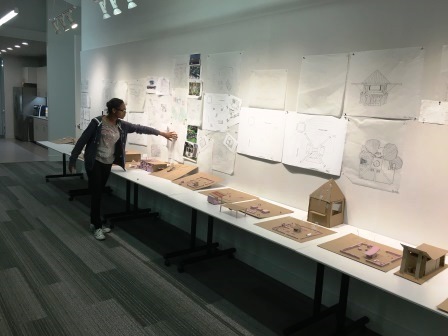 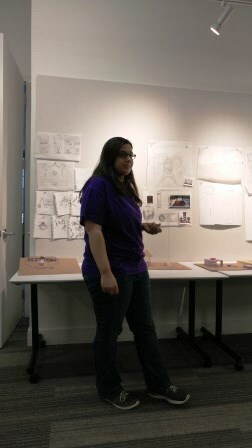 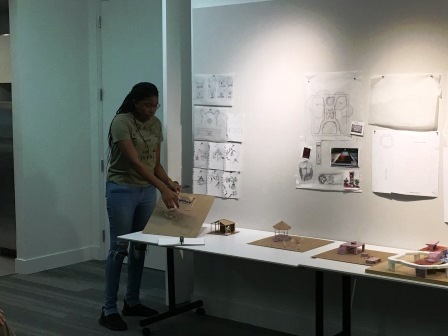 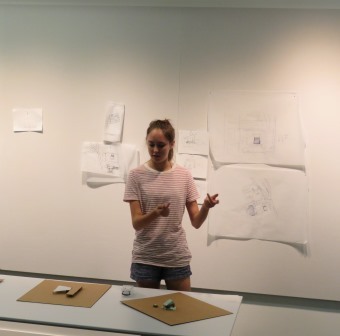 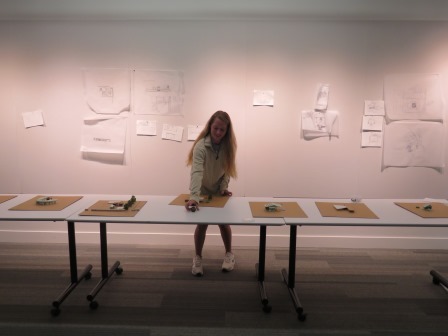 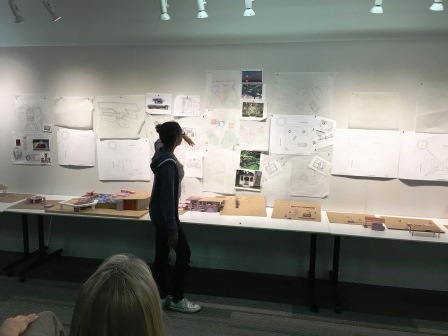 Students received introduction to drawing and modeling methods, and explored the nature of scale, rhythm, proportion, context, and functional elements of architecture. 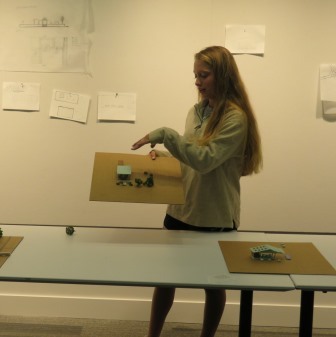 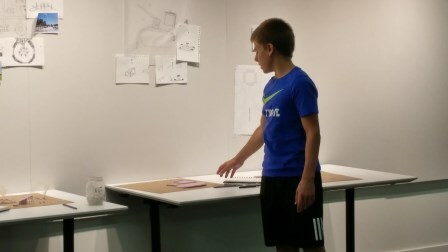 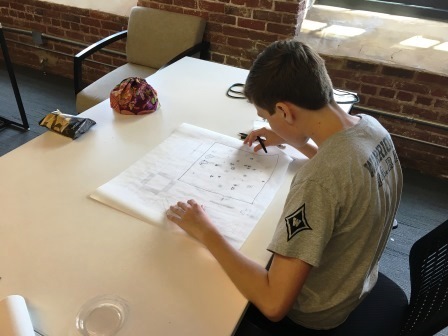 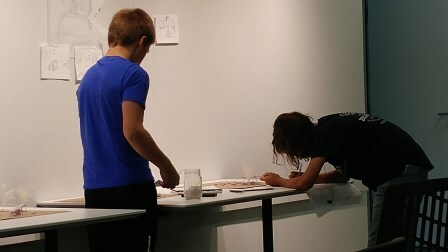 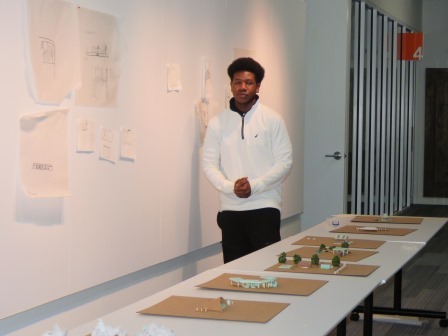 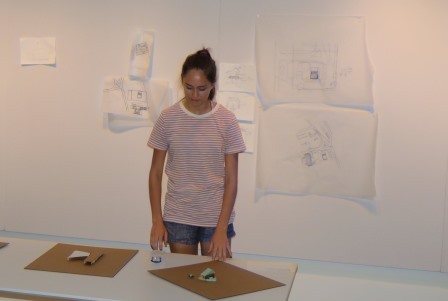 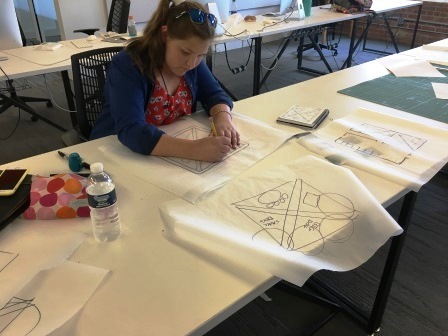 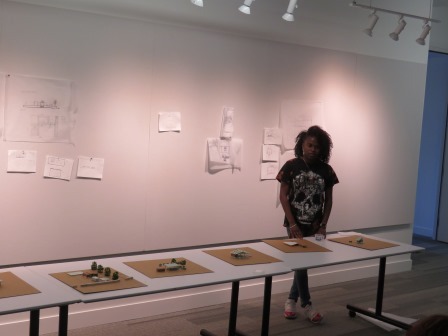 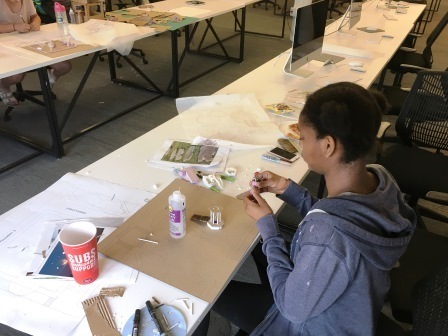 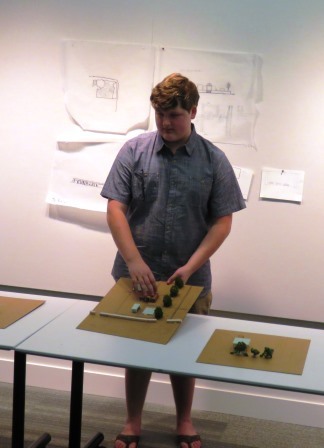 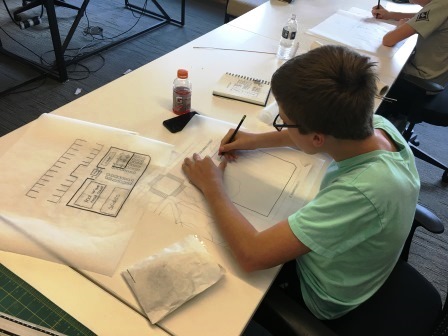 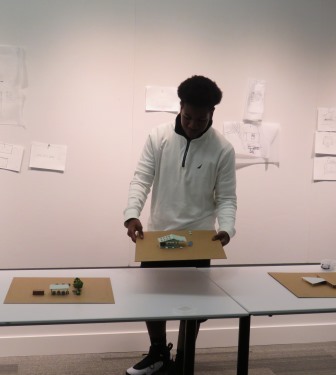 Students were engaged in sketching, dimensional drawing architectural analogues, modeling both full size and scale modeling, and other exciting project-based learning opportunities throughout the camp hours, 8am to 1pm. 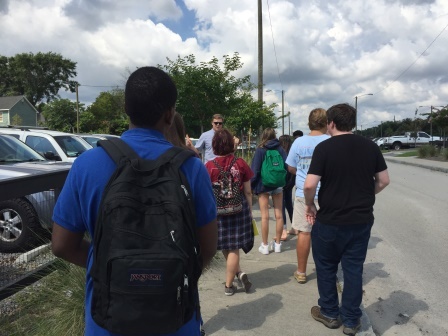 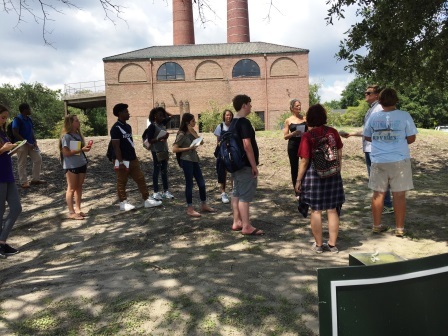 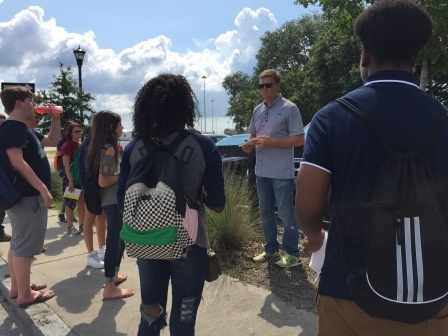 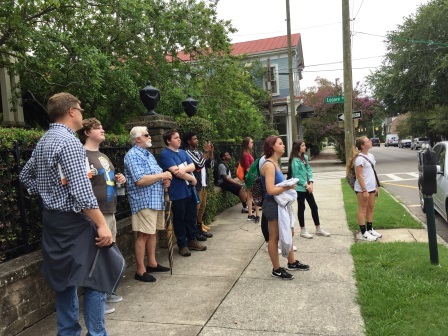 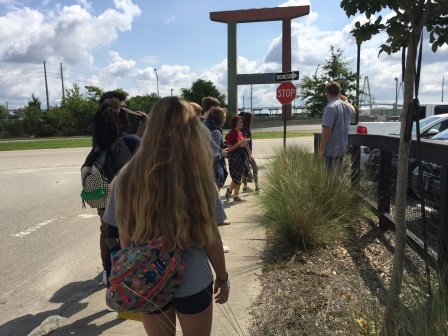 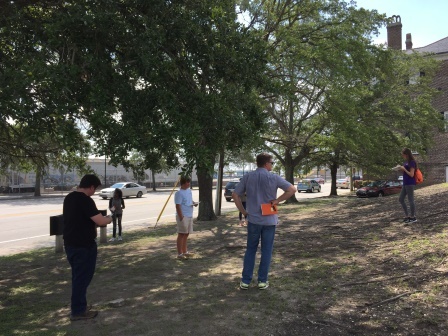 A downtown walking tour led by Robert Stockton allowed the students to see many historically significant buildings through an architectural lens. 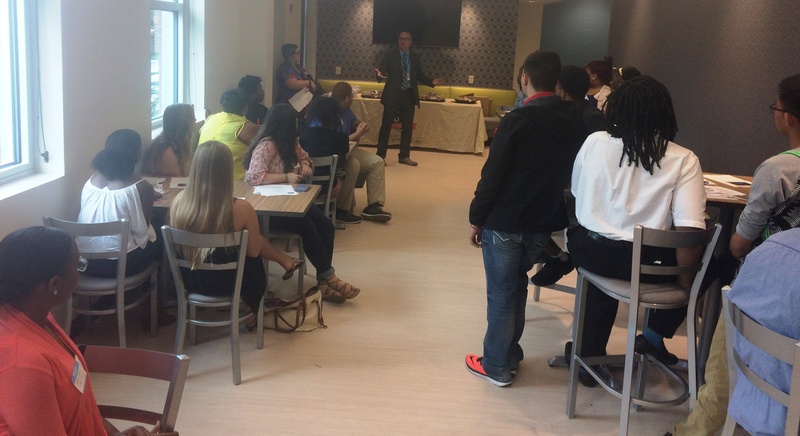 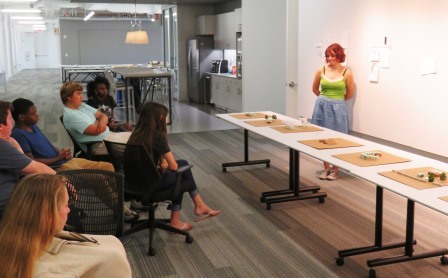 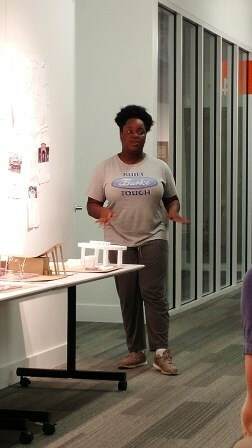 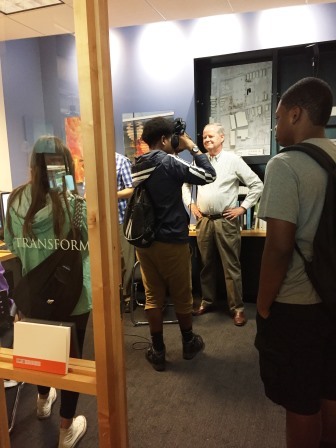 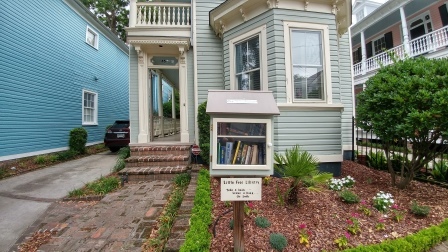 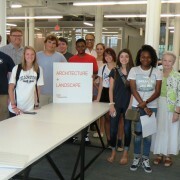 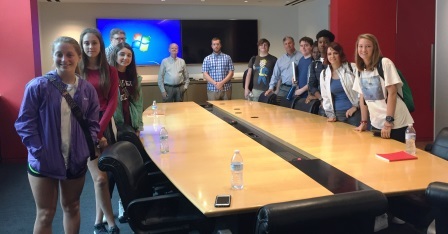 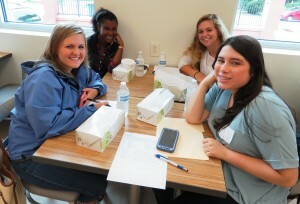 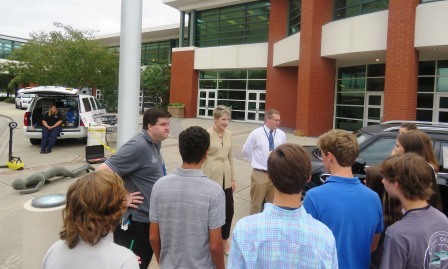 Students also visited local architecture firm LS3P’s Charleston offices and met with working professionals. 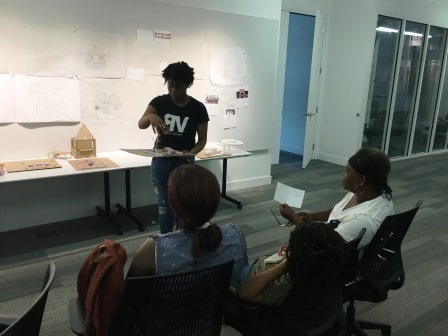 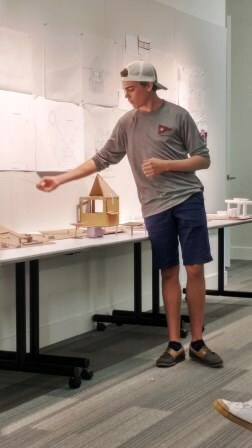 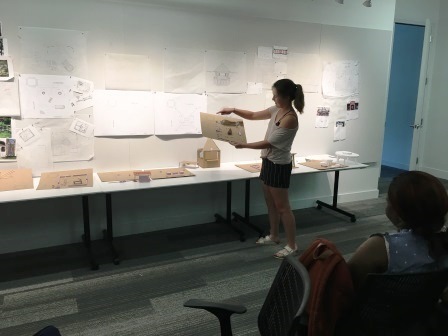 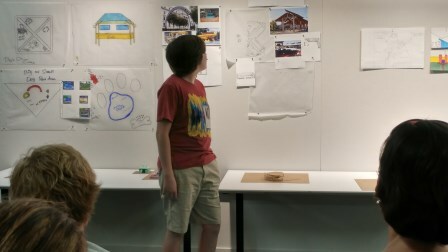 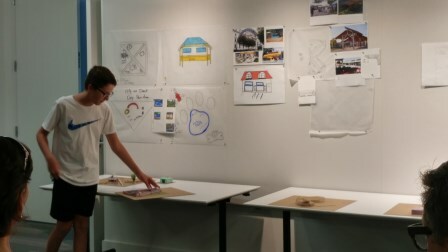 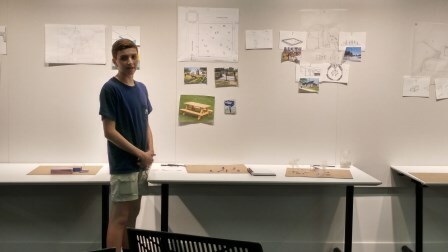 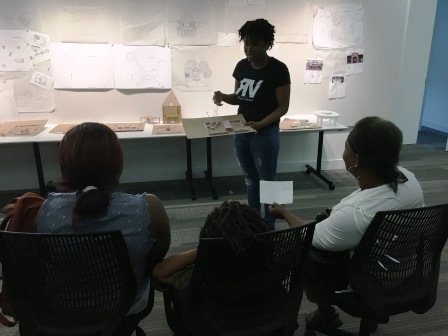 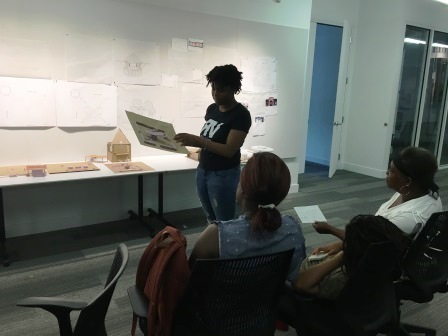 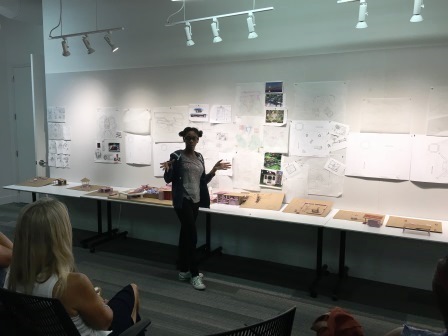 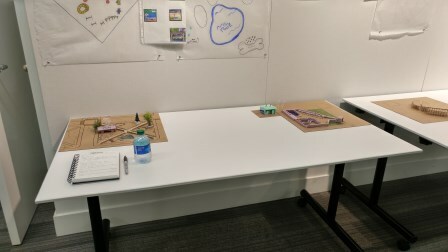 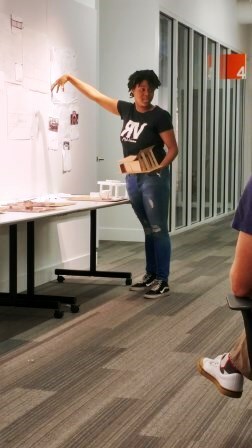 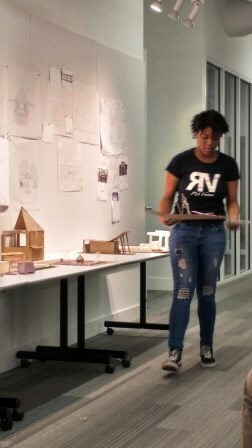 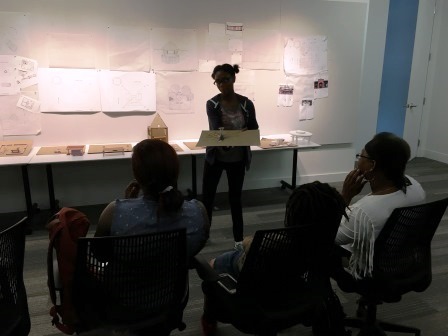 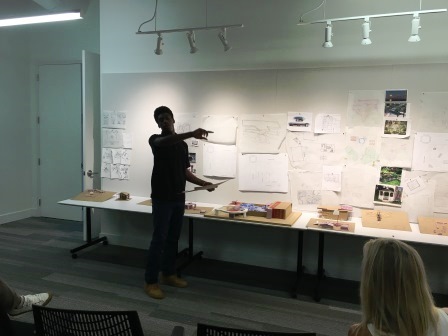 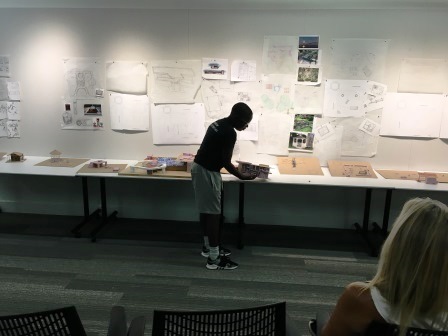 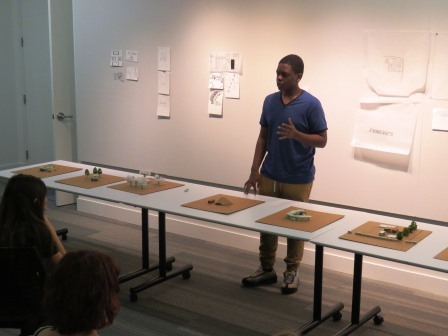 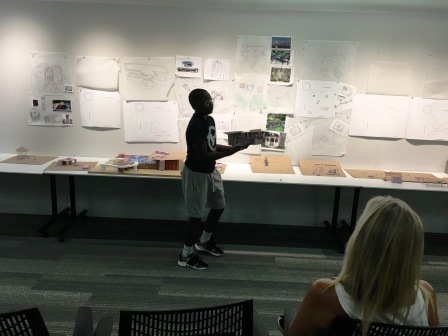 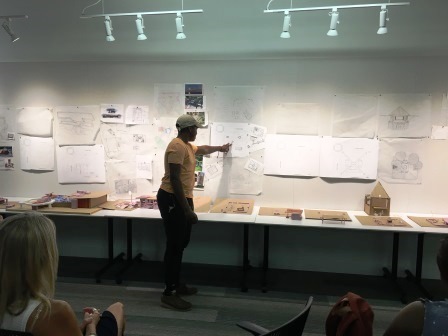 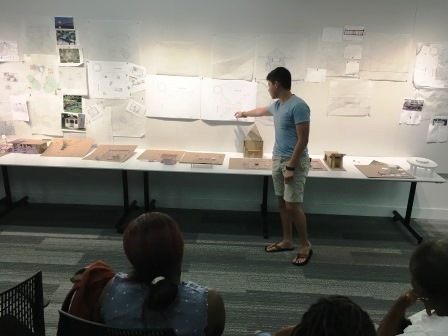 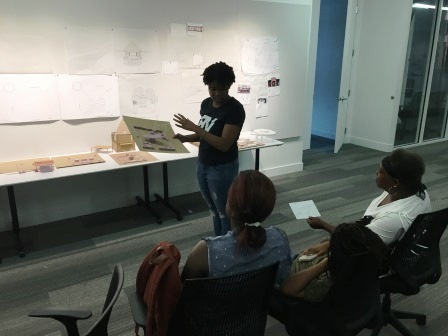 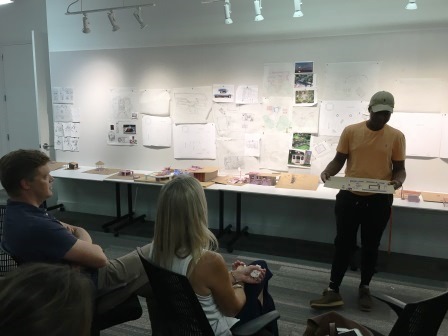 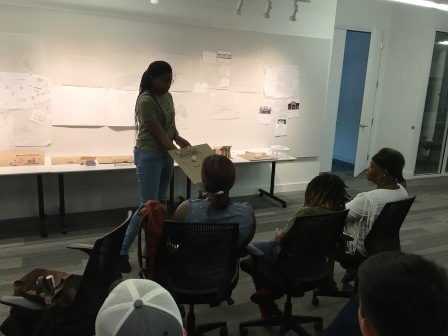 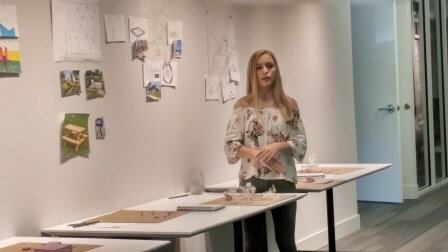 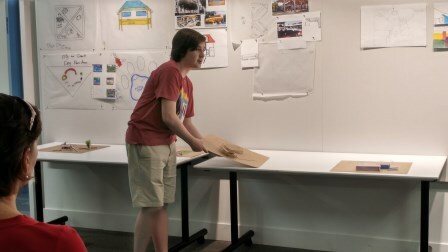 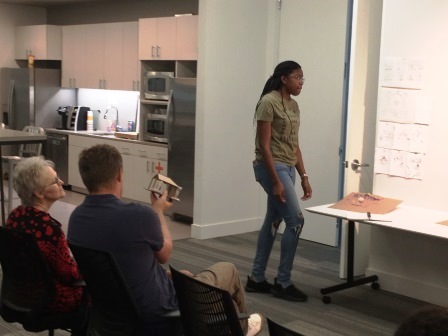 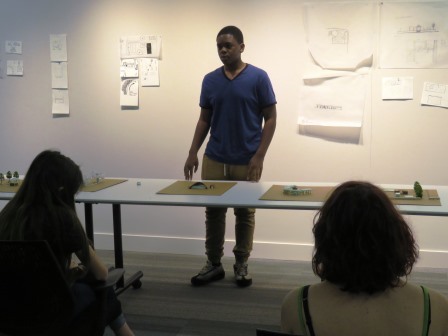 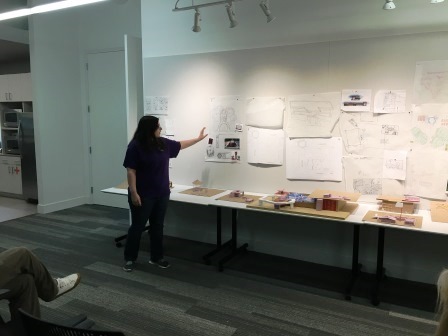 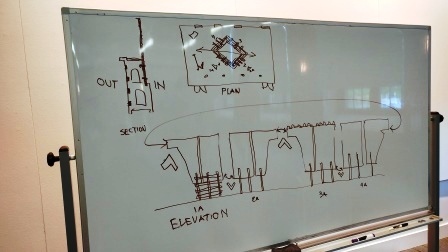 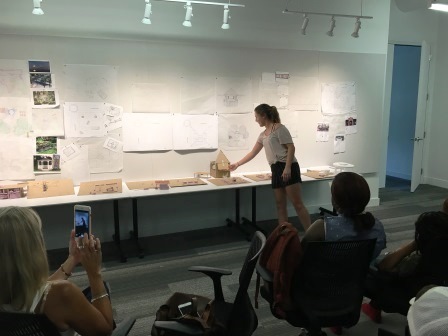 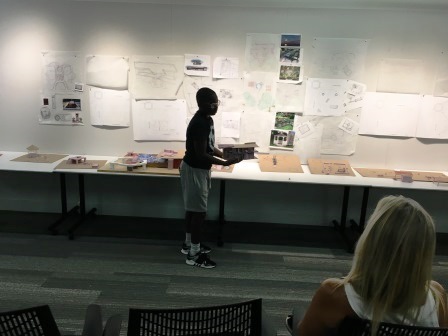 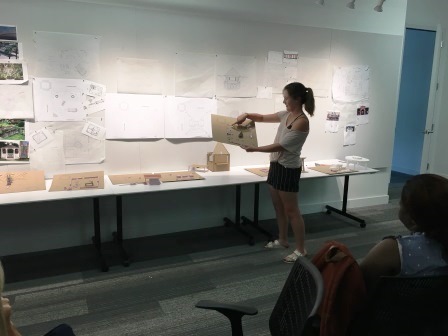 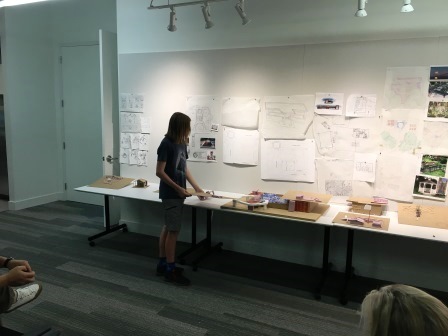 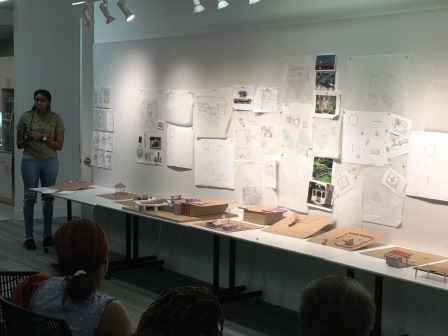 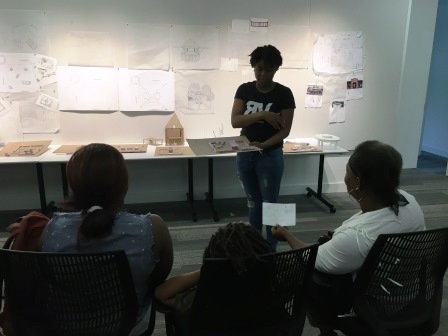 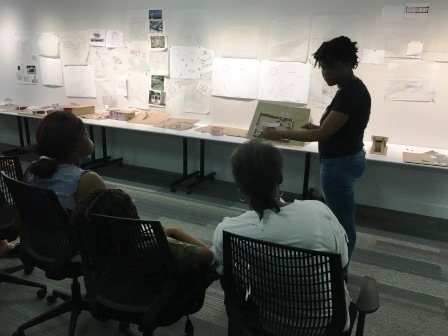 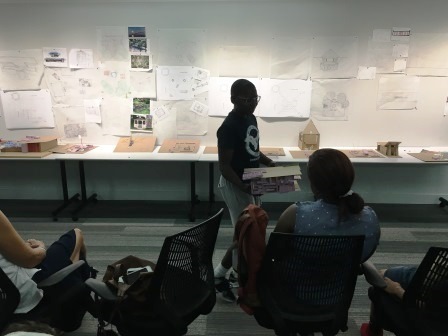 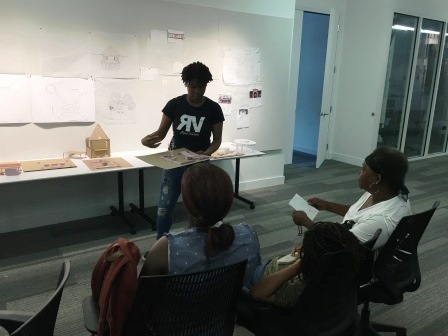 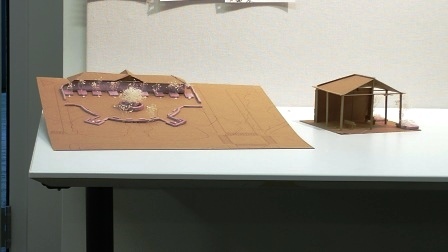 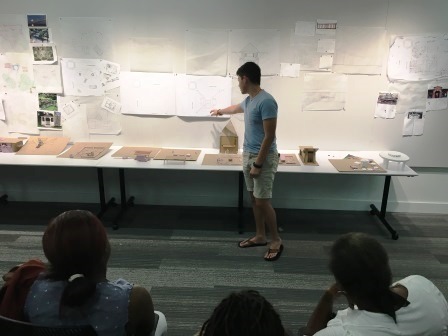 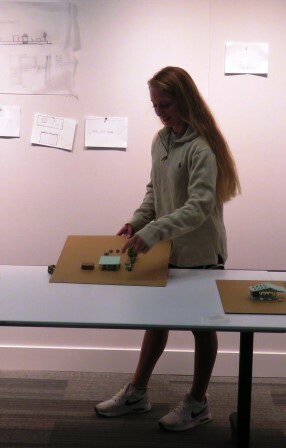 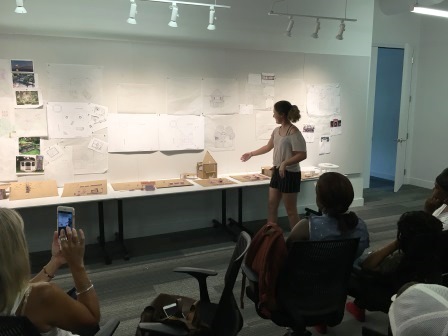 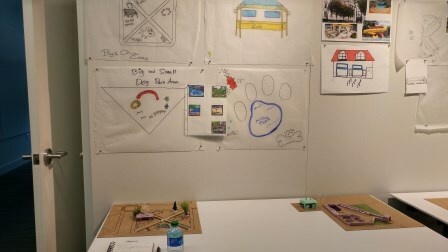 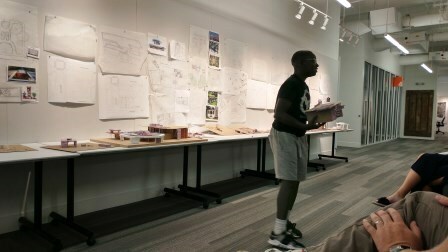 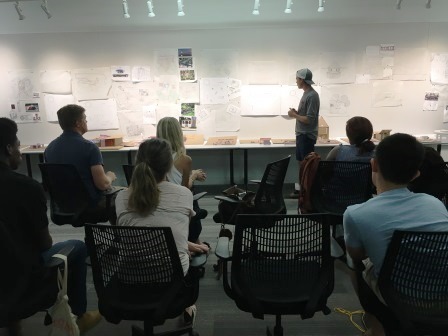 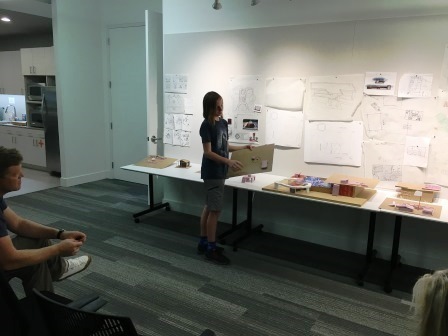 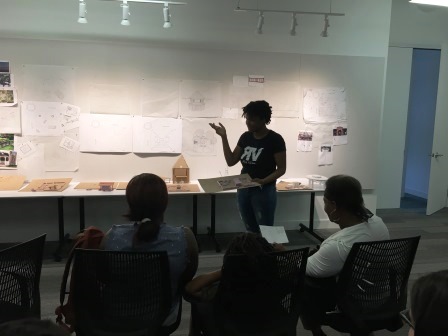 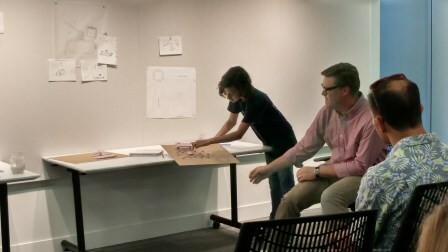 On the last day of the camp, students presented their designs for a very special project to be located not far from the building that hosted their camp. 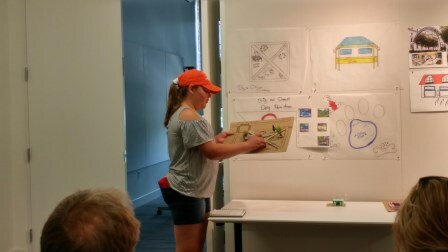 They showed off their ideas for a park and shelter that would serve as a trail-head of sorts for people walking the Ravenel Bridge. 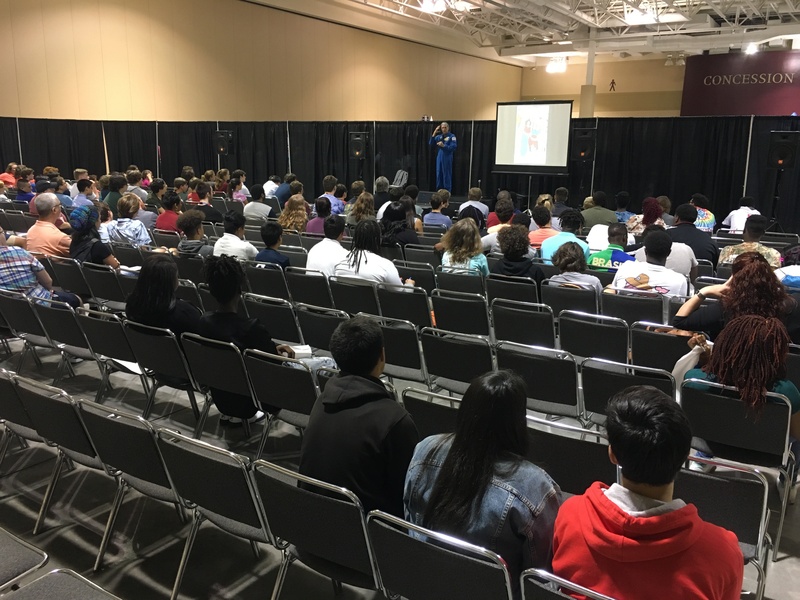 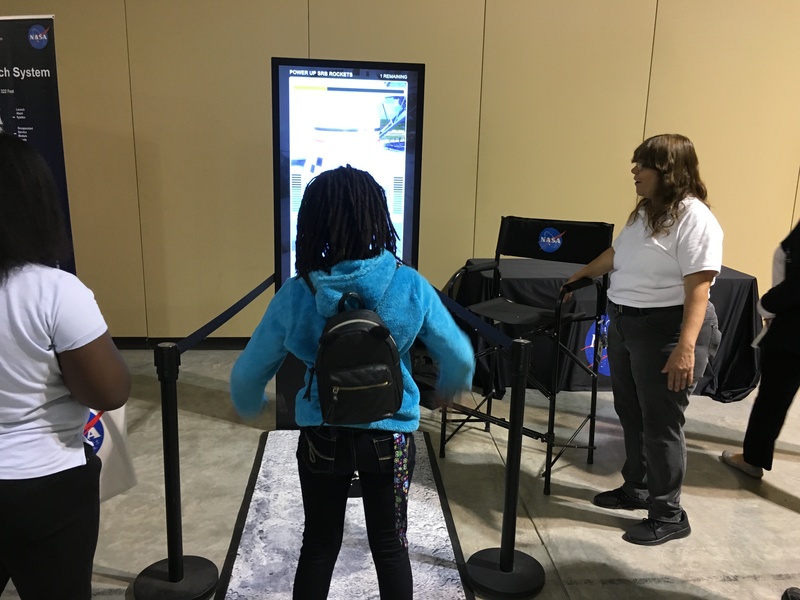 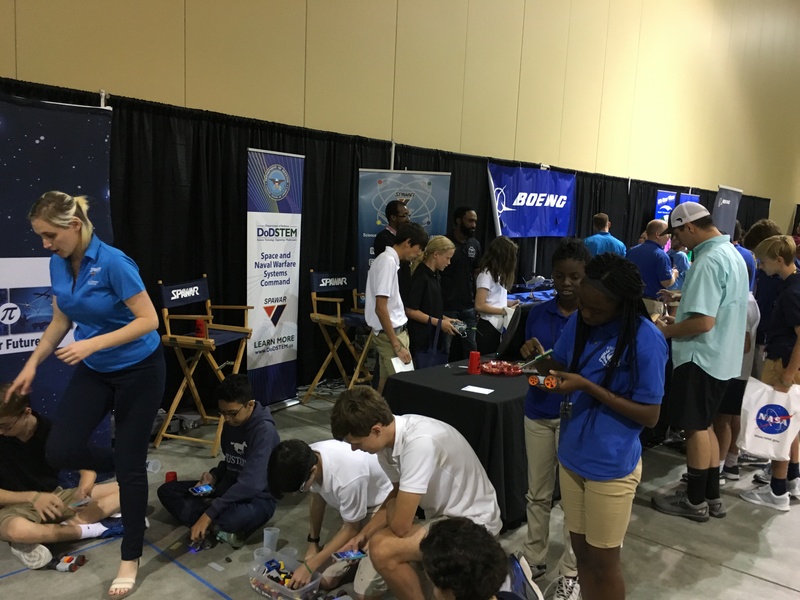 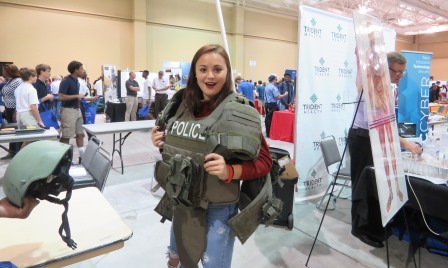 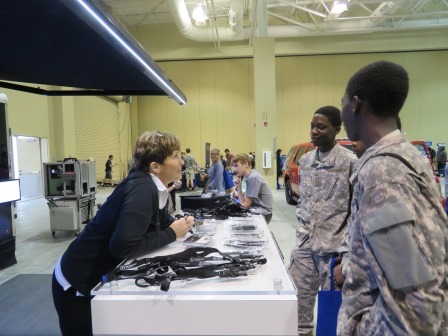 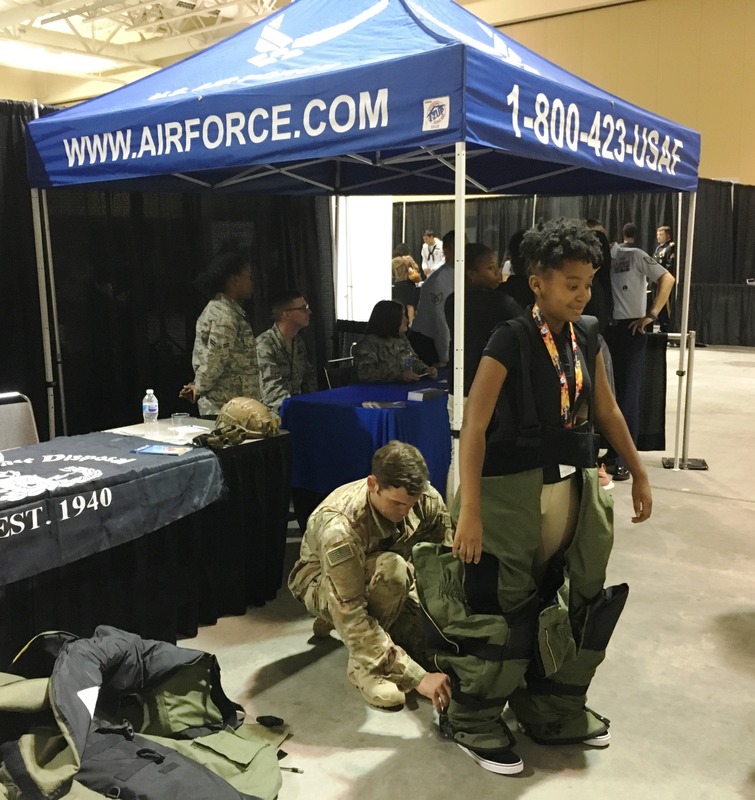 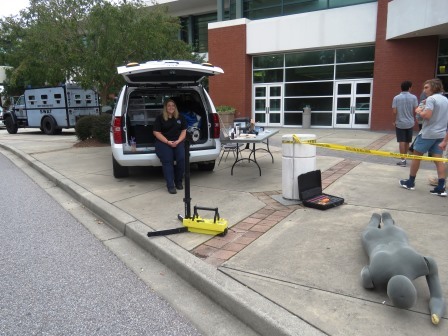 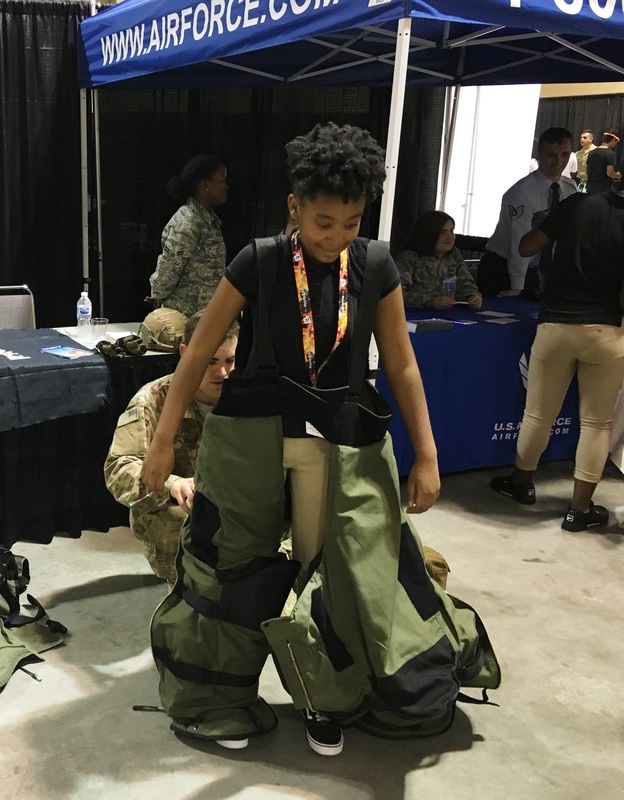 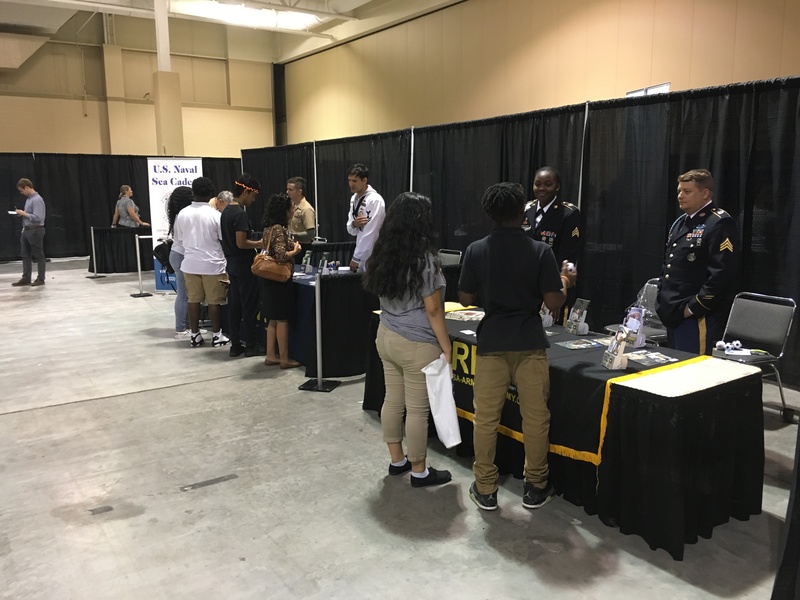 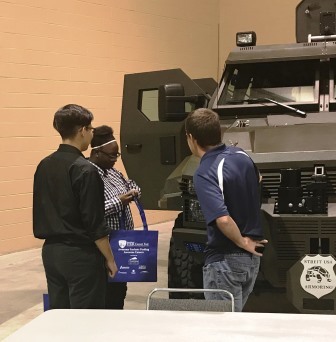 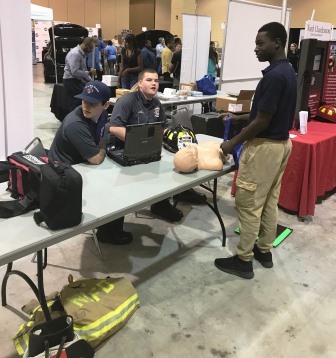 Thanks to a wonderful partnership between CCSD and the CAC.C, there was no cost for students to participate in this career camp. 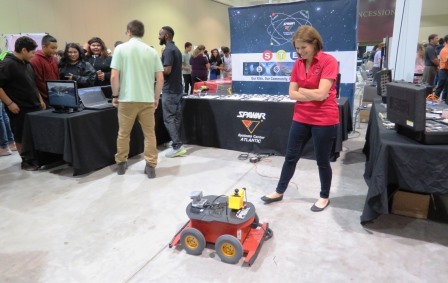 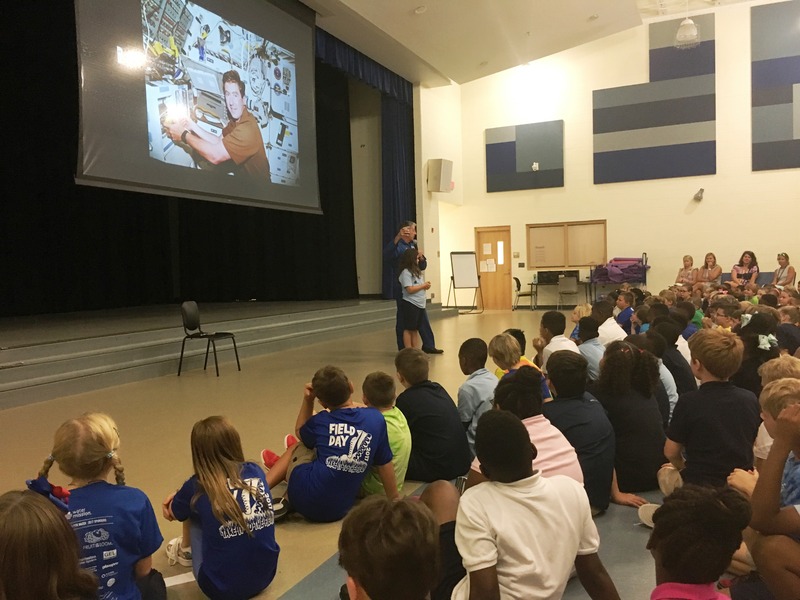 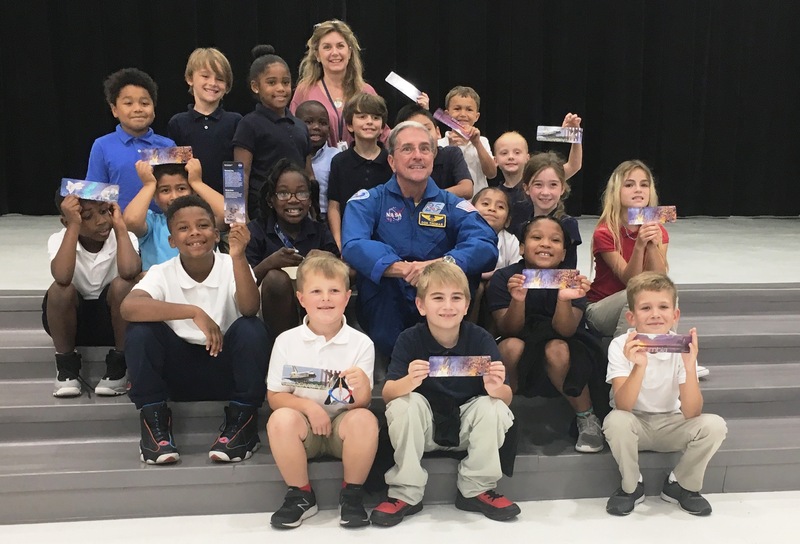 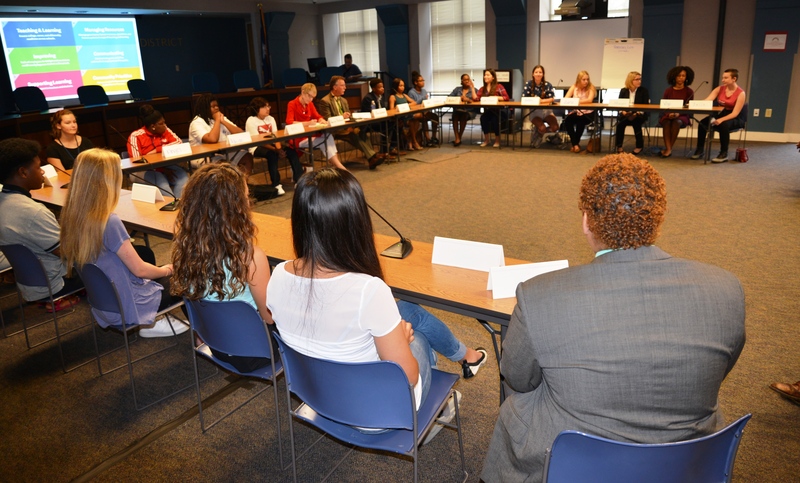 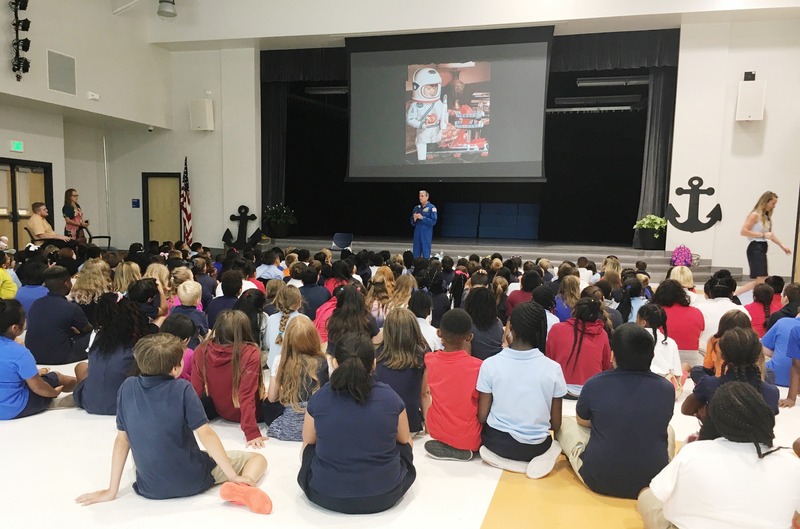 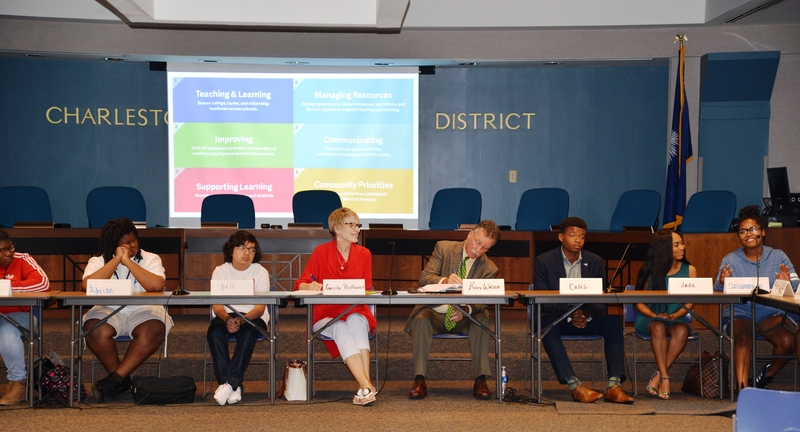 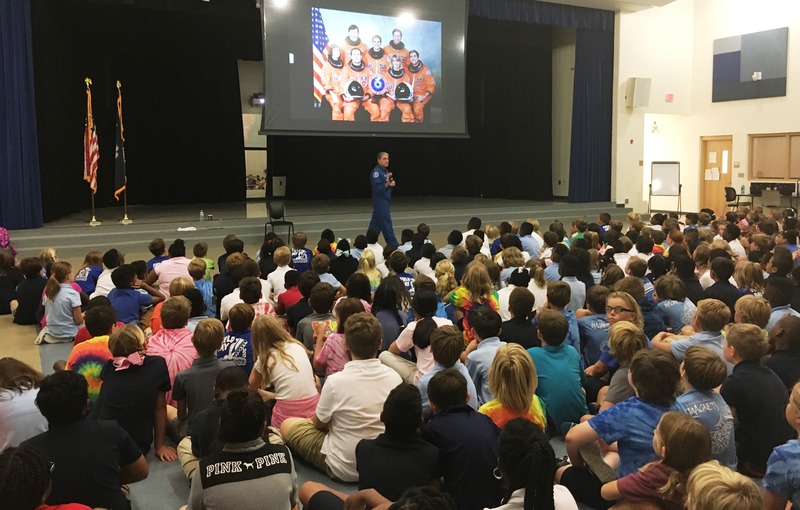 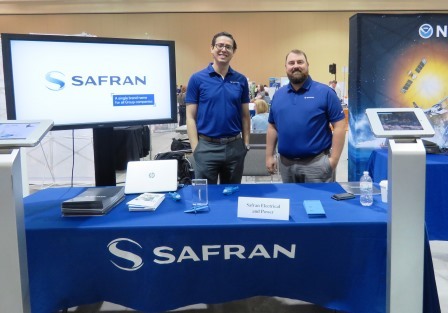 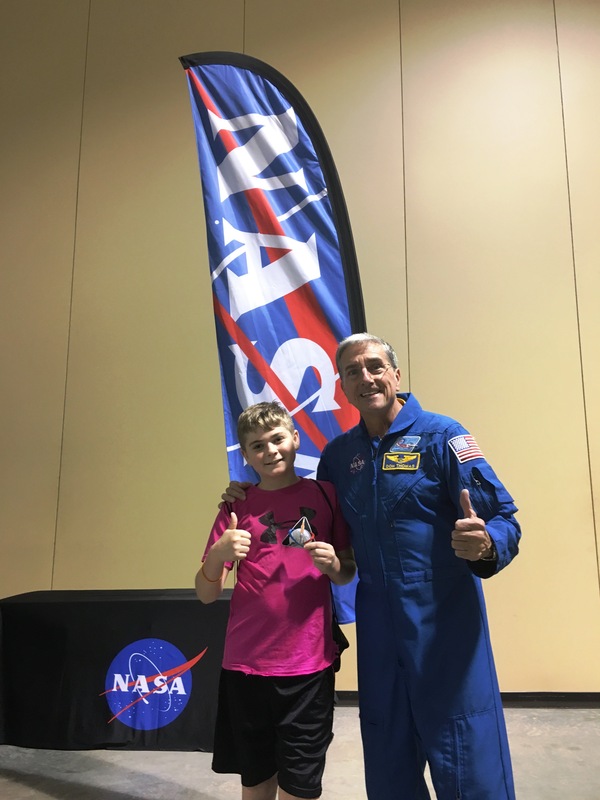 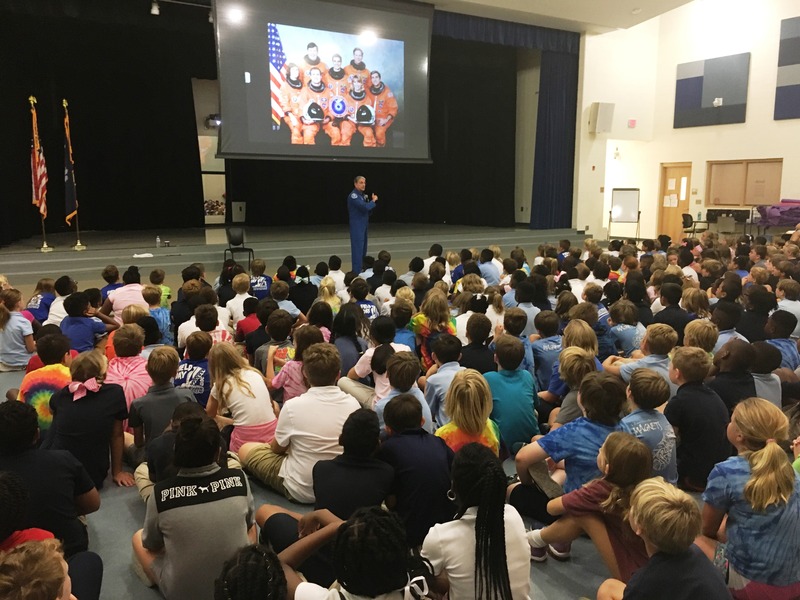 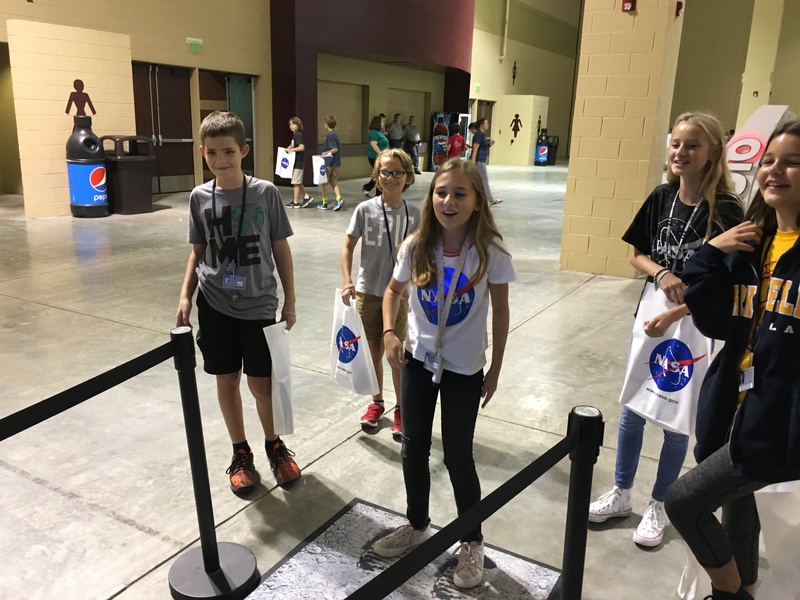 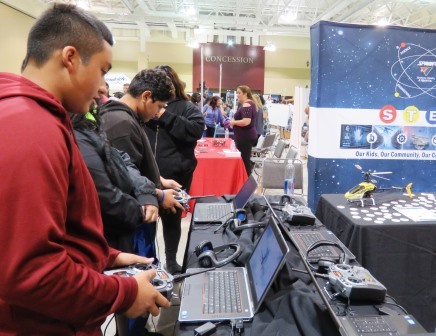 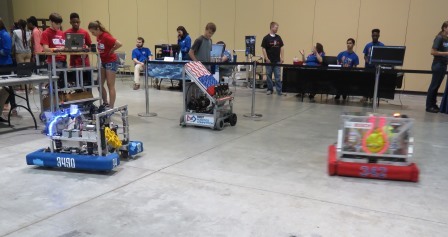 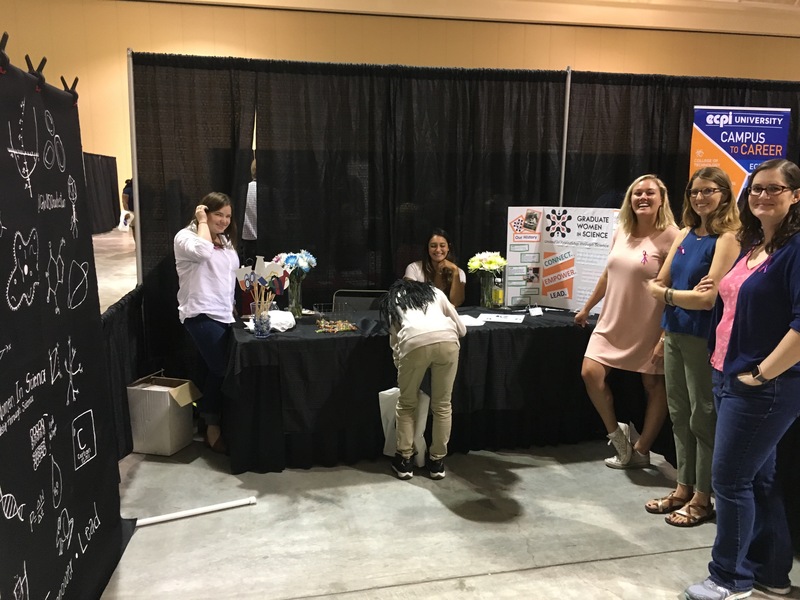 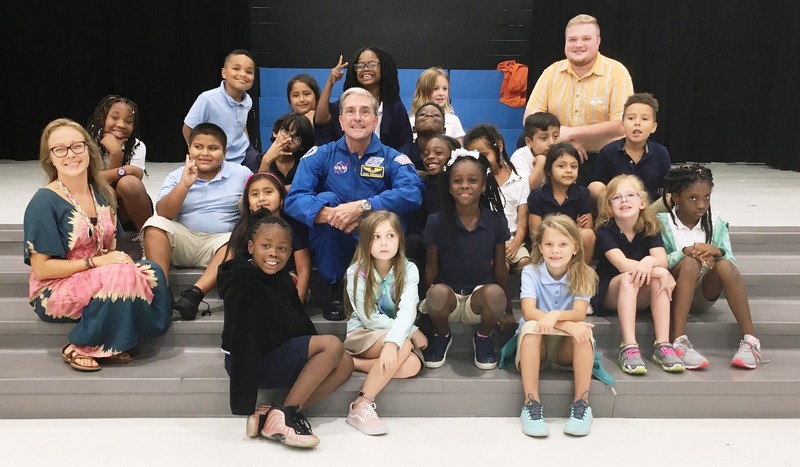 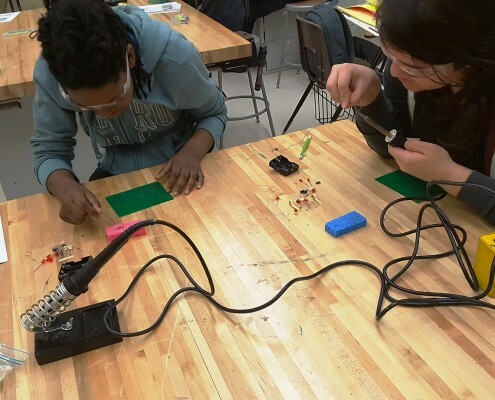 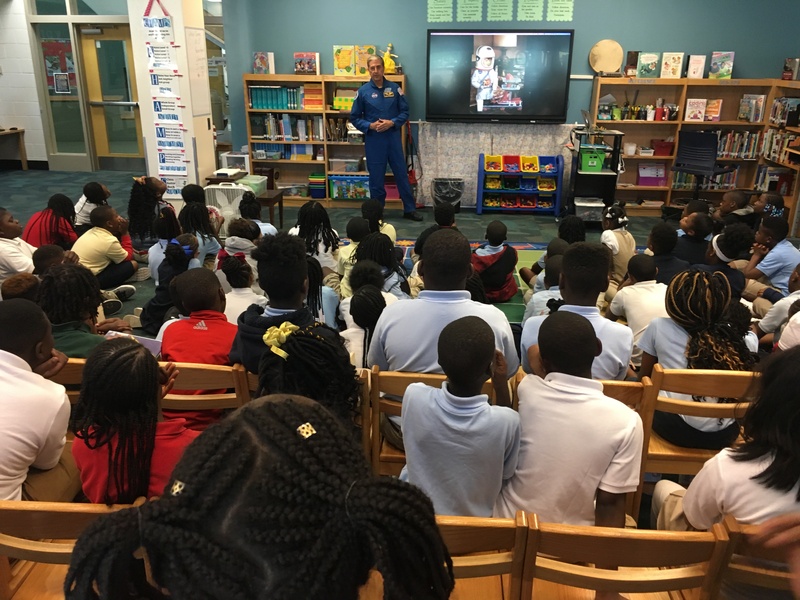 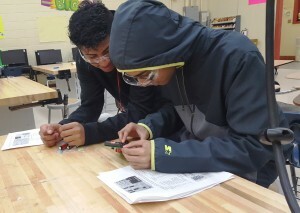 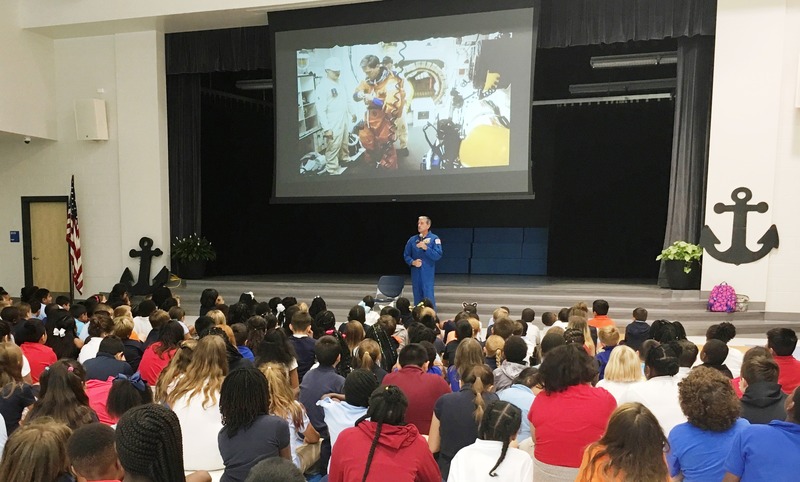 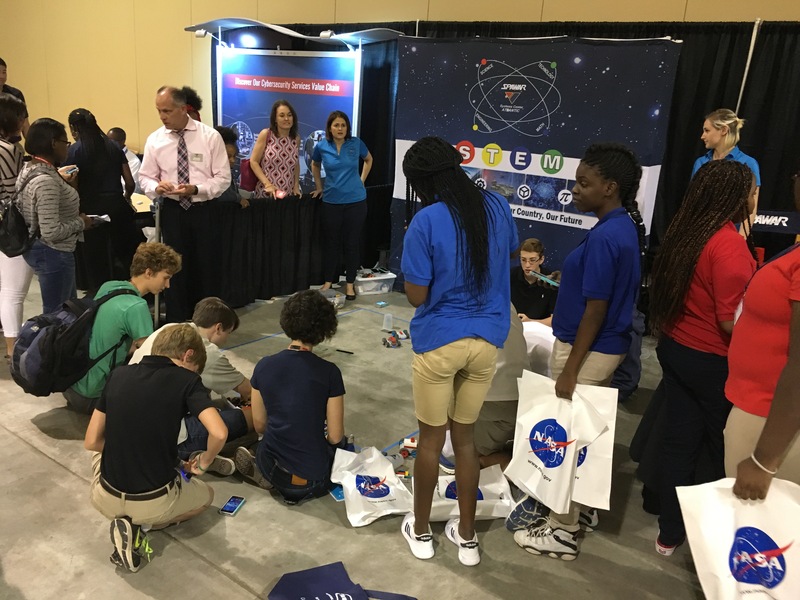 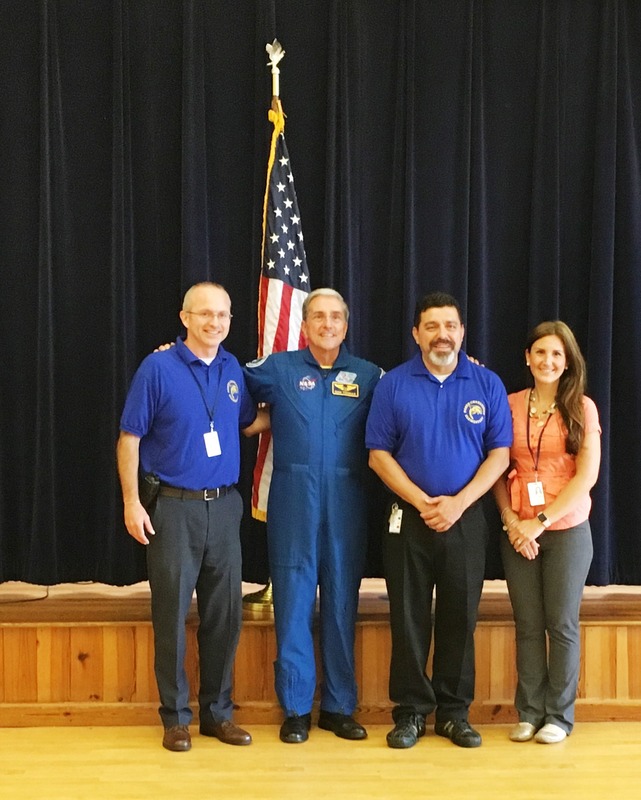 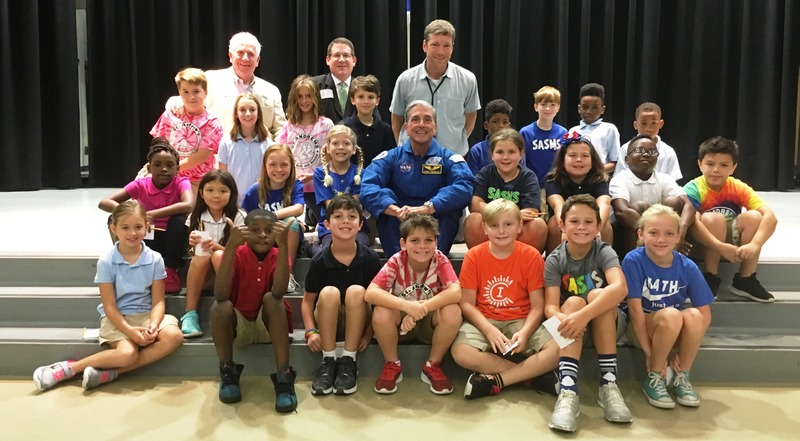 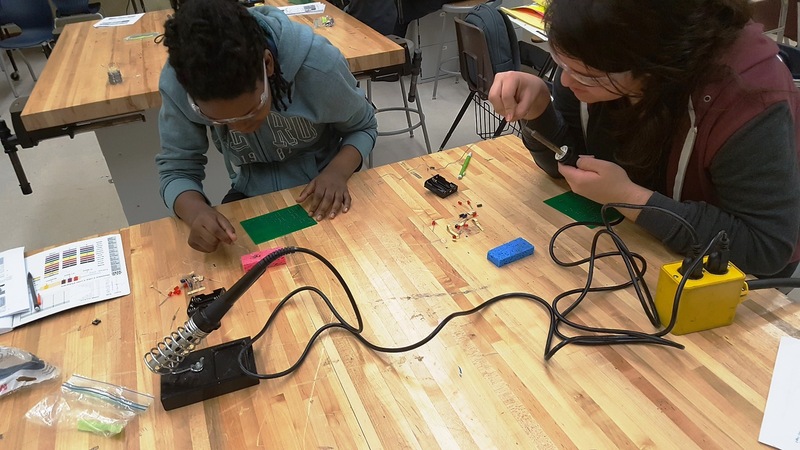 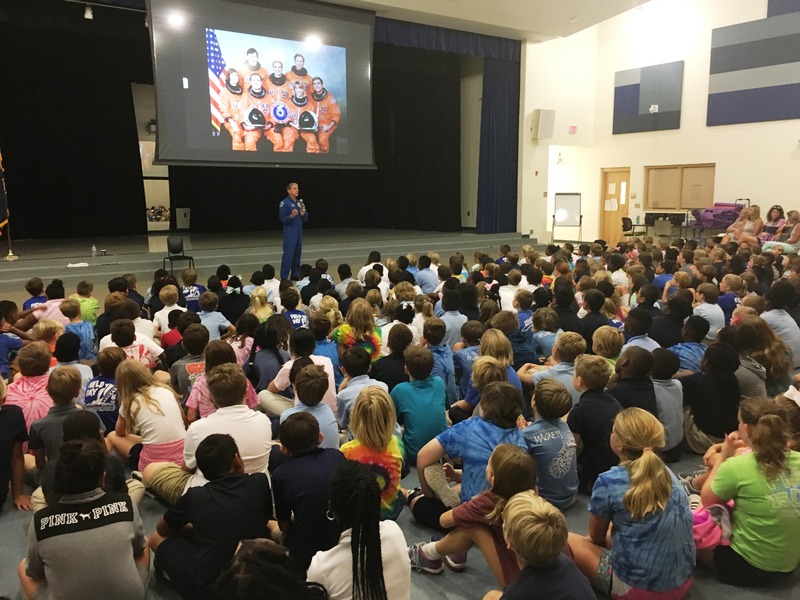 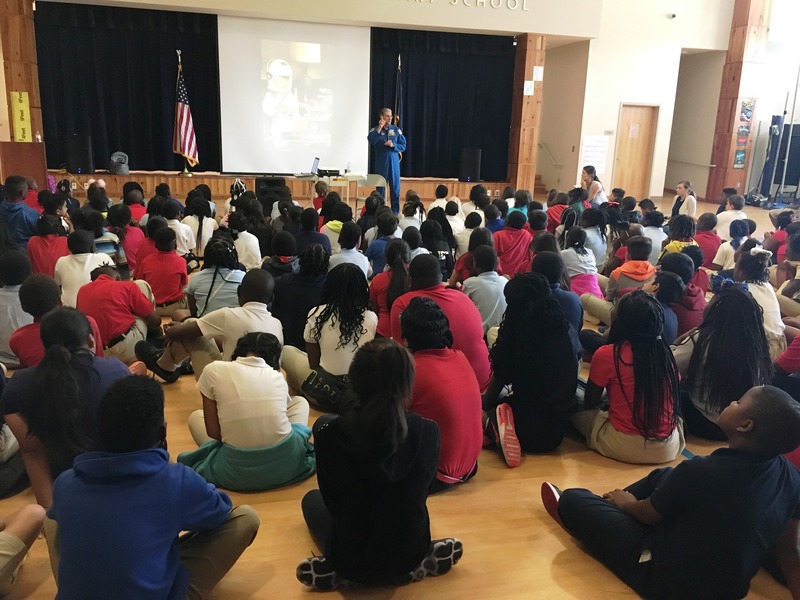 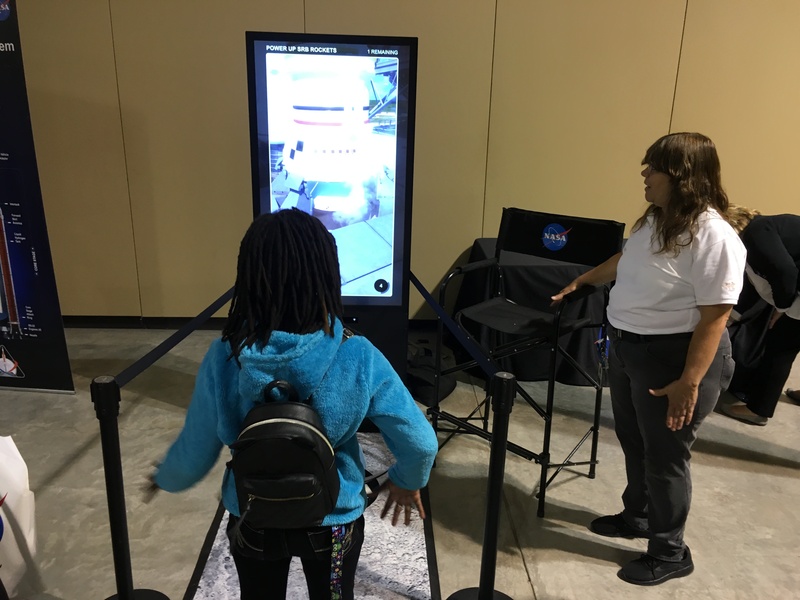 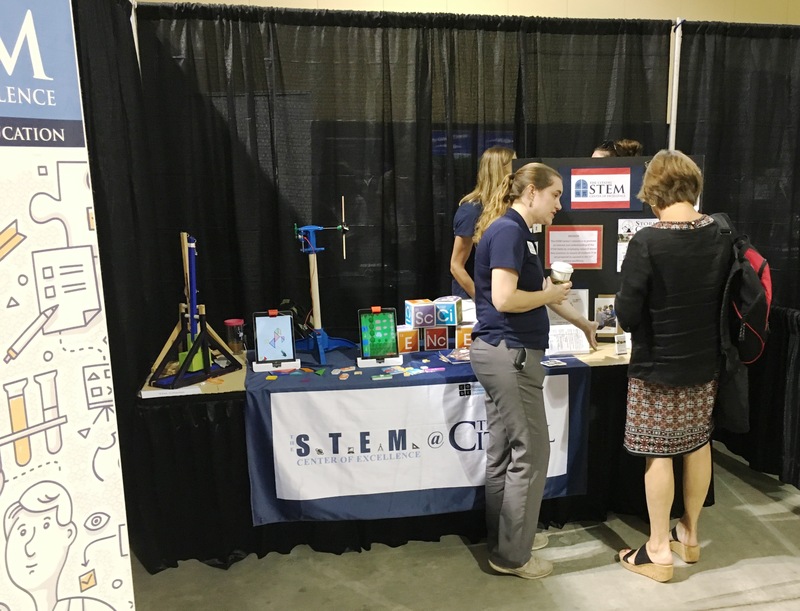 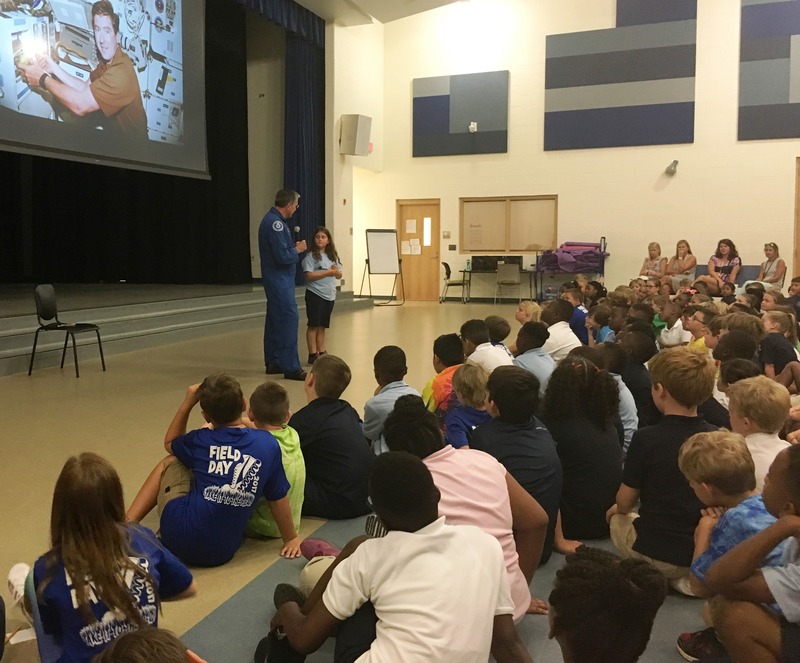 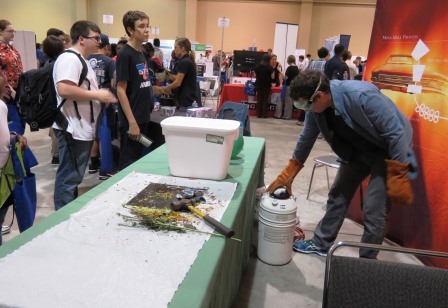 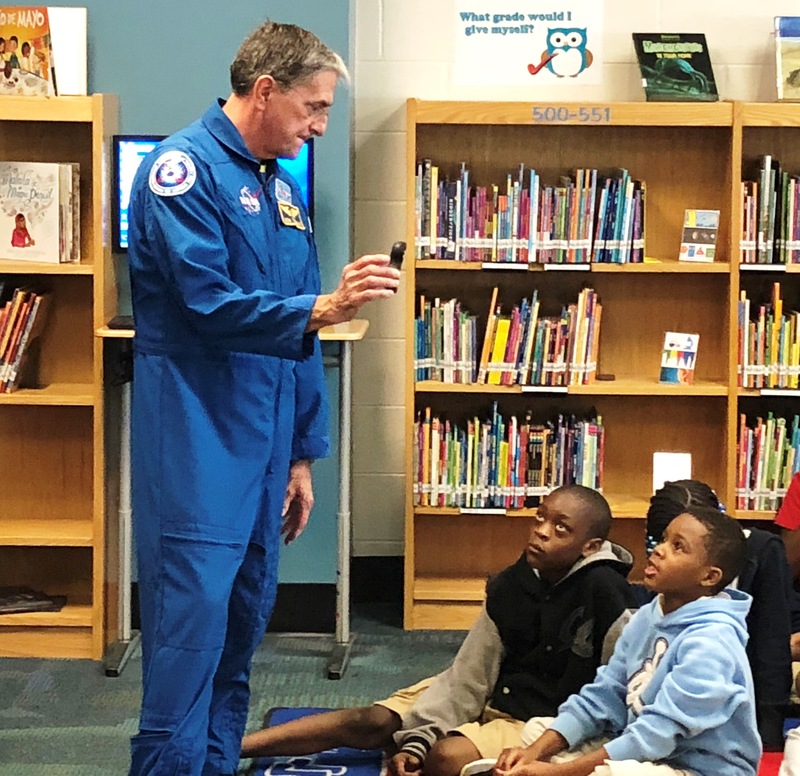 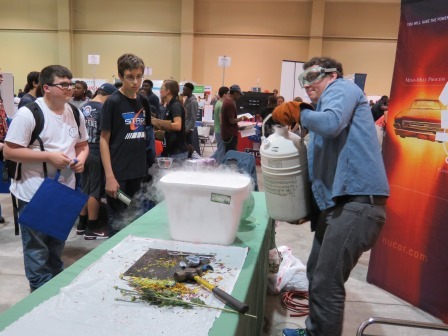 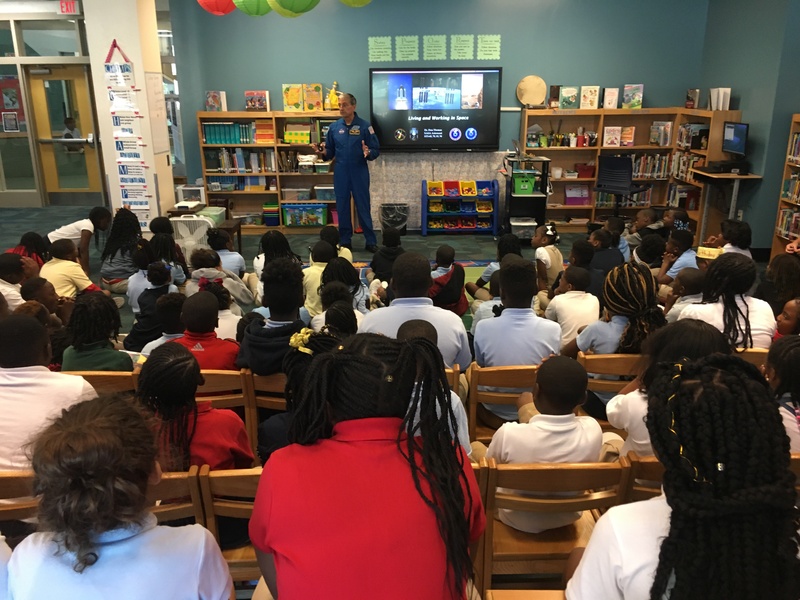 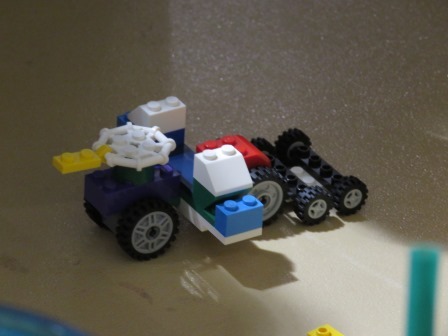 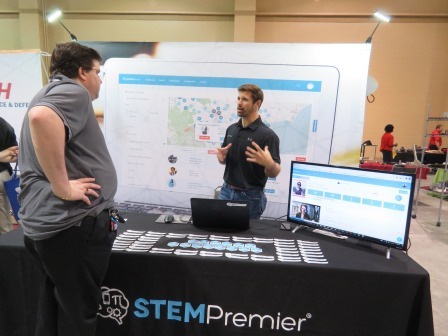 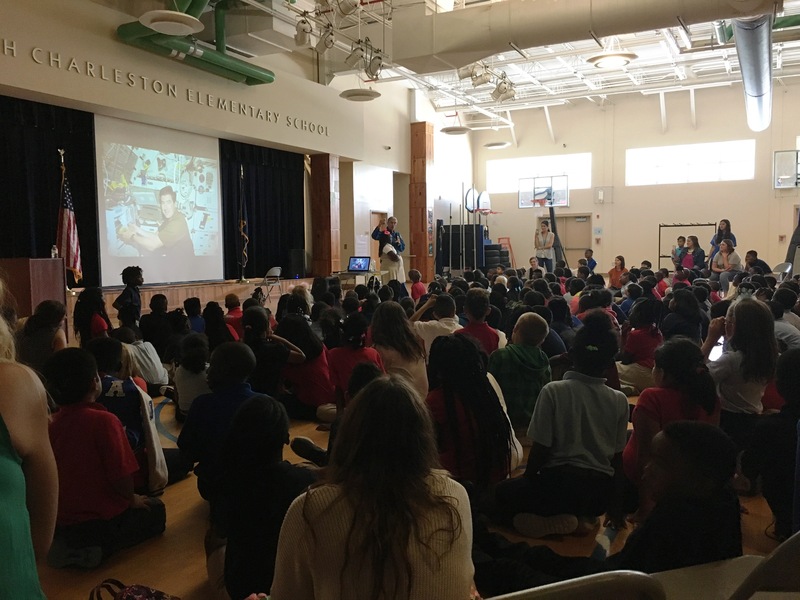 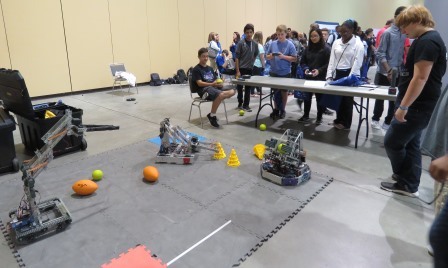 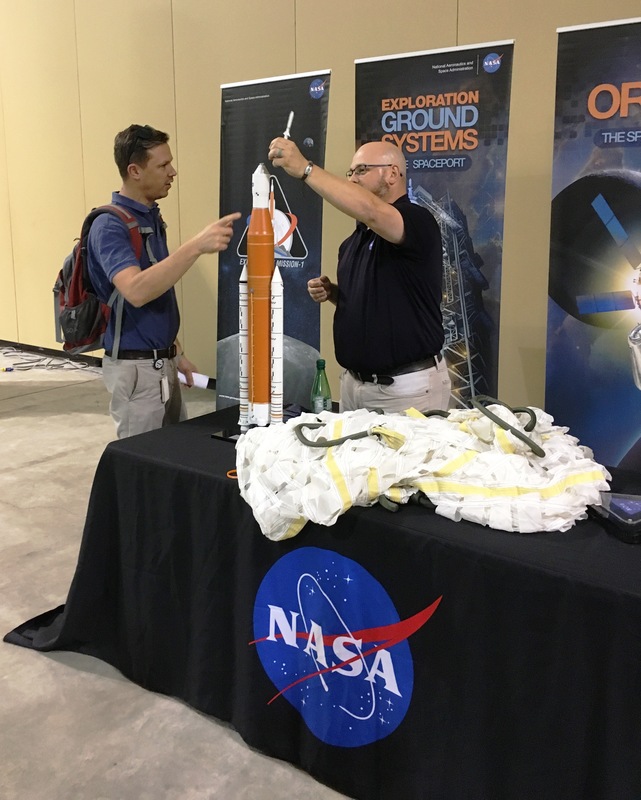 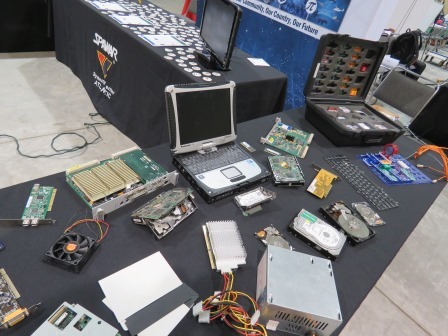 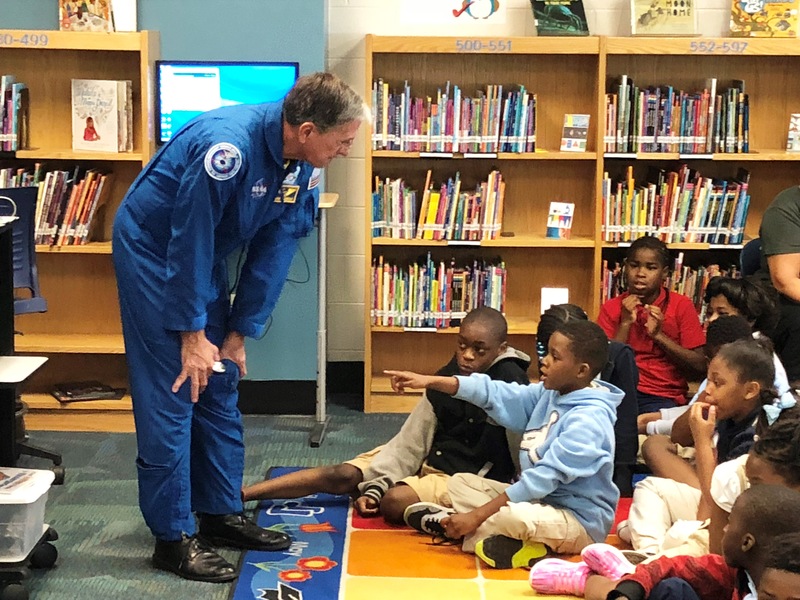 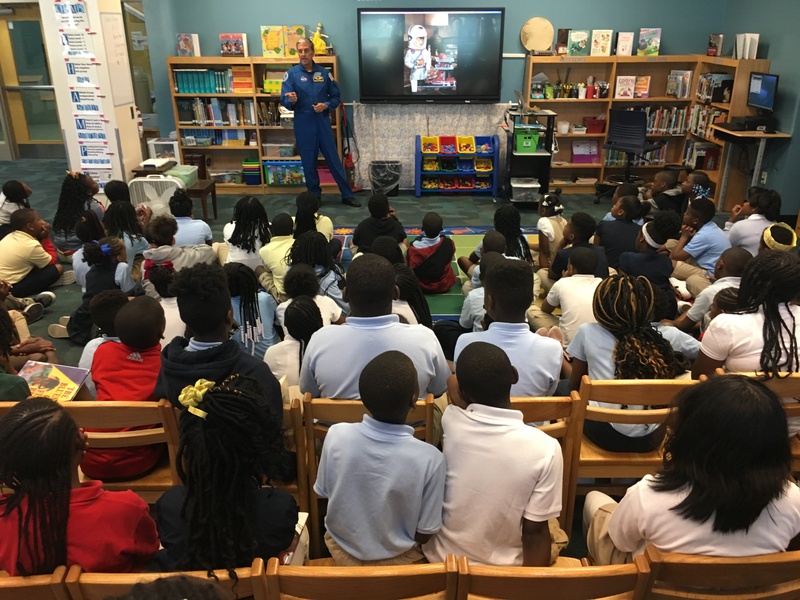 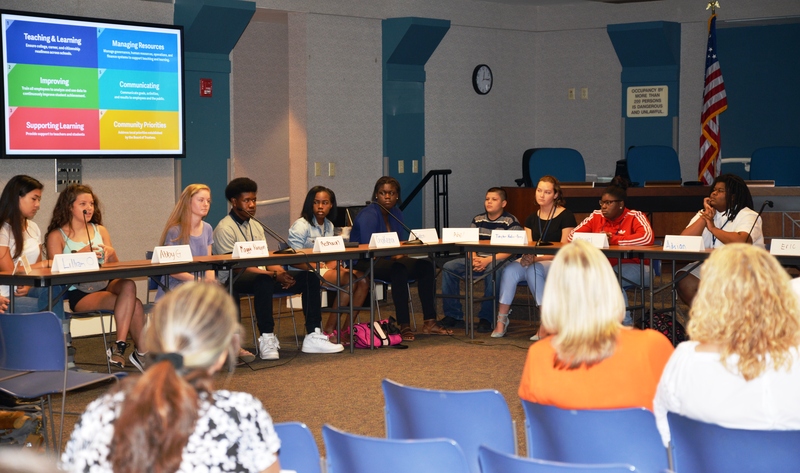 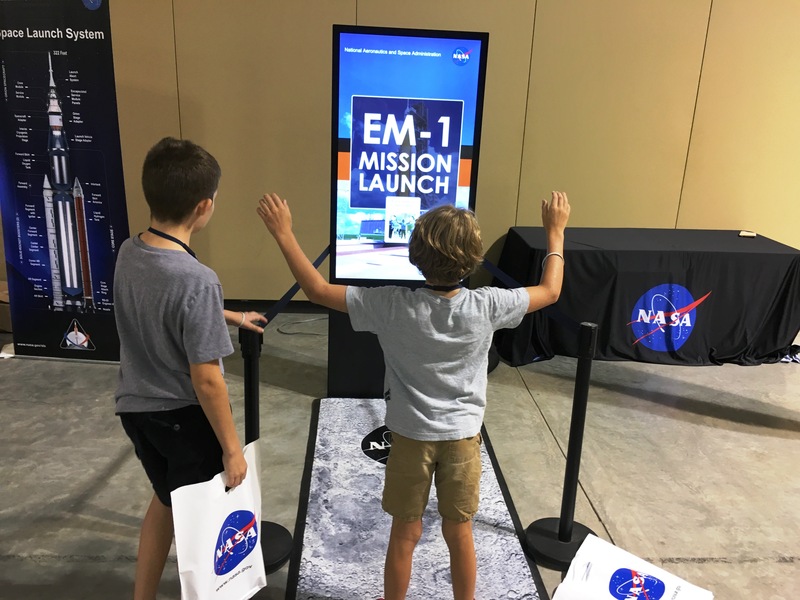 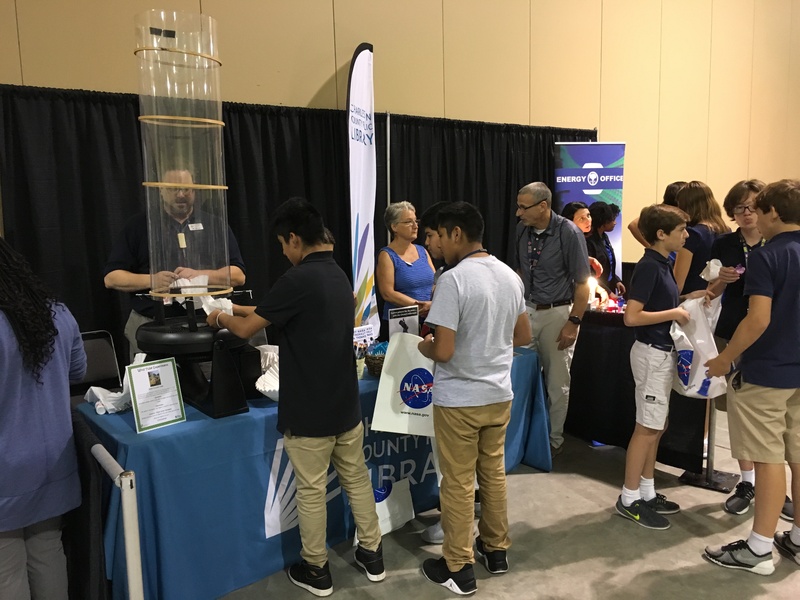 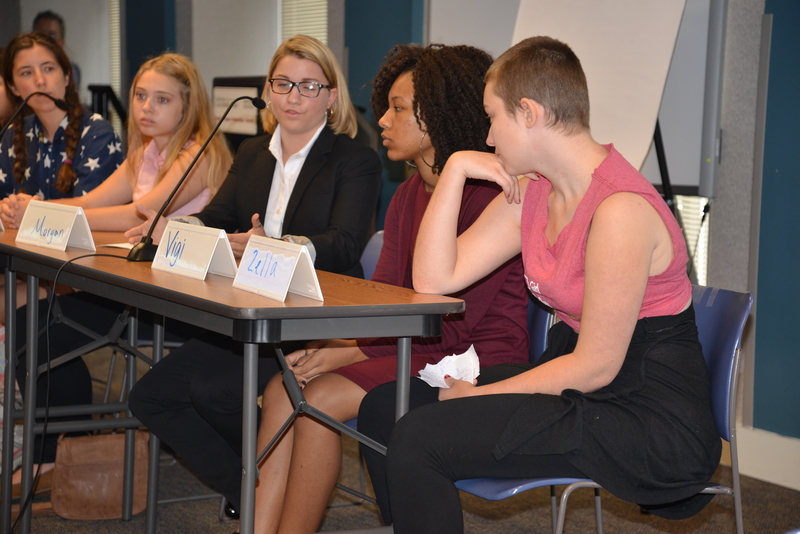 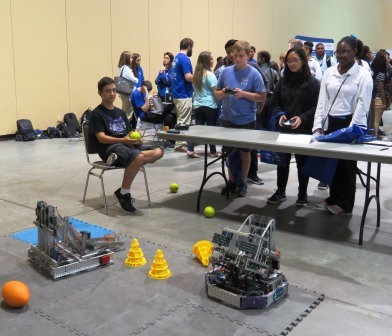 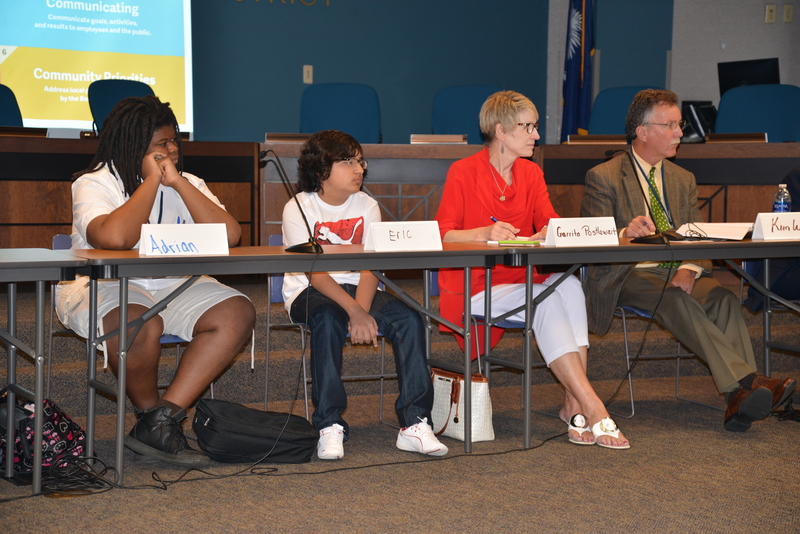 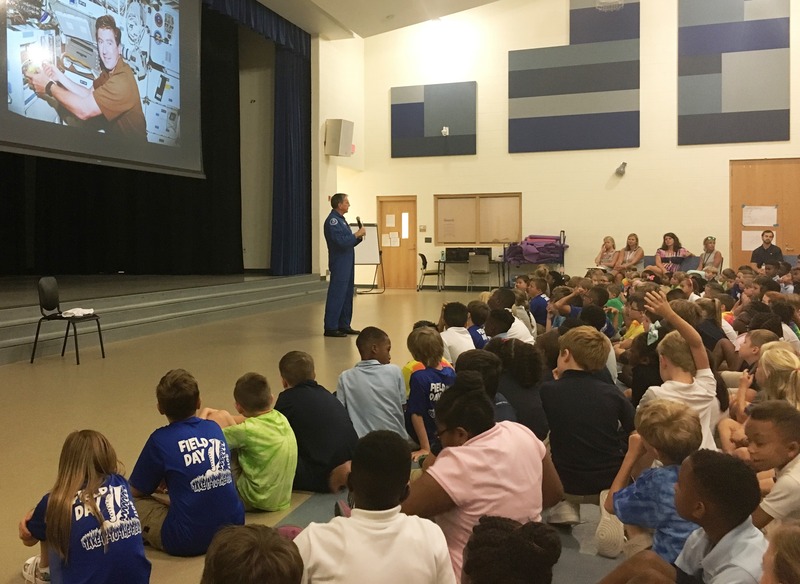 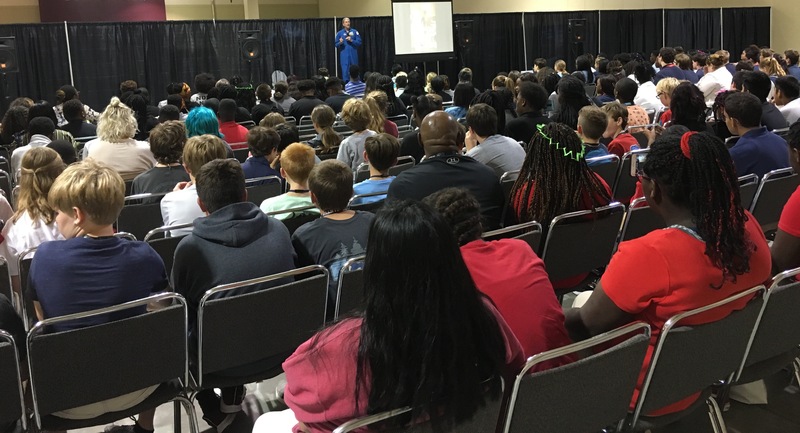 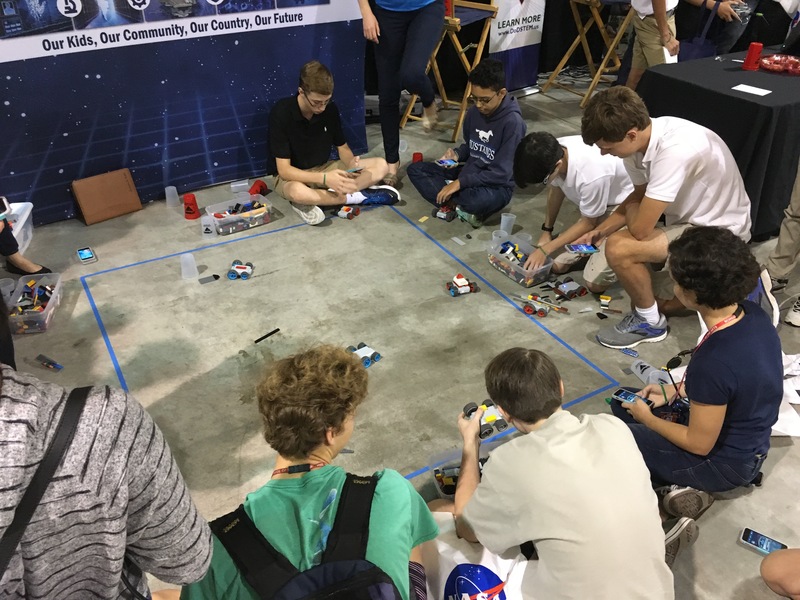 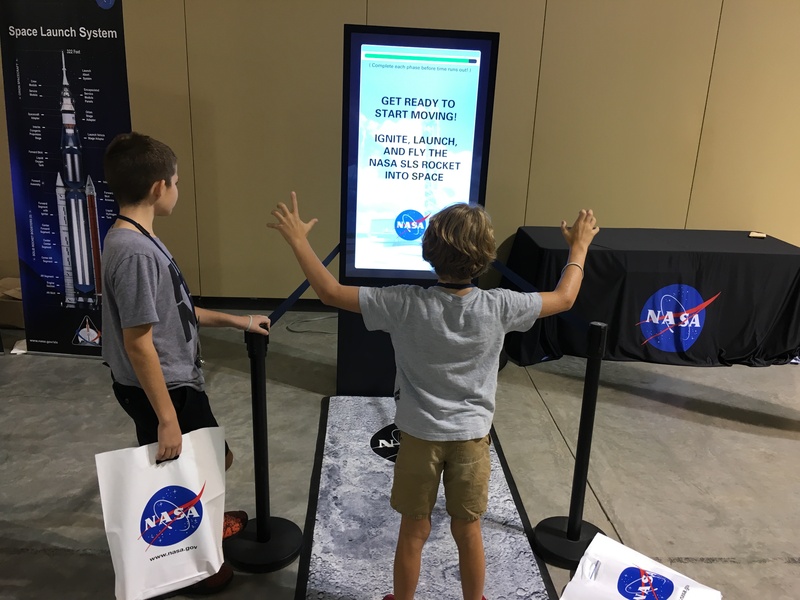 After this very successful pilot, plans are being discussed to expand the opportunity to more students next summer – Thanks to everyone that made this work-based learning experience available for CCSD students! 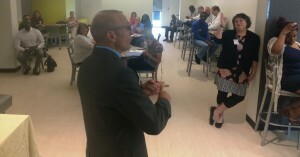 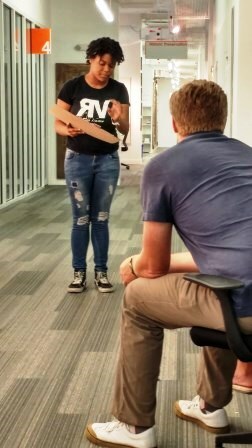 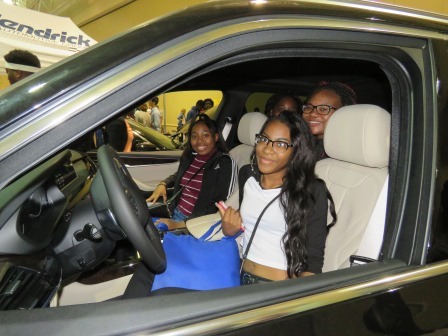 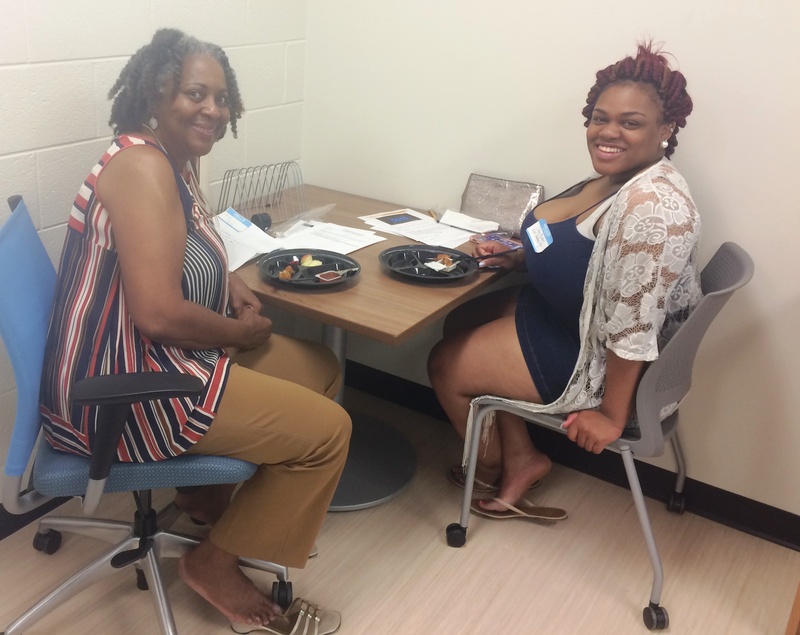 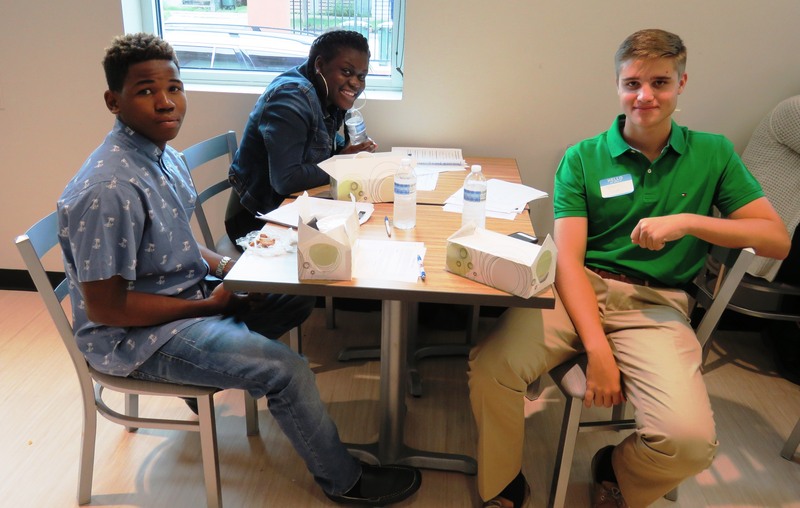 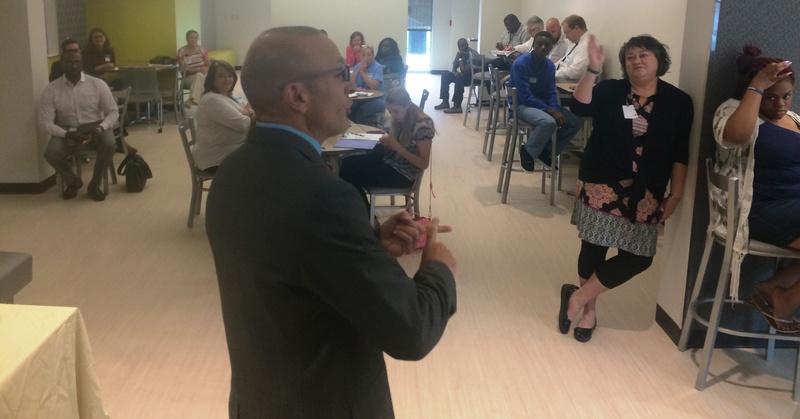 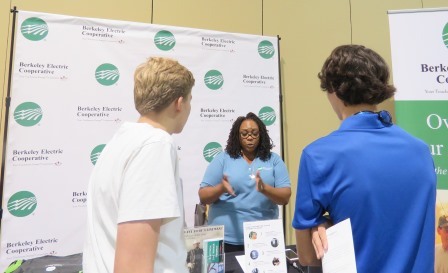 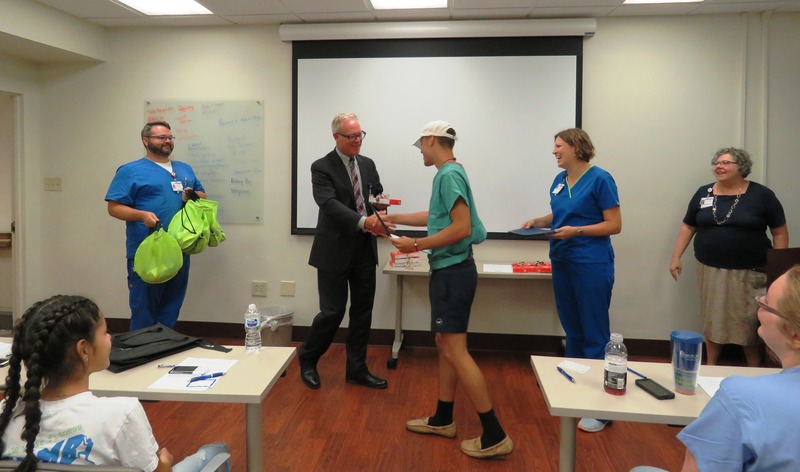 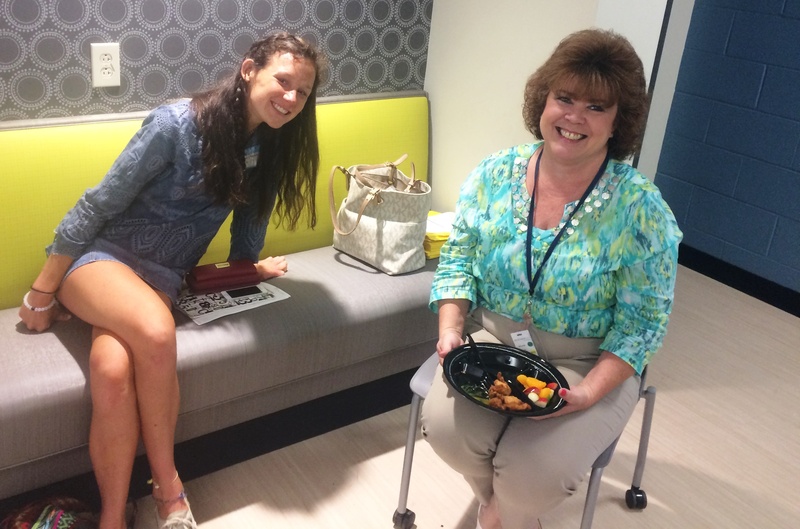 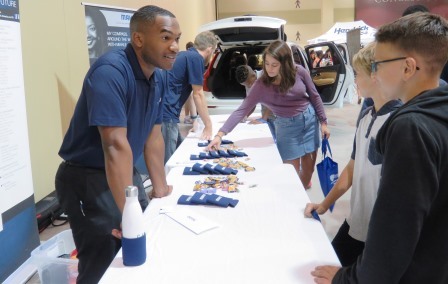 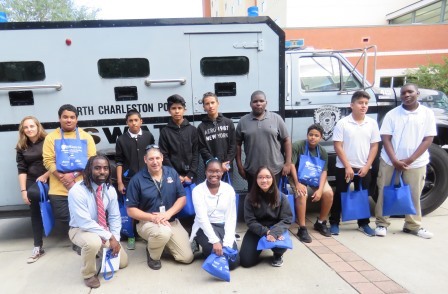 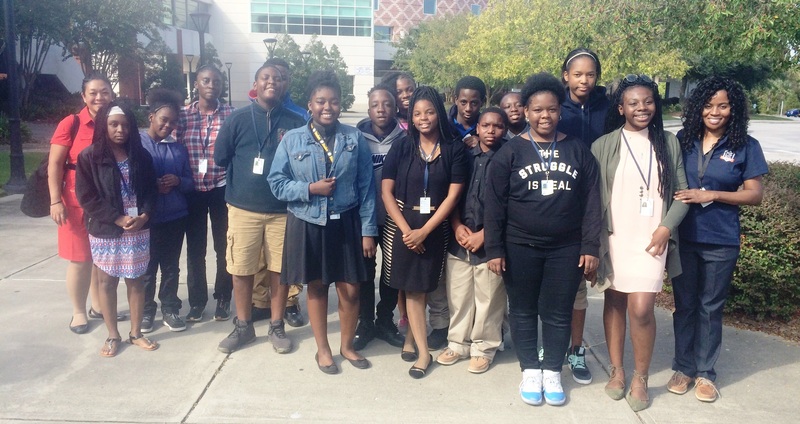 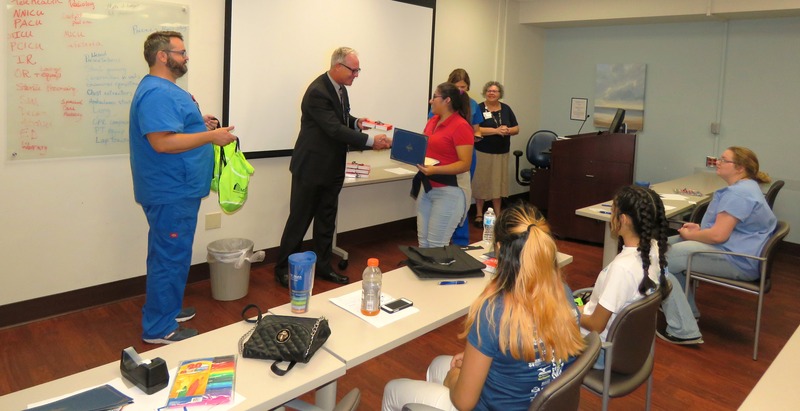 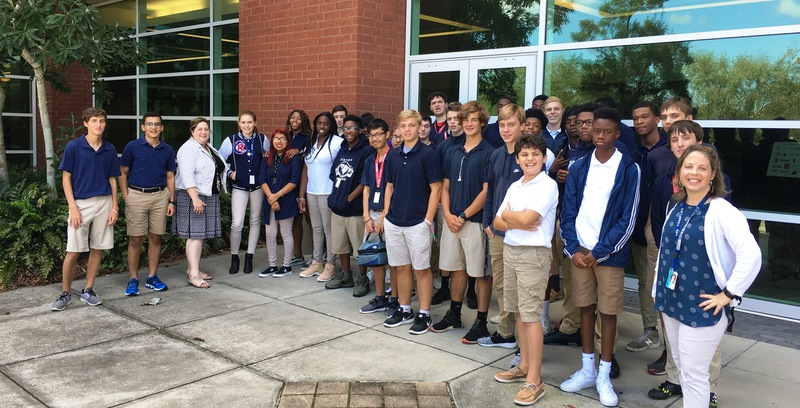 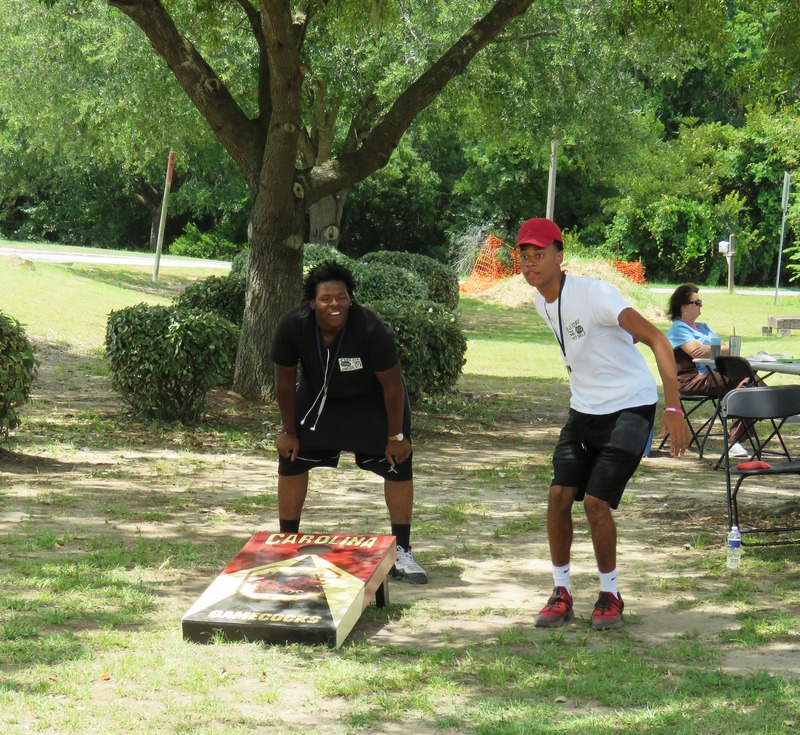 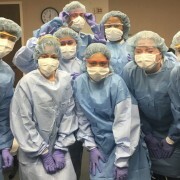 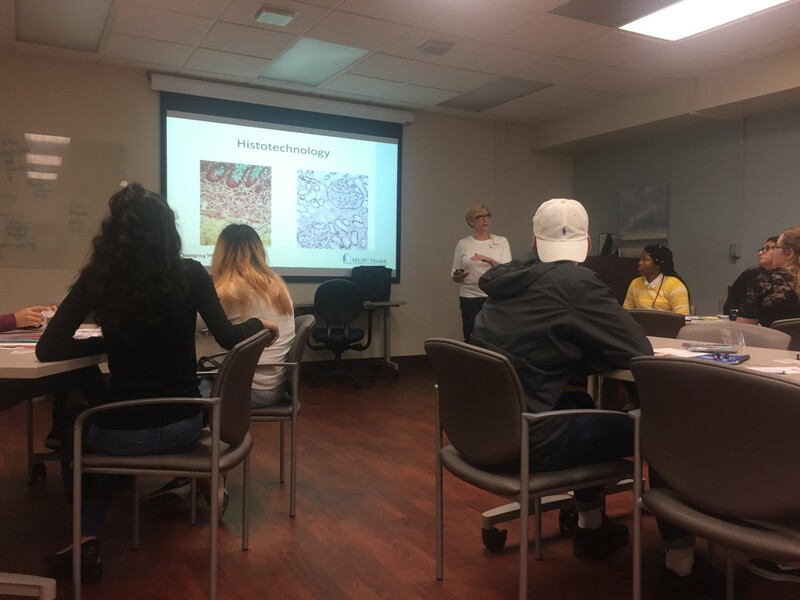 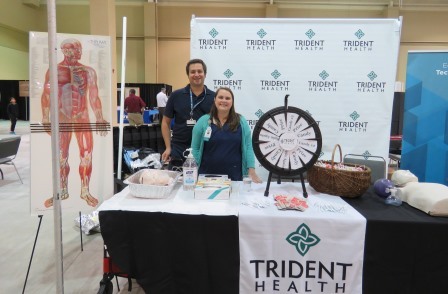 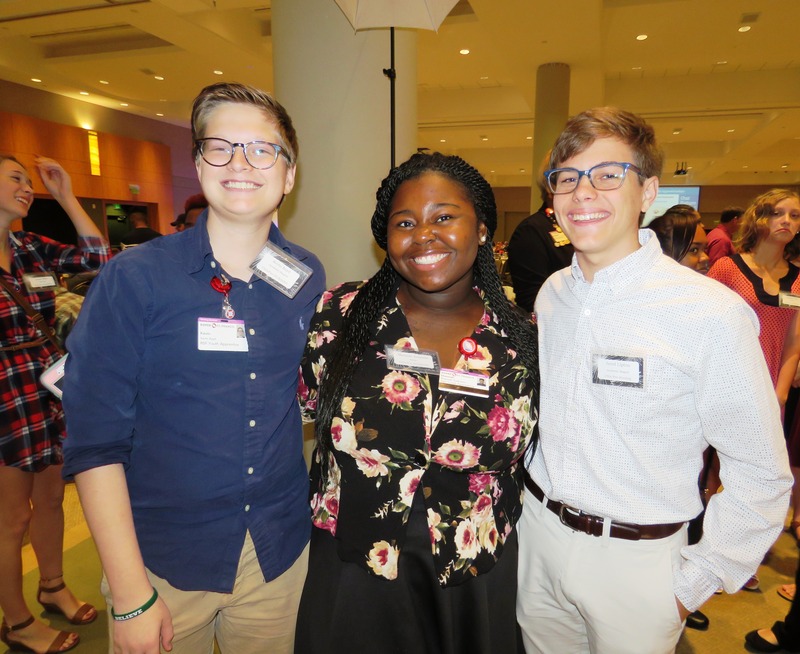 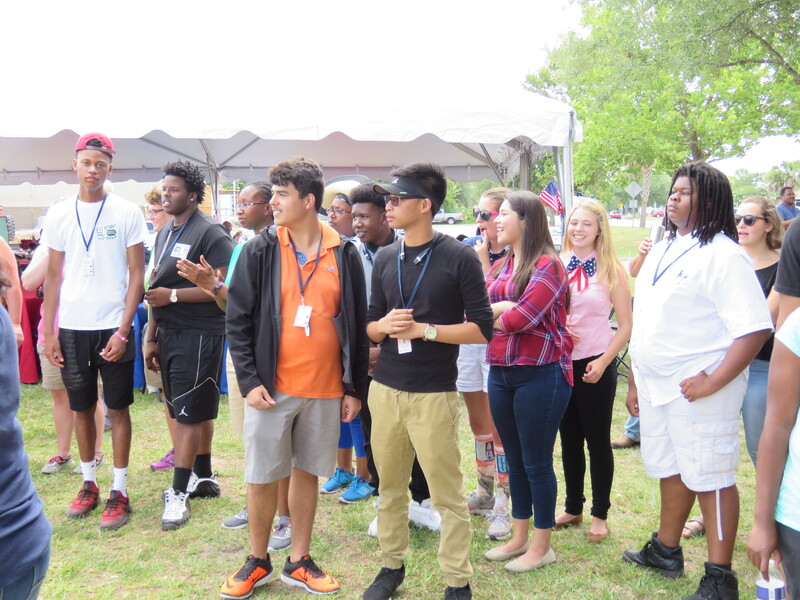 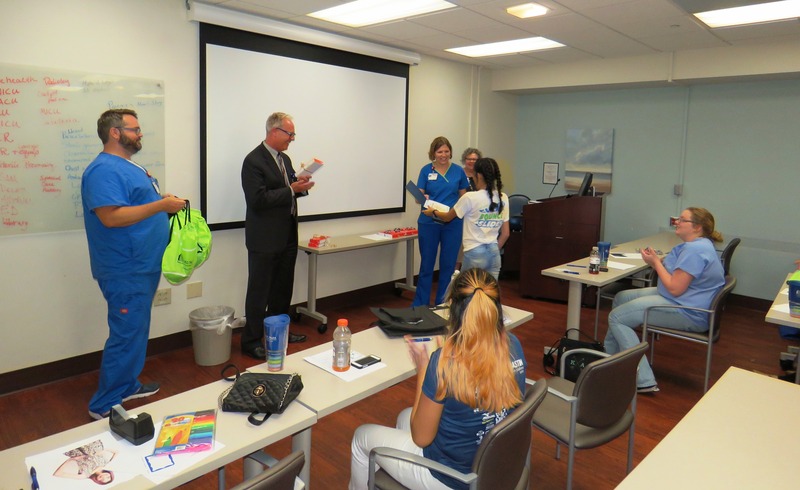 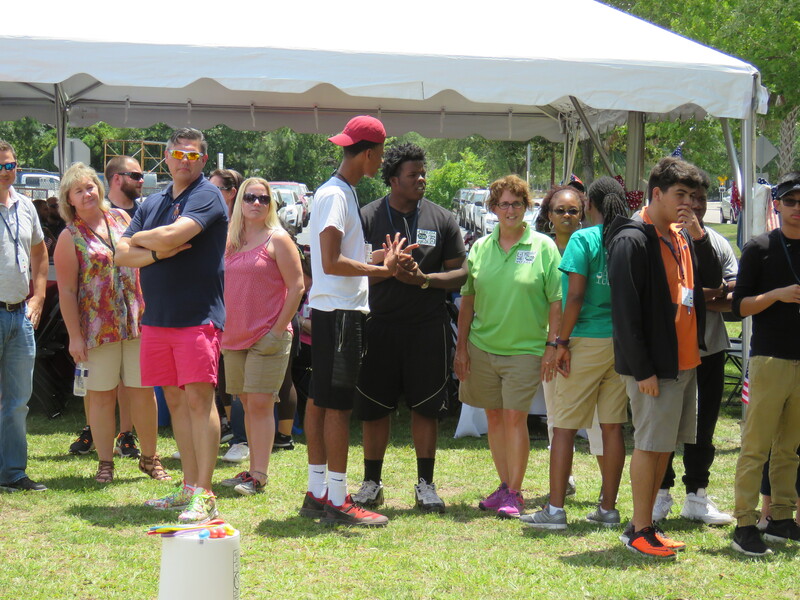 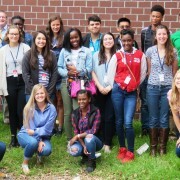 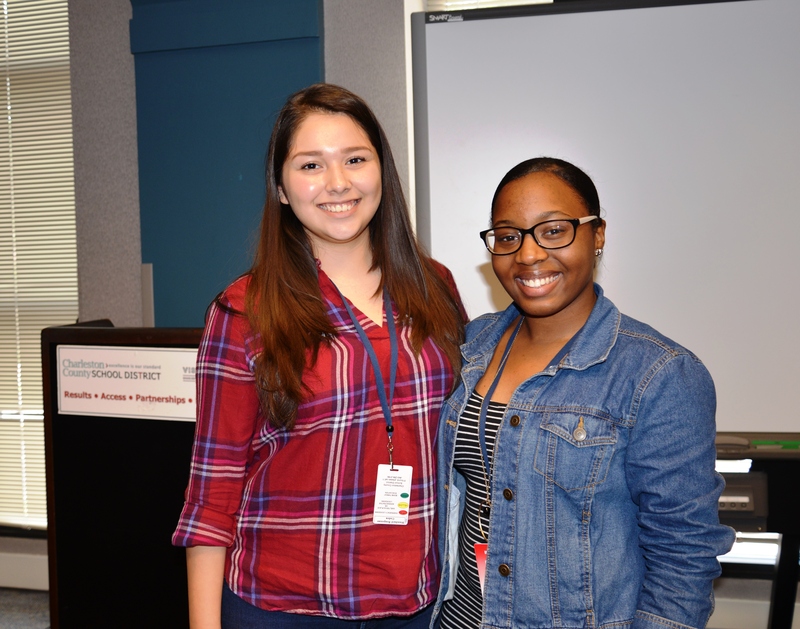 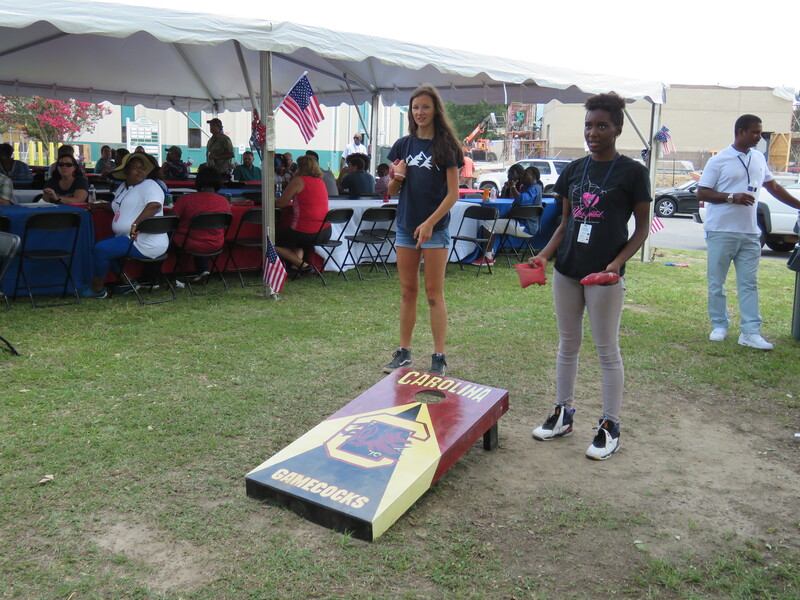 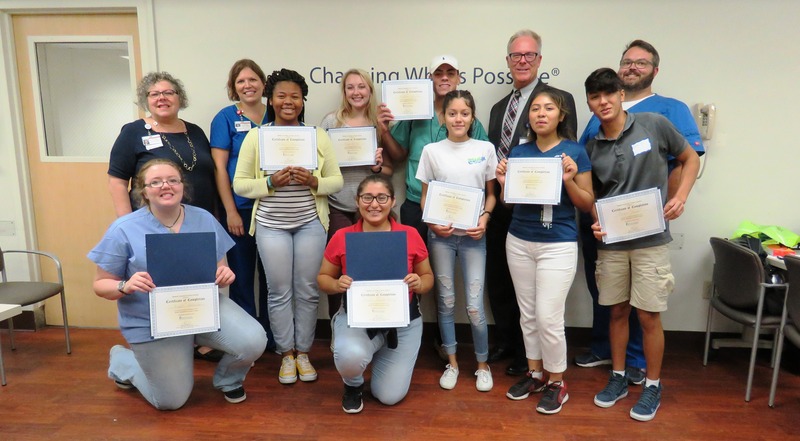 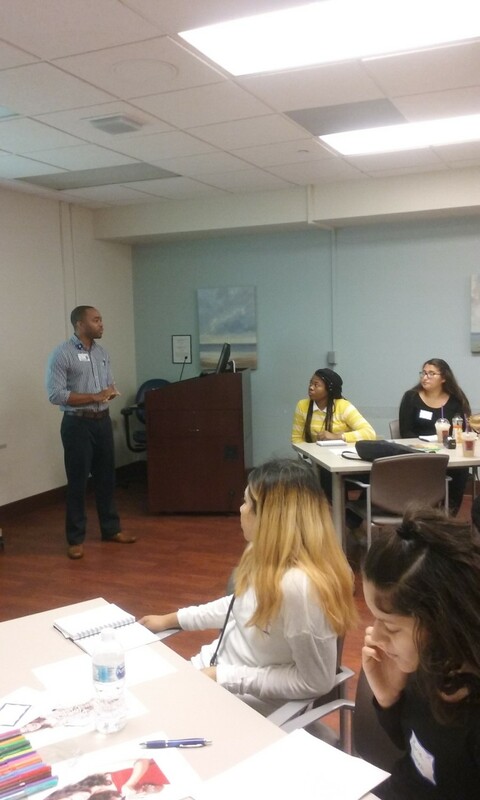 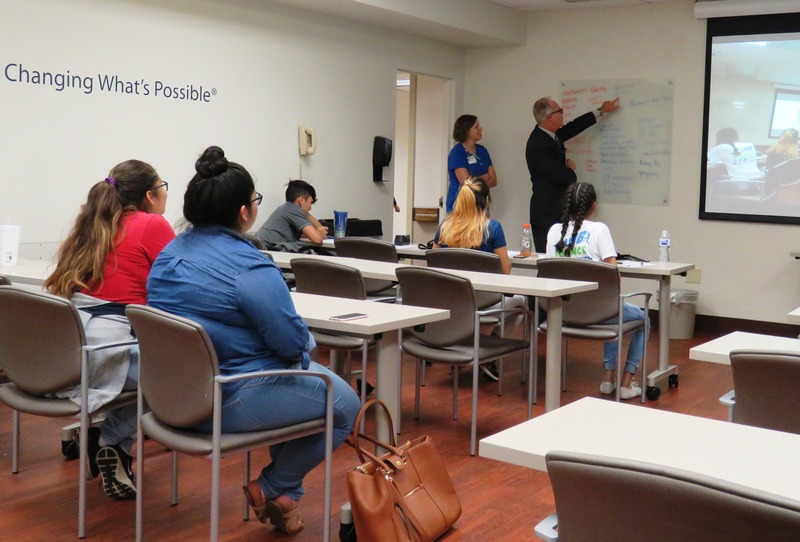 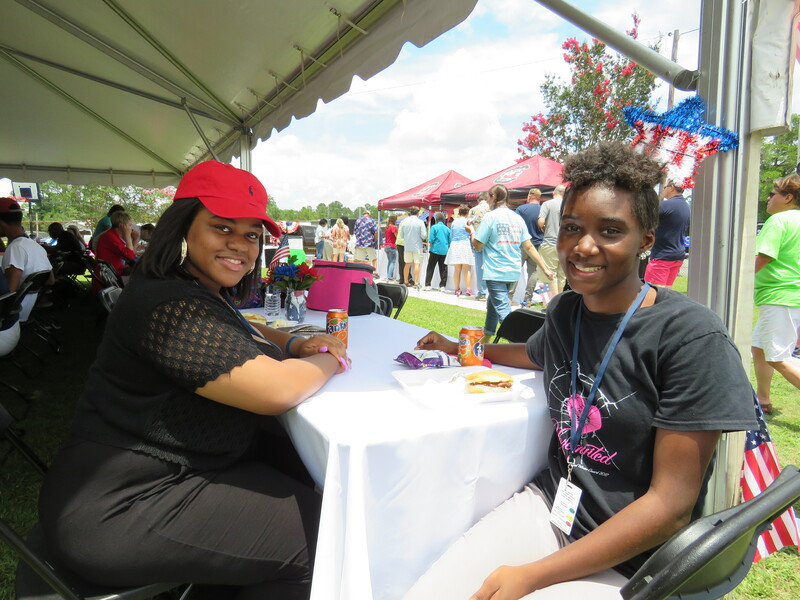 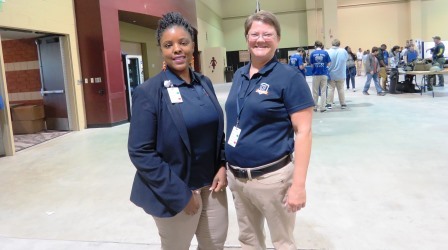 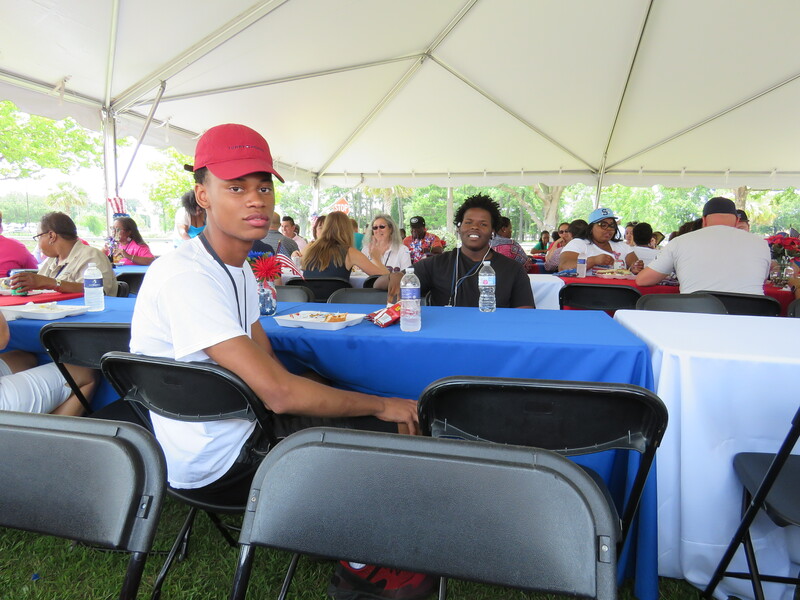 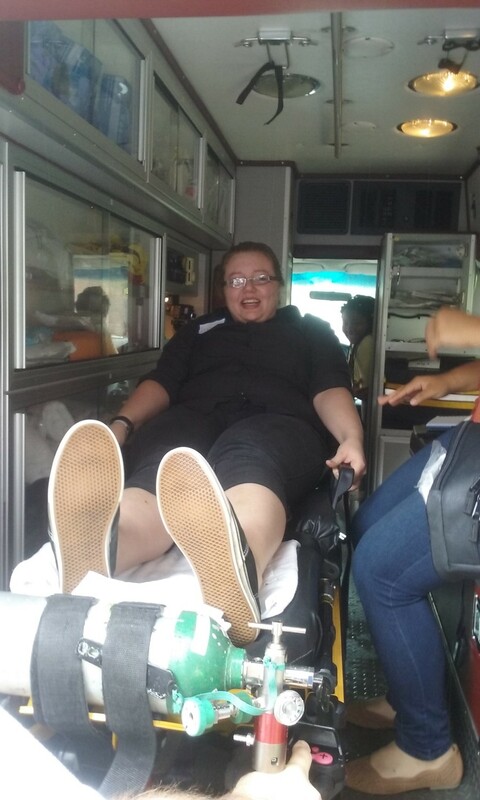 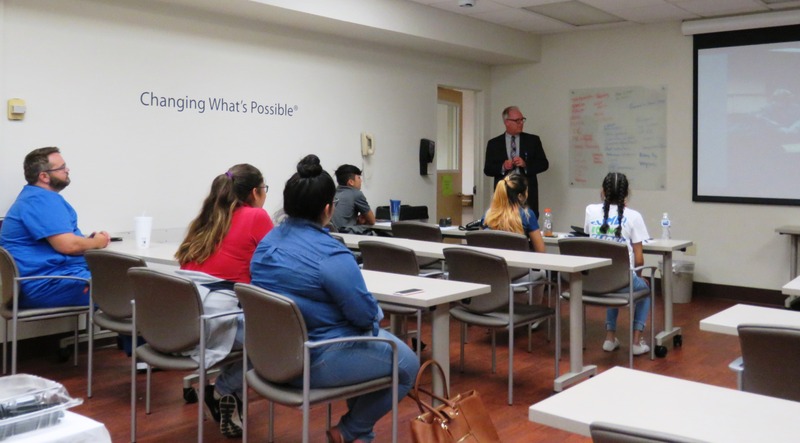 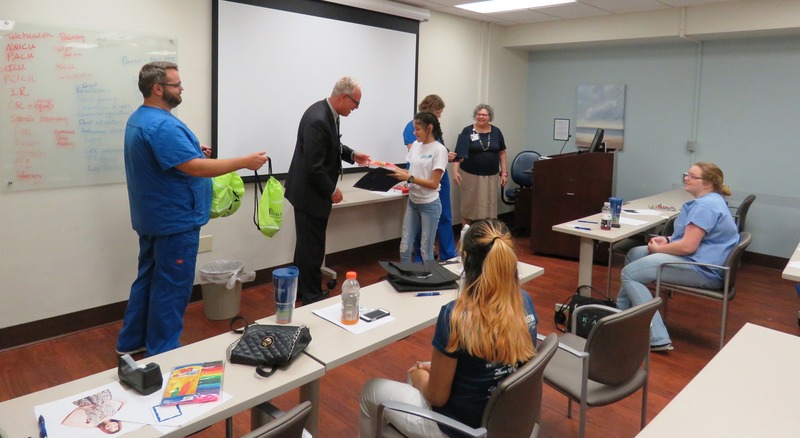 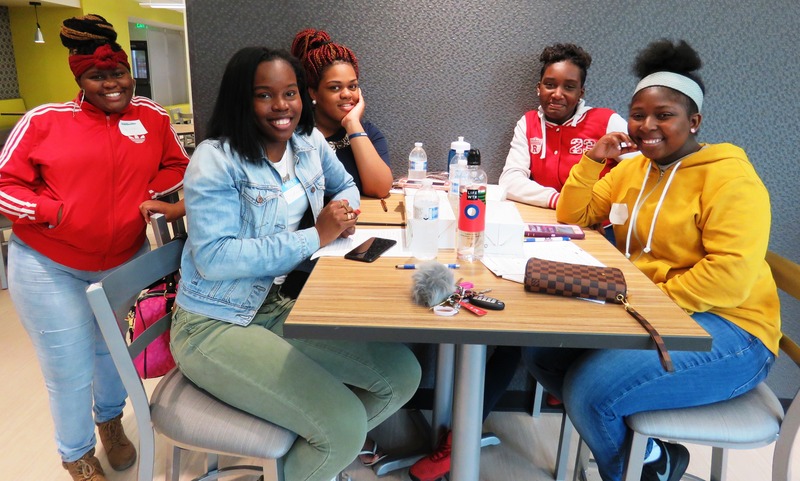 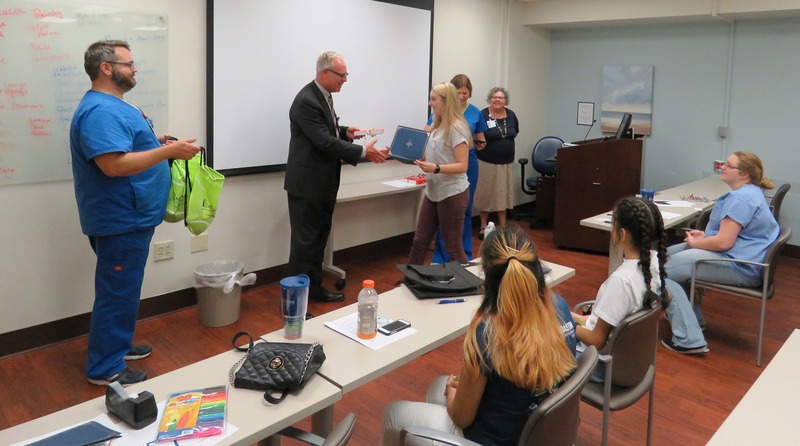 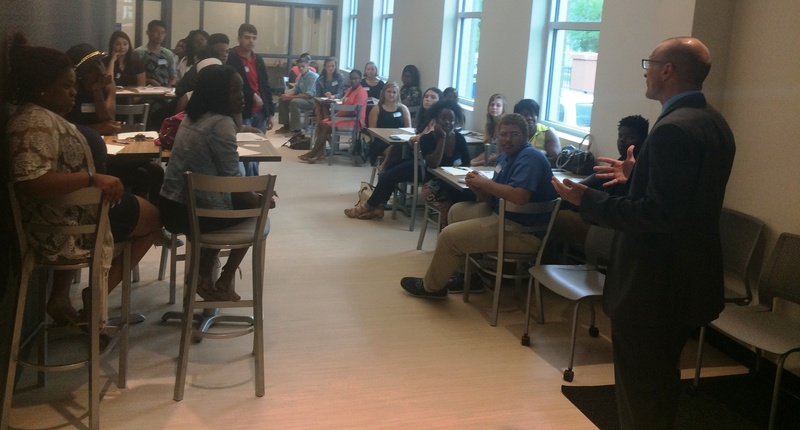 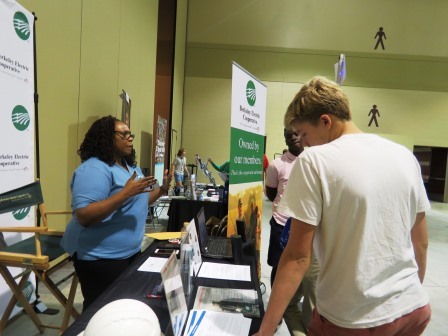 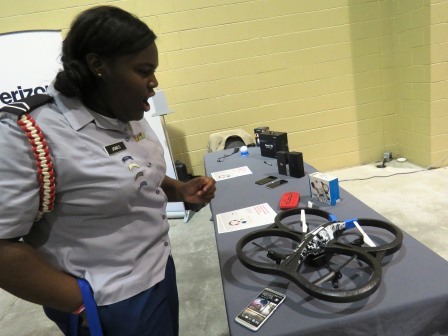 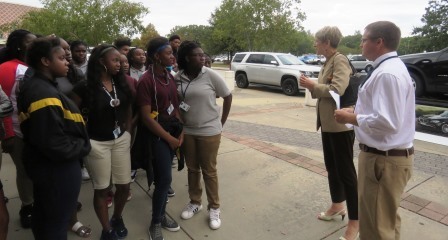 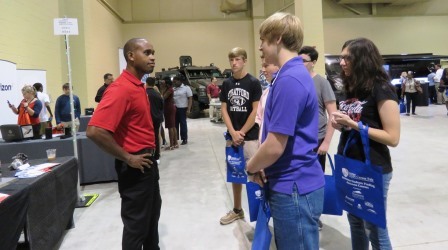 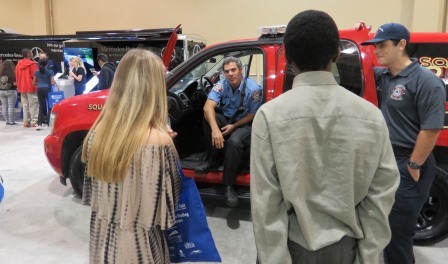 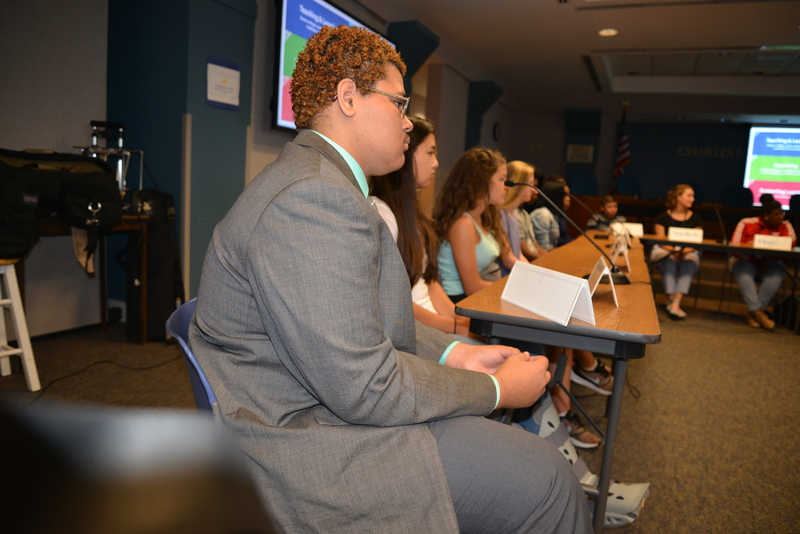 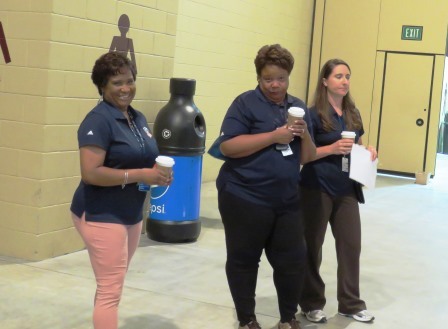 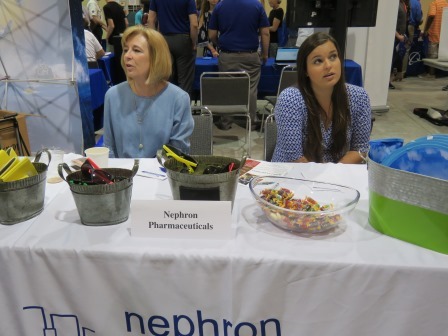 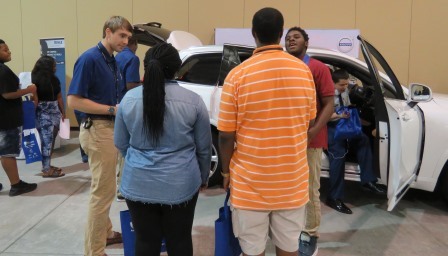 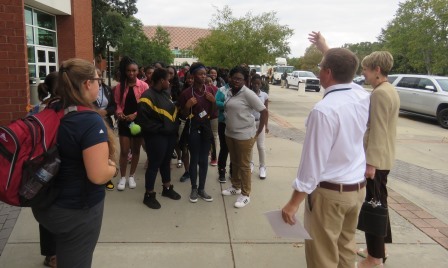 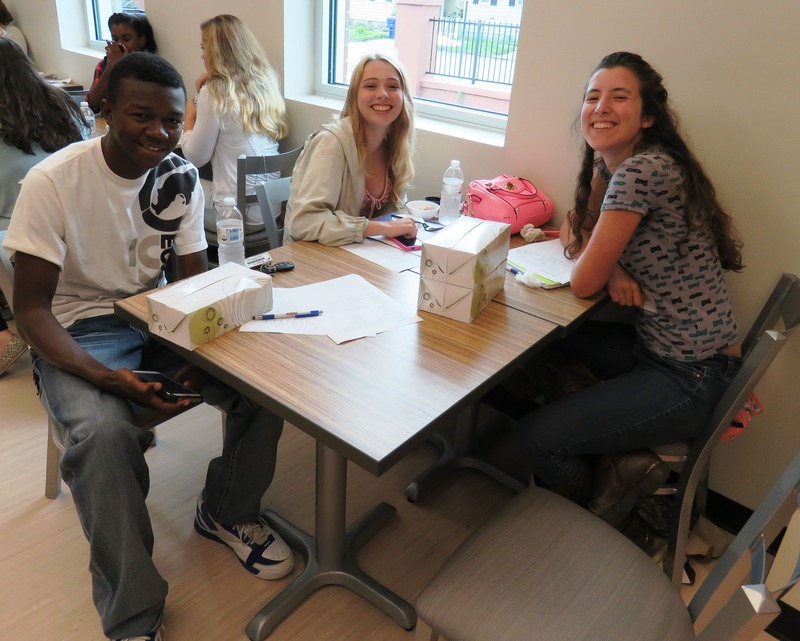 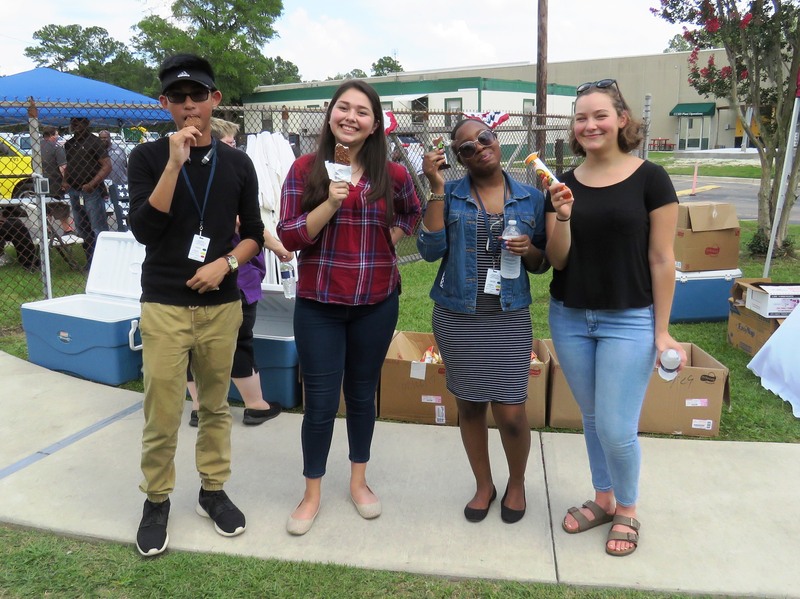 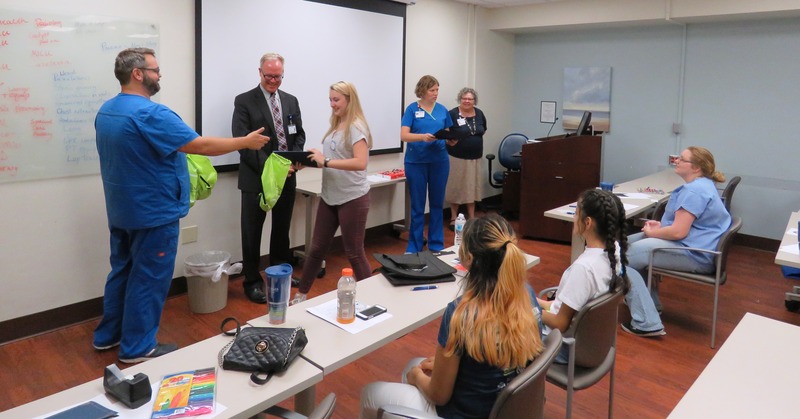 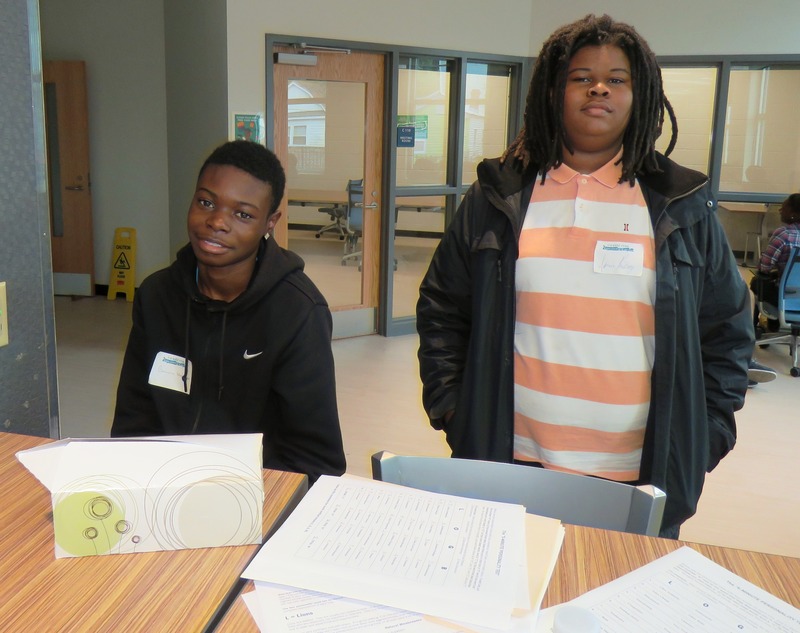 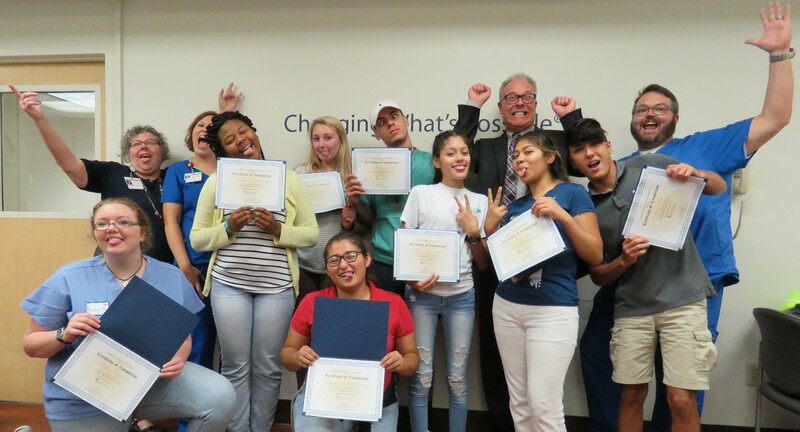 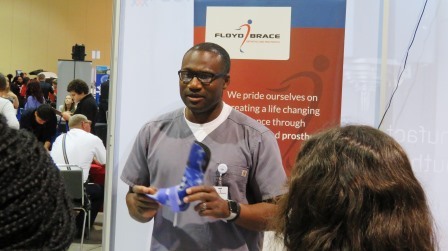 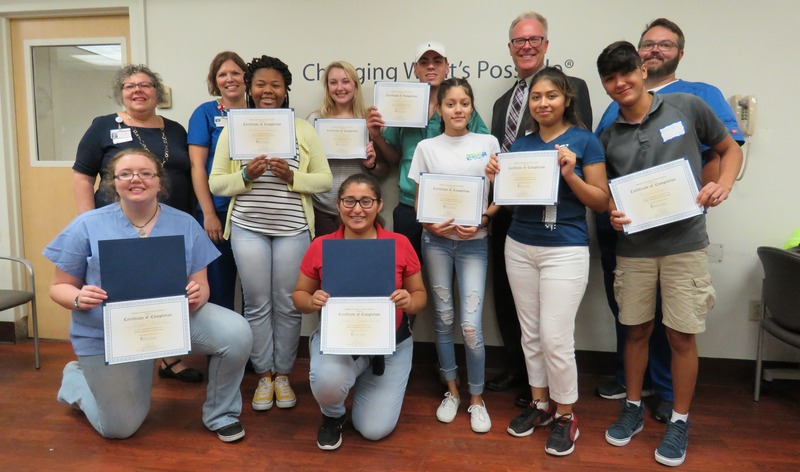 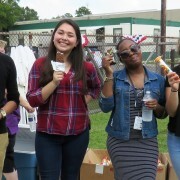 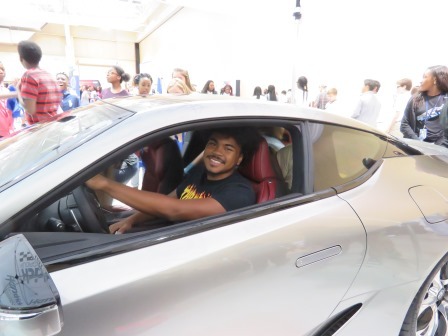 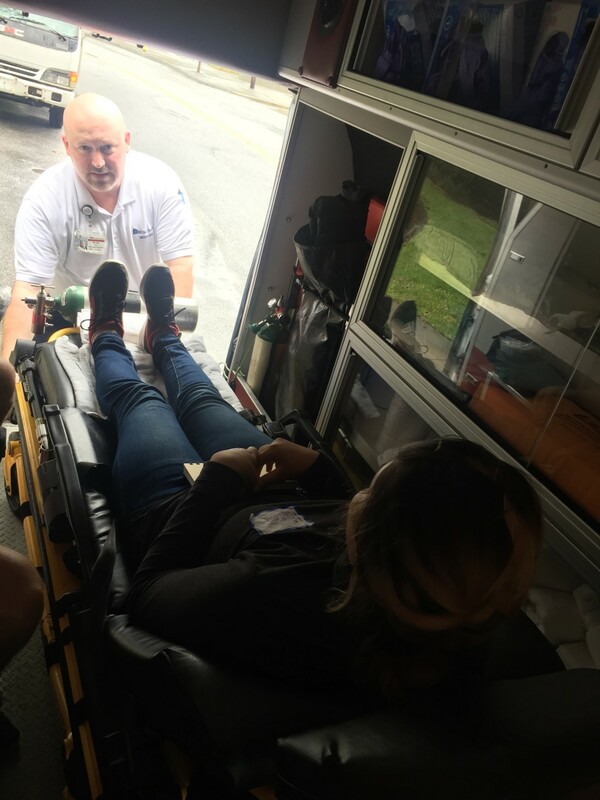 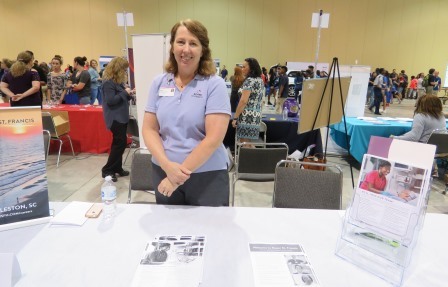 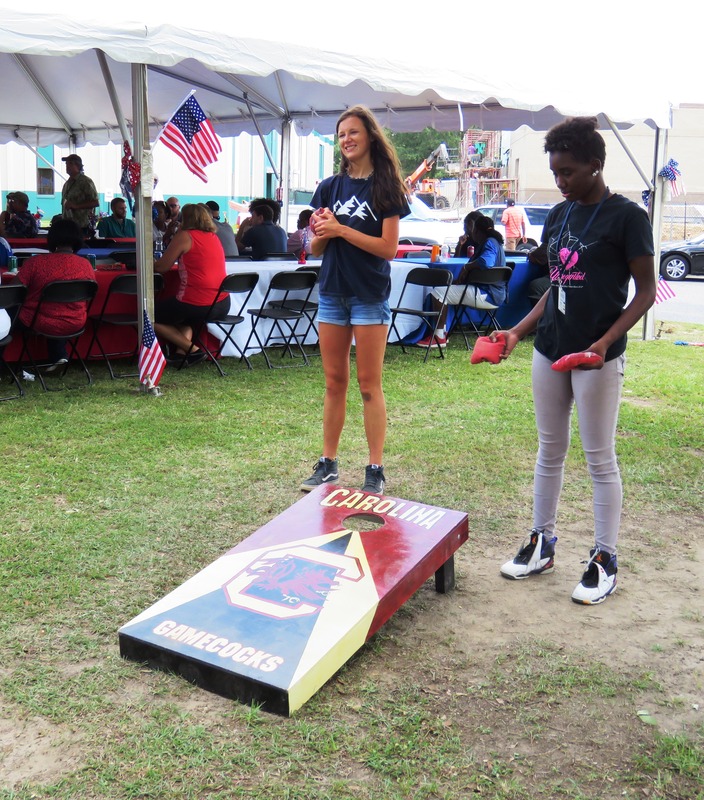 For the 4th summer in a row, local health care professionals from the MUSC School of Nursing hosted rising seniors on track to be CTE Completers in Health Science from schools throughout Charleston County School District for an interactive career camp. 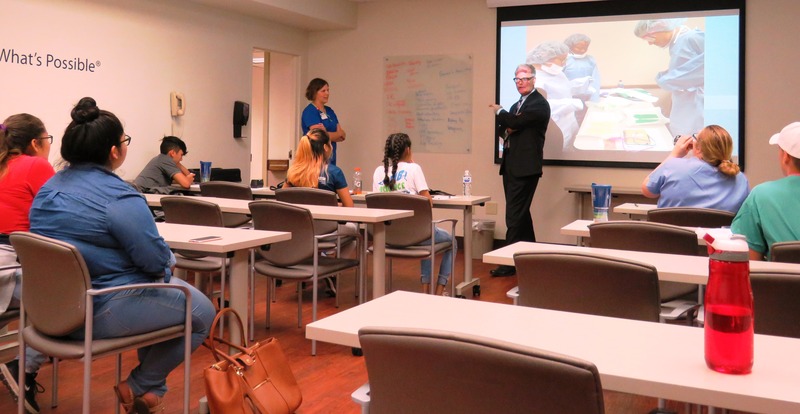 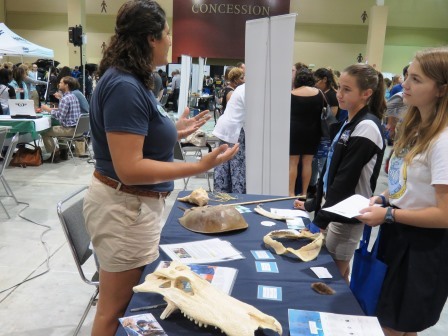 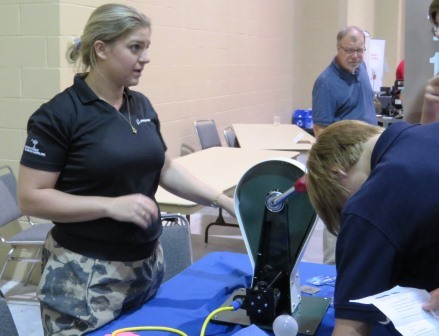 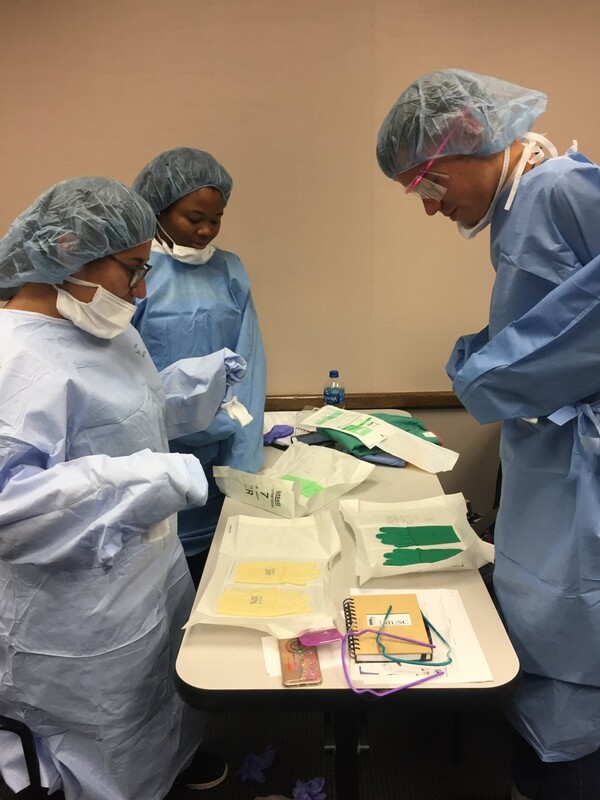 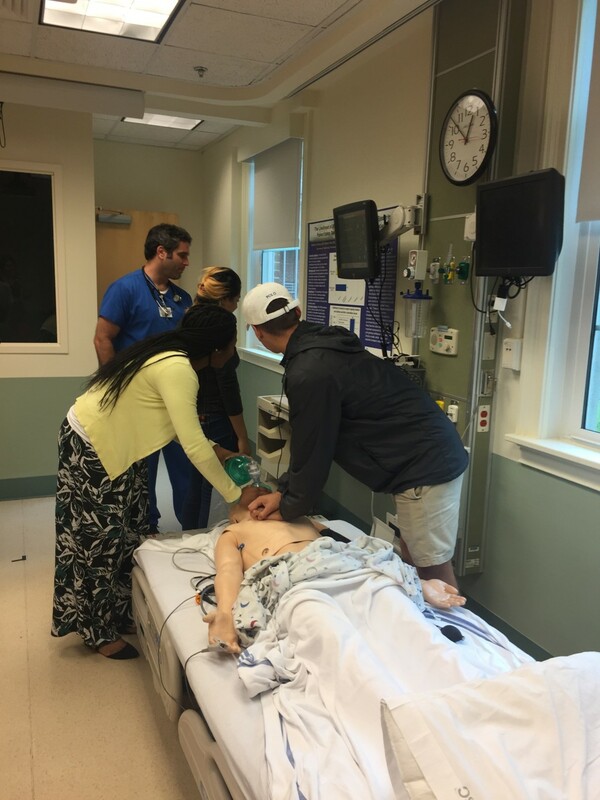 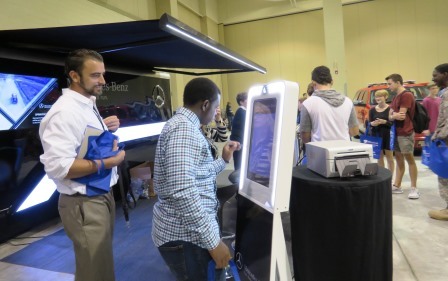 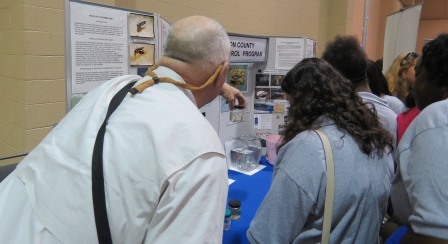 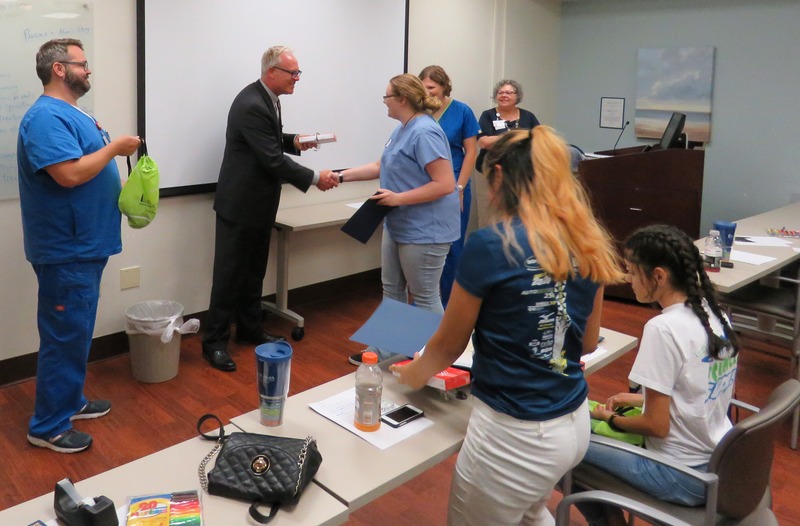 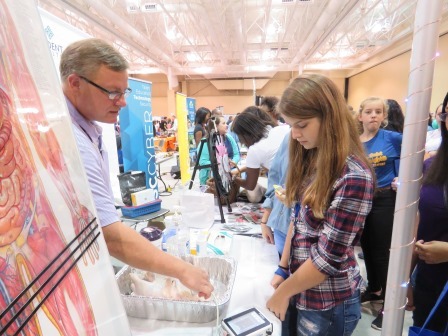 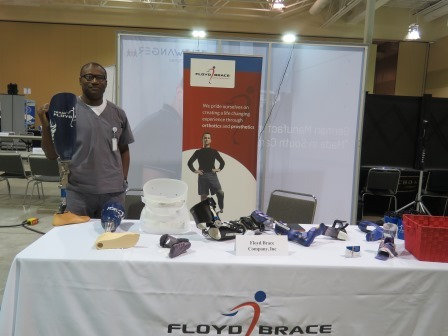 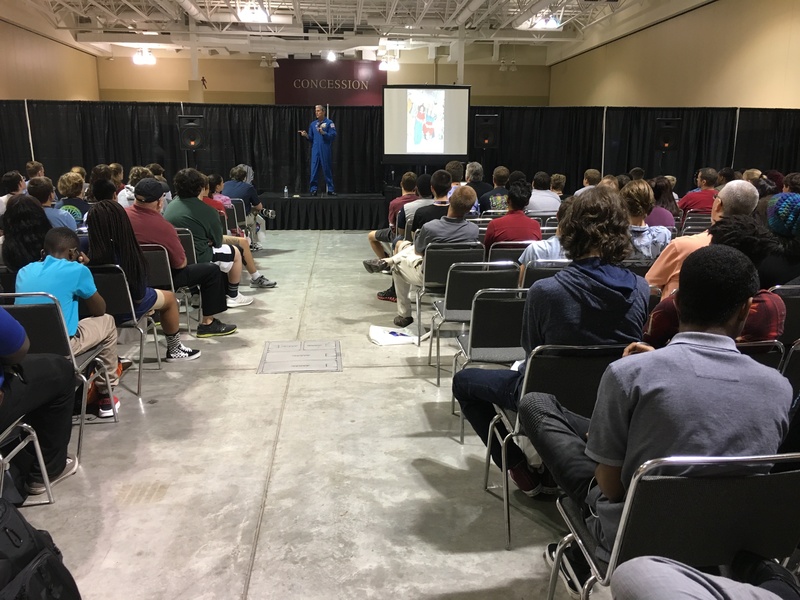 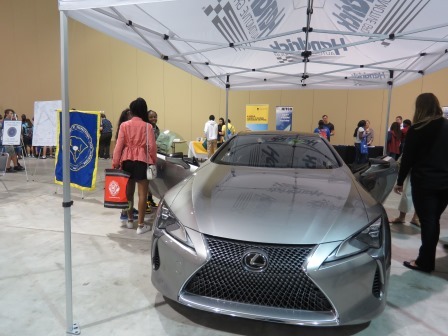 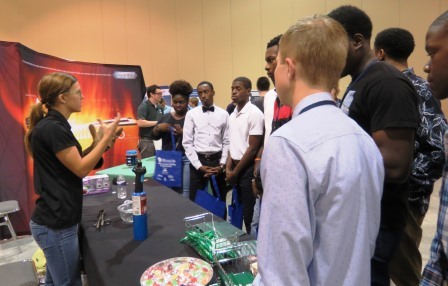 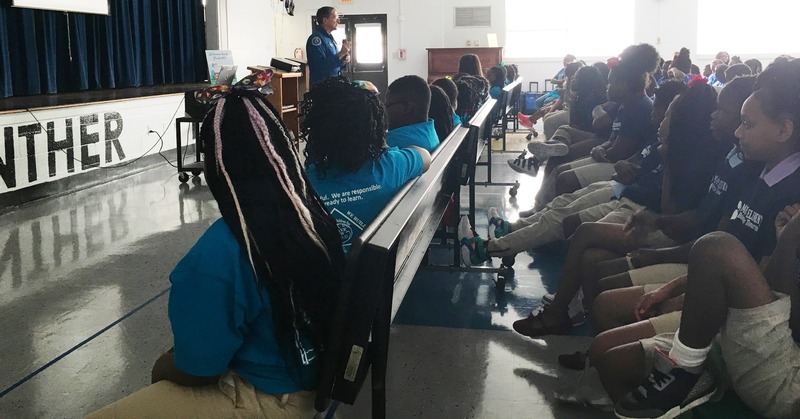 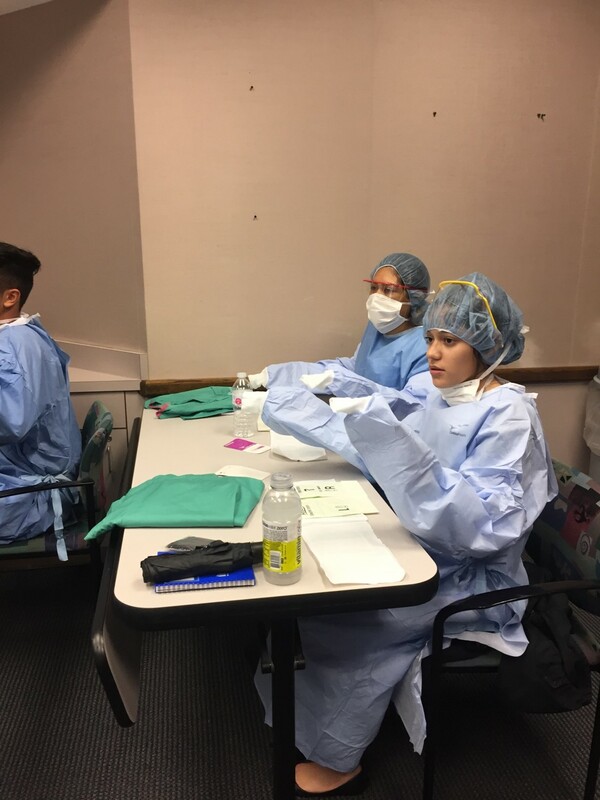 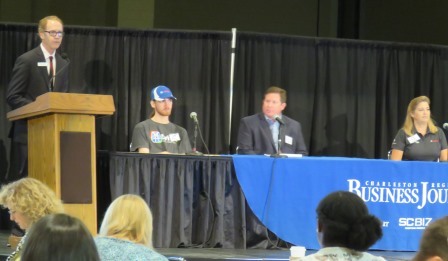 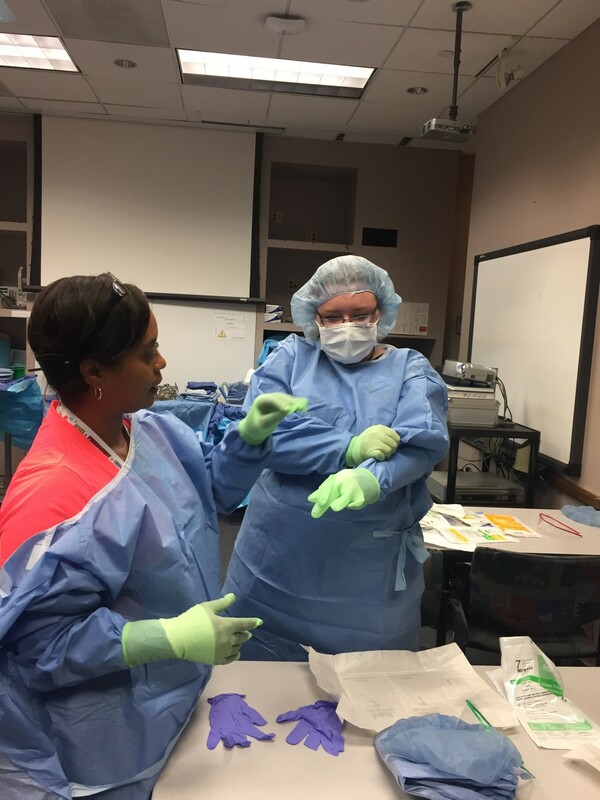 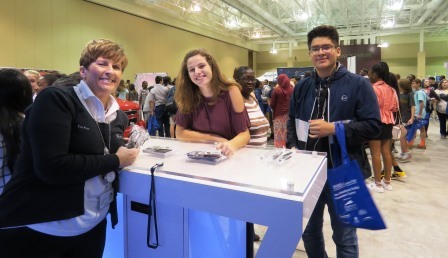 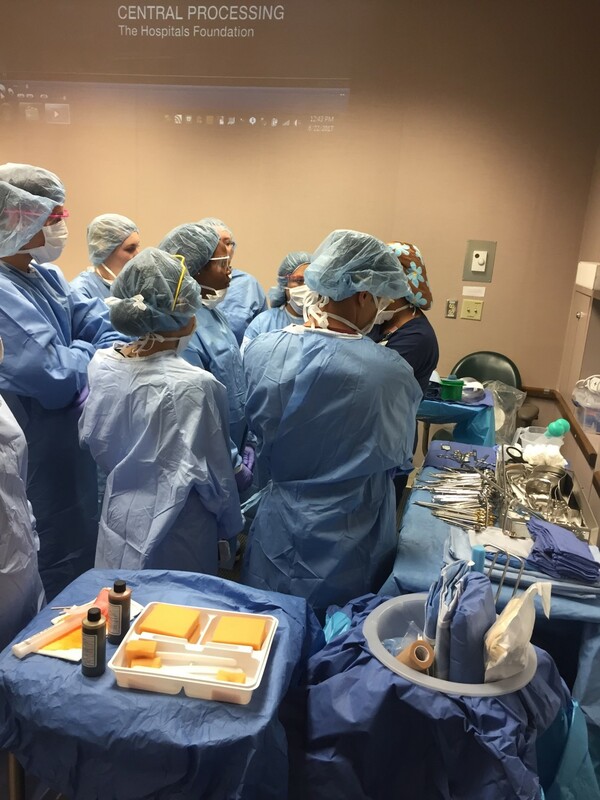 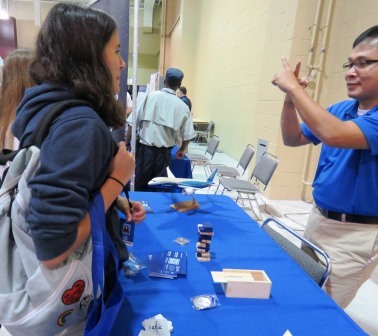 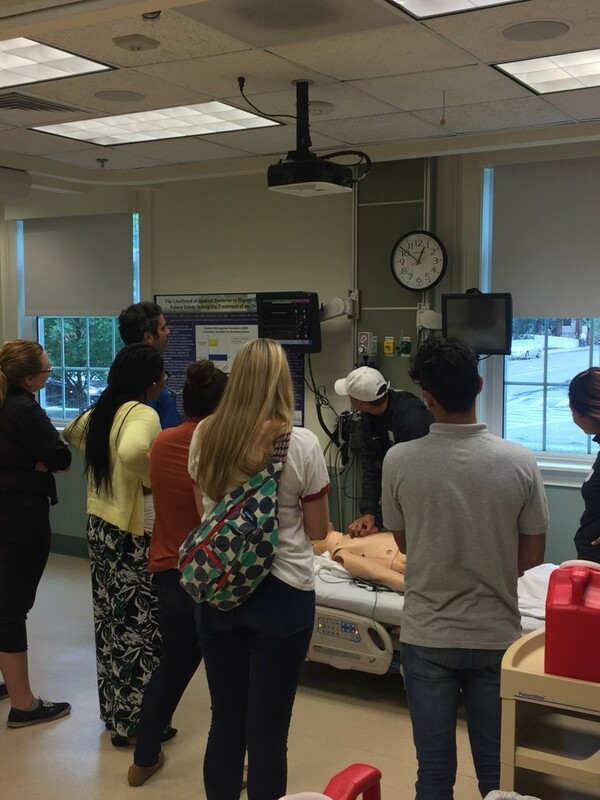 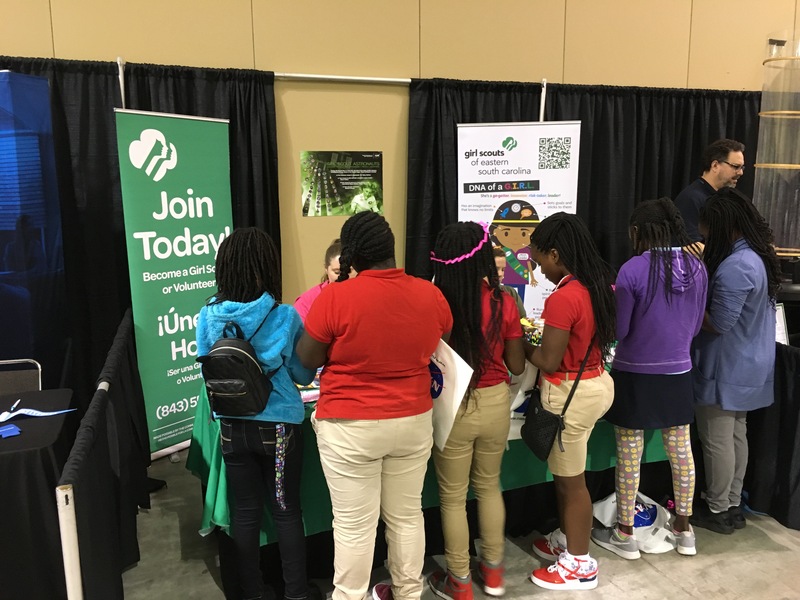 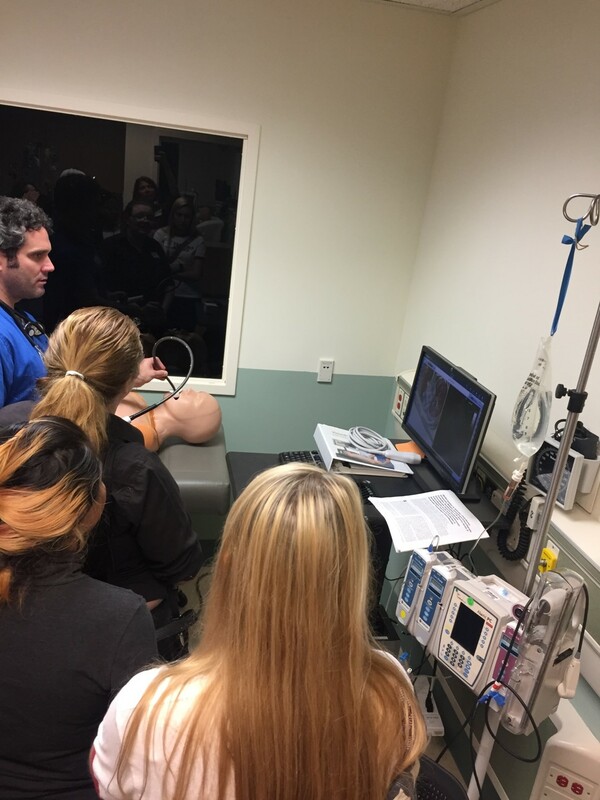 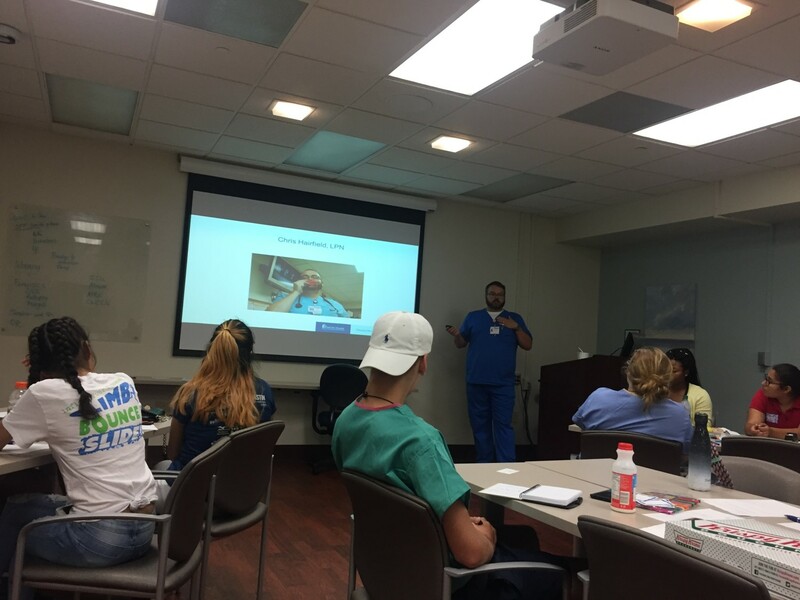 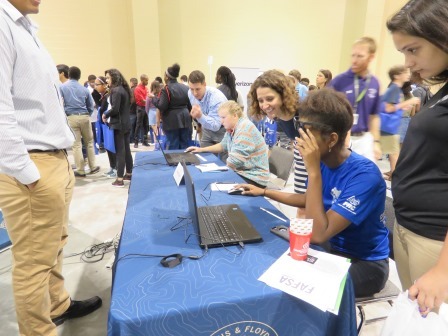 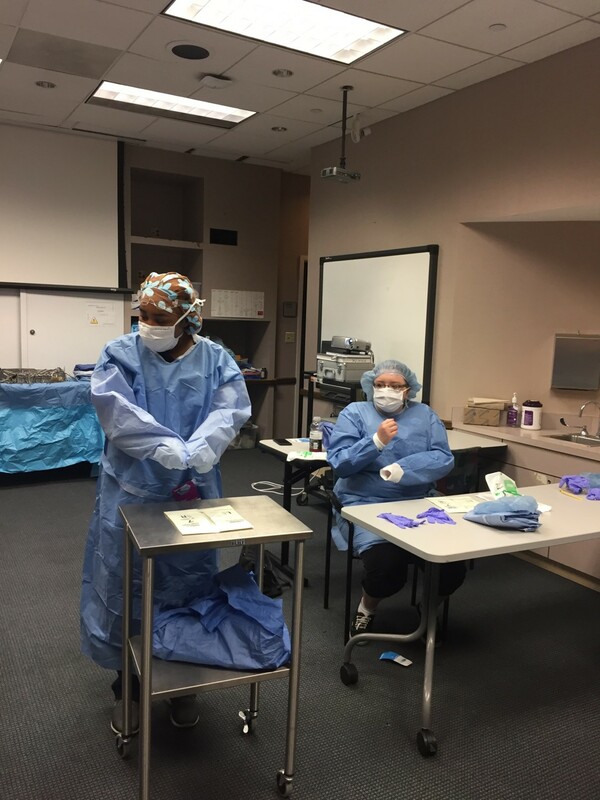 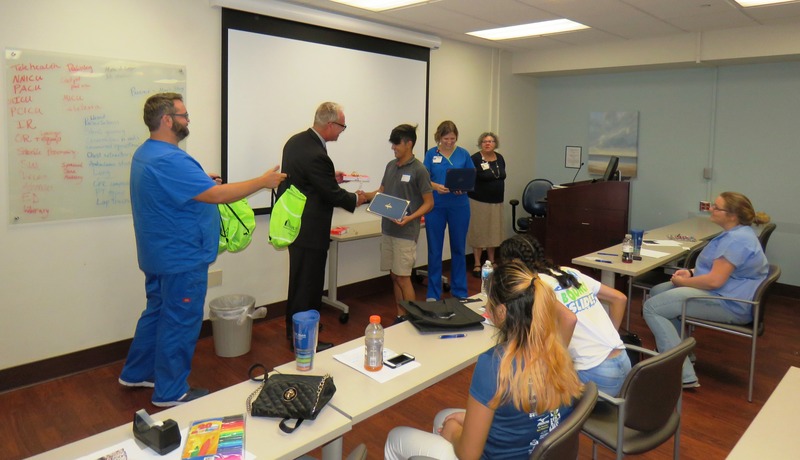 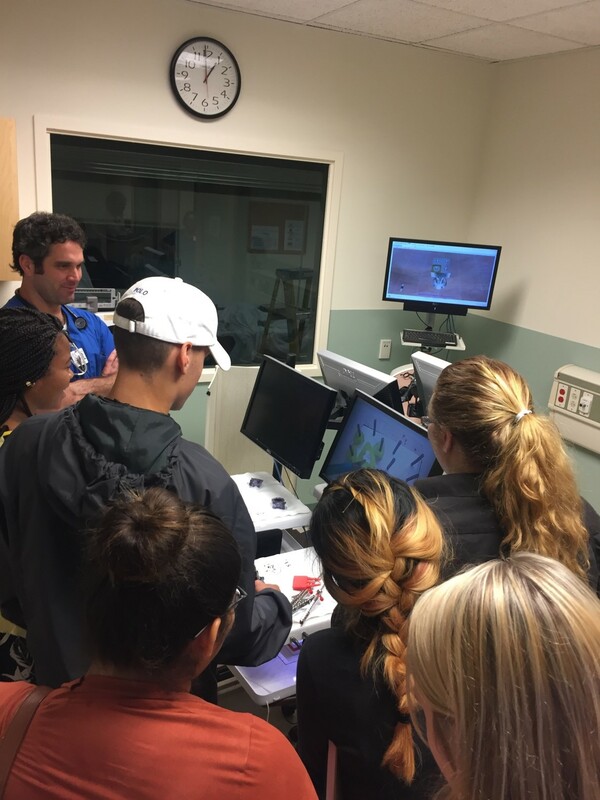 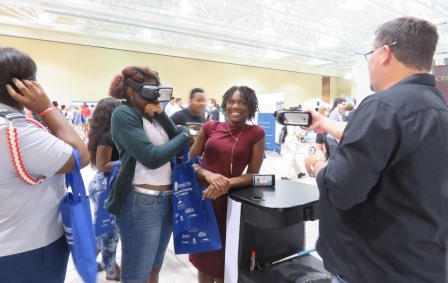 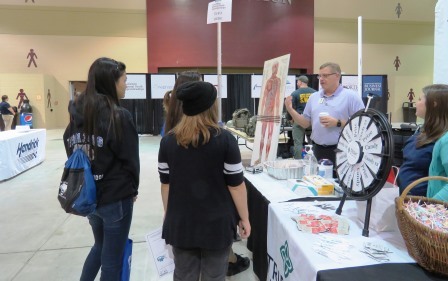 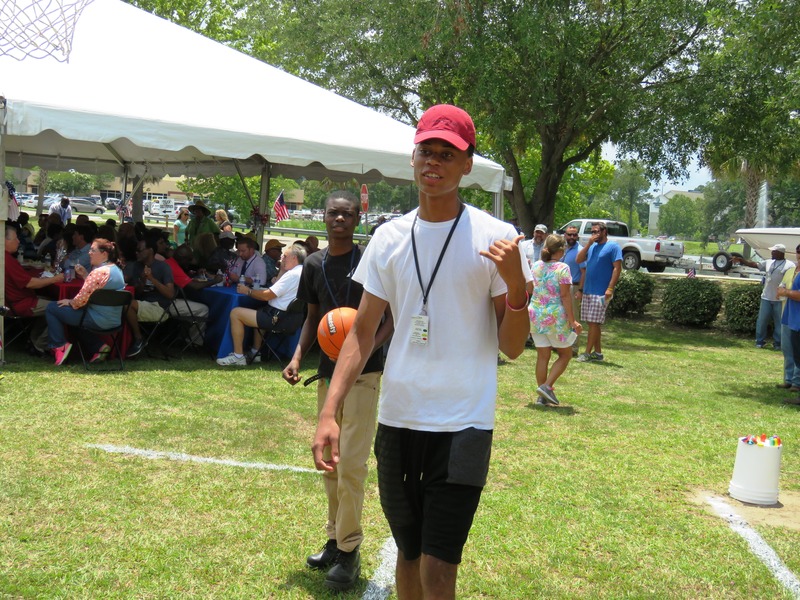 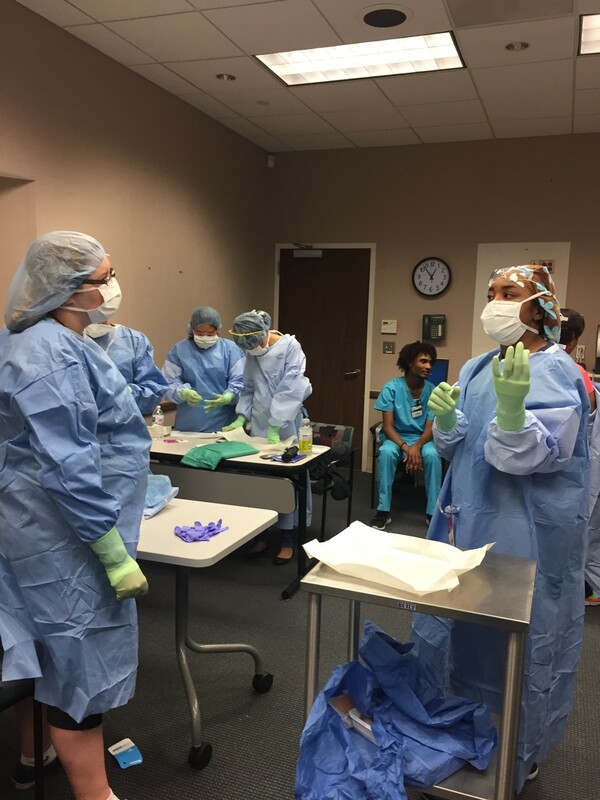 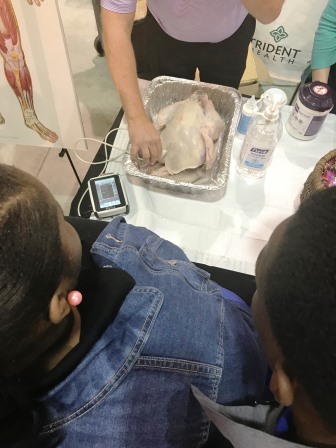 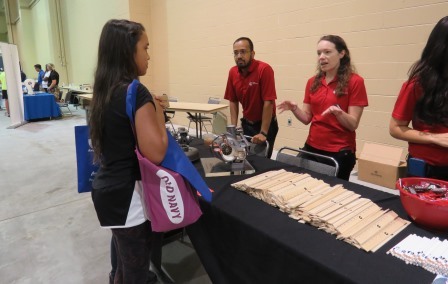 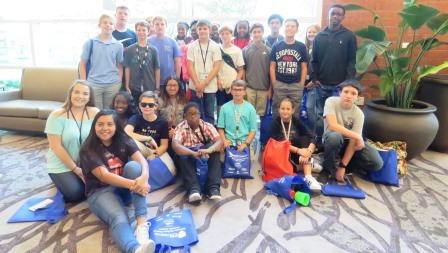 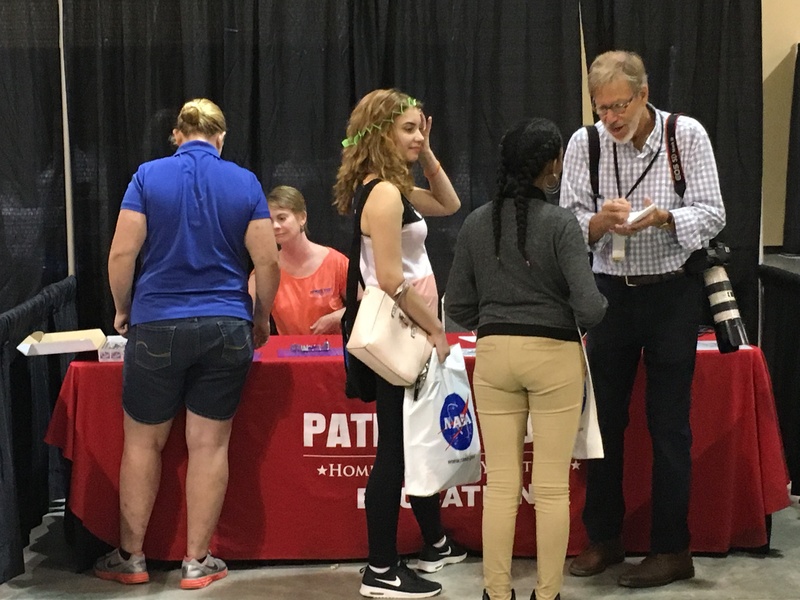 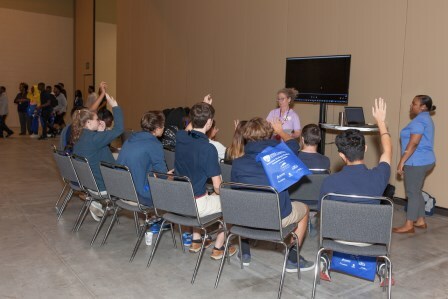 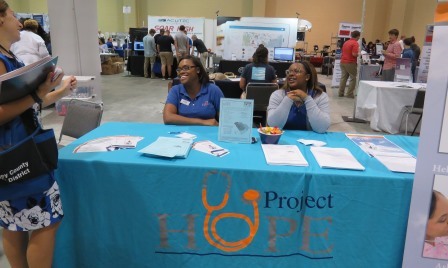 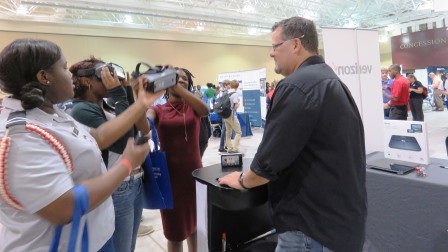 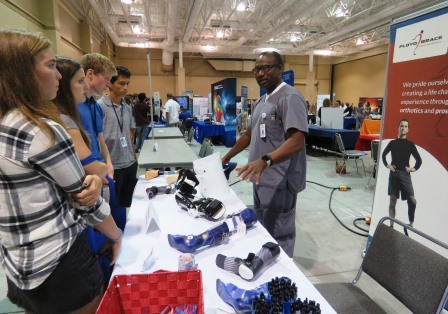 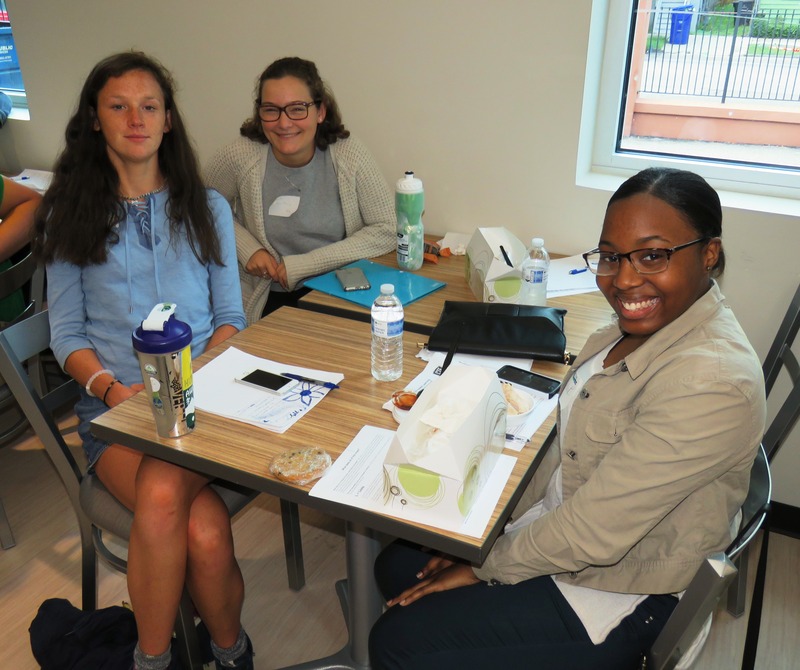 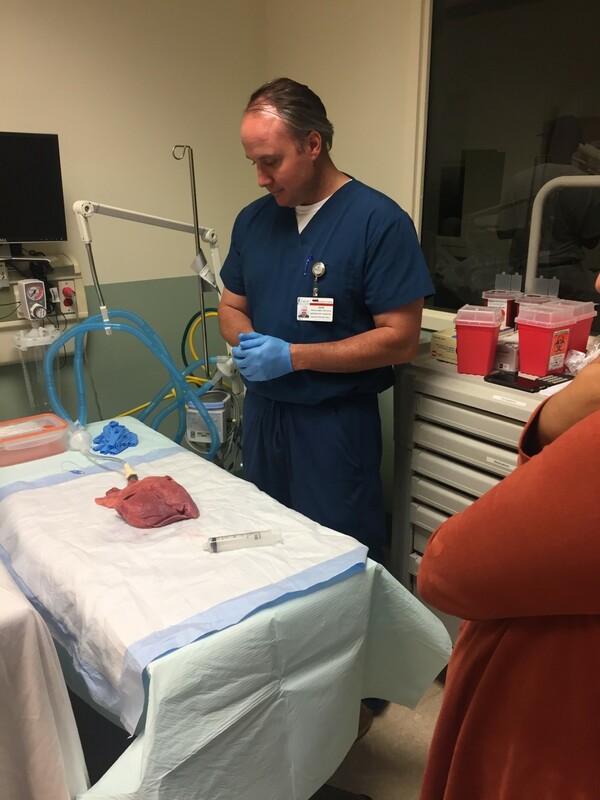 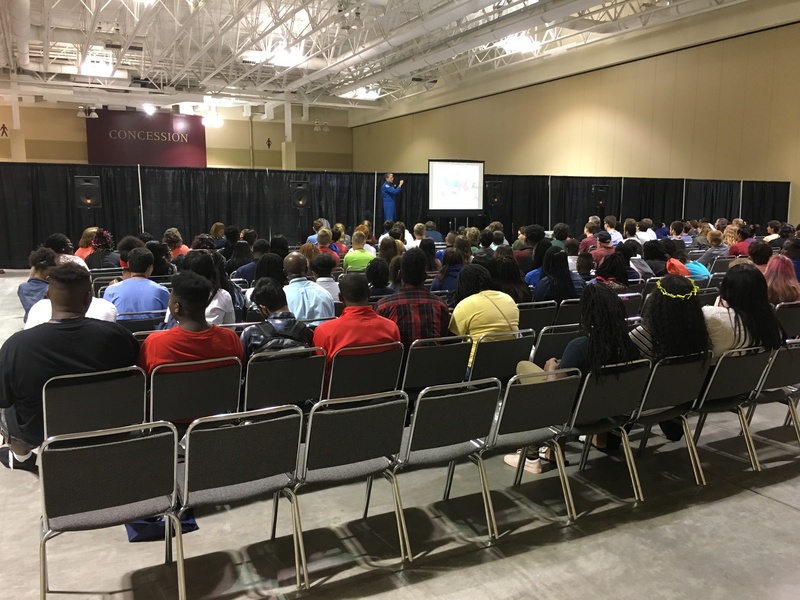 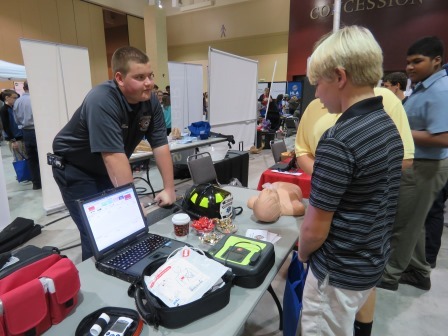 The 3 day MUSC Summer Healthcare Camp provided an introduction to various health sciences professions through the use of interactive presentations, hands‐on skills lab opportunities, and exposure to the healthcare environment. 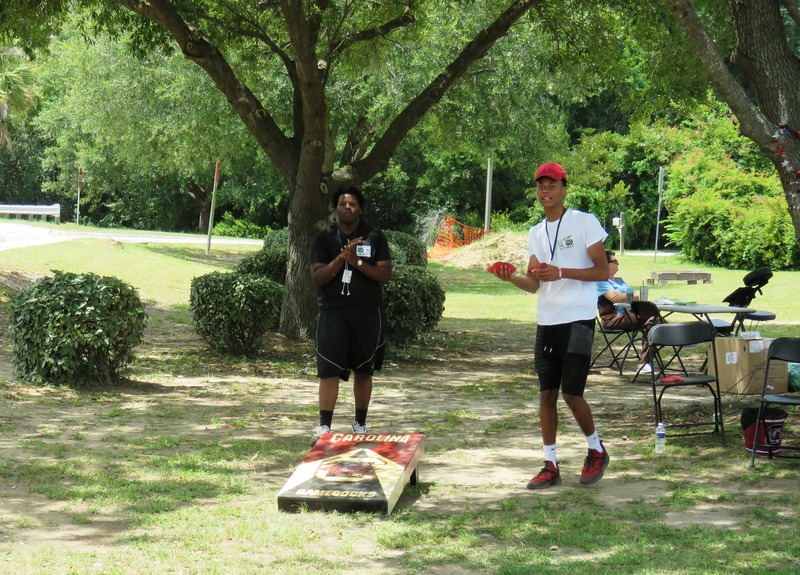 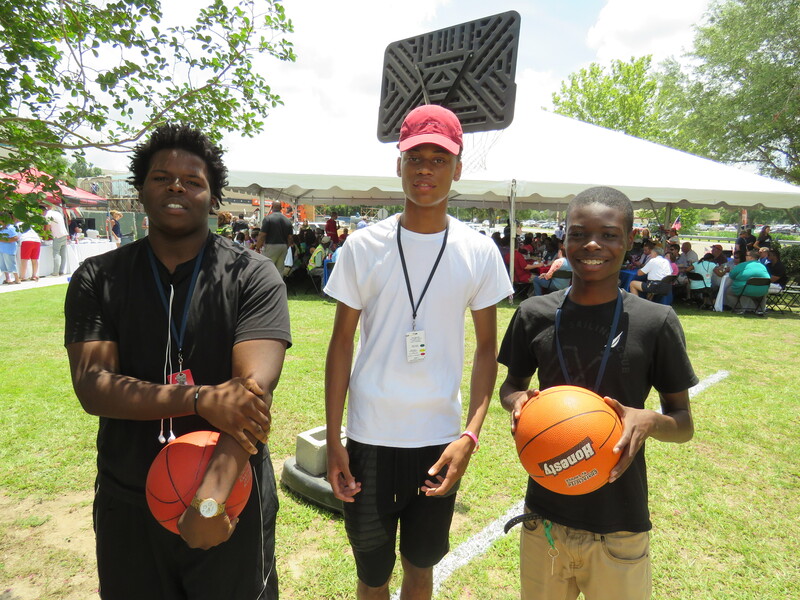 Thanks to everyone that made the camp possible for students again this summer! 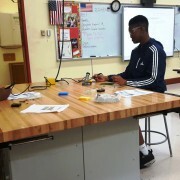 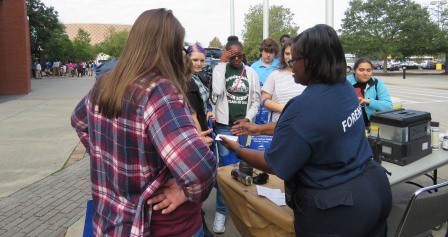 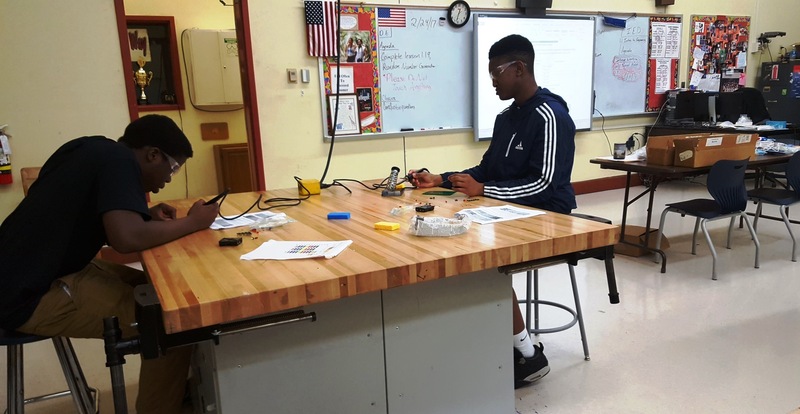 HUGE THANKS to Ms. Aleatra Heyward, and the entire Nucor Steel Berkeley team for supporting Ms. Aisha Jeffrey’s Project Lead the Way (PLTW) pre-engineering students at Garrett Academy of Technology by providing a class set of safety glasses!